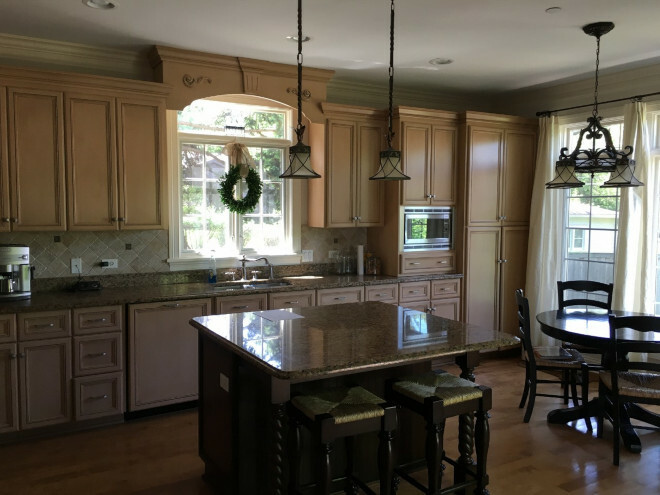 This was a wonderful two-phase project that began when these clients decided they wanted to remodel their kitchen. 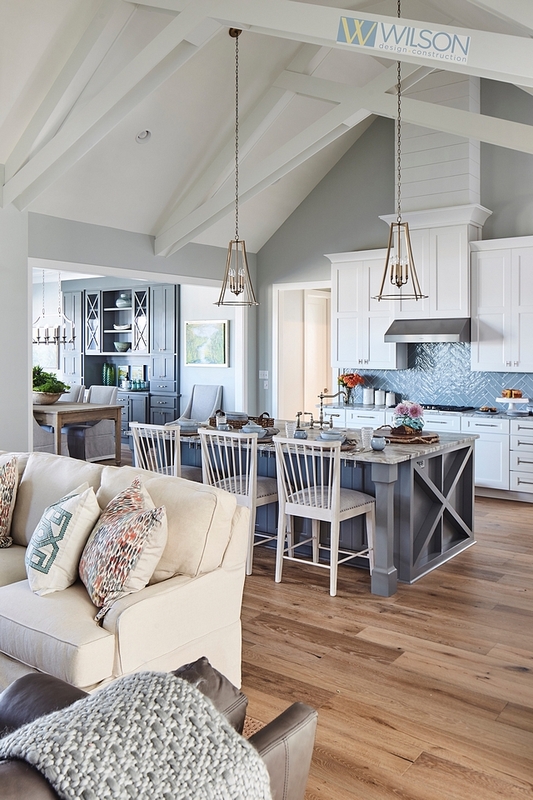 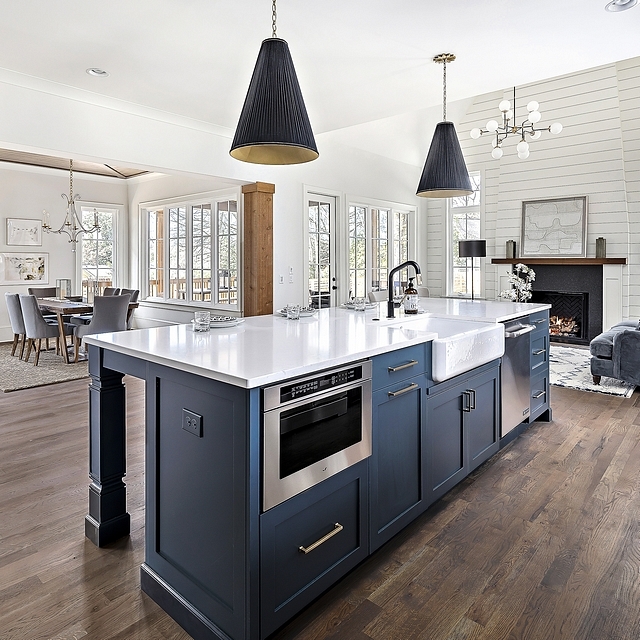 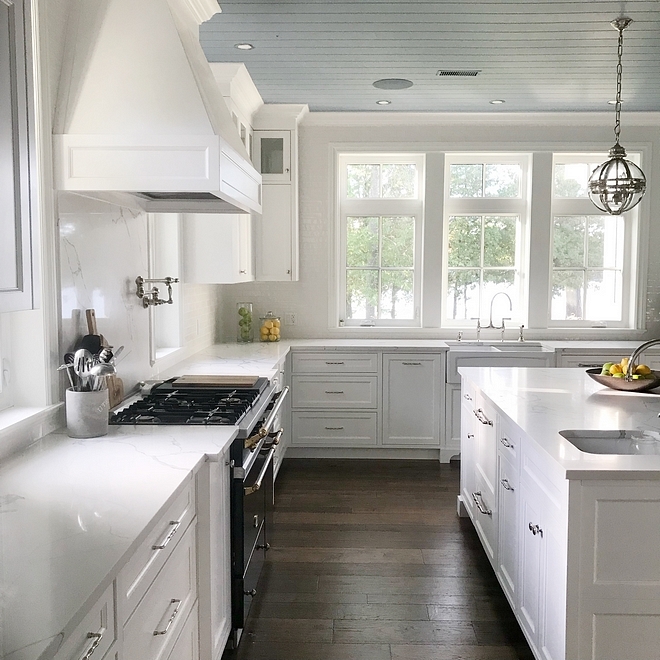 This east-coast family had been living with builder-grade finishes that were dark and “Tuscan-Inspired” and were ready to have an updated kitchen that reflected their New Hampshire roots. 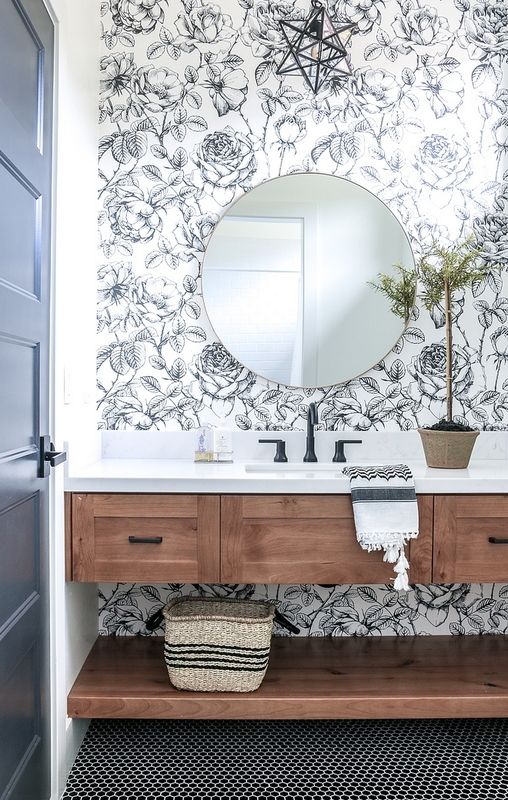 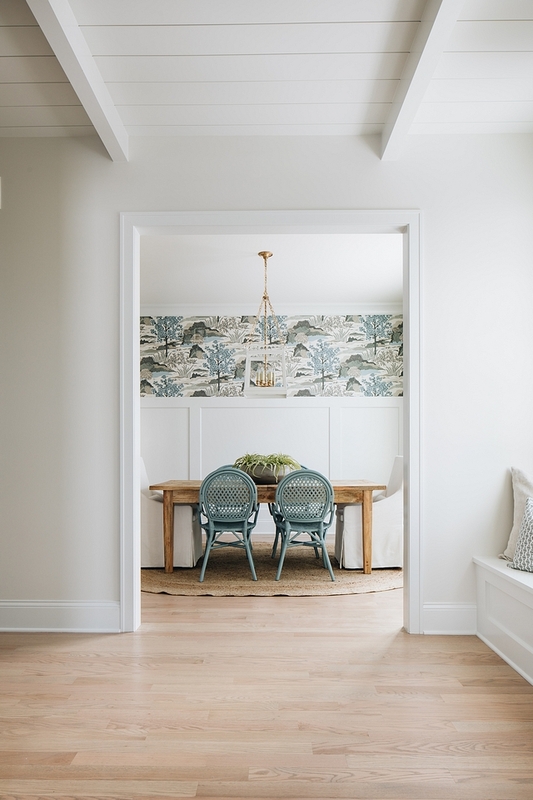 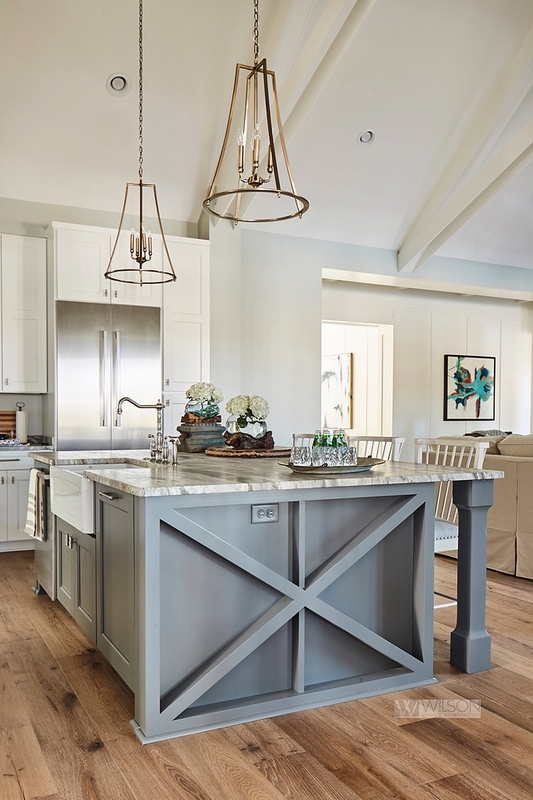 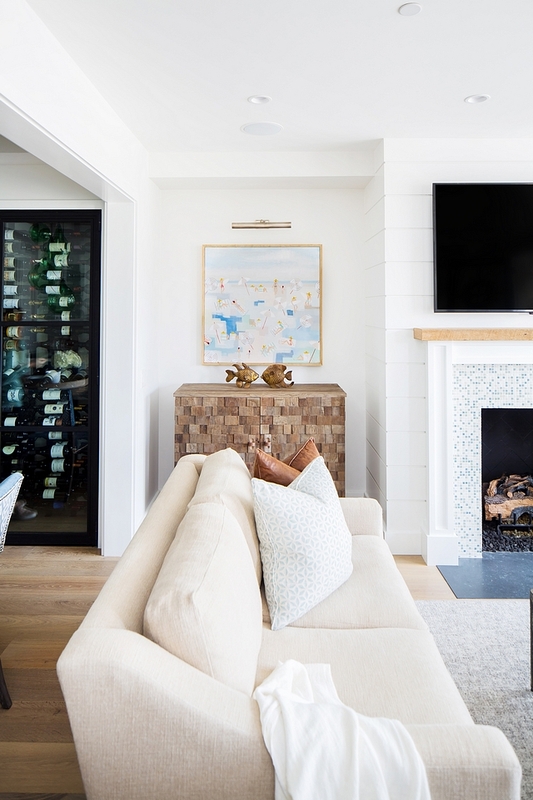 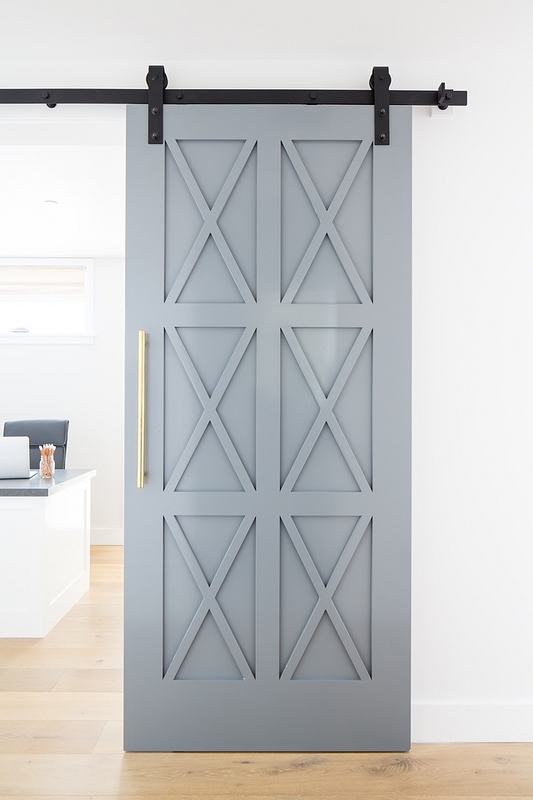 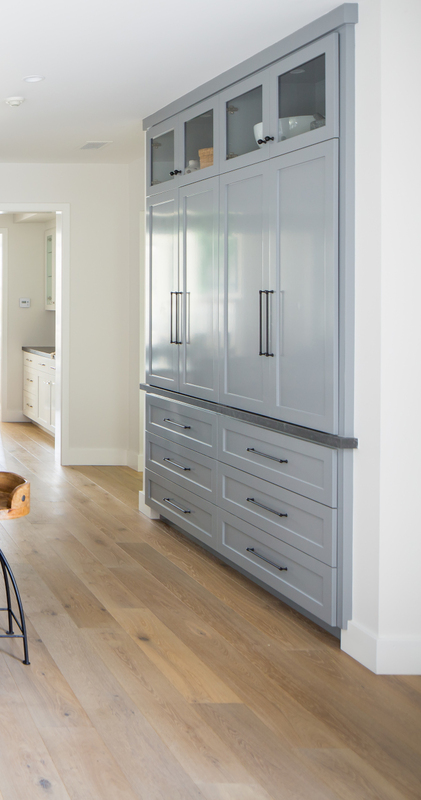 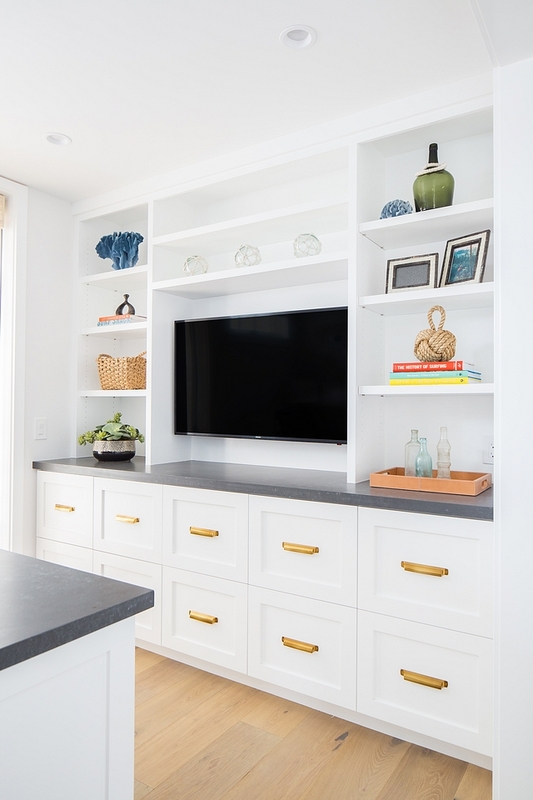 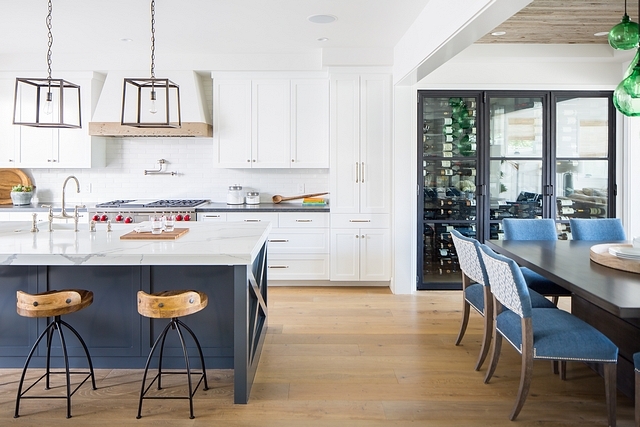 Amy Tausk of Swoon Interiors and Stephanie Frees of Plain & Posh (previously featured here) worked together to design all new custom cabinetry that is more functional and beautiful. 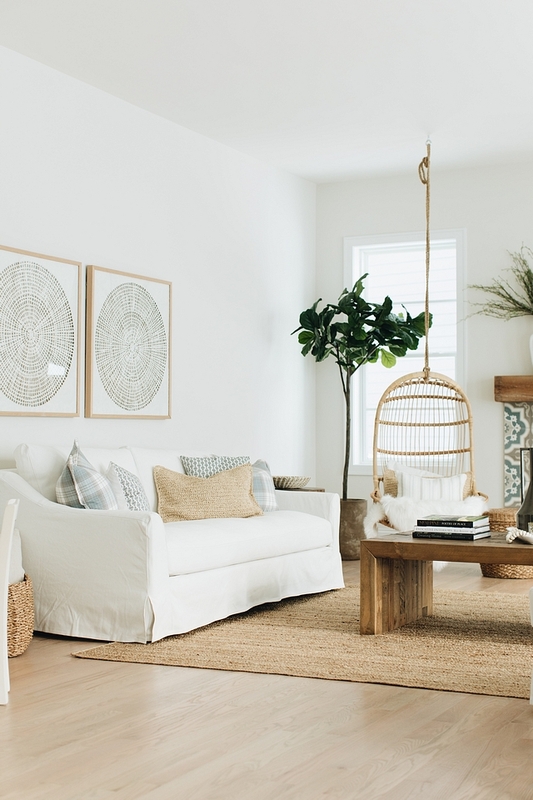 Take notes on all details shared by the designers. 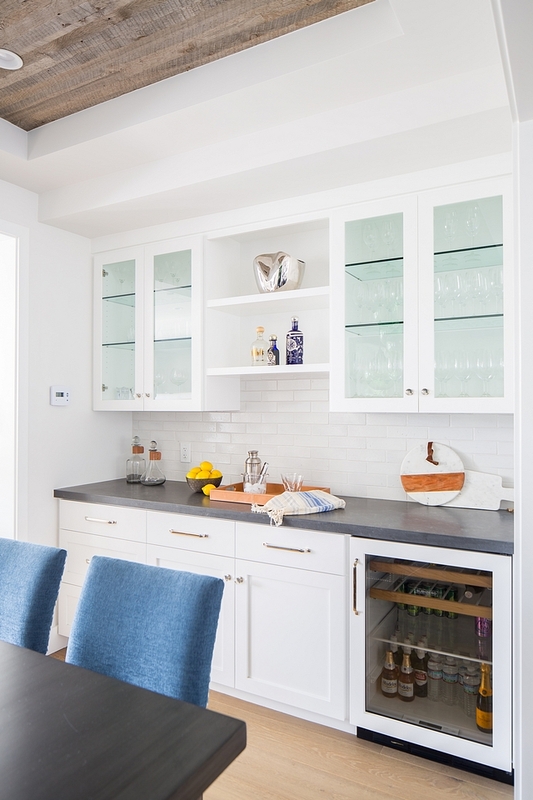 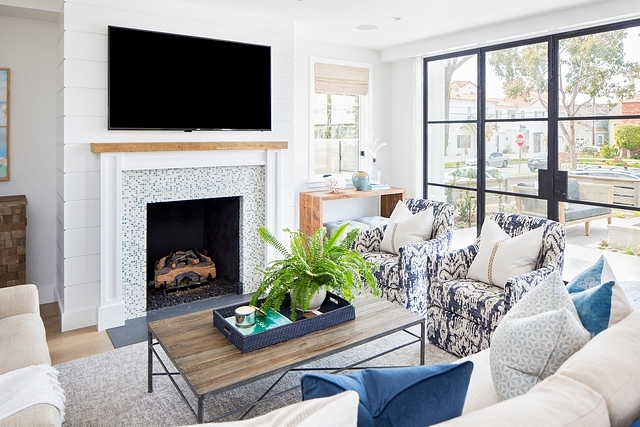 I am sure this home renovation will give you many ideas for your own renovations this year! 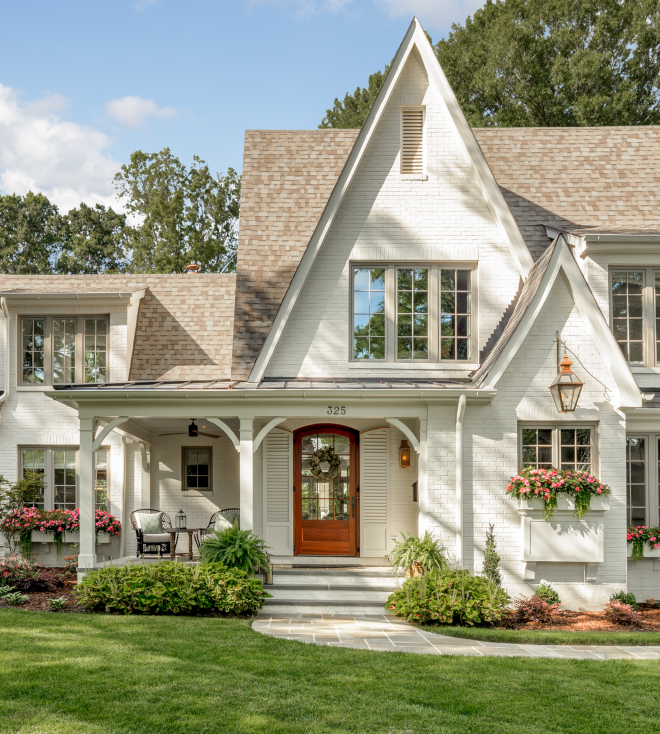 Photography by Picture Perfect House. 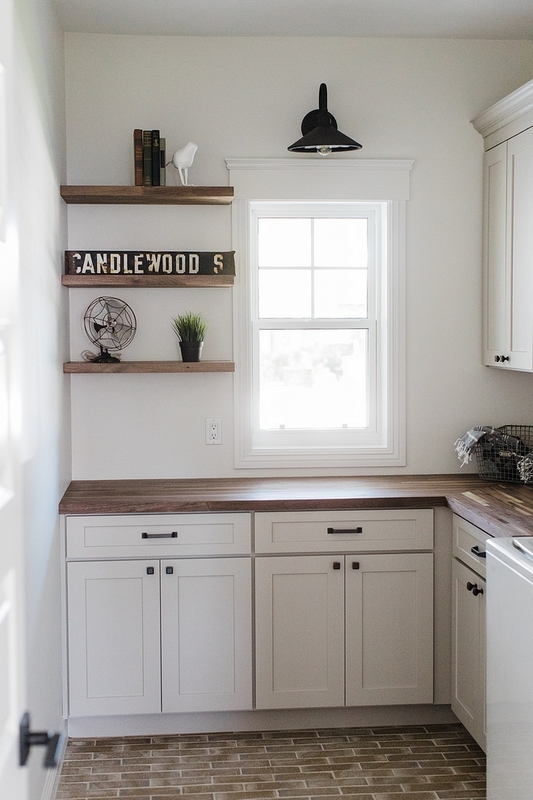 The kitchen felt dark and outdated before Amy and Stephanie worked their “magic” in this space! 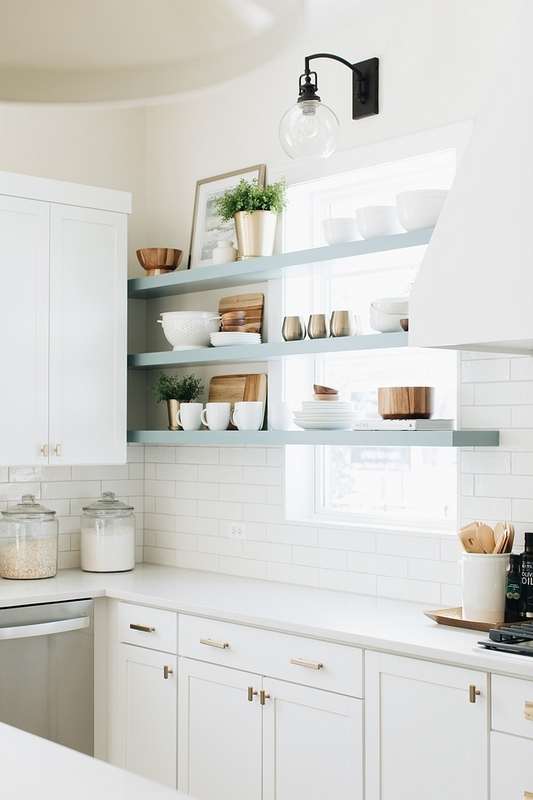 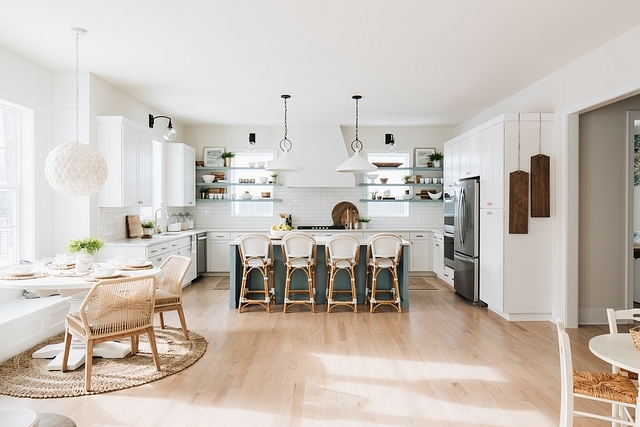 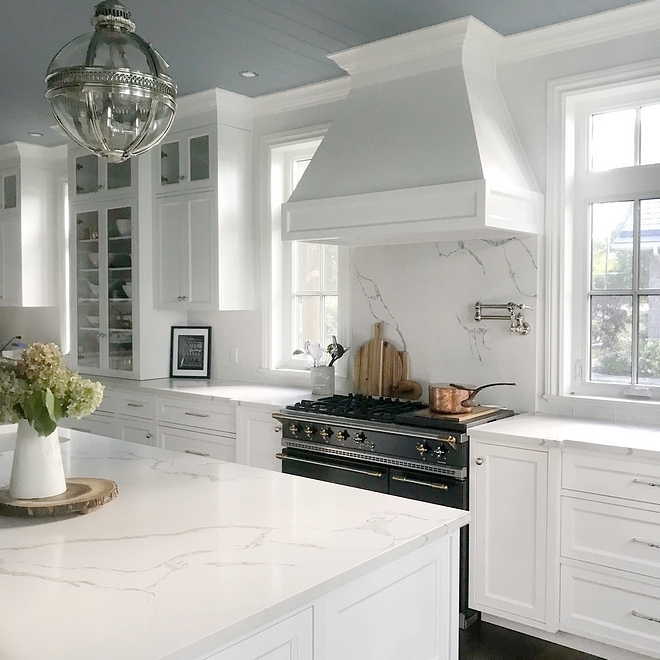 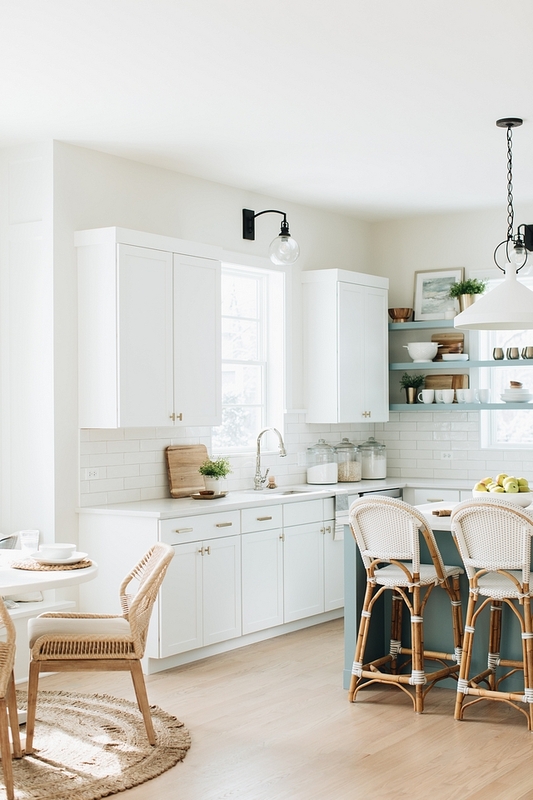 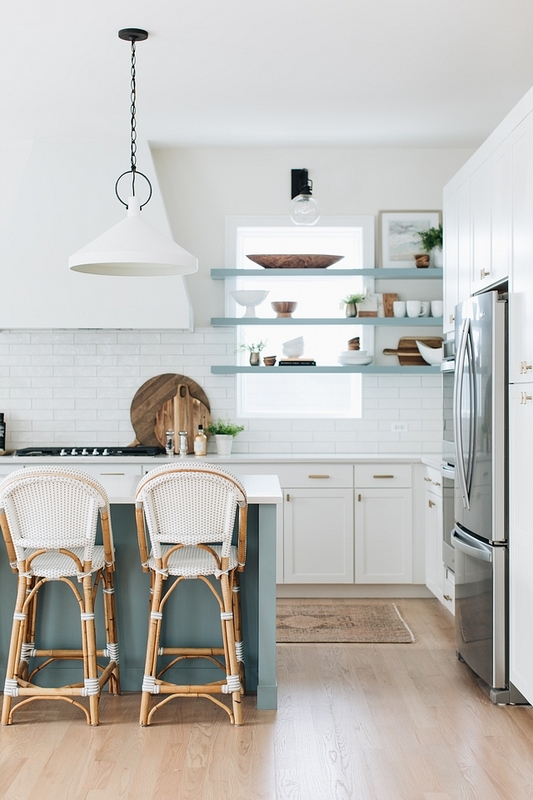 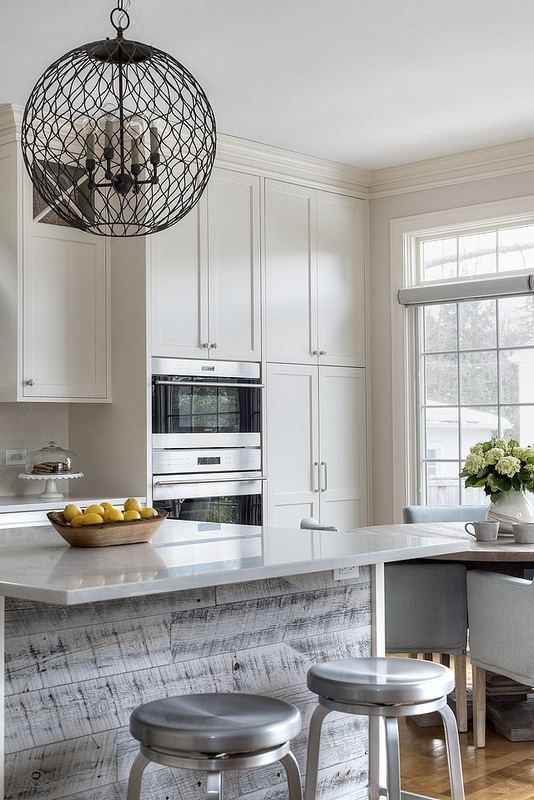 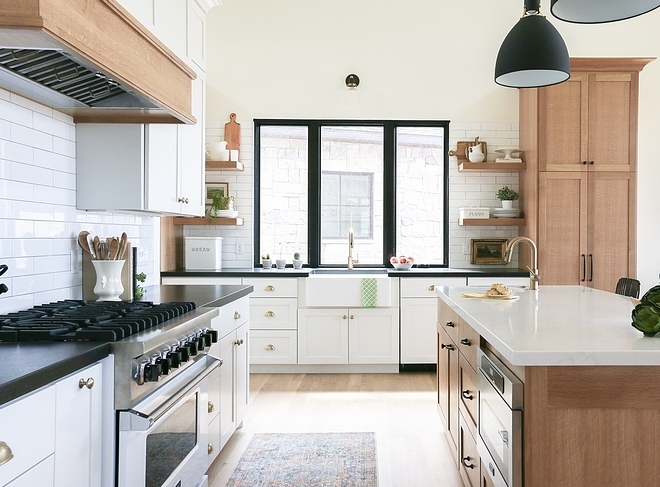 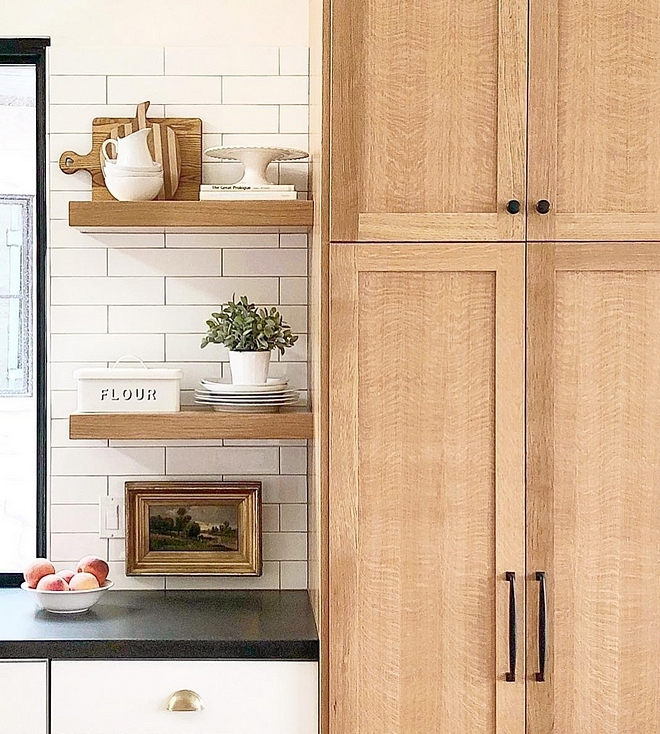 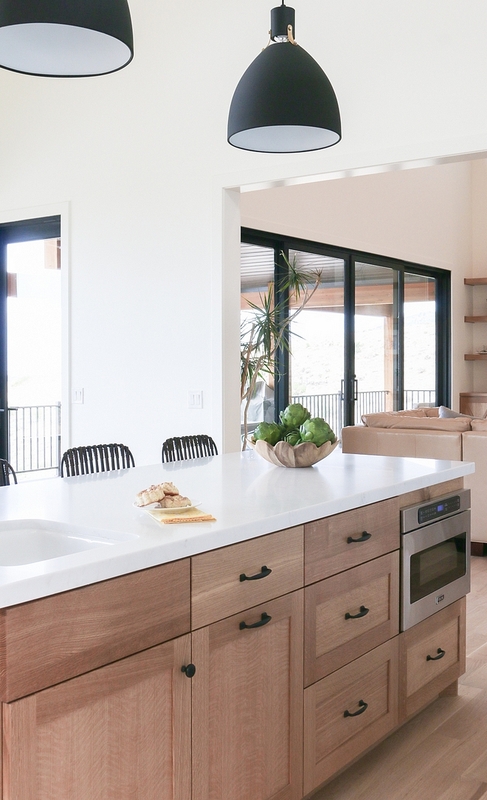 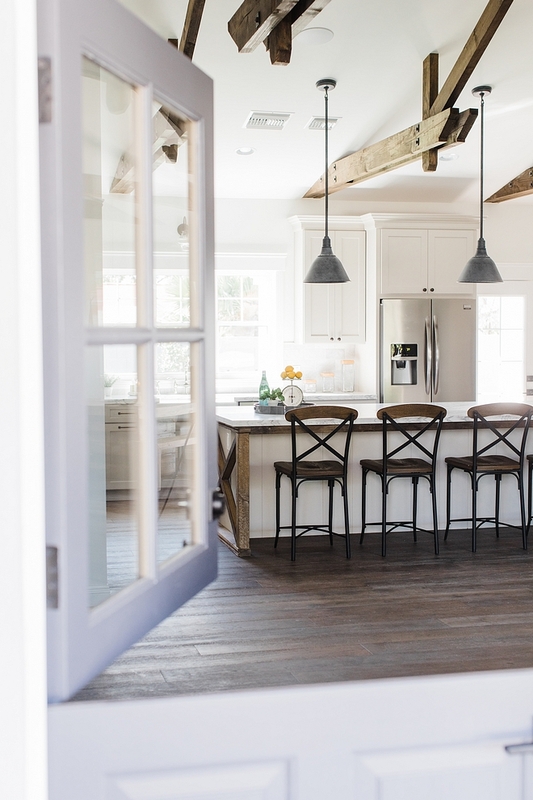 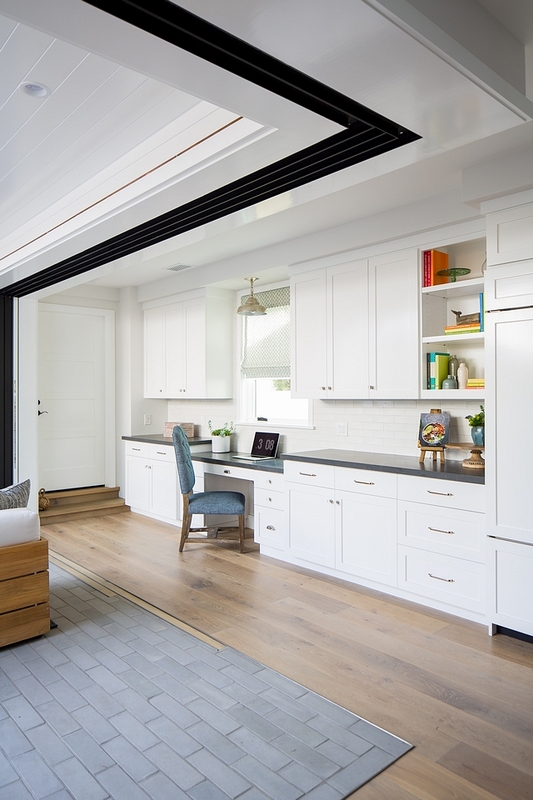 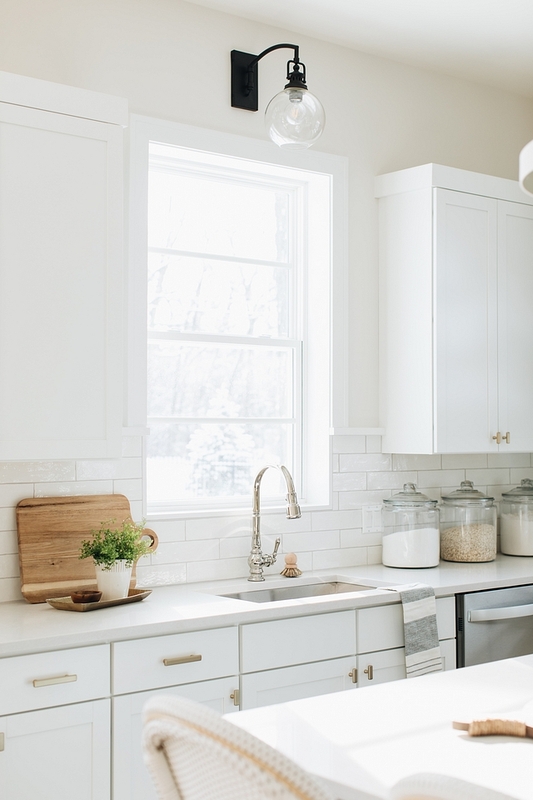 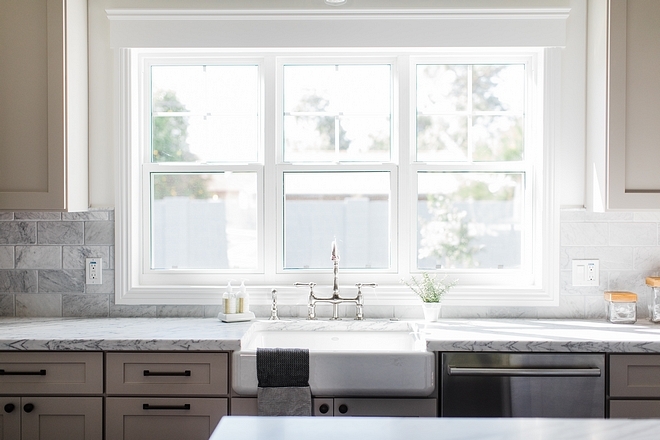 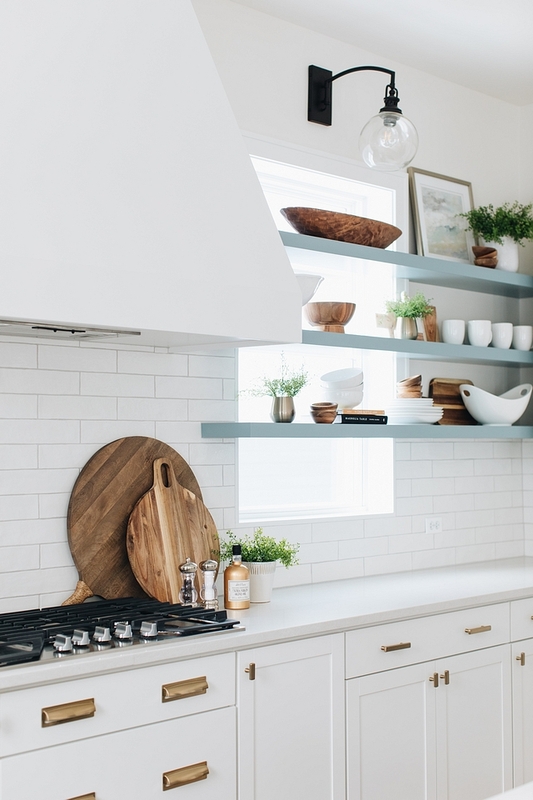 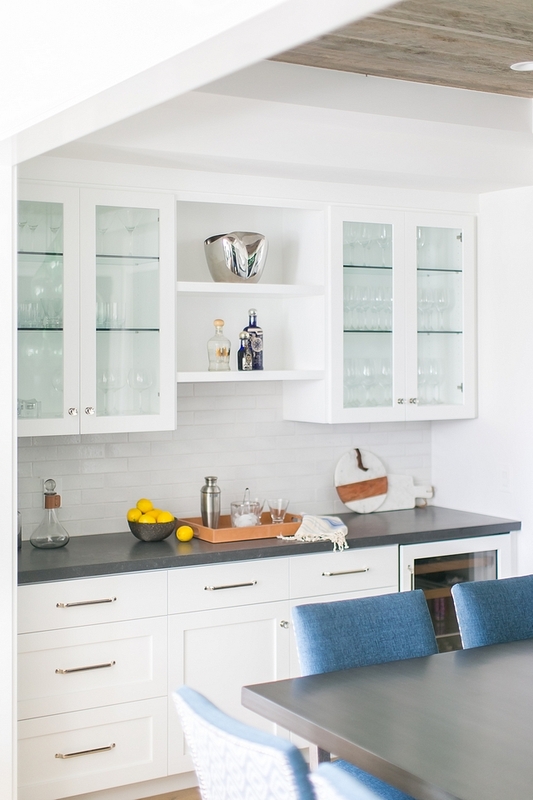 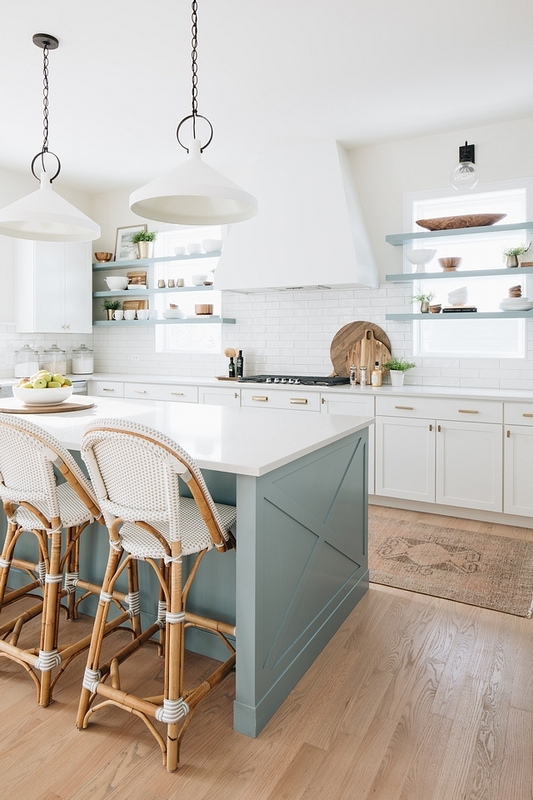 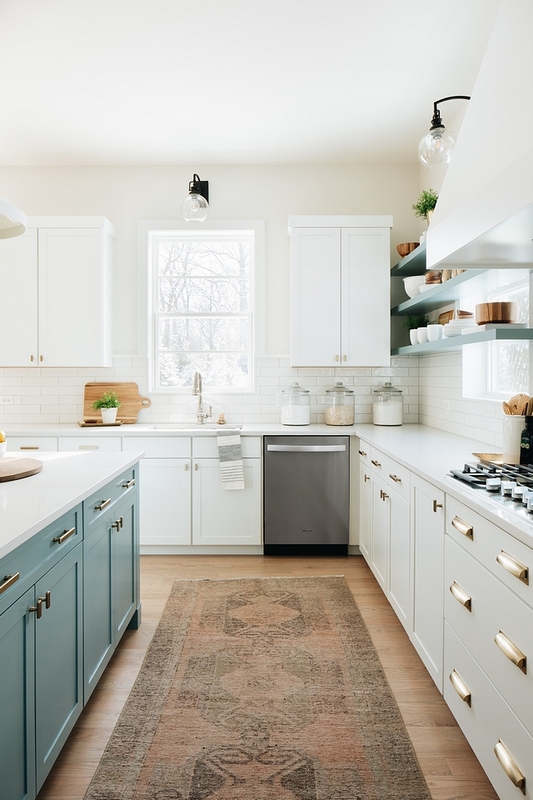 Kitchen Renovation: The designers revamped the kitchen into a clean, white and fresh space – but with a warm and cozy vibe like the rest of their house. 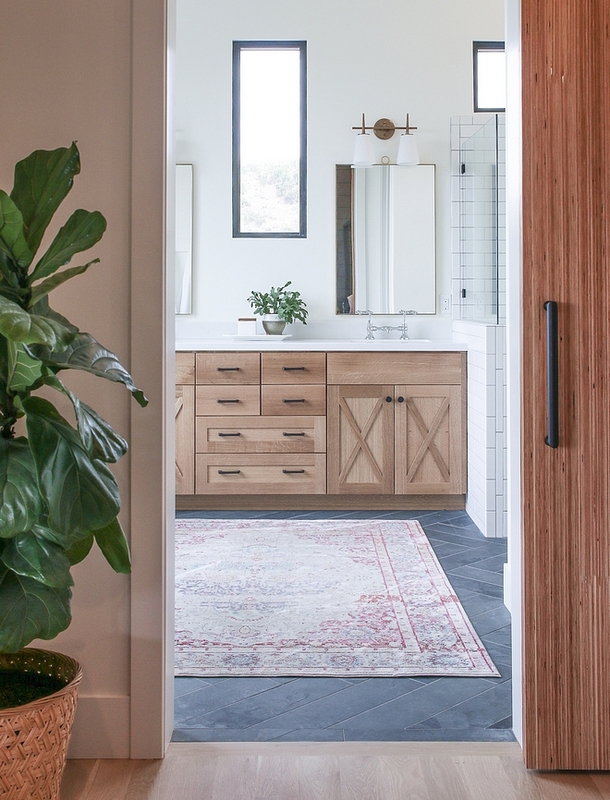 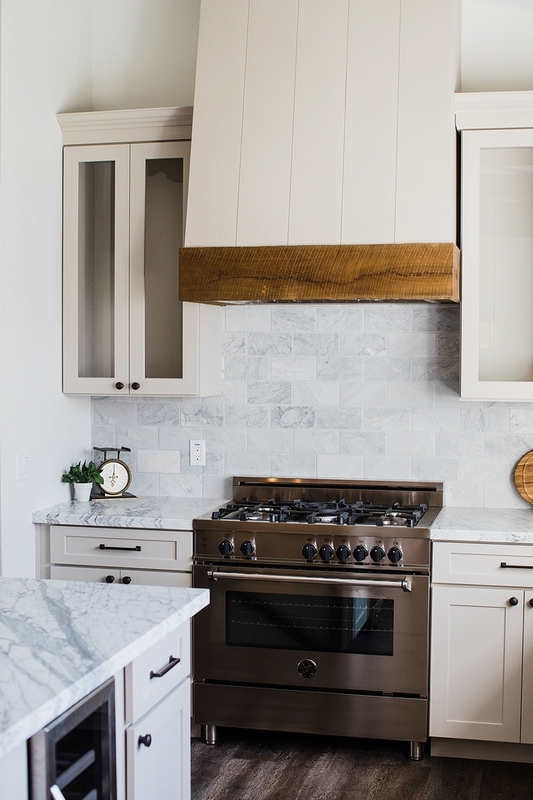 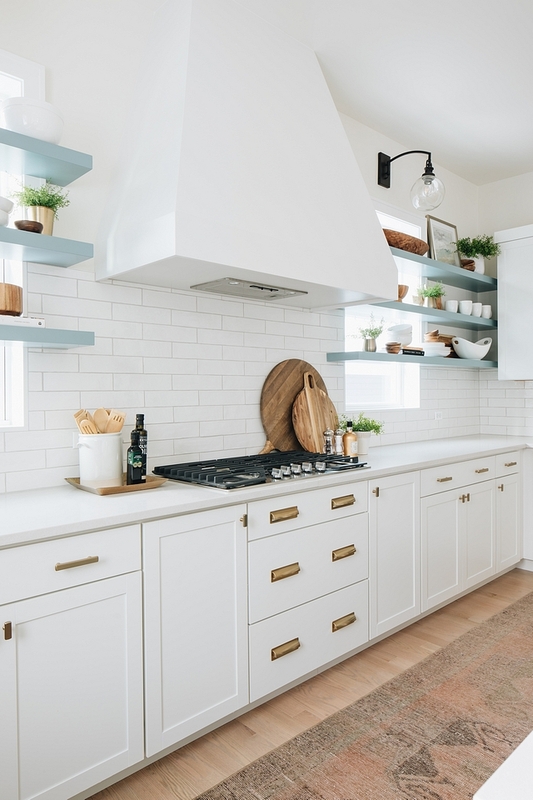 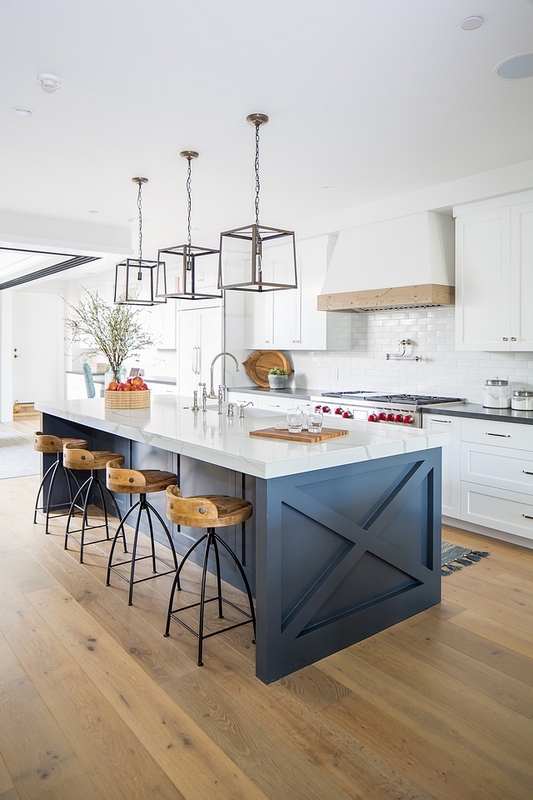 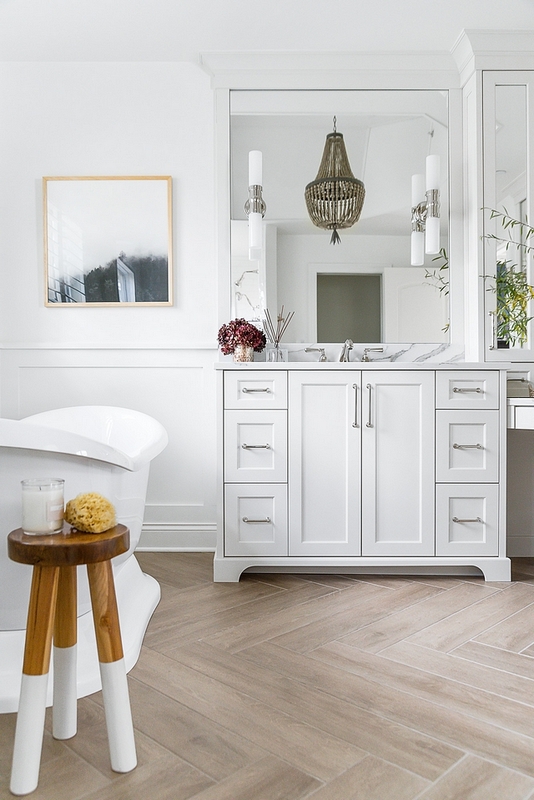 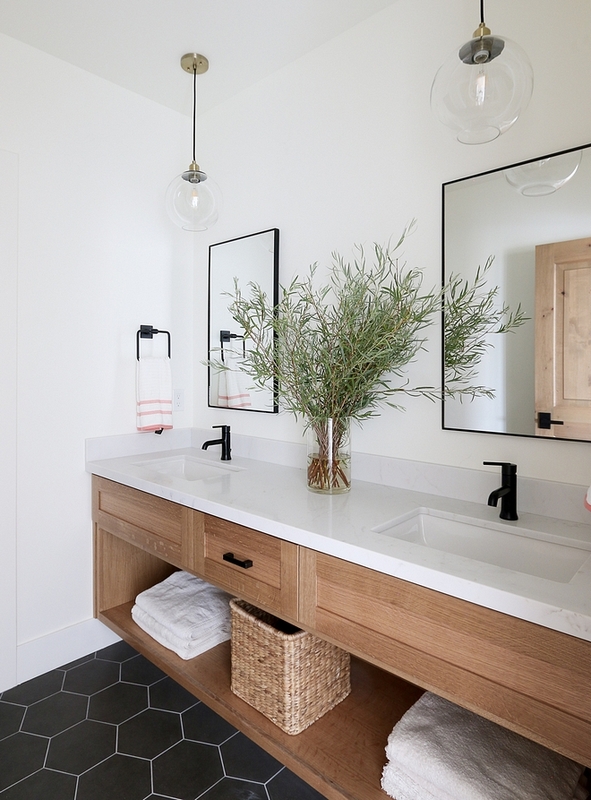 Quartz countertops, clean-lined white cabinetry, a farmhouse sink, reclaimed wood and handcrafted subway tile laid in a herringbone pattern really transformed the space. 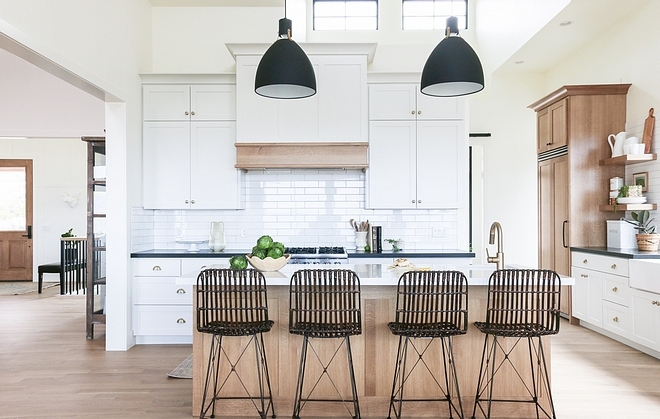 Counter stools – Spin Swivel Backless Counter stool from Crate & Barrel – Other Beautiful Counterstools: here, here, here & here. 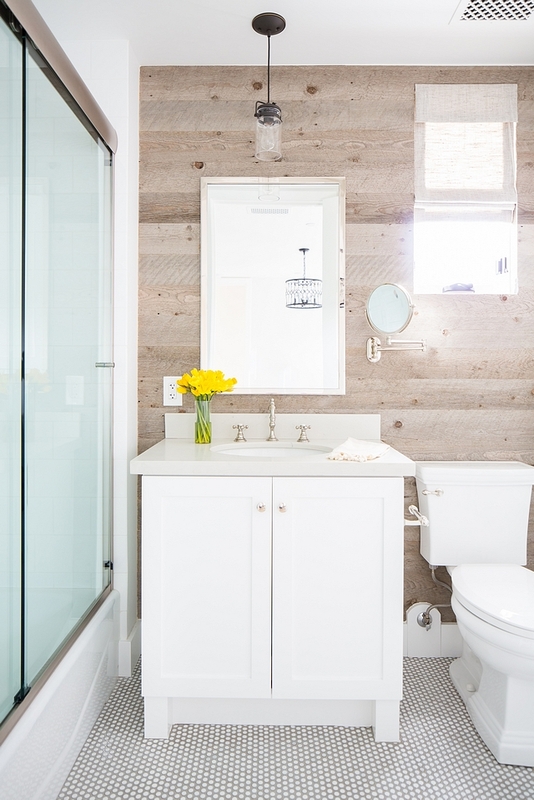 Shiplap: Reclaimed wood shiplap on the island really added warmth and the rustic vibe the designers were looking for. 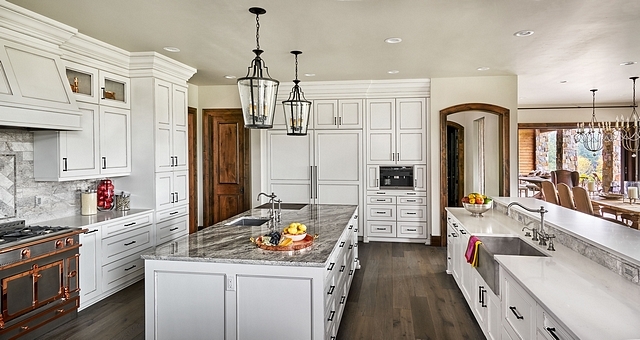 Kitchen cabinets are from the Plain & Posh custom collection and are a non-beaded inset. 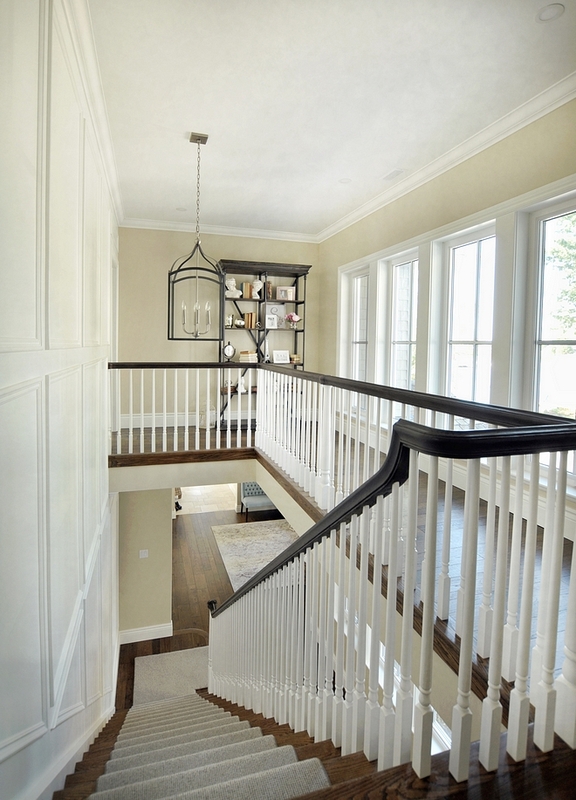 Flooring: Solid hardwood flooring – similar here. 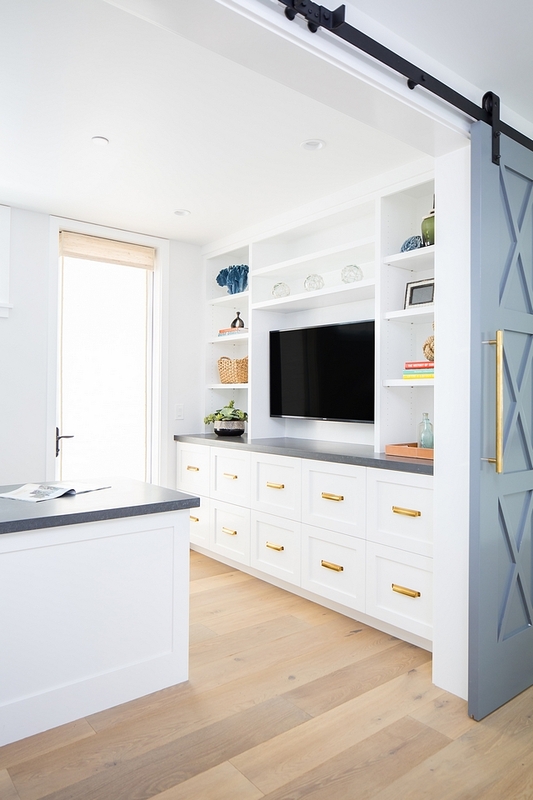 Cabinet Hardware is by Schaub and is the Menlo Park knob and pull. 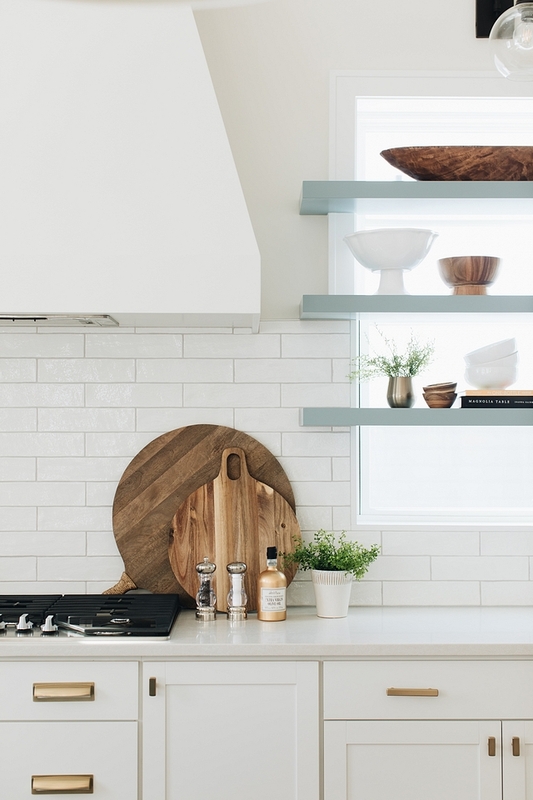 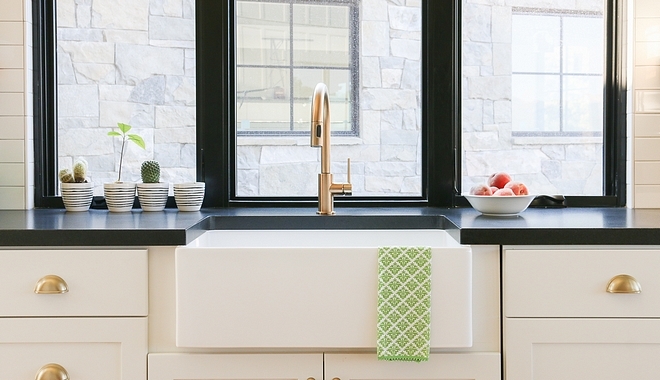 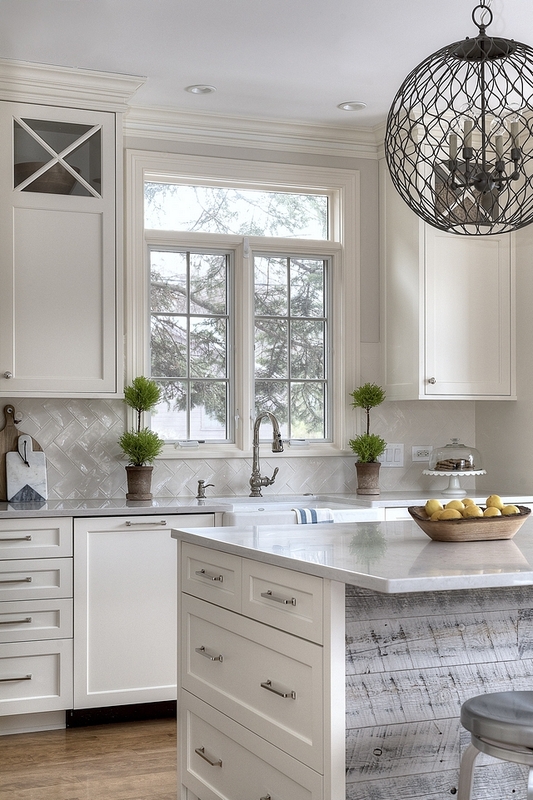 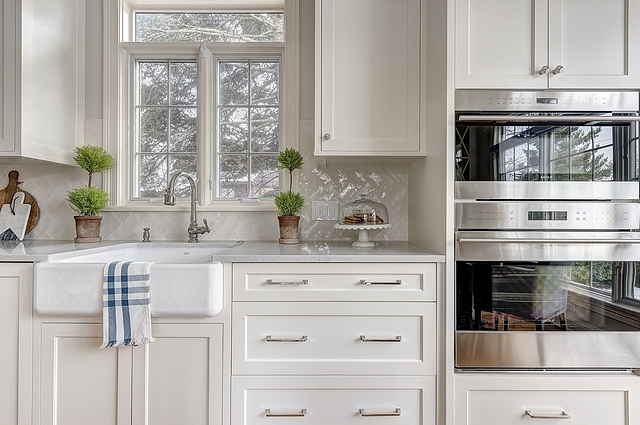 Backsplash: Masia 3×6 Subway Tile in Ivory – Other Tiles: here, here, here, here & here. 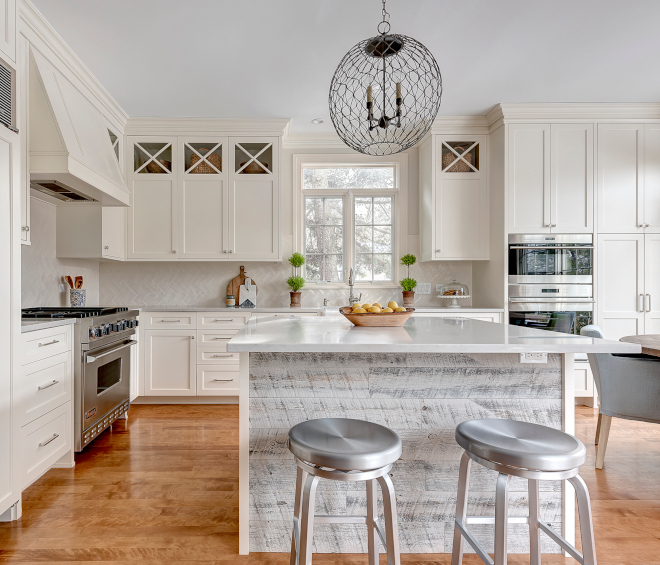 Kitchen Island Design: Keeping the island a square size made the best spatial sense in this room – and lent itself to using one larger chandelier instead of two pendants. 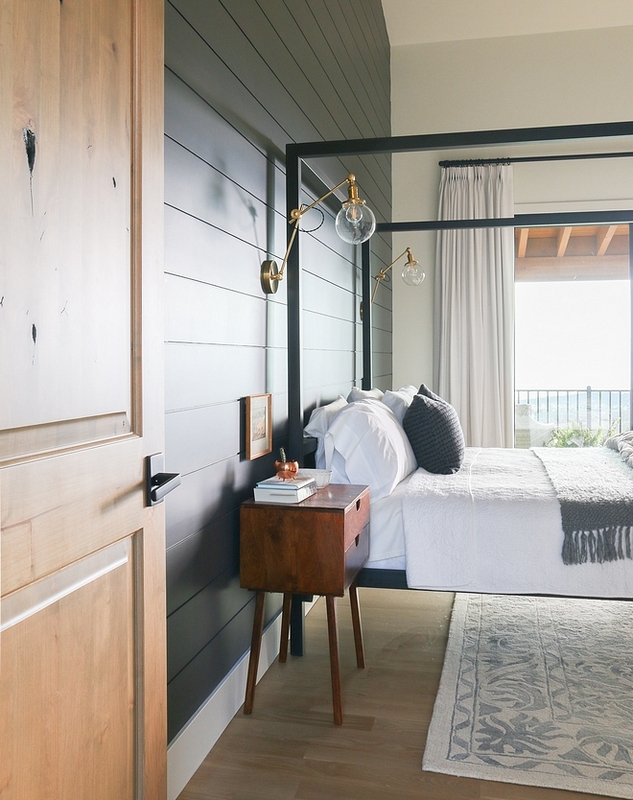 Amy decided to make that the main light feature in the room and just reconfigure the can lighting around the rest of the space. 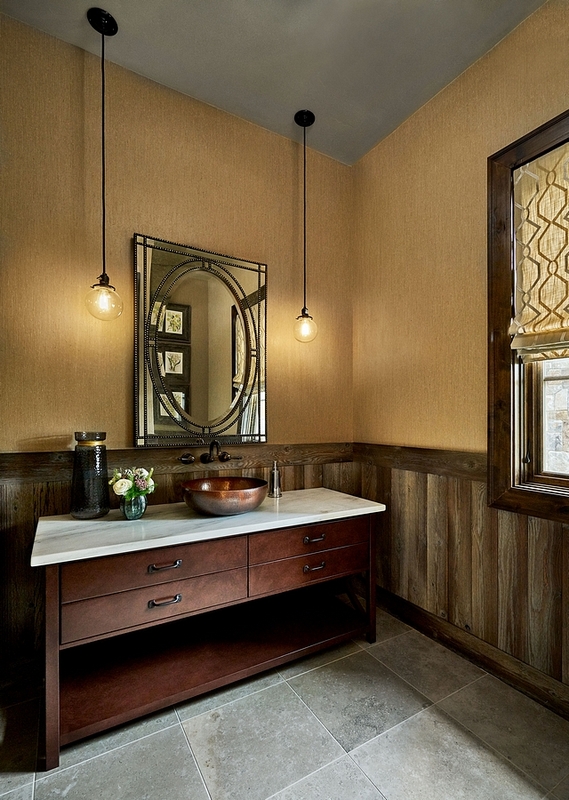 The light fixture is by Currey & Company the Simpatico Small Orb Chandelier. 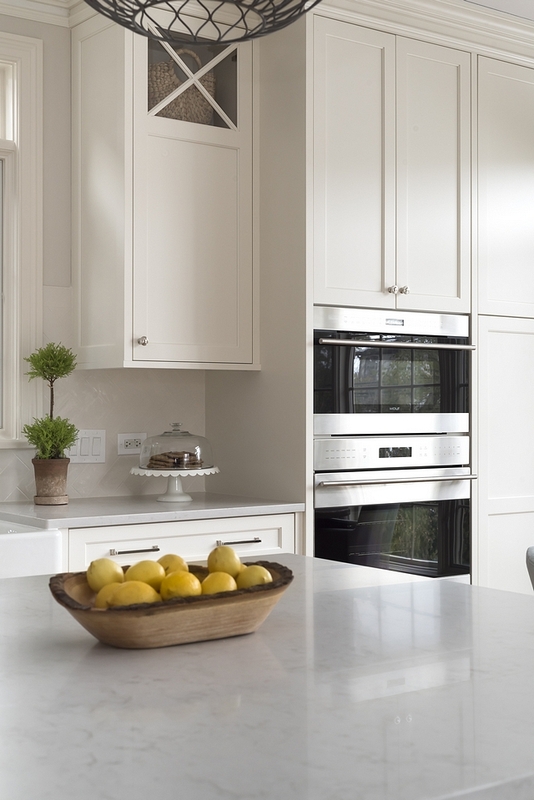 Wall Ovens: Wolf – similar here & here. 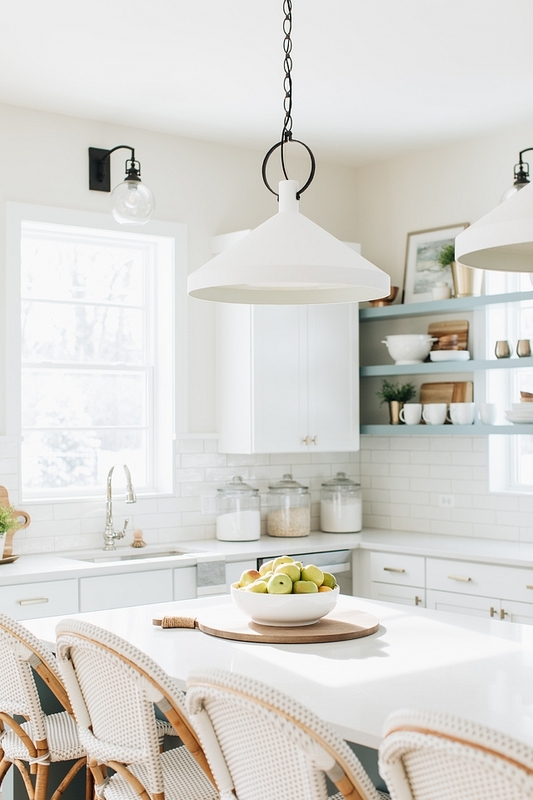 Kitchen Countertop Decor Ideas: Wooden Cutting Boards, Cake Stand, Crocks, Pitcher, Canisters, Dough Bowl, Planters, Topiaries. 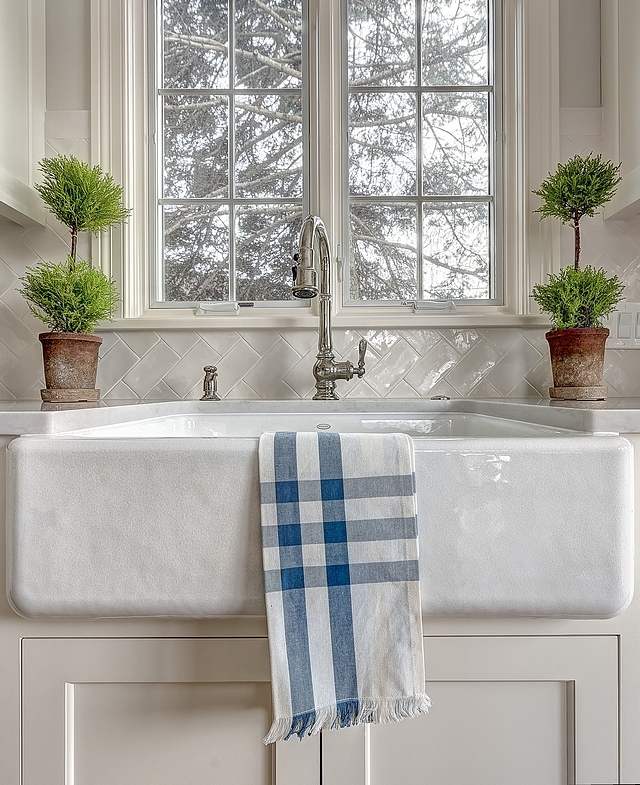 The sink is the Kohler Whitehaven apron front in their sea salt finish. 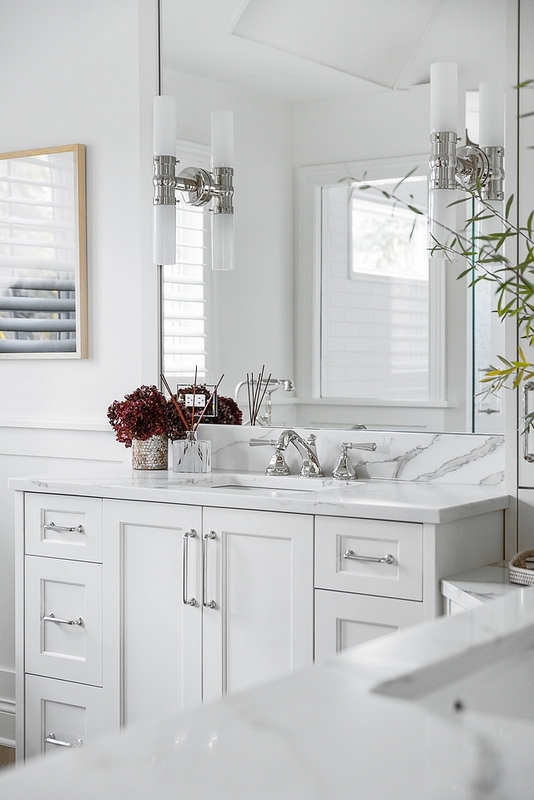 Faucets is by Kohler, Artifacts. 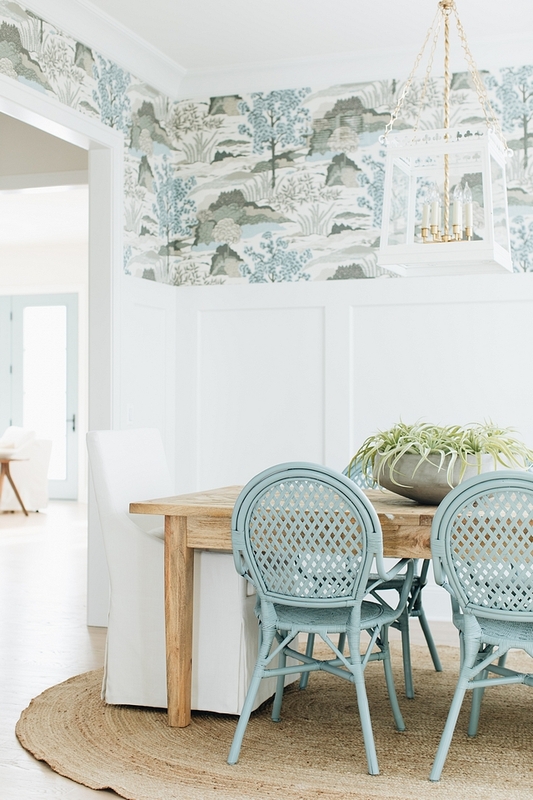 Beautiful Kitchen Tea Towels: here, here, here & here. 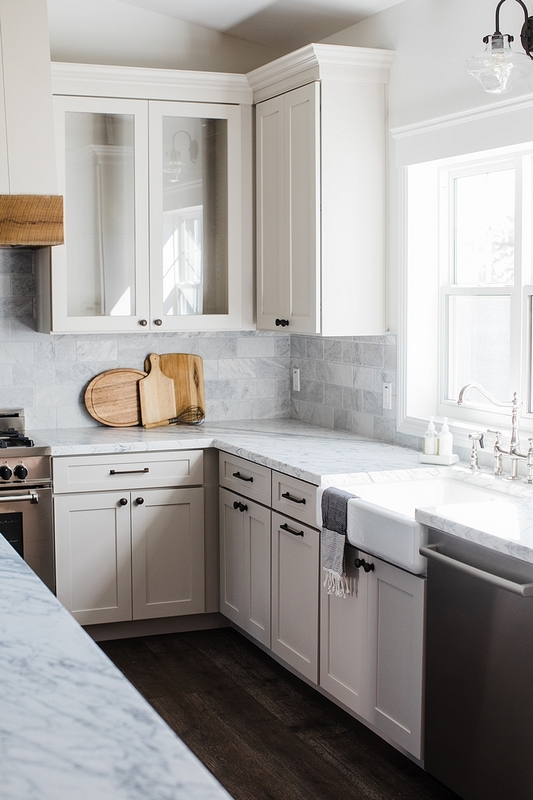 Countertops are Caesarstone London Grey. 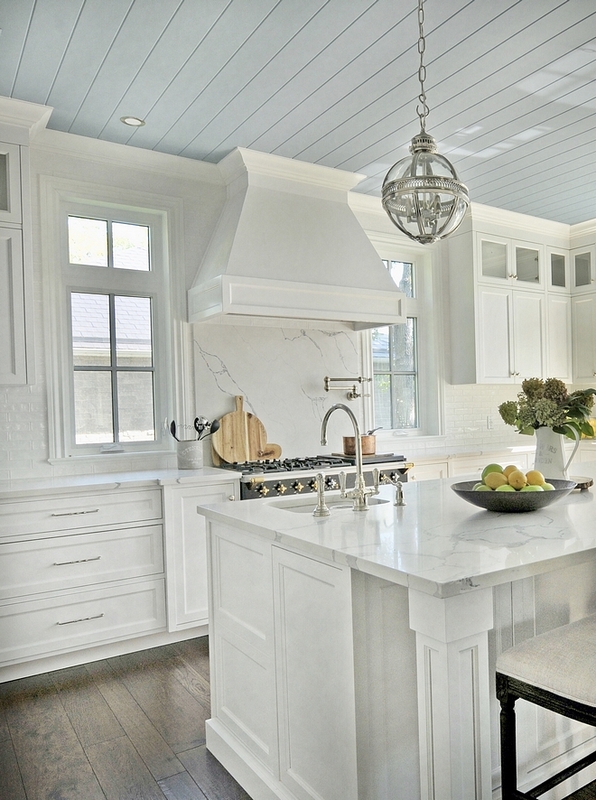 Kitchen cabinets and trim are Benjamin Moore White Dove OC-17. 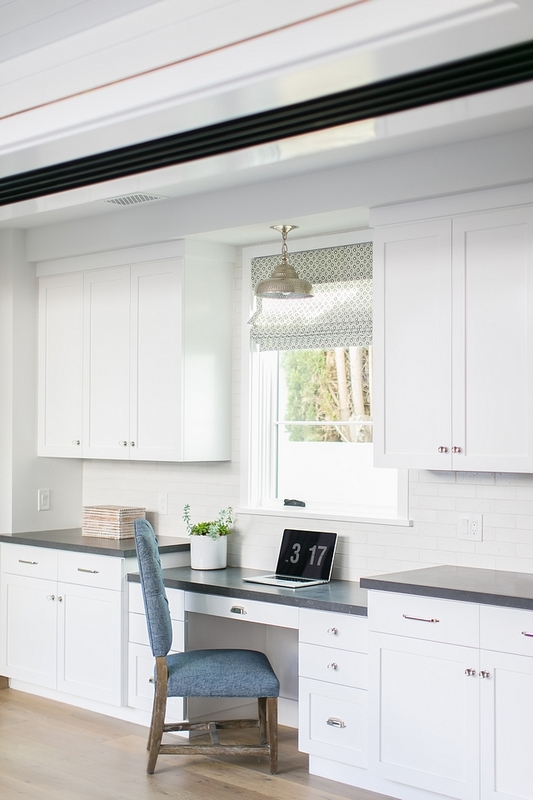 Window Treatment – Hunter Douglas Designer Screen Roller Lite Rise and Skyline Panels. 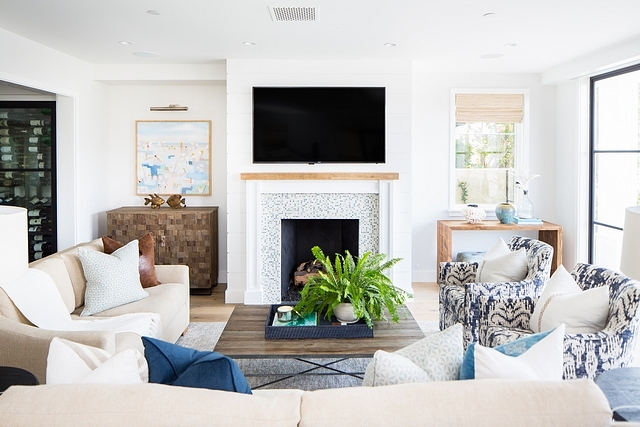 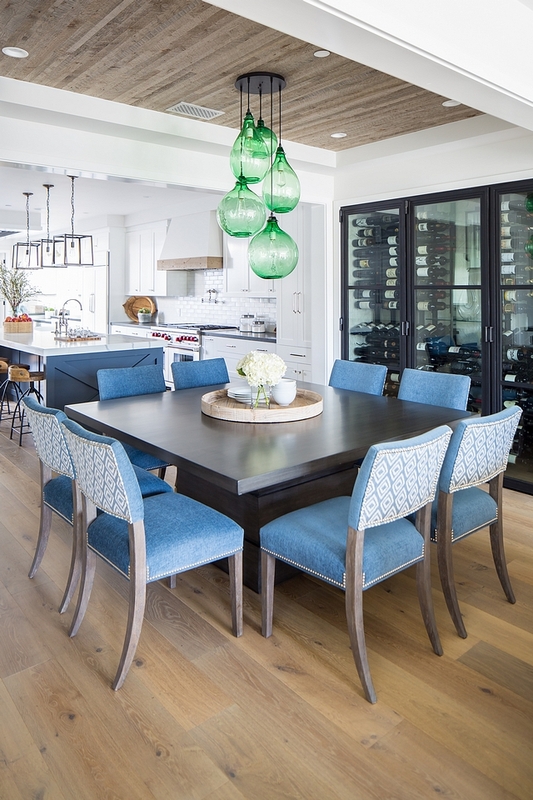 Their clients also wanted a cozy spot for their family to gather – in the mornings with coffee or for dinnertime conversation. 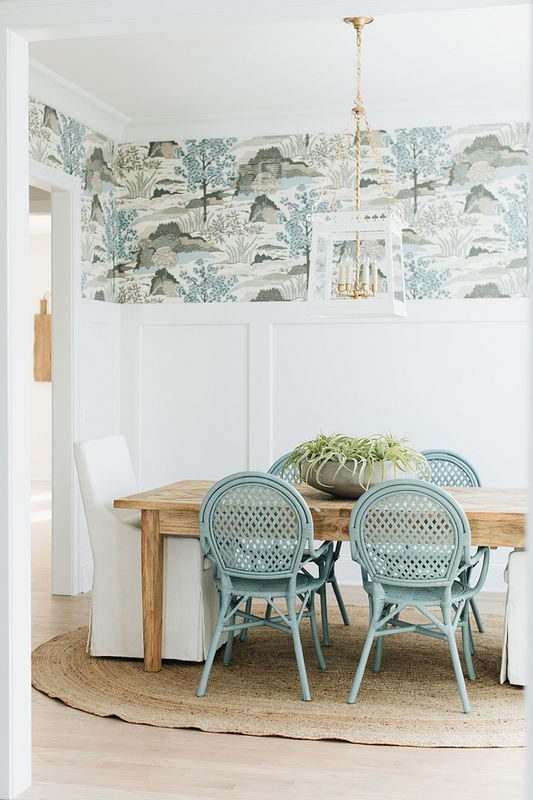 The slip-covered chairs and weathered-wood table are now a favorite spot in the house. 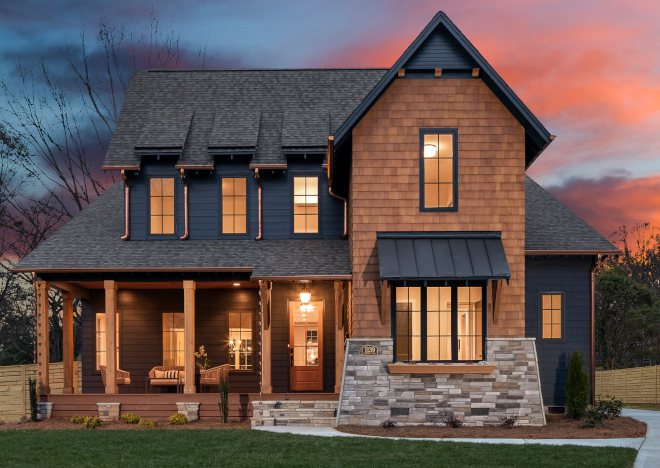 Even on a cloudy day, it feels bright and cheerful … truly the heart of the home for this wonderful family. 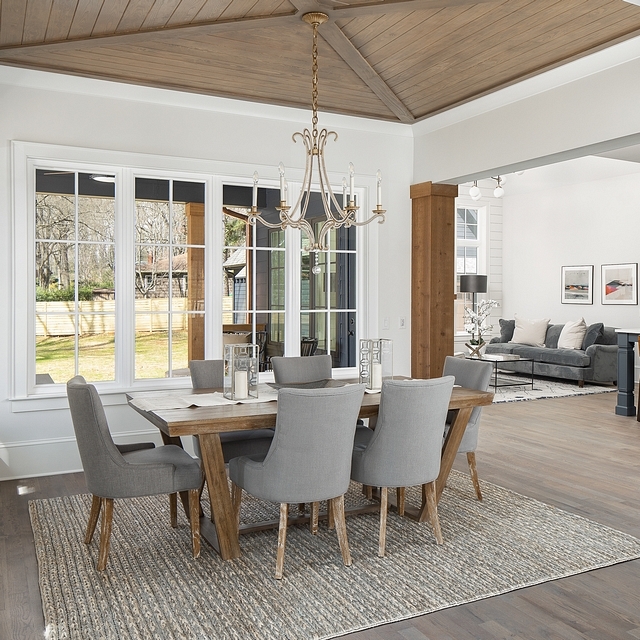 Table – Eldridge Dining Table, Home Decorators Collection – Others: here, here, here & here. 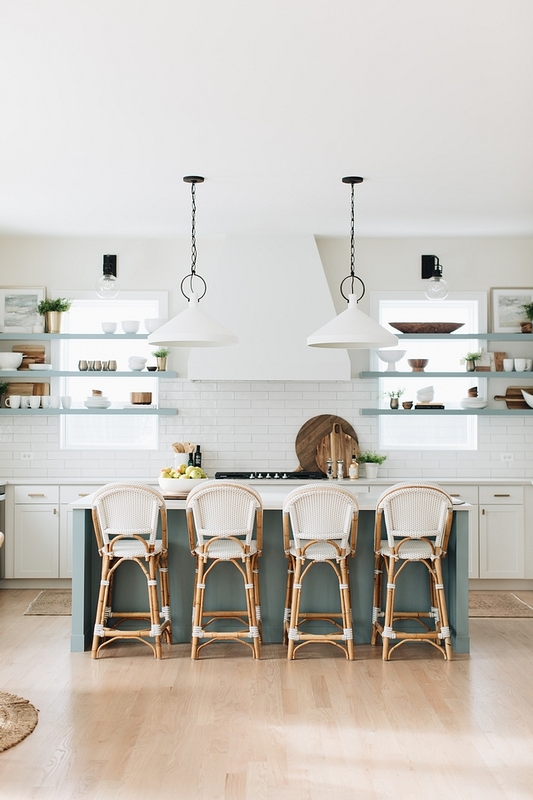 Chairs – Linen Slipcovered Accent chairs from Wisteria – Others: here, here, here, here, here & here. 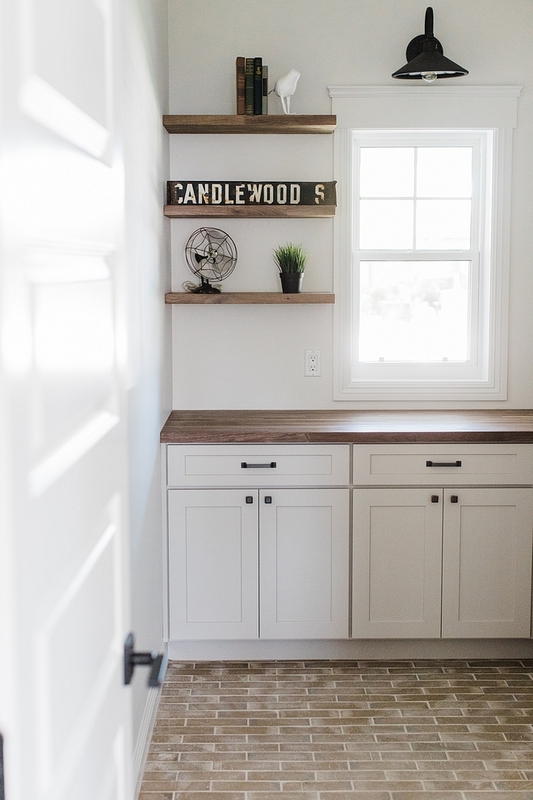 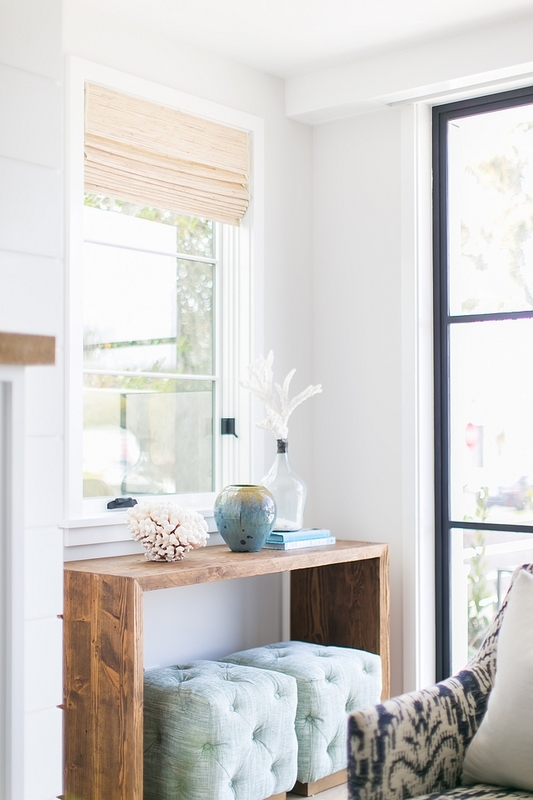 Previously the corner of the kitchen housed a tiny desk and became a catchall for a little bit of everything. 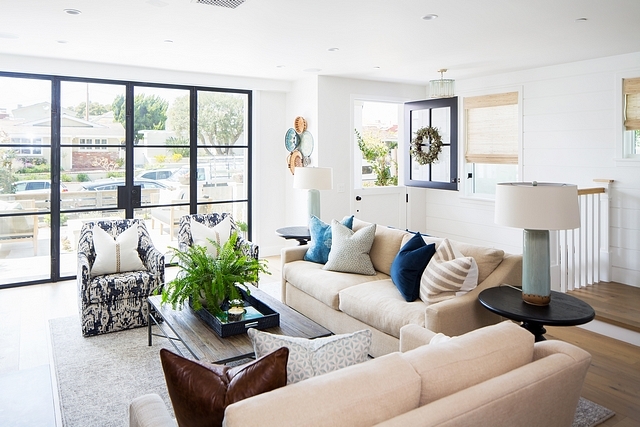 They knew they could turn it into a much more usable and beautiful space. 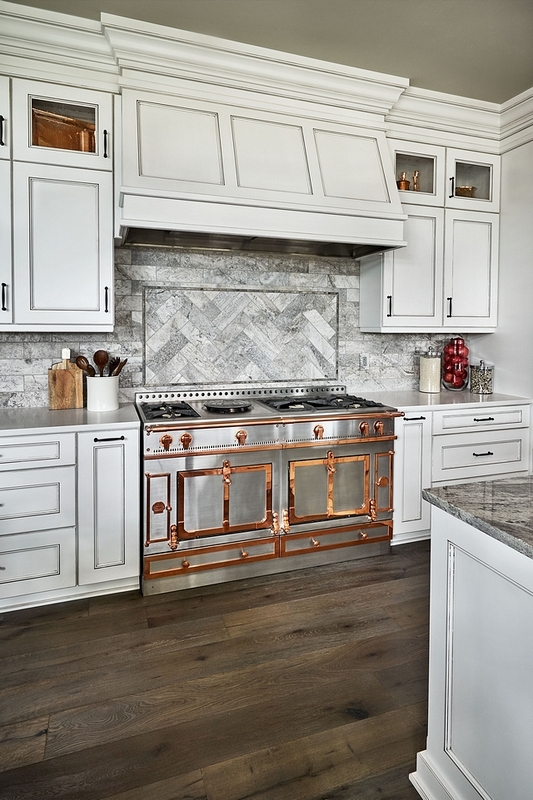 Now it is an entertaining-workhorse – with antique-mirrored upper cabinetry and a beverage refrigerator and wine rack below. 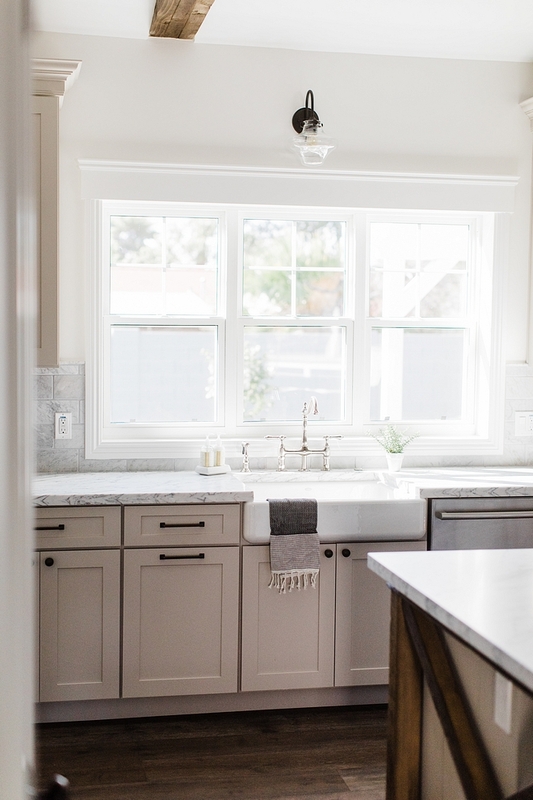 Fast-forward a couple years and this family knew it was time to transform a few other rooms in their home into the fresh clean look we had given them in their kitchen. 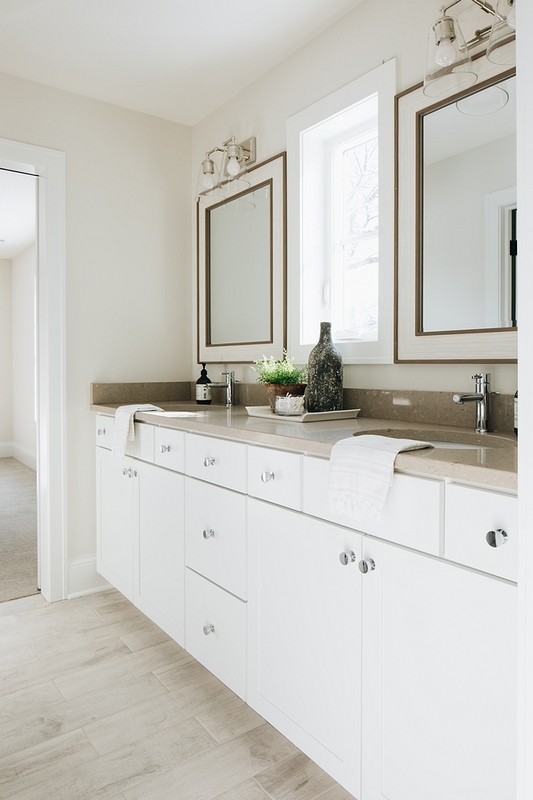 On the list, the Master Bathroom, Laundry Room and first floor Powder Room. 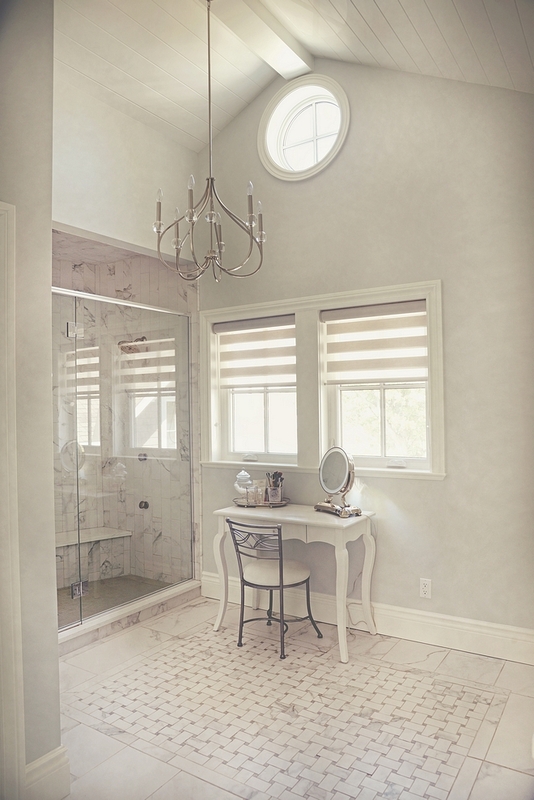 Powder Room Sconce: Anette Library Light by Ralph Lauren – similar here. 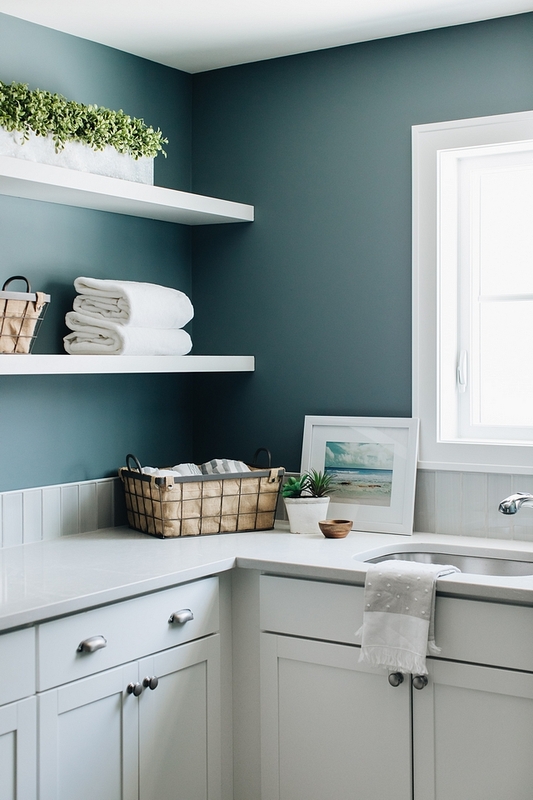 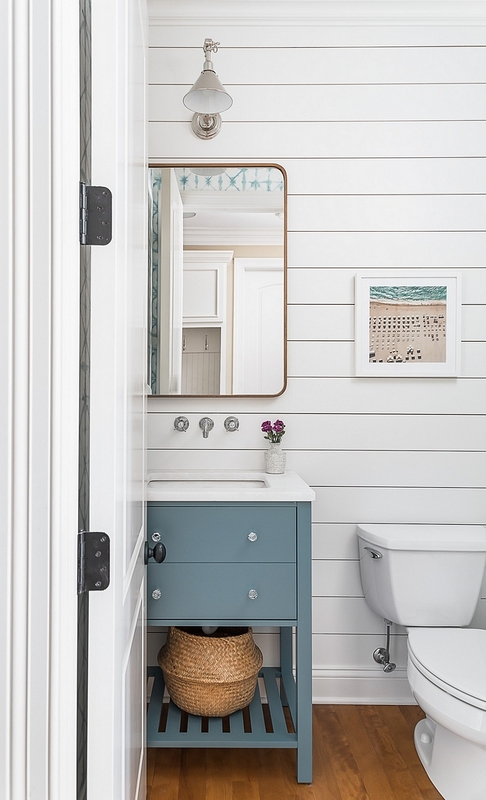 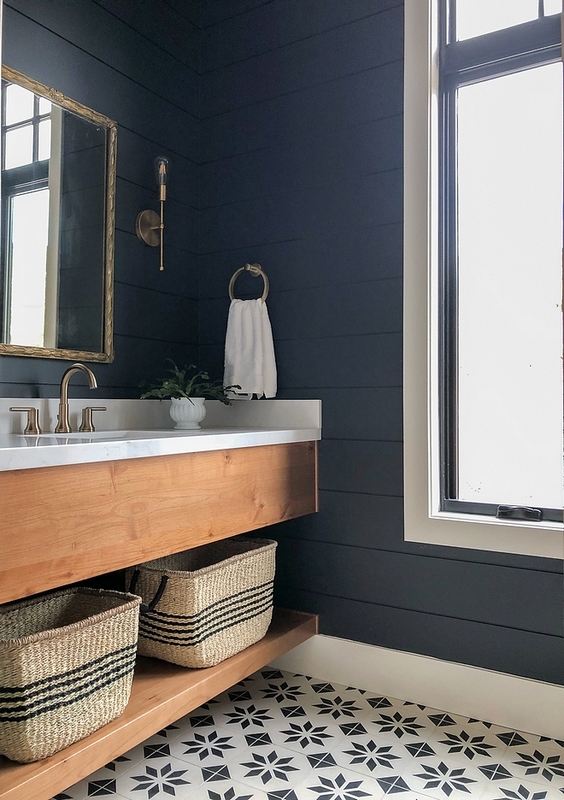 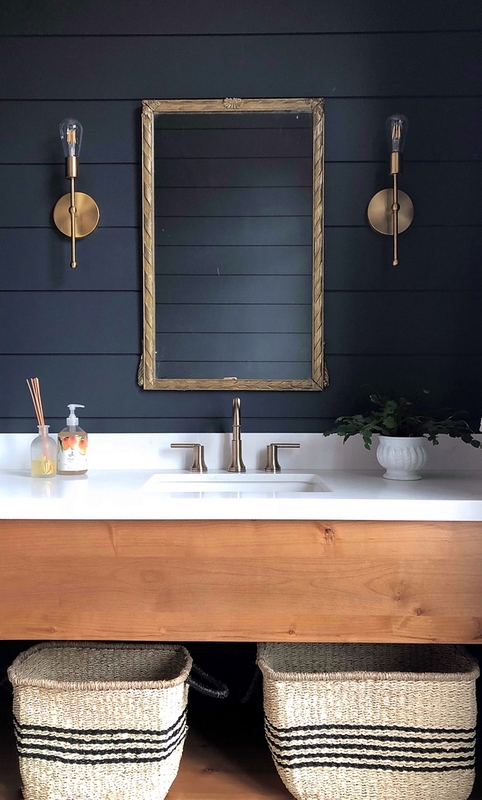 The Shiplap behind the sink area is painted in Benjamin Moore White Dove OC-17. 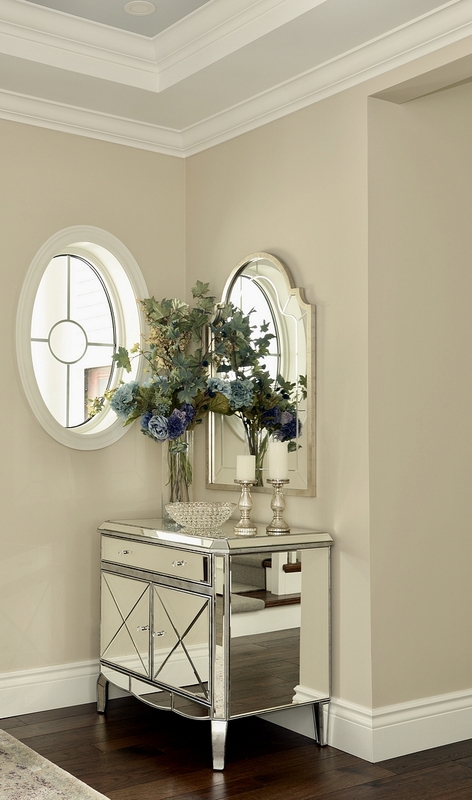 Mirror – Bentwood Rounded Rectangular Mirror from Rejuvenation. 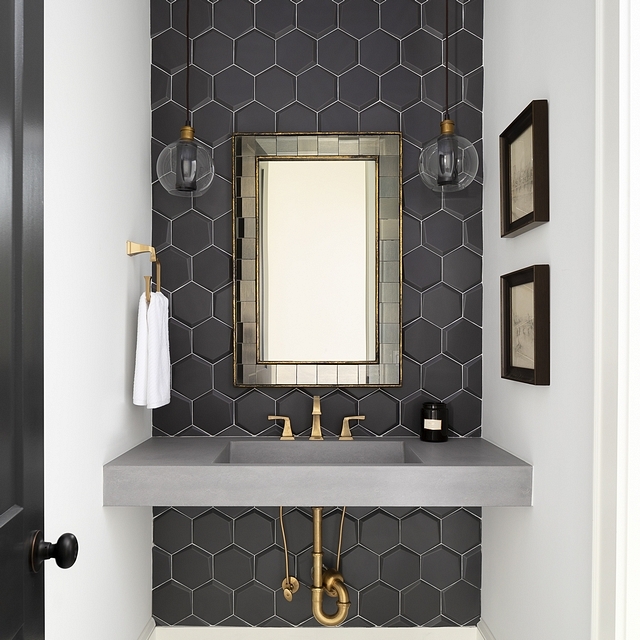 The faucet is from Newport Brass and is the Fairfield wall Mounted faucet (3-947). 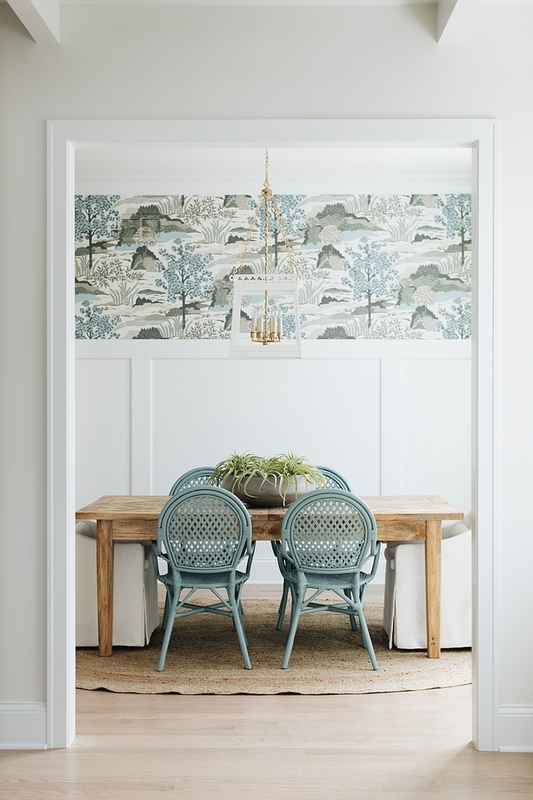 Wallpaper: Graham & Brown Indigo Aqua Wallpaper (available through the designer) – Others: here, here & here. 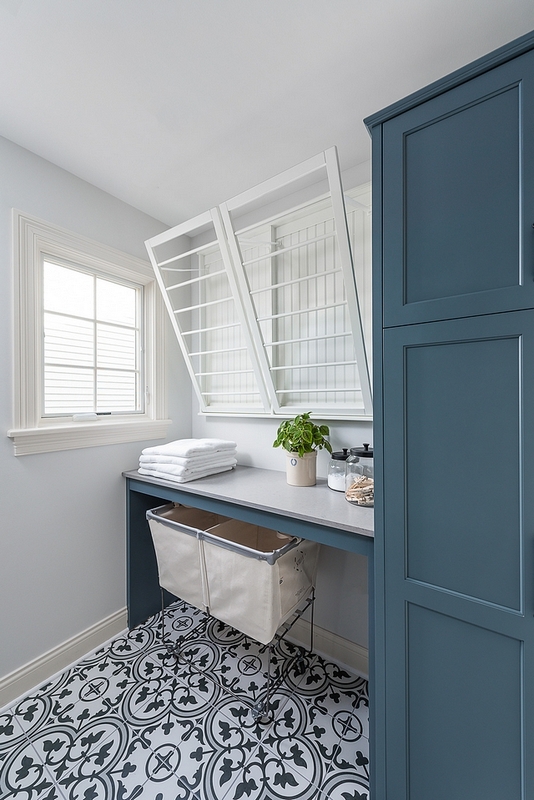 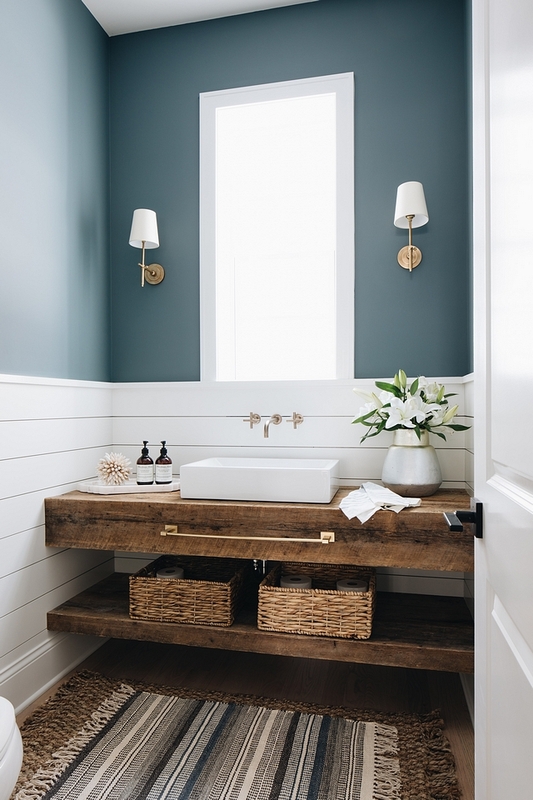 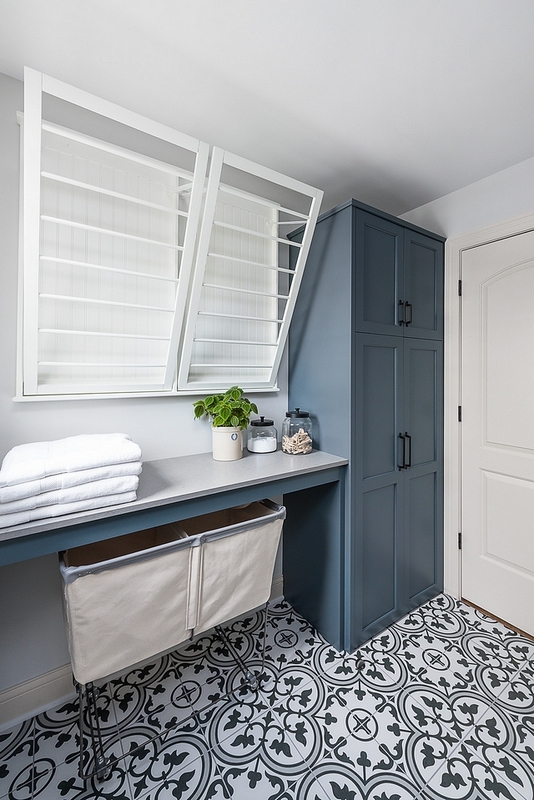 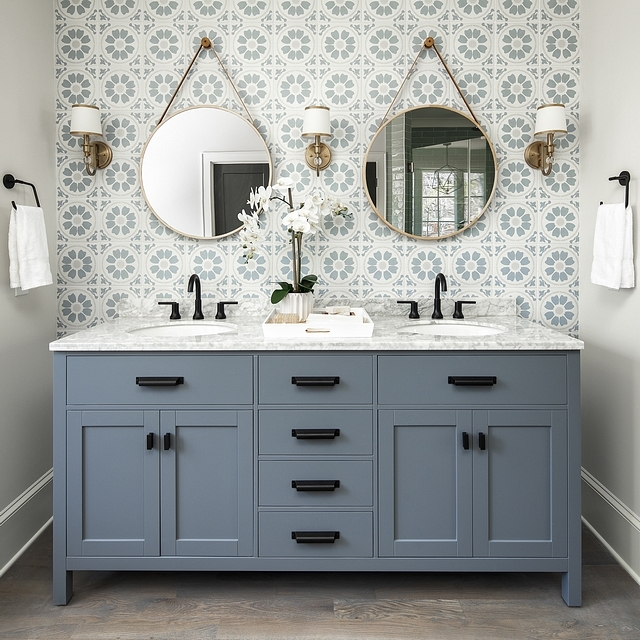 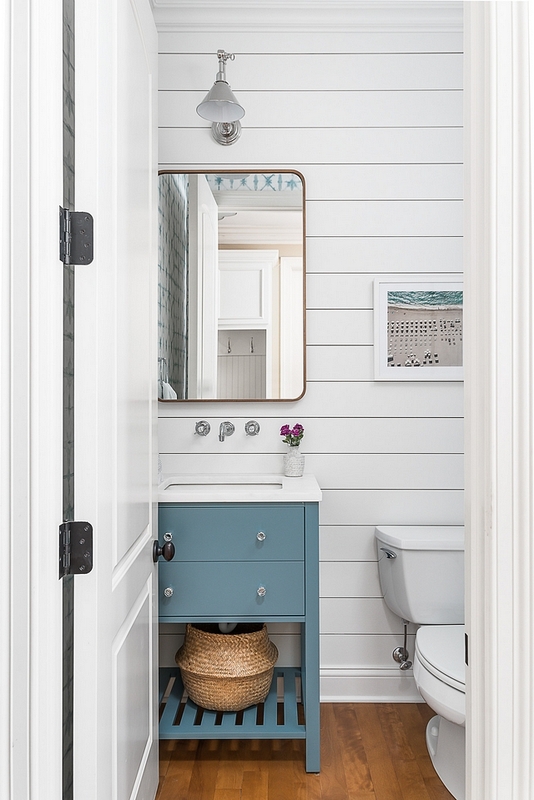 Vanity was custom Built by the Plain & Posh collection and painted Benjamin Moore – Affinity collection Blue Echo 505. 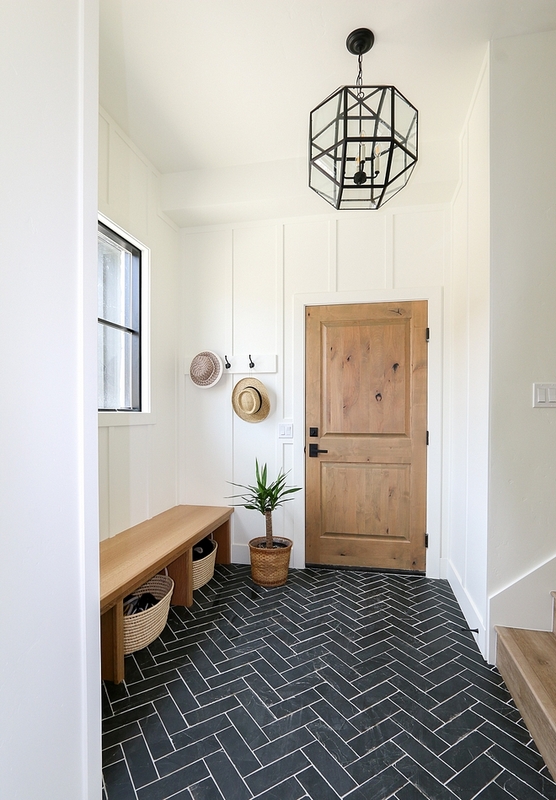 Flooring: wood/tiles: Hill House Field Tile 6×36 – Others: here, here & here. 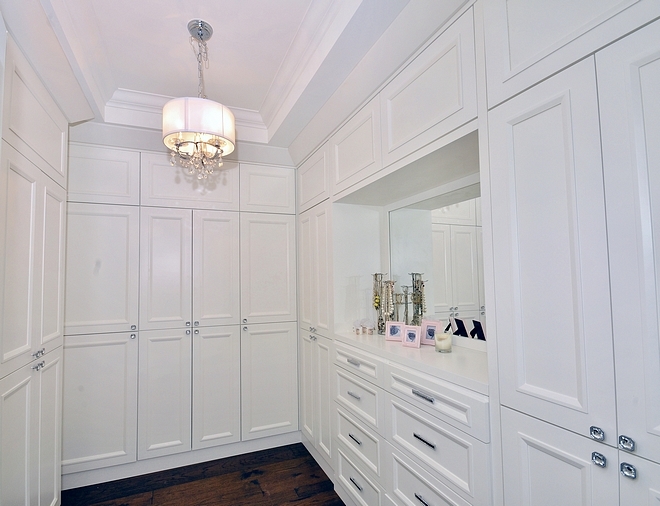 The two small drawer fronts under the makeup area mirror are actually doors that swing open to hidden outlets. 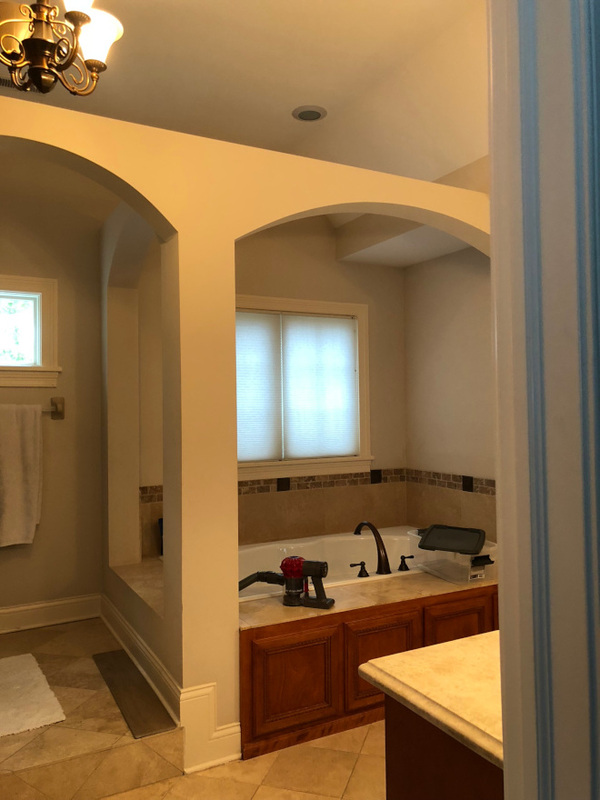 Genius! 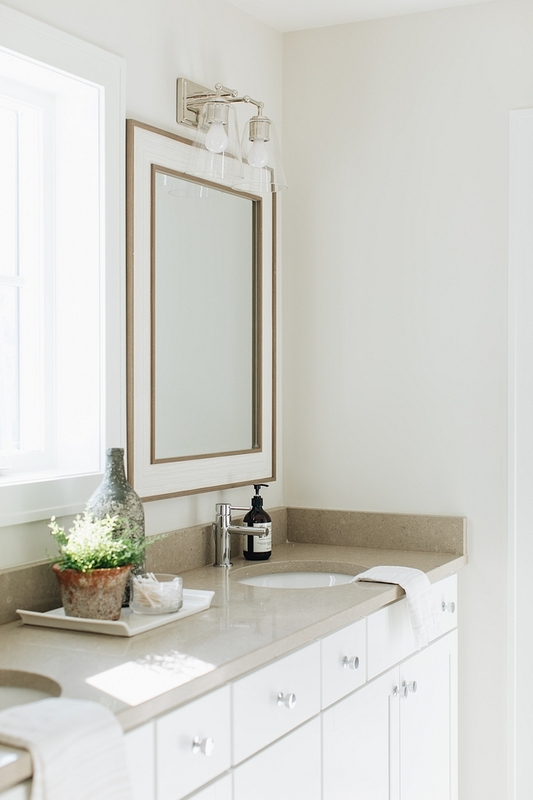 Beautiful Bathroom Accessories: here, here, here, here, here & here. 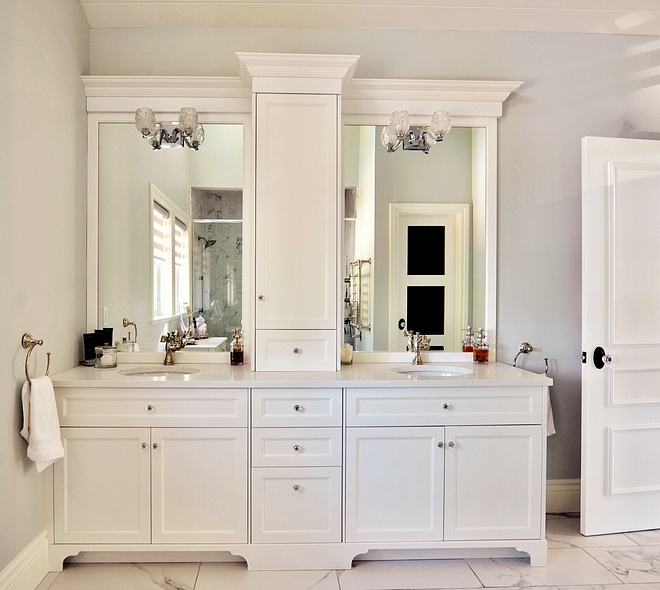 Bathroom cabinetry is by the Plain & Posh custom collection. 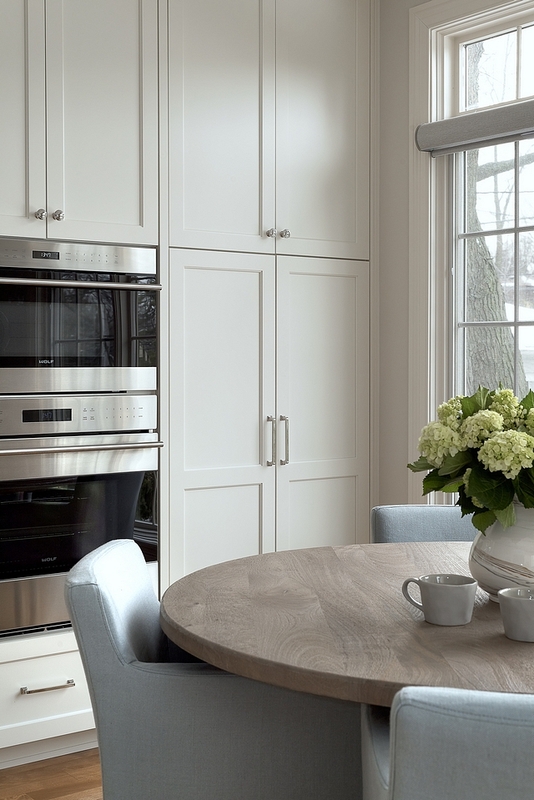 Timeless design! 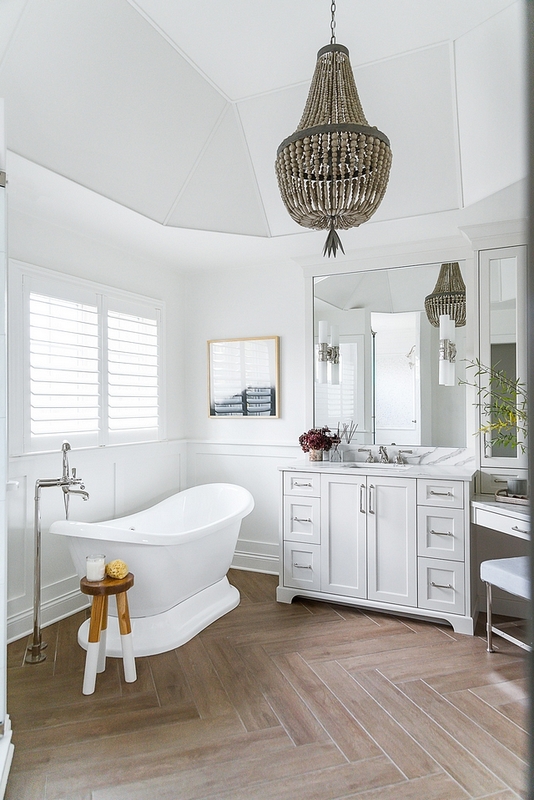 Chandelier: Dauphine Wood Empire Chandelier by RH Baby & Child – Other Beautiful Chandeliers: here, here, here, here, here, here & here (different sizes). 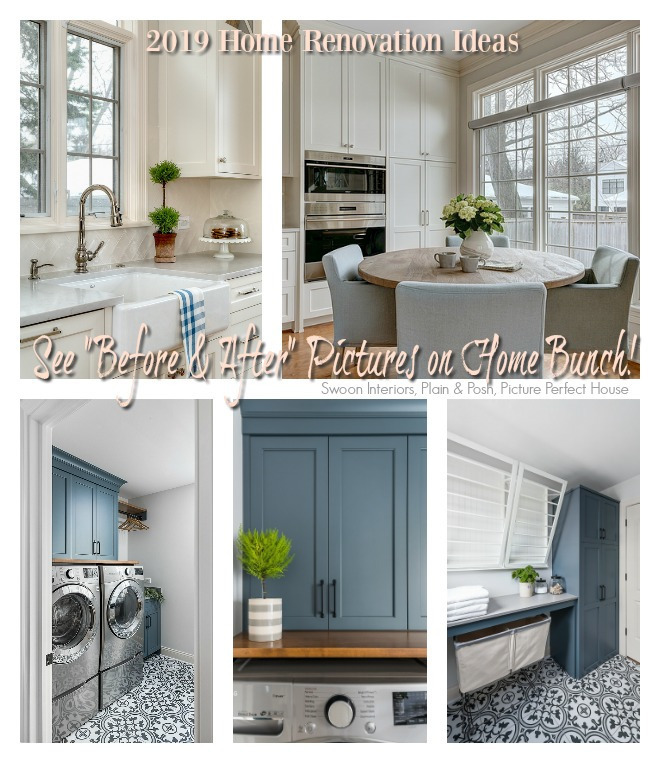 Cabinet paint color Benjamin Moore Classic Gray 1548. 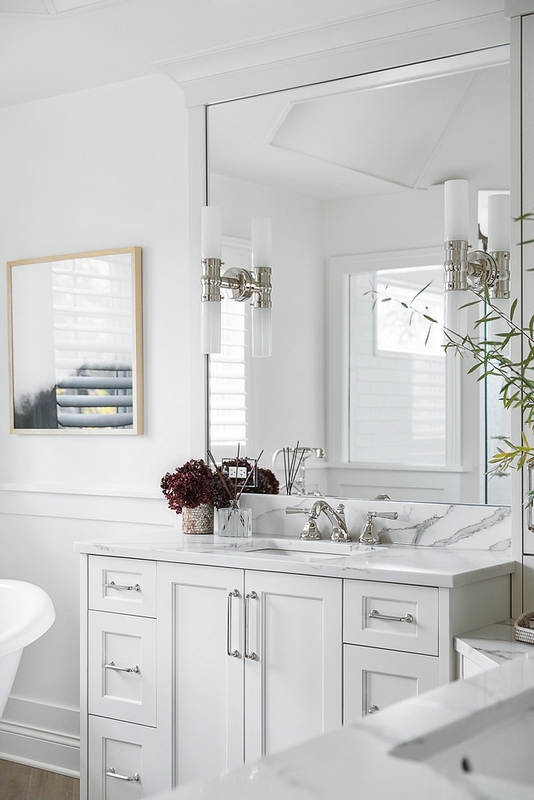 Sconces: Visual Comfort – Graydon Double Bath Light by Thomas O’Brien. 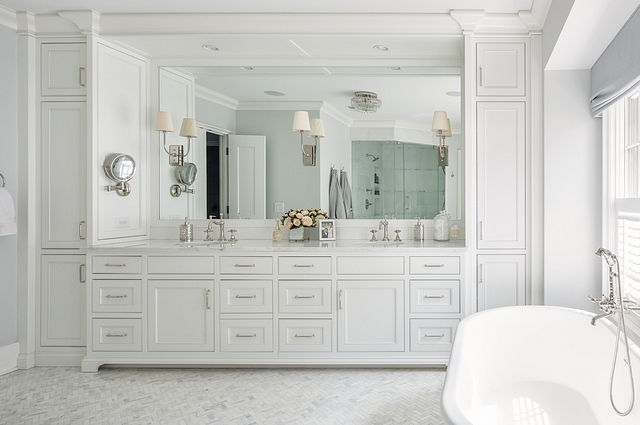 Bathroom faucets are Rohl, Palladian collection. 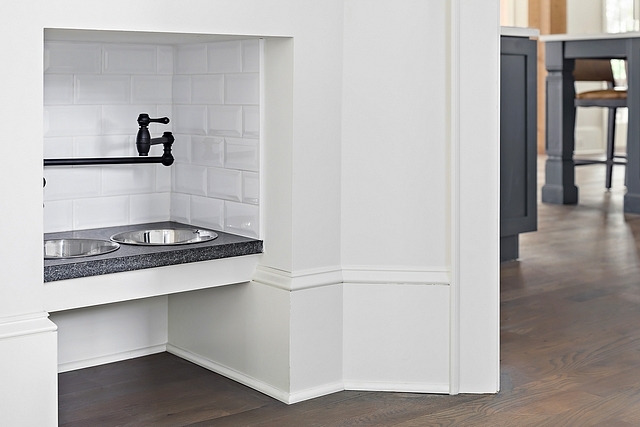 Sinks are Kohler Caxton Rectangle (K-20000-0) in White. 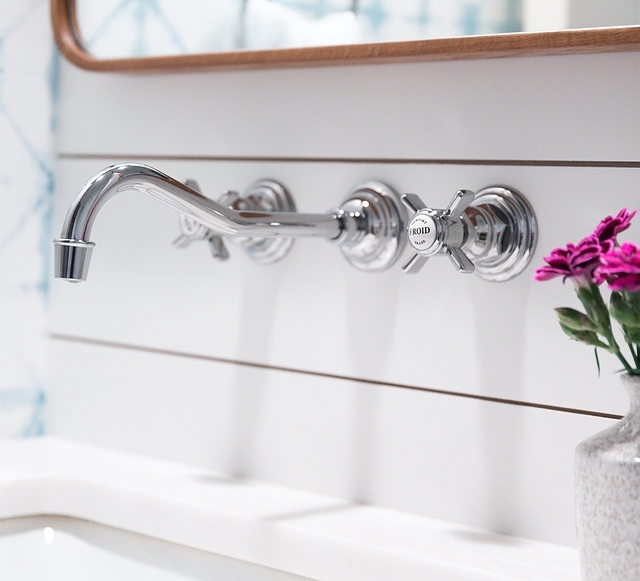 Hardware is by Atlas – The Elizabeth pull in Polished Nickel Both 419 and 420PN. 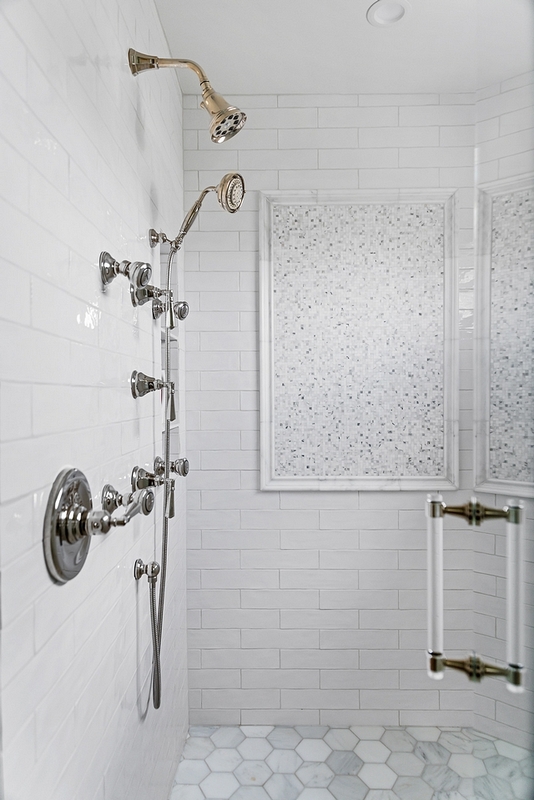 Tub is by Signature Hardware and is the Rosalind Pedestal tub. 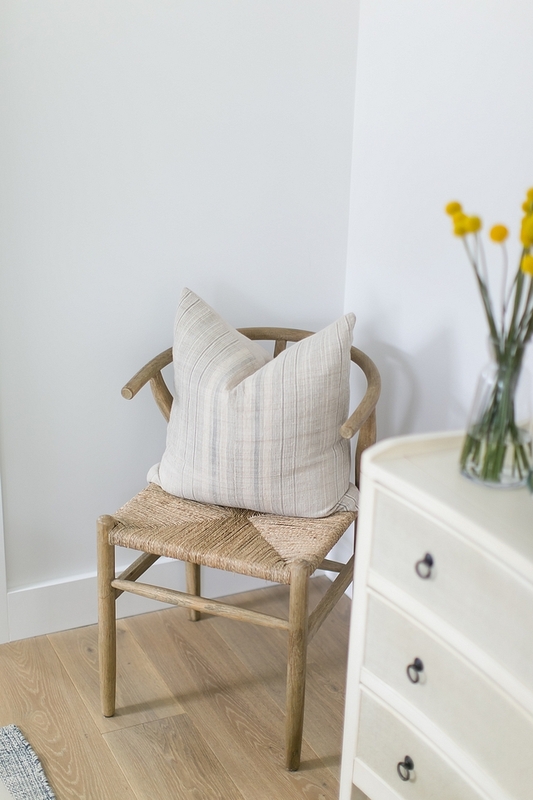 Wooden Stool – Dip Dyed Stool from Serena & Lily. 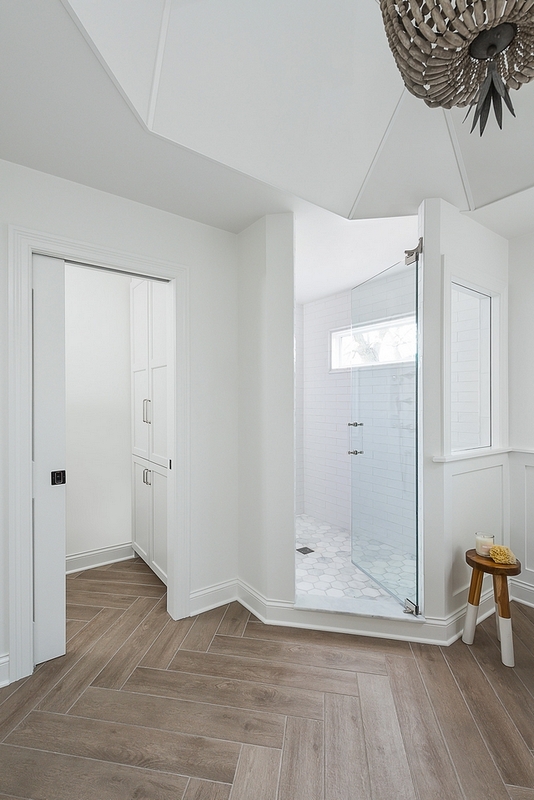 The entrance to the shower is now on an angle. 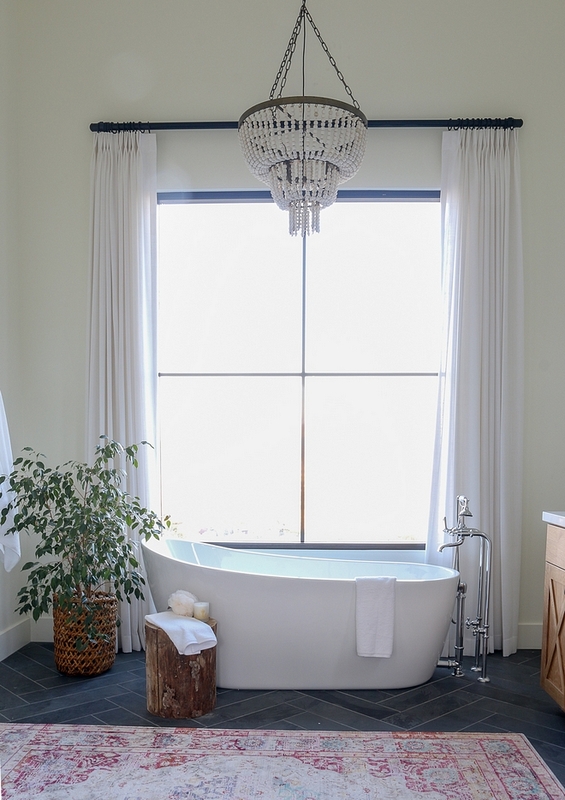 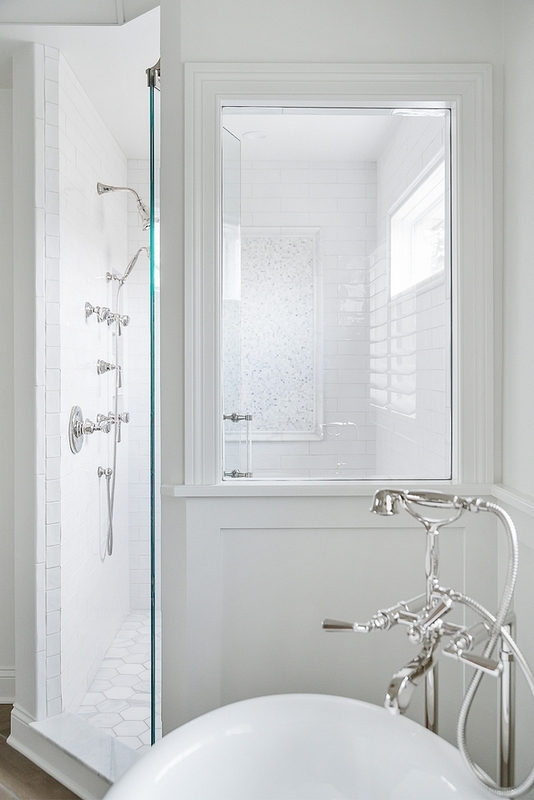 A large window was added facing the tub to allow you to see through to the gorgeous mosaic tile on the back wall. 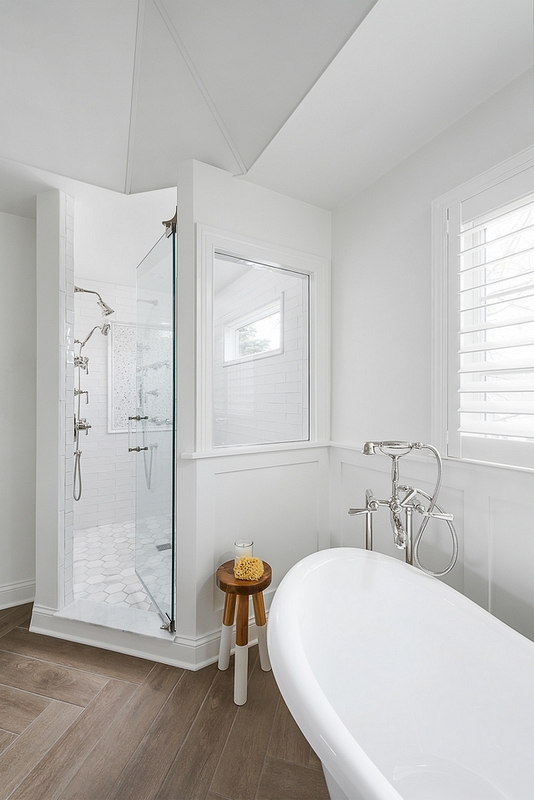 A high window was added inside of the shower to bring in light. 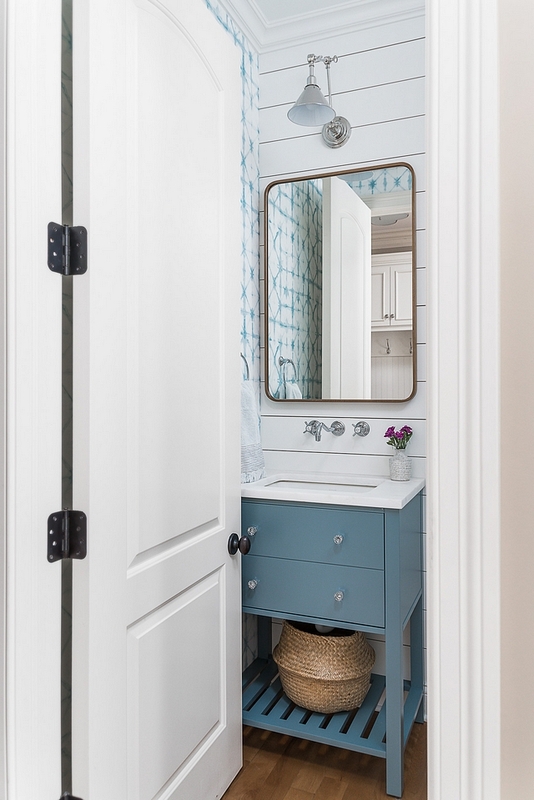 The water closet (with cabinets for extra storage!) 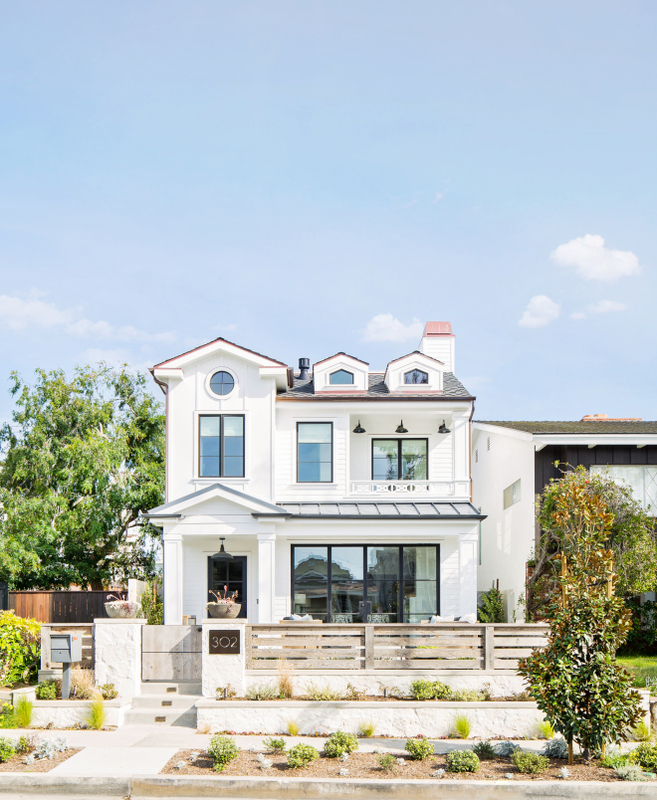 is located on the left. 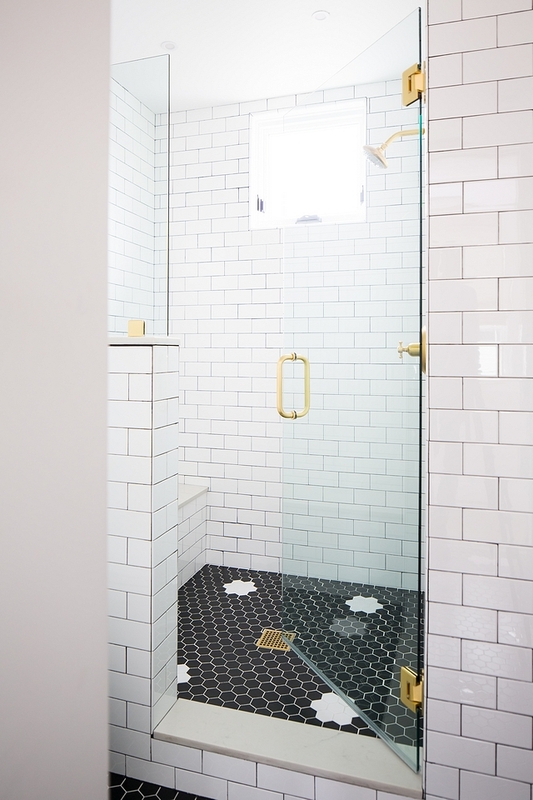 In addition to the sparkle the mosaics add, we dressed up a classic white subway tile with beautiful marble hex tile on the shower floor, gleaming polished nickel fixtures and a stunning lucite door handle. 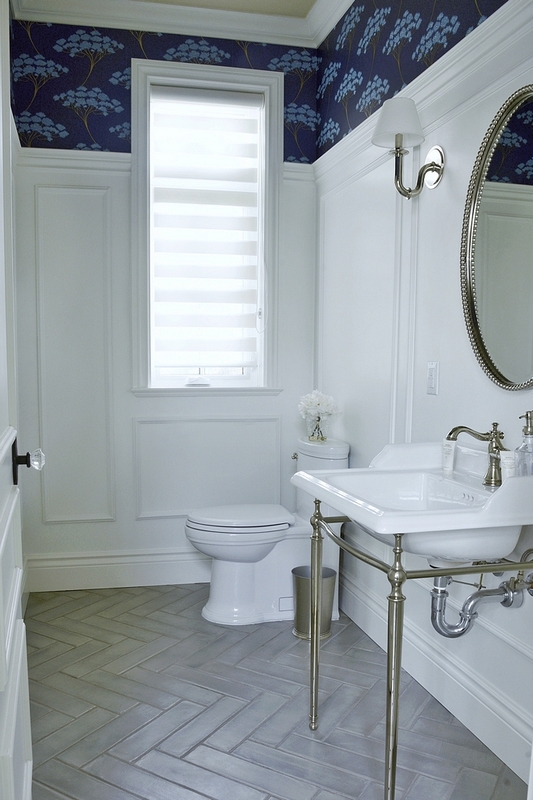 All of the plumbing fixtures are from Rohl Palladian collection. 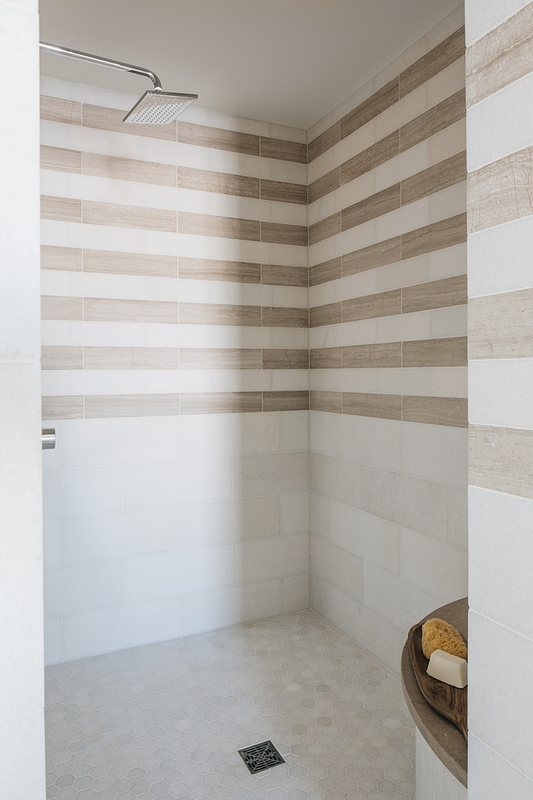 Shower Tiles: – Madrid Handmade Subway Tile in Blanco – similar here & here. 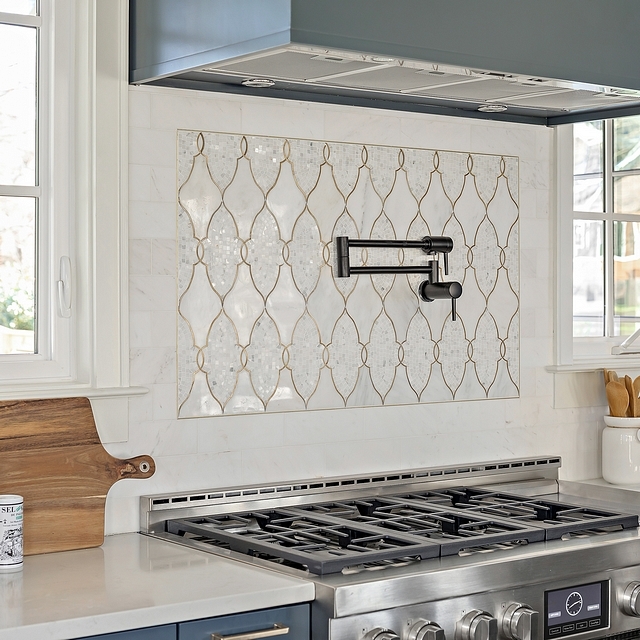 Accent Tile: Calacatta Gold Polished Interlocking Mosaic Accent Tile – similar here. 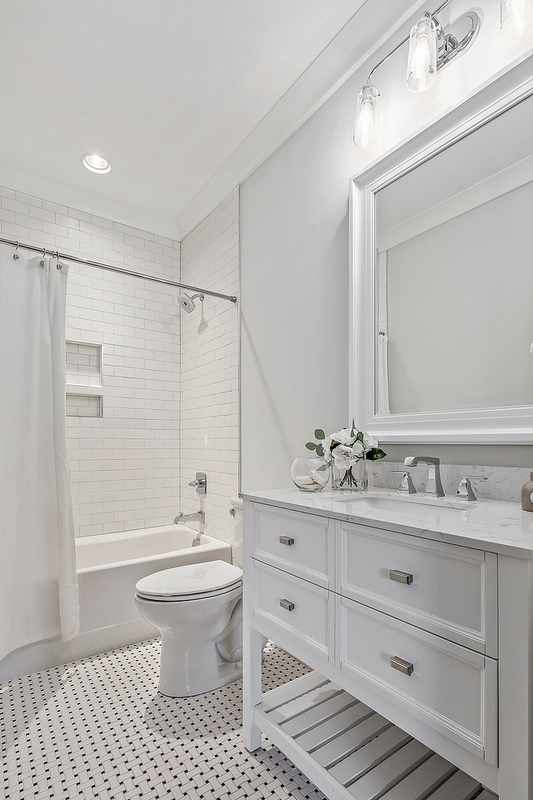 Floor Tile: Calacatta 5” Hexagon Honed on floor – similar here & here. 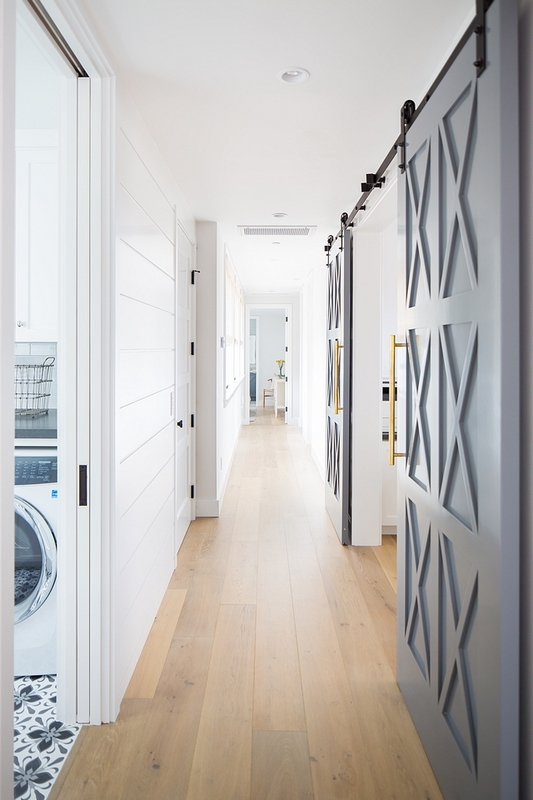 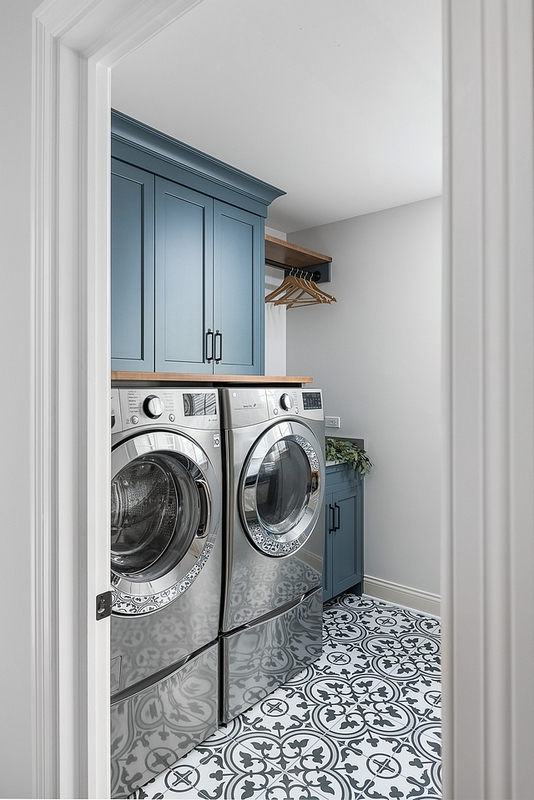 Next – the laundry room. 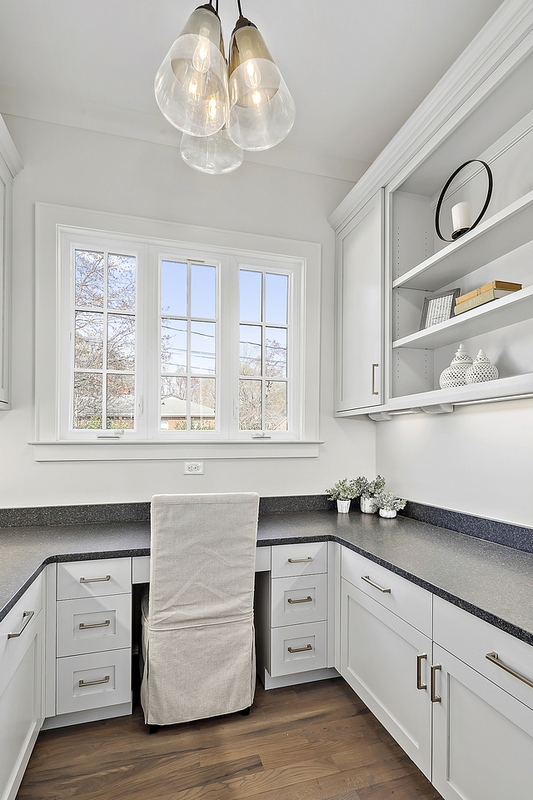 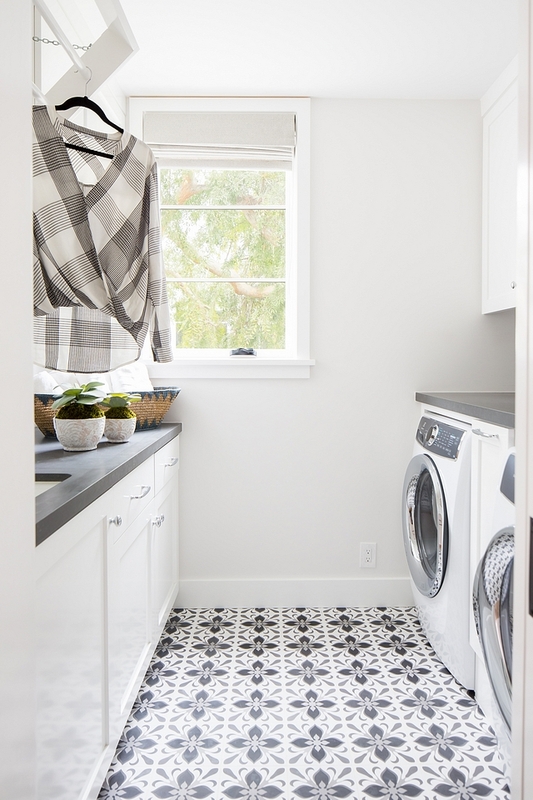 Like most builder-grade laundry rooms, this one was functional with no style. 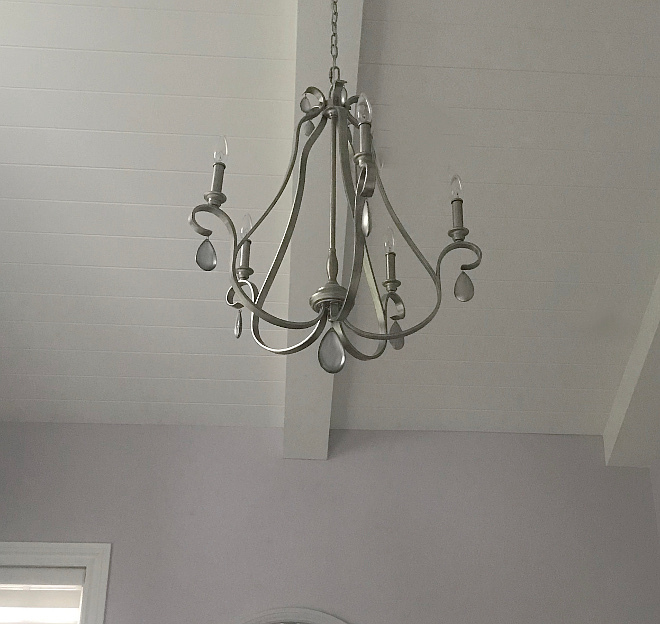 And … it was not even functioning to its full potential. 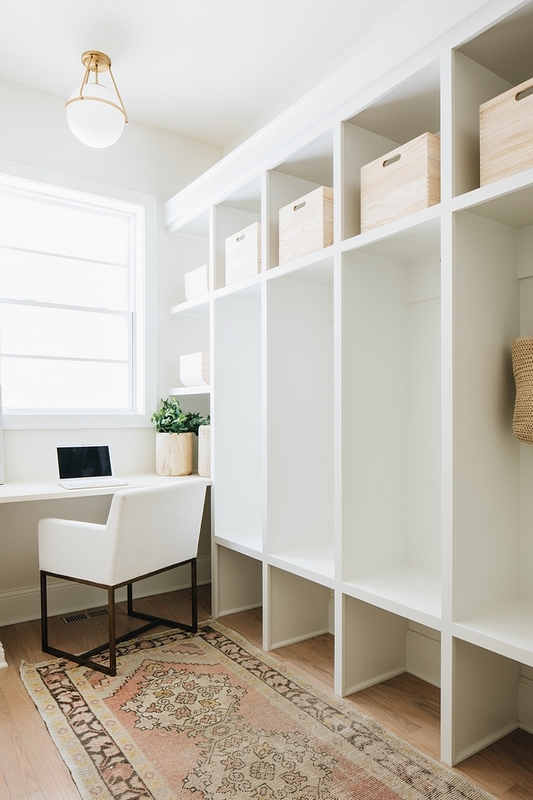 The entire right wall was left blank … our clients put in their own table as a makeshift folding area. 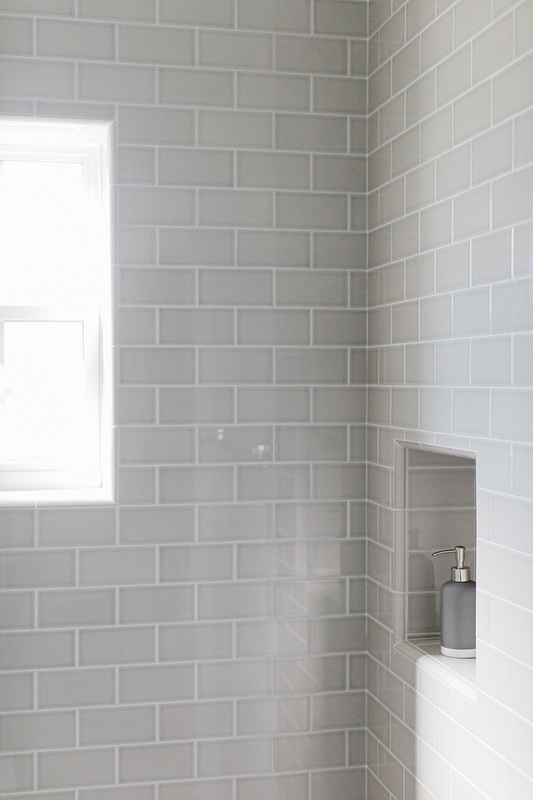 Tile is from Home Depot and is the Merola Tile and is the Arte Grey encaustic porcelain– similar here. 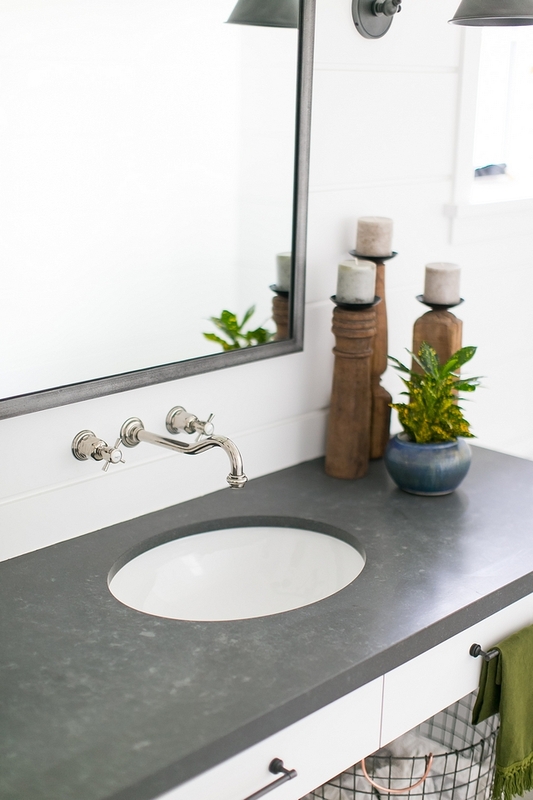 A new sink, countertop and faucet updated the old utility sink. 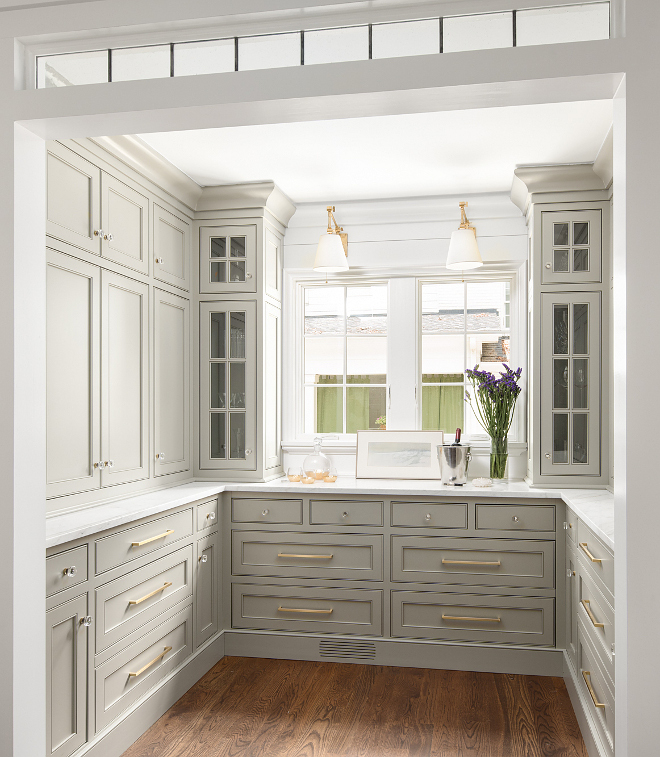 The cabinetry is Plain & Posh collection. 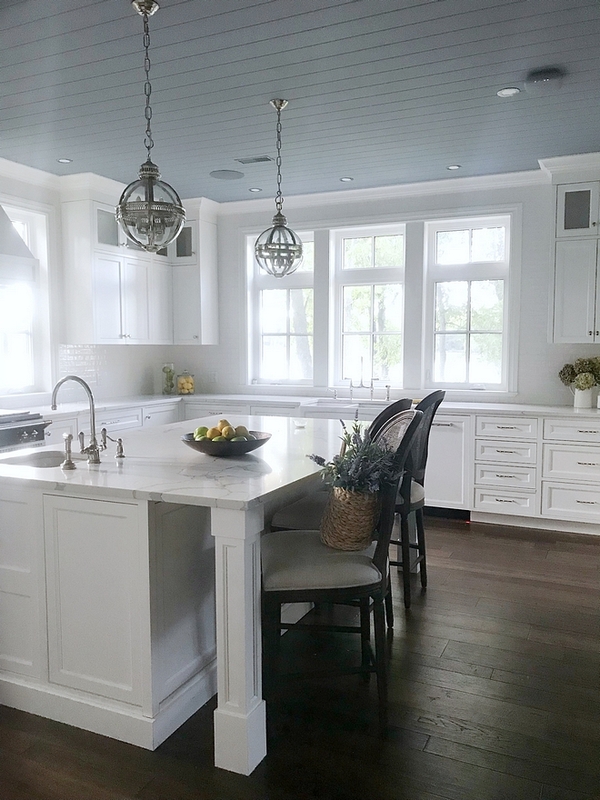 Stephanie, was extremely kind and called the cabinet maker to get the cabinet color just for you! 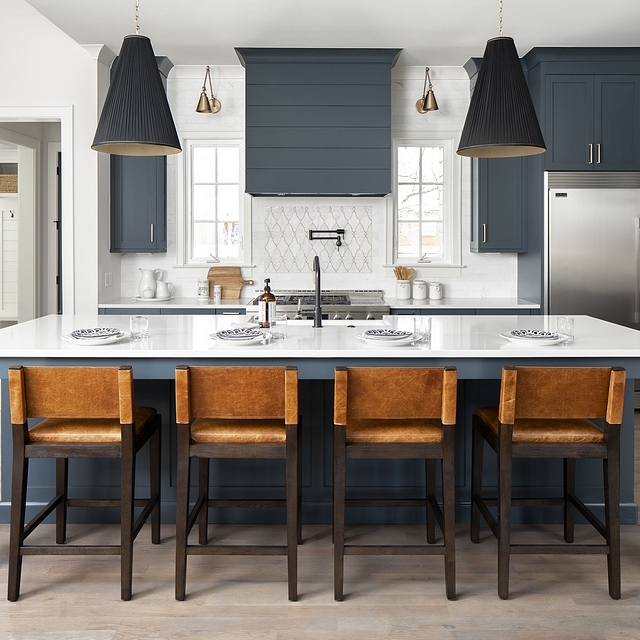 The cabinet color is Slate Tile by Sherwin Williams SW 7624. 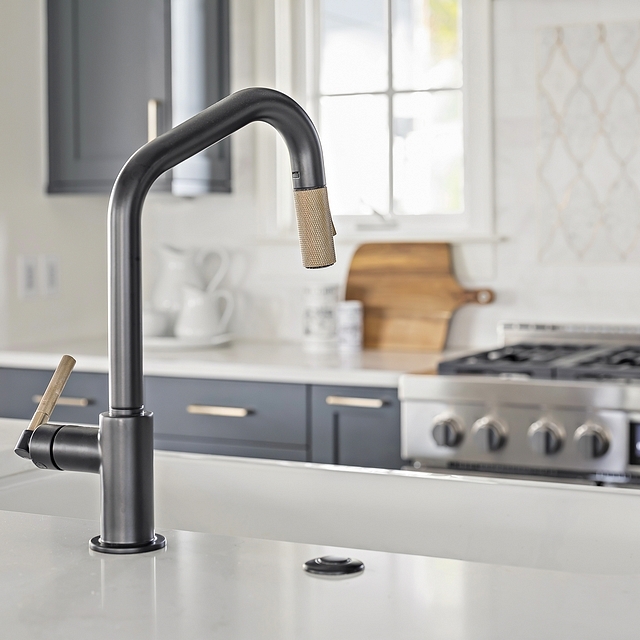 The faucet is the Litze pull out spray Square spout and industrial handle from Brizo in the brilliance stainless finish. 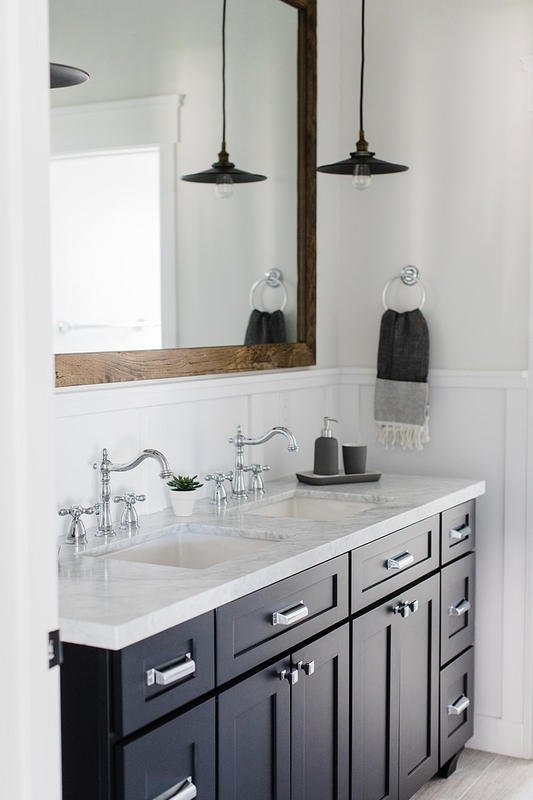 Laundry sink is from Sterling the Latitude 995-0. 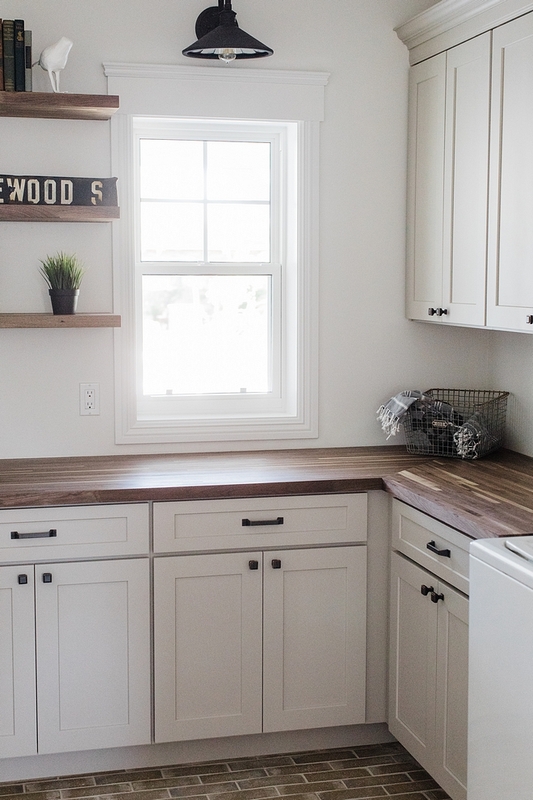 The counter top on the washer and dryer are a wood top in a custom stain. 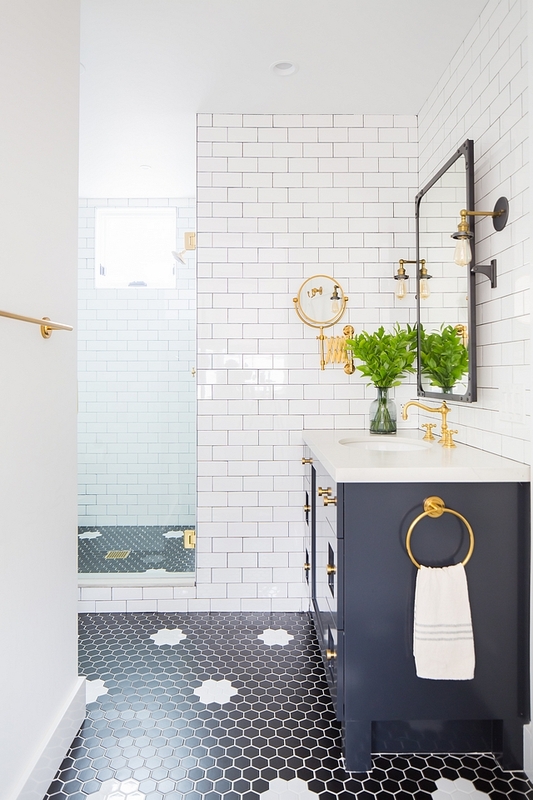 Hardware is by Atlas and is the Bradbury pull in their black finish. 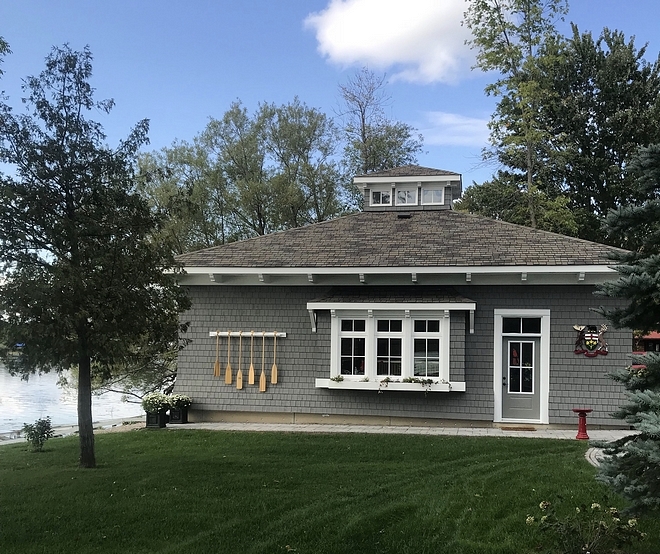 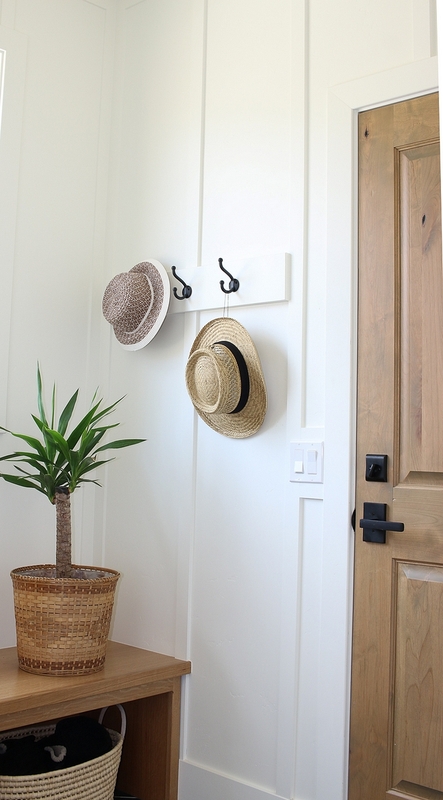 Beadboard Drying Rack – Ballard Designs – similar here & here. 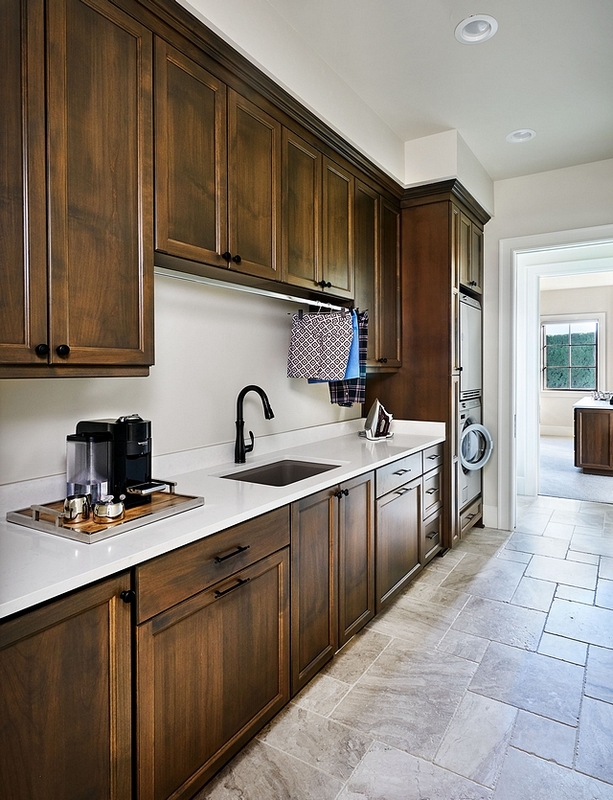 The folding area counter top is Caeserstone Pebble (4030) in a honed finish. 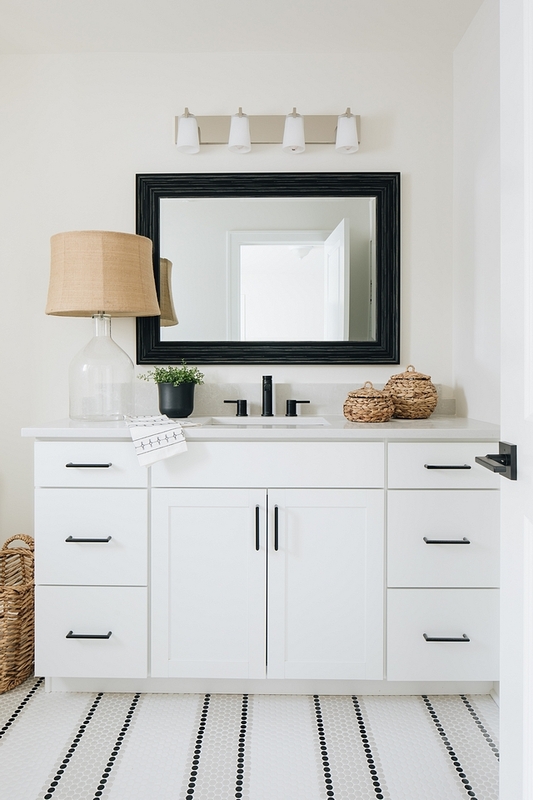 Laundry Basket – Steele Divided Canvas Sorter- Crate & Barrel – also available here. 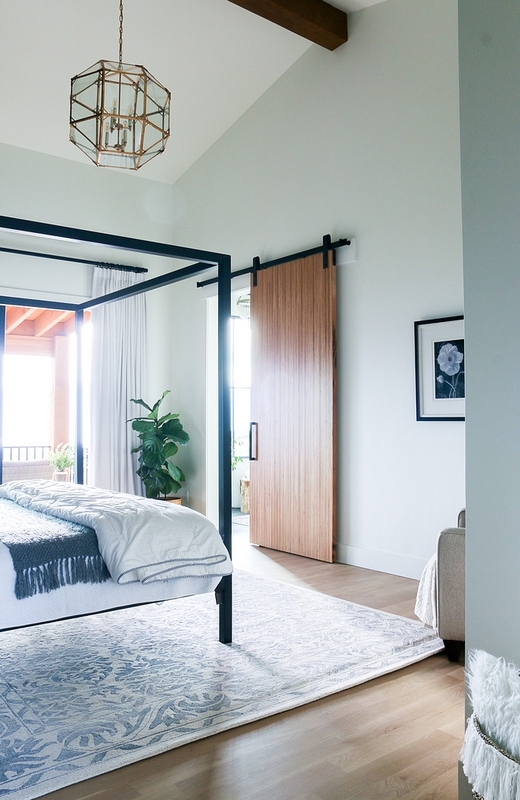 Aren’t these designers just amazing? 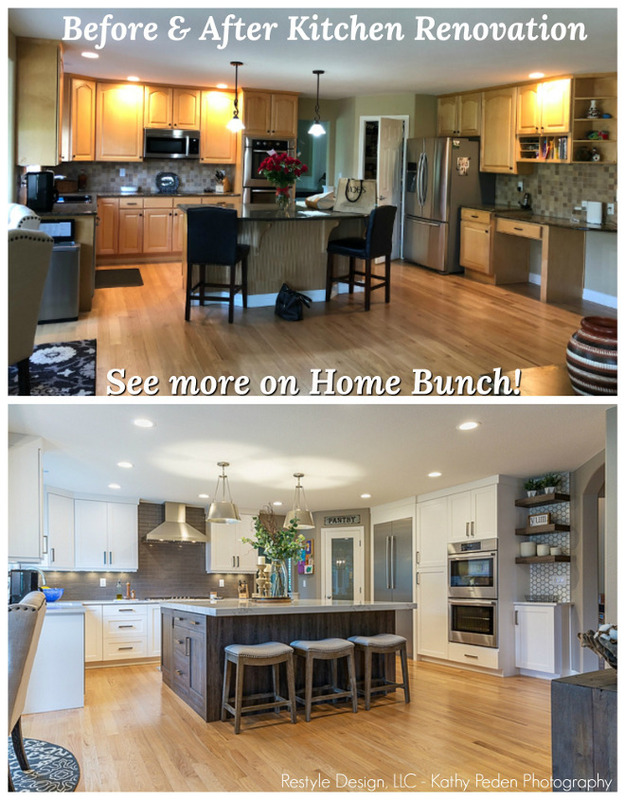 Besides being very talented (yes, you should hire them! 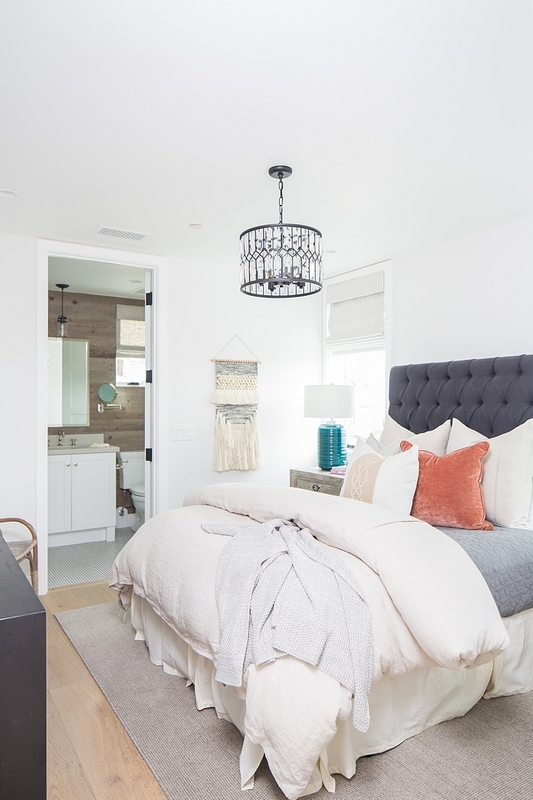 ), they were kind enough to share all details, so you can not only feel inspired but also, guided. 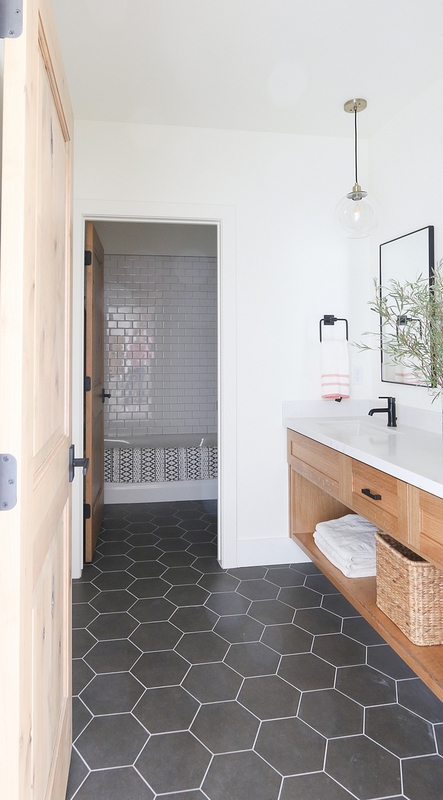 Runners: here, here, here & here – similar. 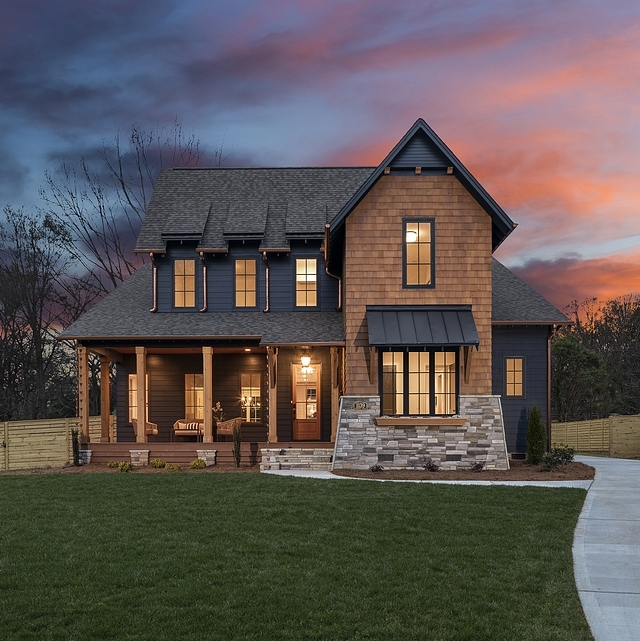 Isn’t this home perfect?! 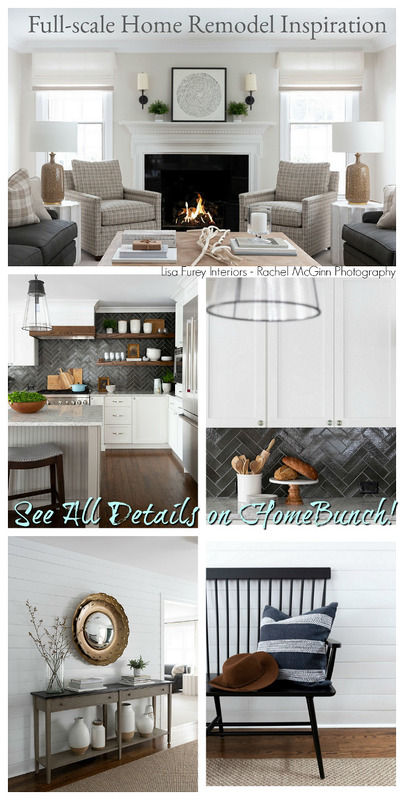 I am truly in love with every single details and I couldn’t wait to share it with you guys! 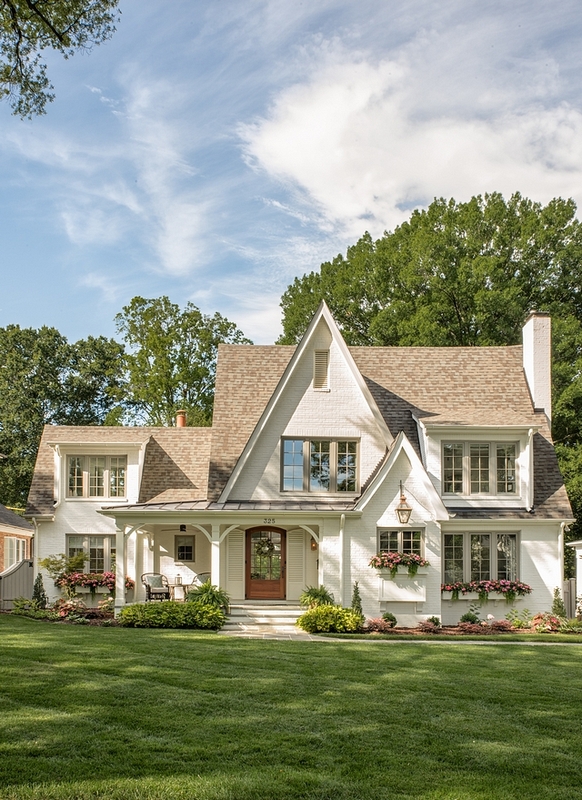 This is my dream home!!! 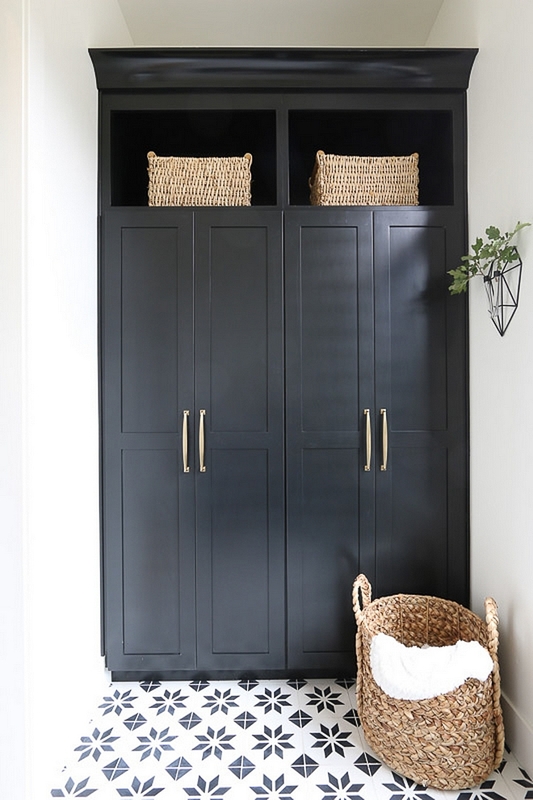 Mudroom cabinet paint color is Duron 8683 Tinderbox and the walls are Benjamin Moore OC-45 Swiss Coffee. 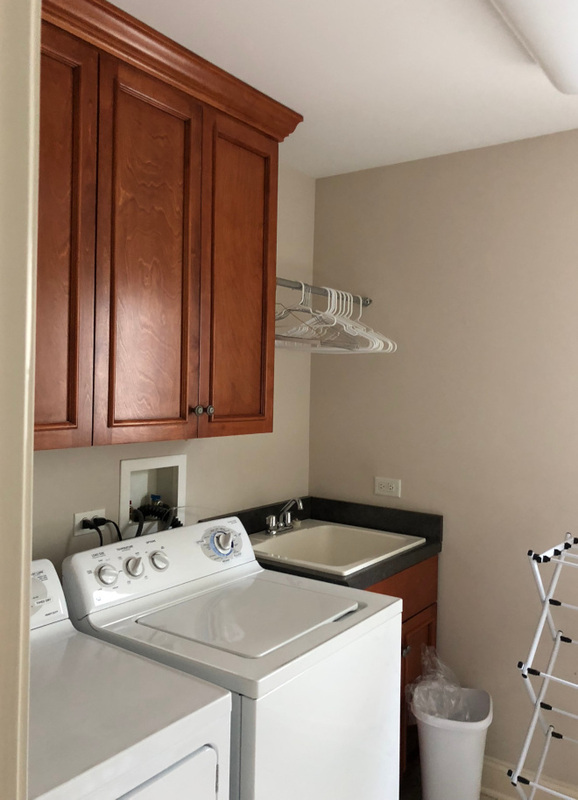 Notice the laundry room on the right. 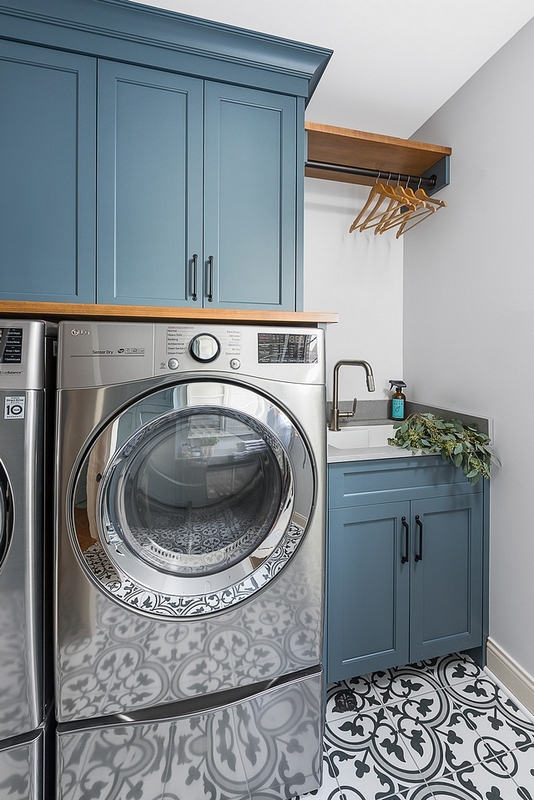 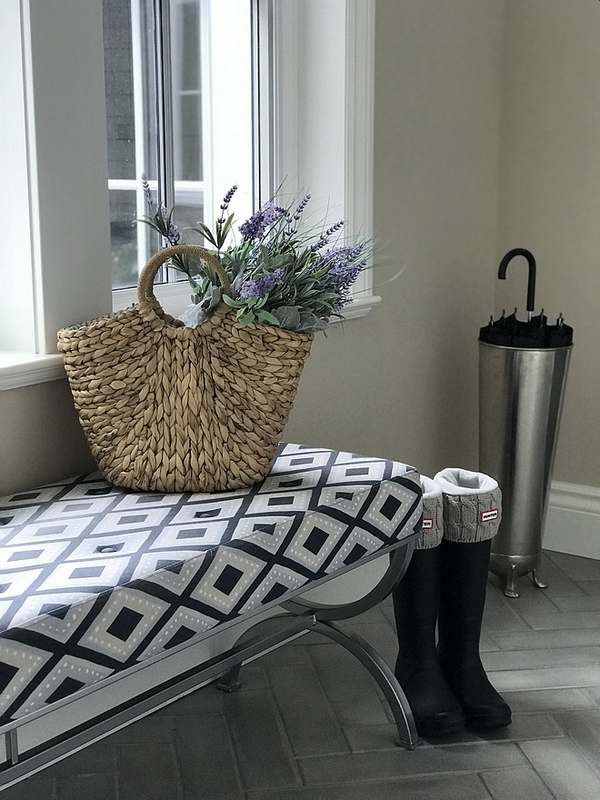 Having a laundry room just off the mudroom is extremely convenient to clean muddy boots, etc… and yes, add a sink to your laundry room! 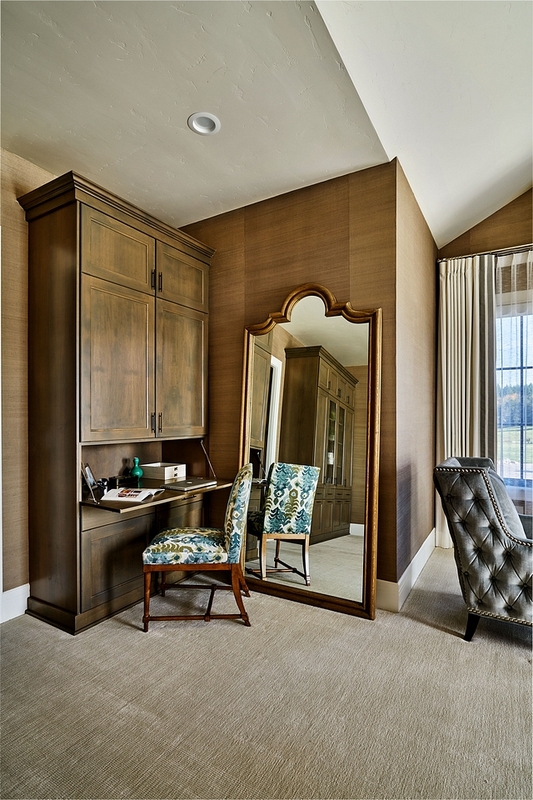 “Sometimes you meet clients and you know you’re going to have more fun than normal. 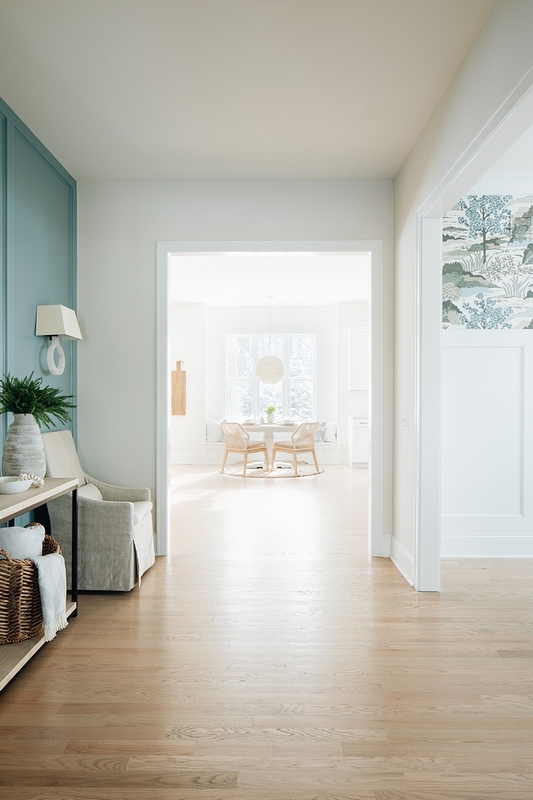 We know building a home is a very stressful point in our client’s life…but it has some added stress when it involves bull-dozing a parent’s home to make way for the new one. 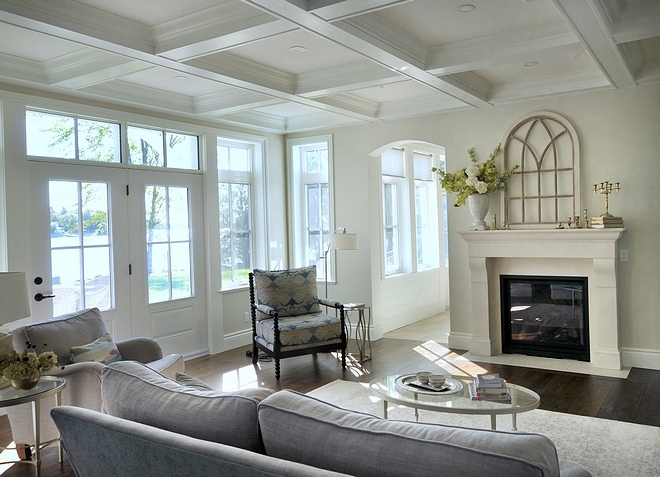 We were the home designer and interior designer for this project completing all the design for the build. 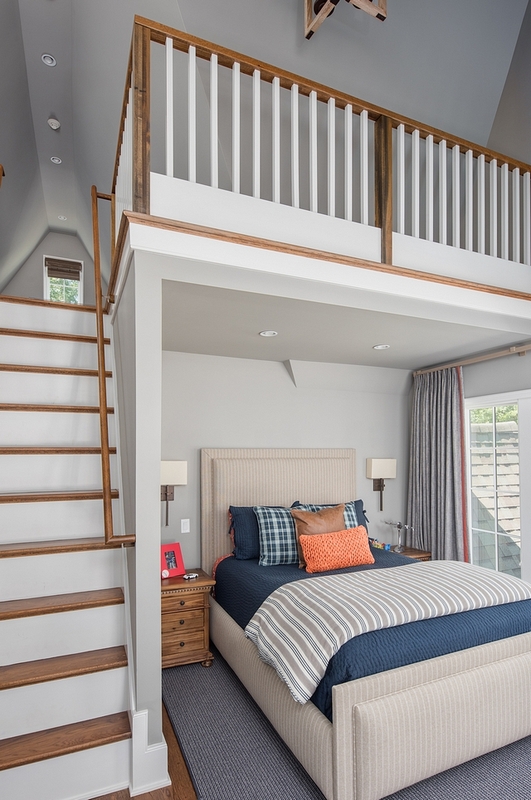 Our clients have great trust in us to design the house for their blended family of five children. 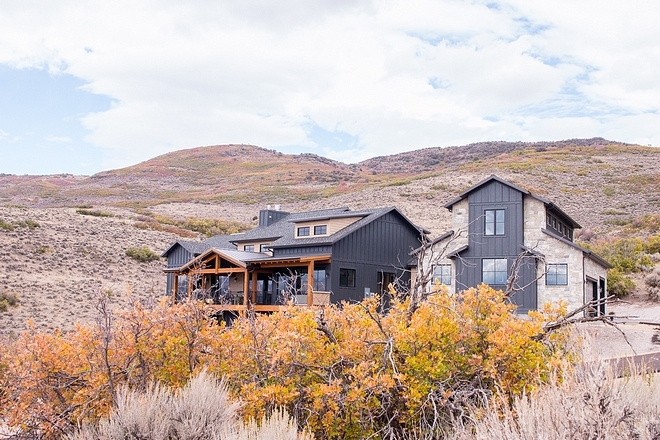 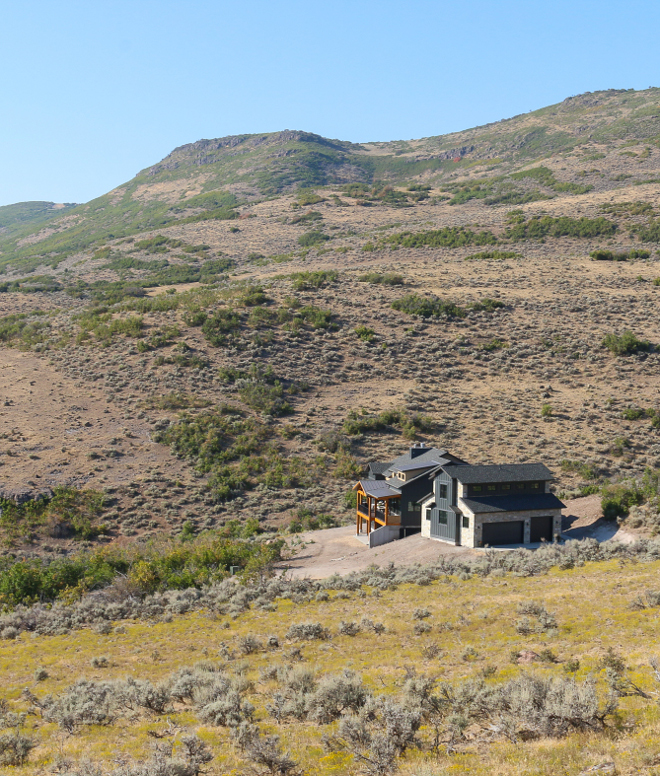 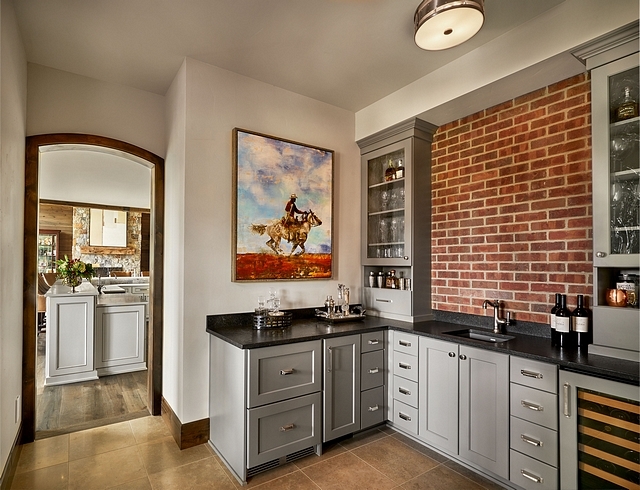 The 8,500 sq ft home sits on 40 acres and an equestrian farm. 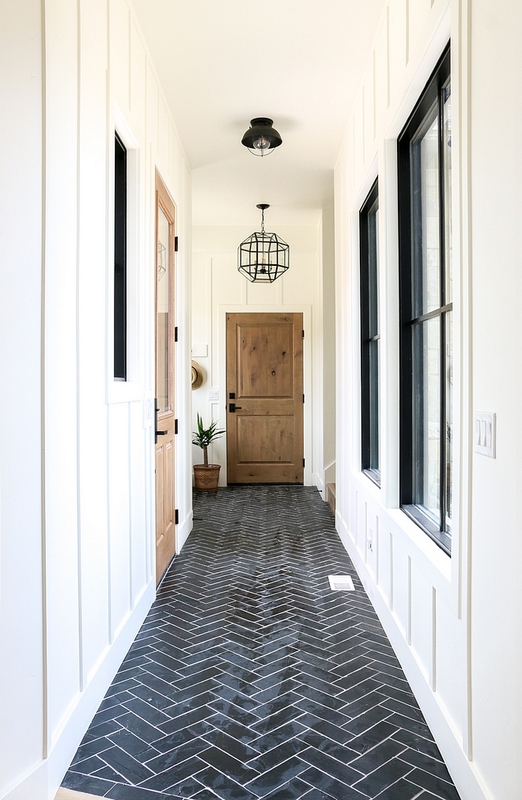 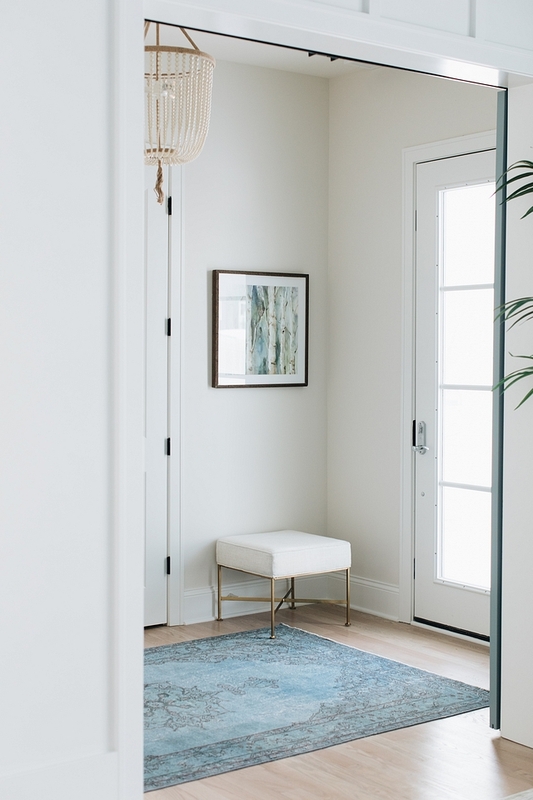 Foyer Flooring: – Accent Band: 8×16 Limestone, Nova Blue (in herringbone pattern) – similar here. 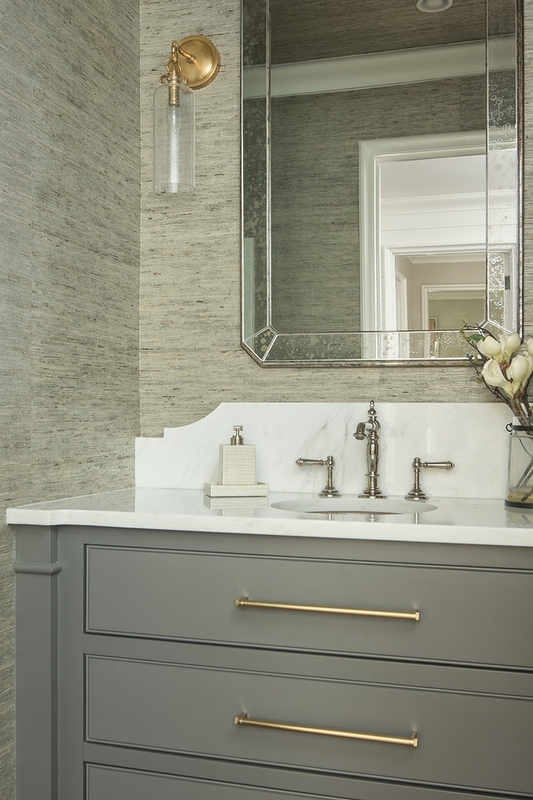 Accent Band: Limestone, Nova Gold. 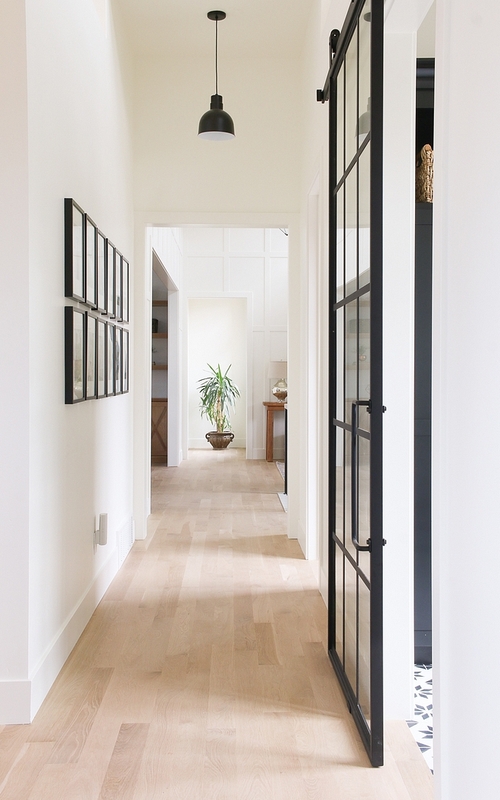 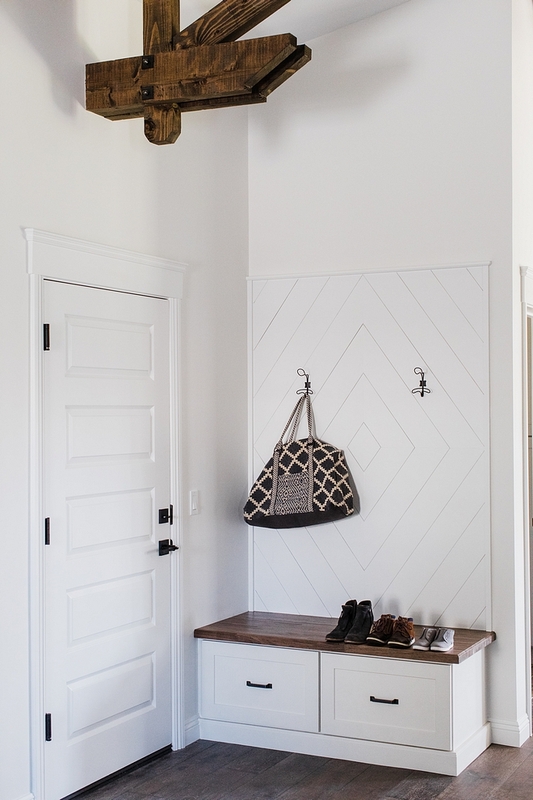 Notice the stunning chevron hardwood flooring on the hallway ahead. 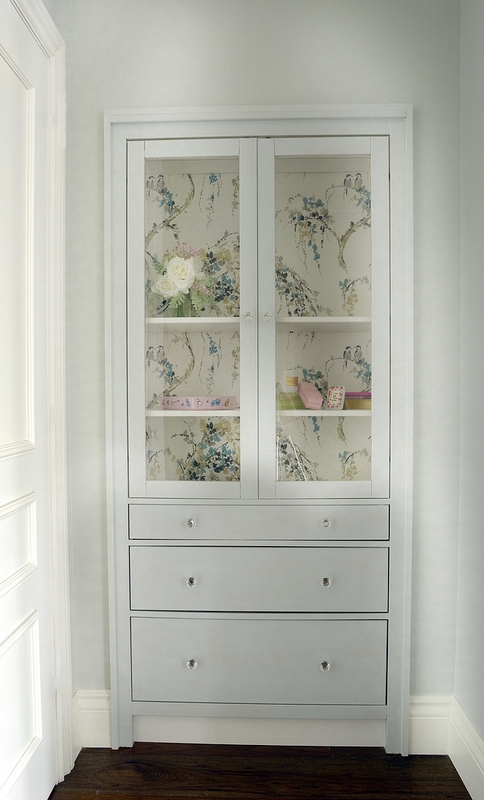 Pantry Cabinet: Benjamin Moore Chantilly Lace in Satin Finish. 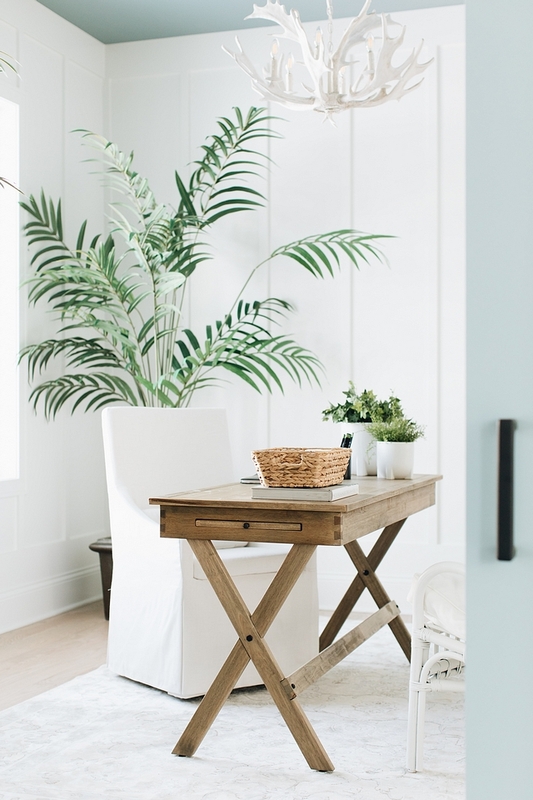 Hardware: RH – 4″ pulls – smilar here. 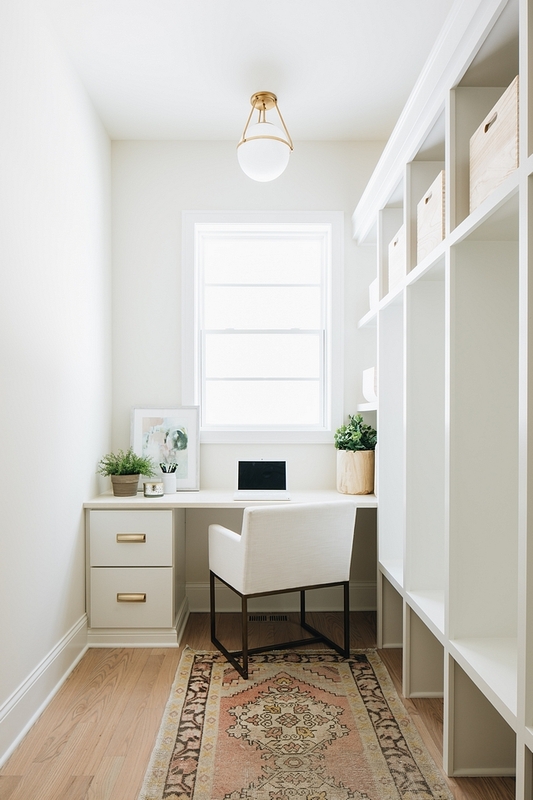 Desk is custom designed. 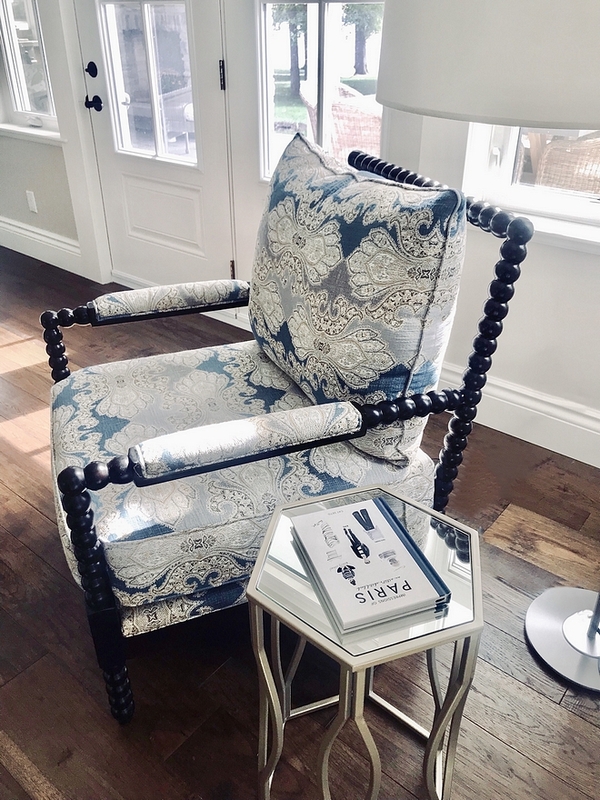 Desk chair is Vanguard. 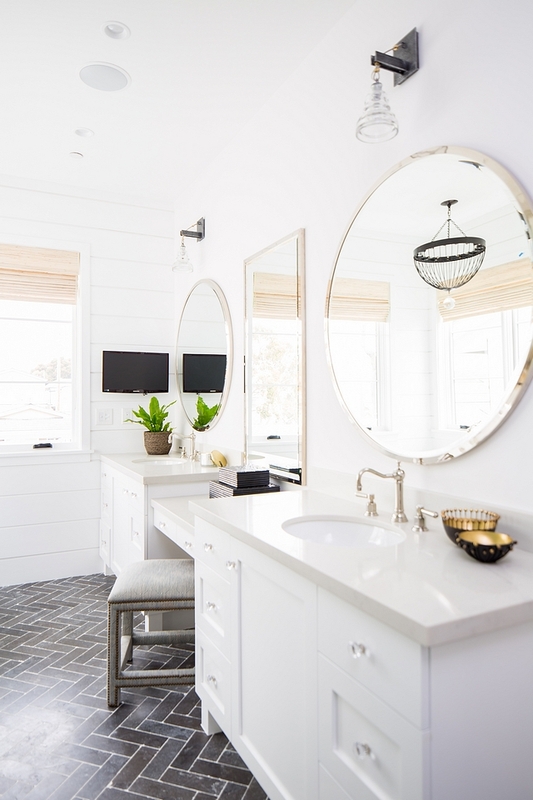 Mirror: RH – Other Beautiful Floor Mirros: here & here. 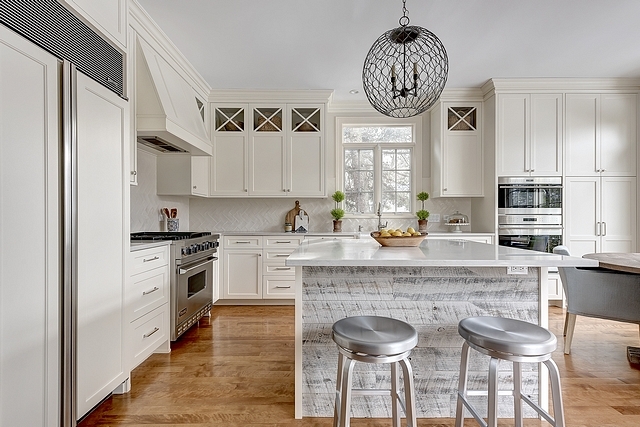 Backsplash: Ann Sacks, Petite Alliance 1, Calacatta, Lagos and Laforet Antique Oak. 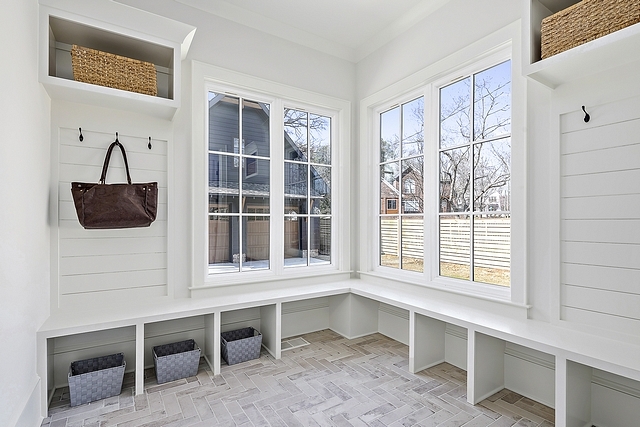 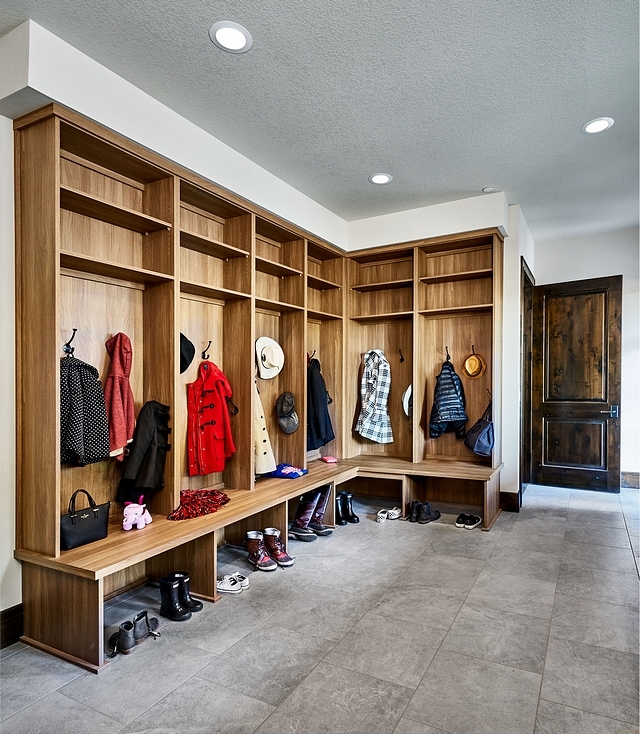 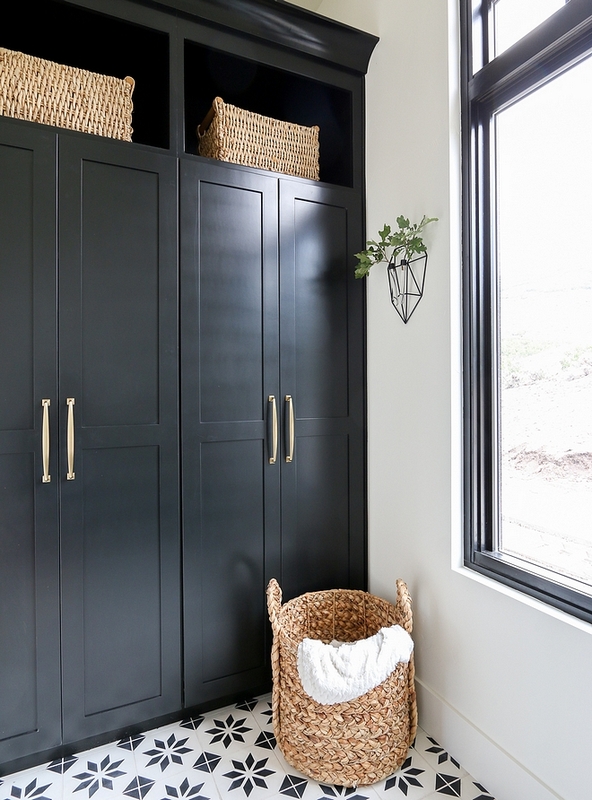 You will find plenty of room for all of the family members and guests in this mudroom! 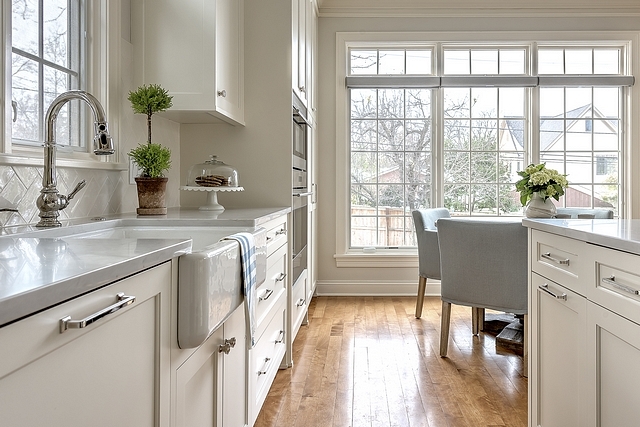 Beuatiful Kitchen Runners: here, here, here, here & here. 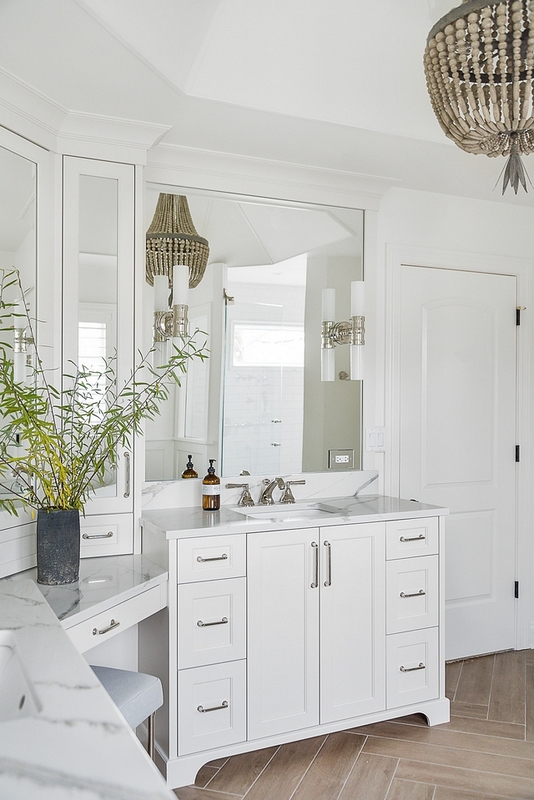 Bathroom Mirrors: Restoration Hardware, Bistro Mirror + Bistro Round Mirror in Polished Nickel. 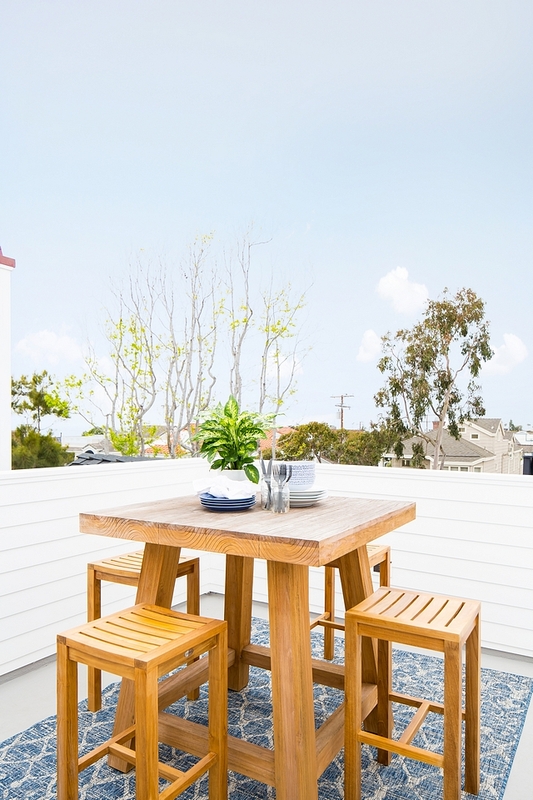 Rooftops are almost mandatory in California, especially if you live close to the beach. 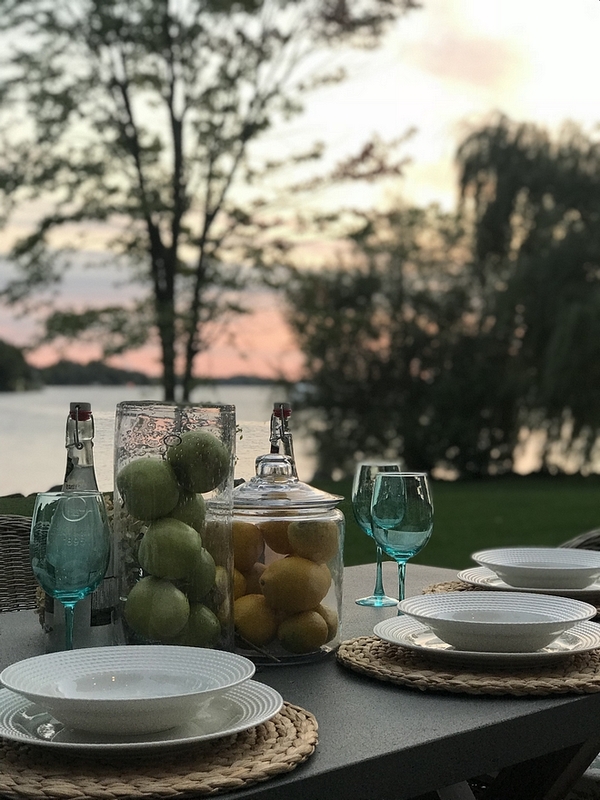 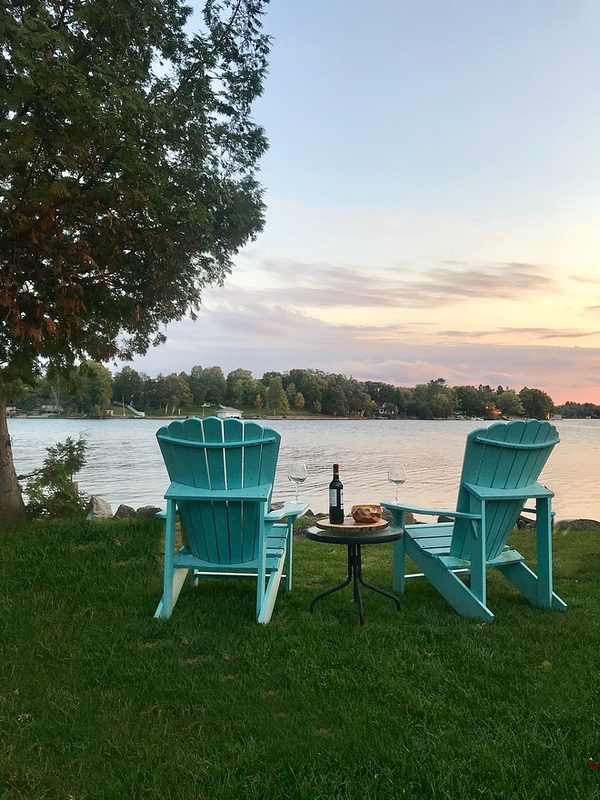 Is there anything better than dining al fresco with our loved ones? 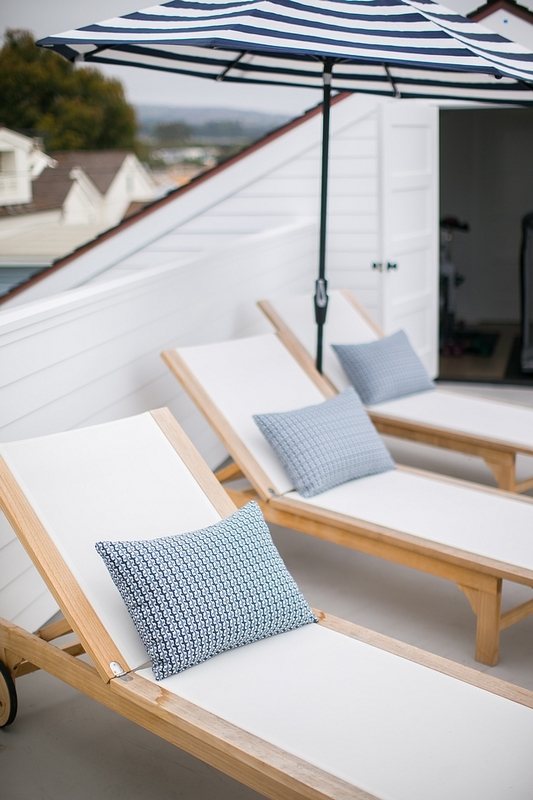 I can’t wait for summer!!! 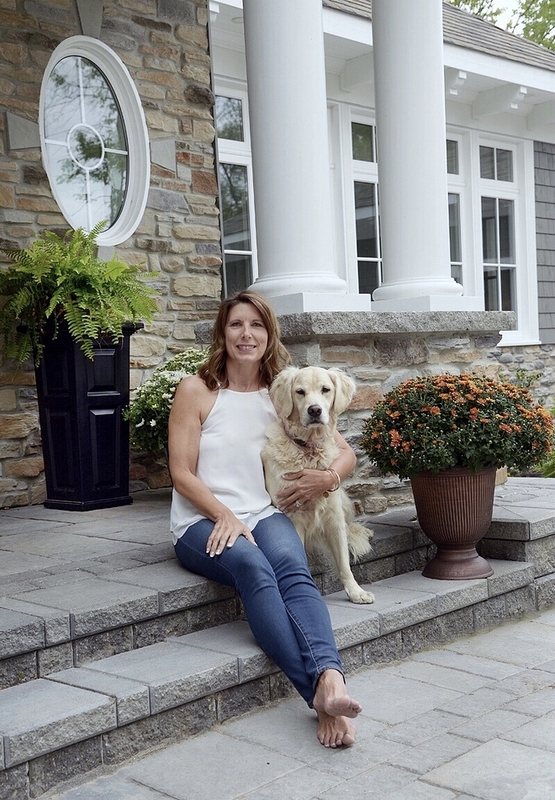 This is Pamela and her beautiful Golden Retriever. 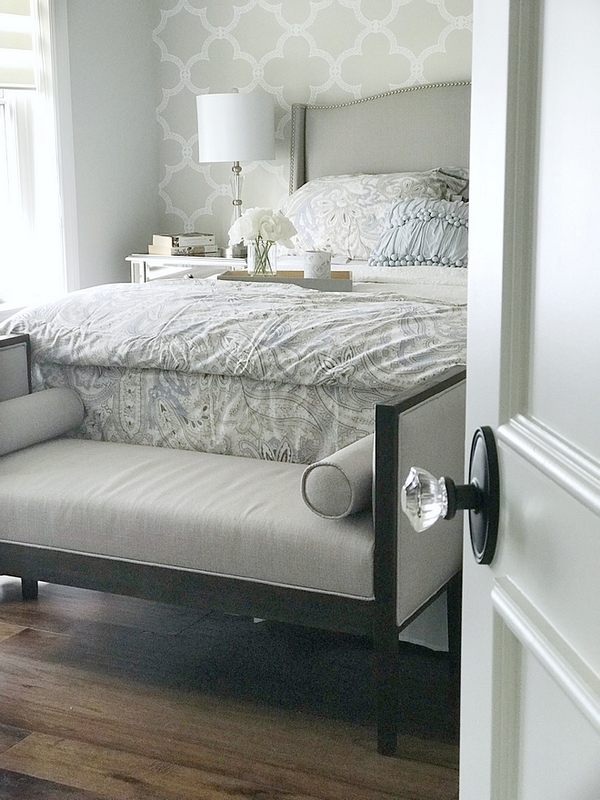 Pamela is a wonderful person and I am so happy to have her on the blog today! 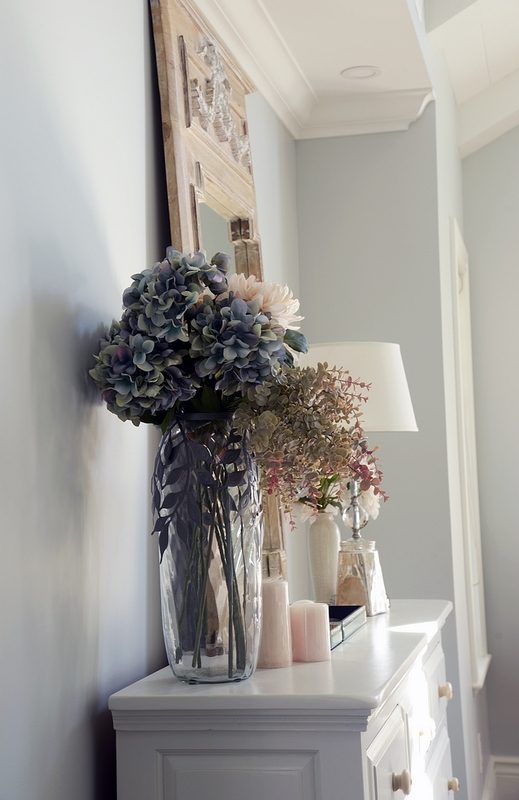 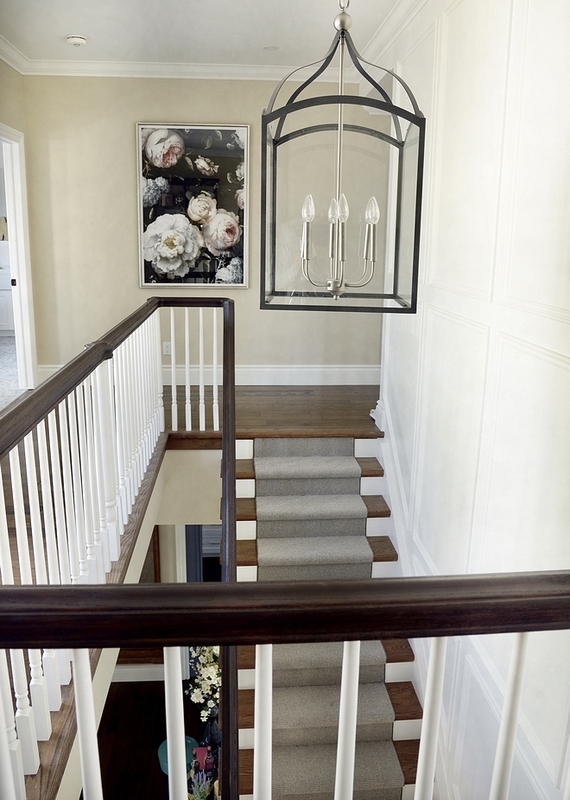 Wall colour: Benjamin Moore OC 11 Clay Beige – Keep this beautiful neutral paint color in mind for future reference! 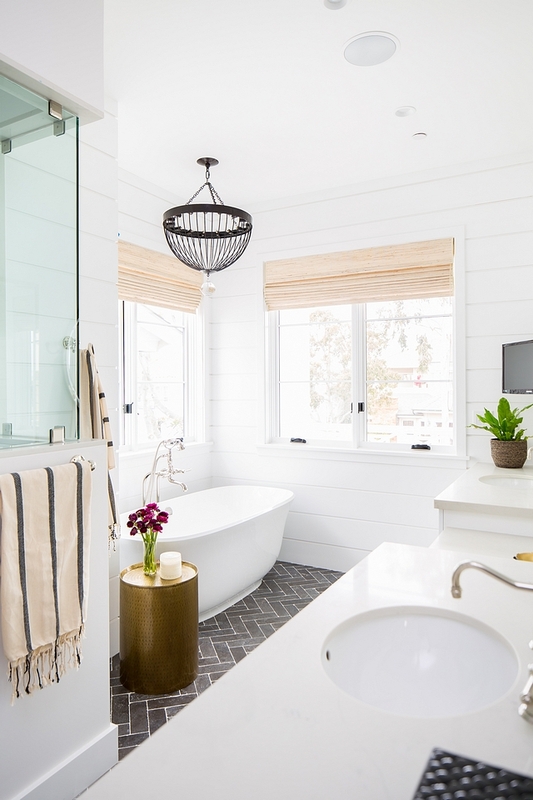 This one deserves a pin! 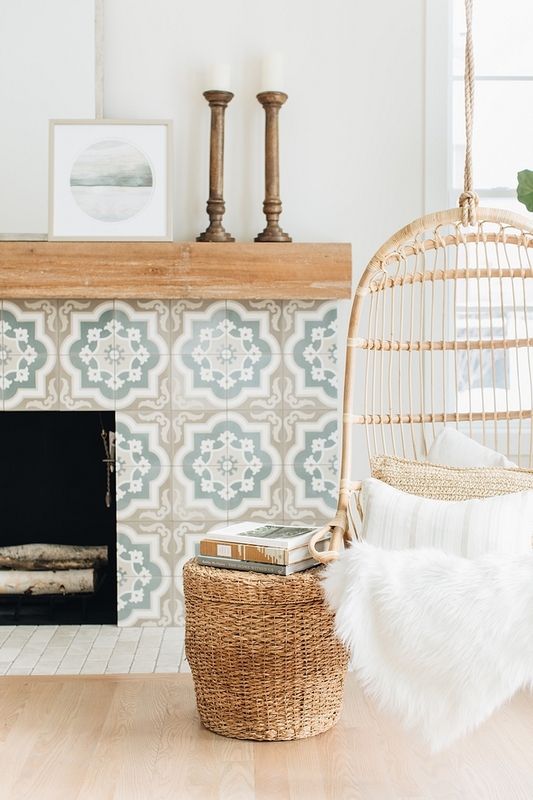 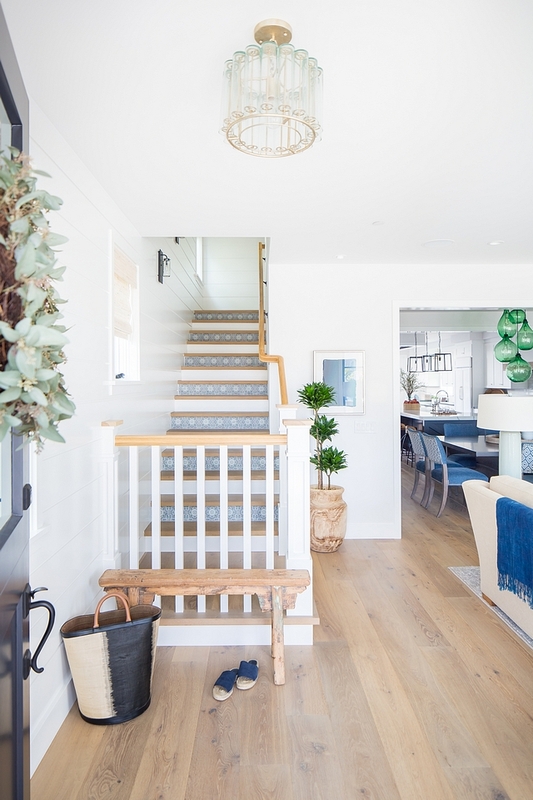 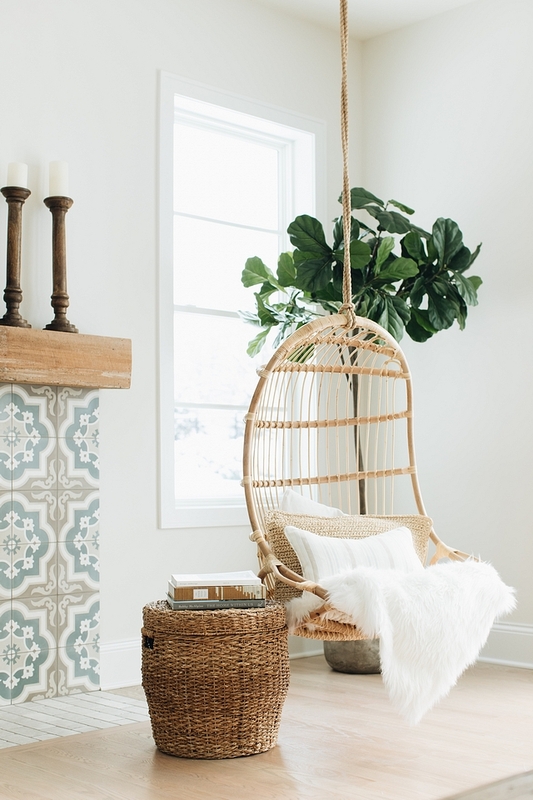 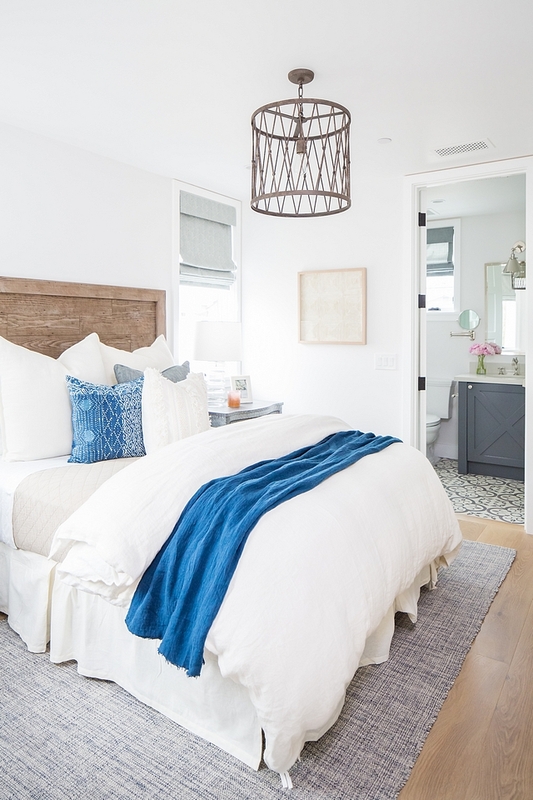 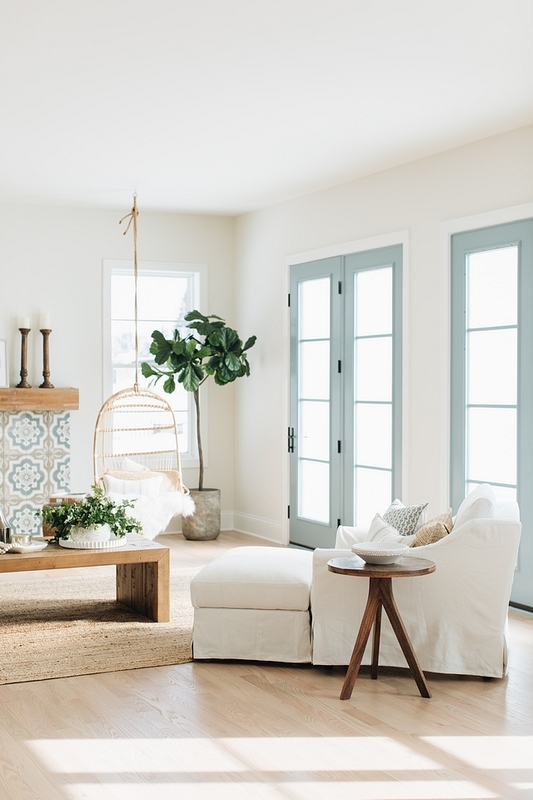 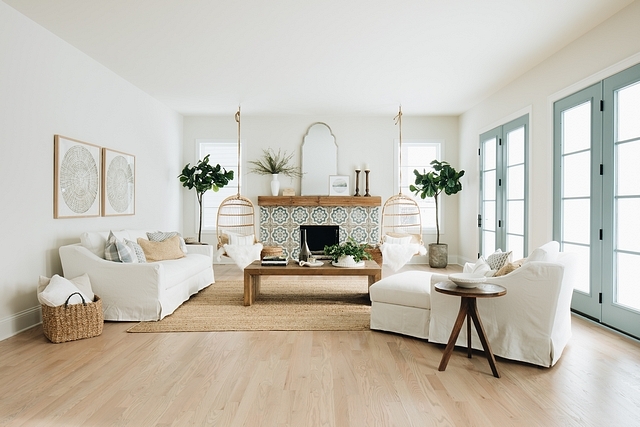 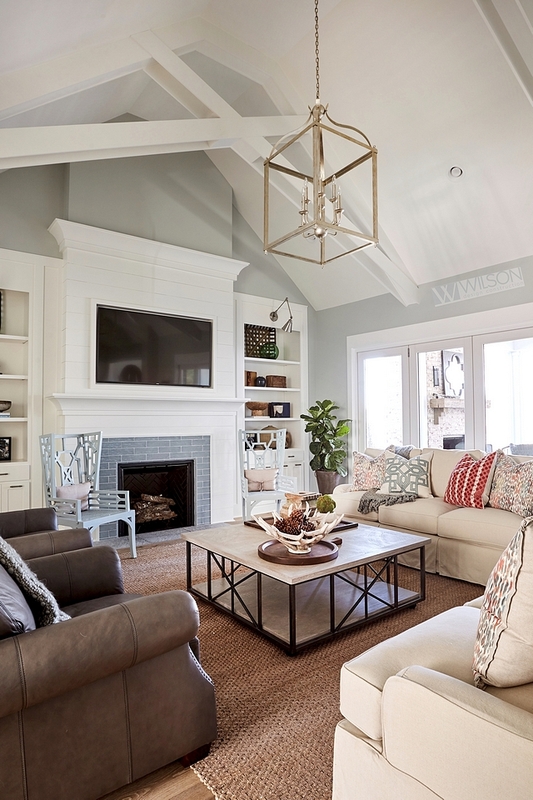 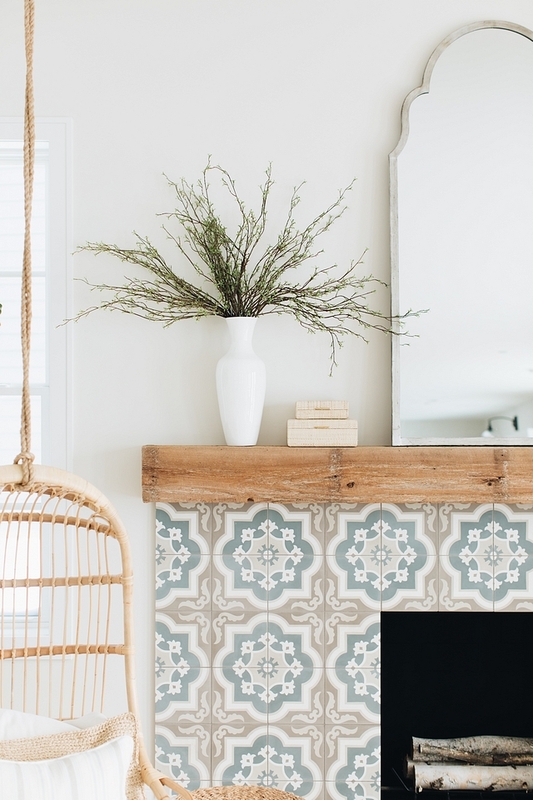 Find a comfy spot, pin your favorite farmhouse coastal interior ideas and get inspired to get your home ready for spring! 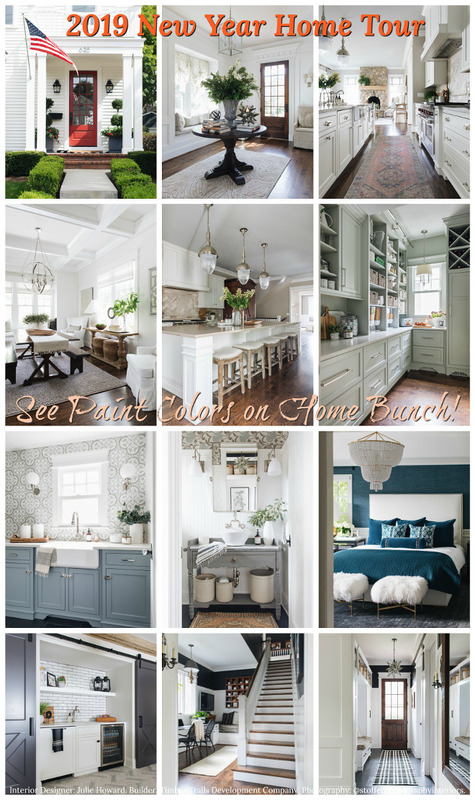 Think happy colors! 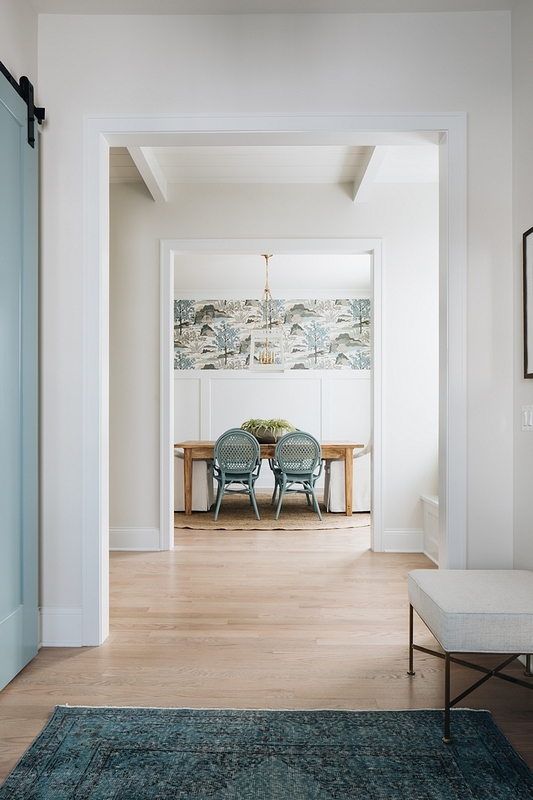 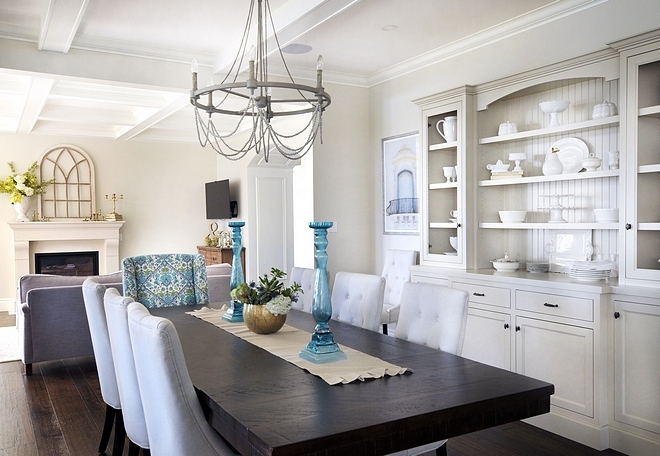 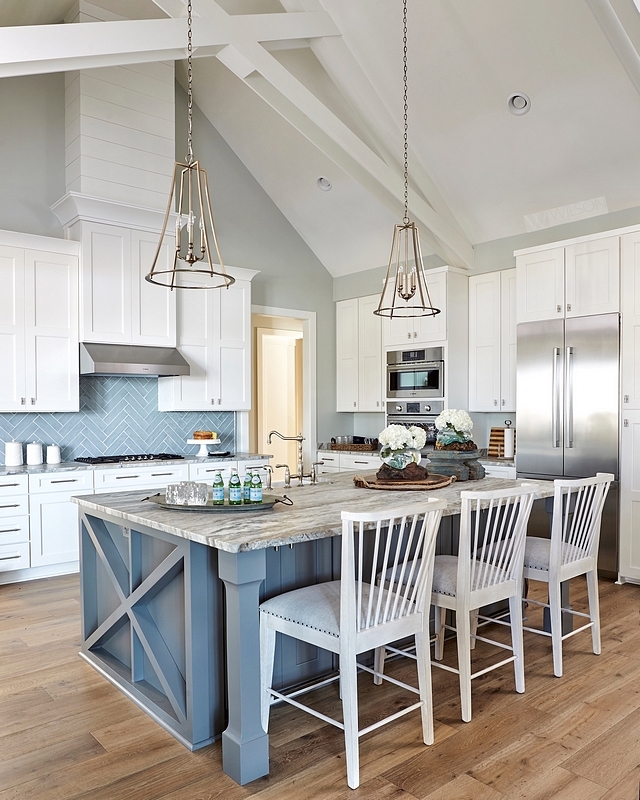 Pendant over table – Ballard Design – similar here & herehere. 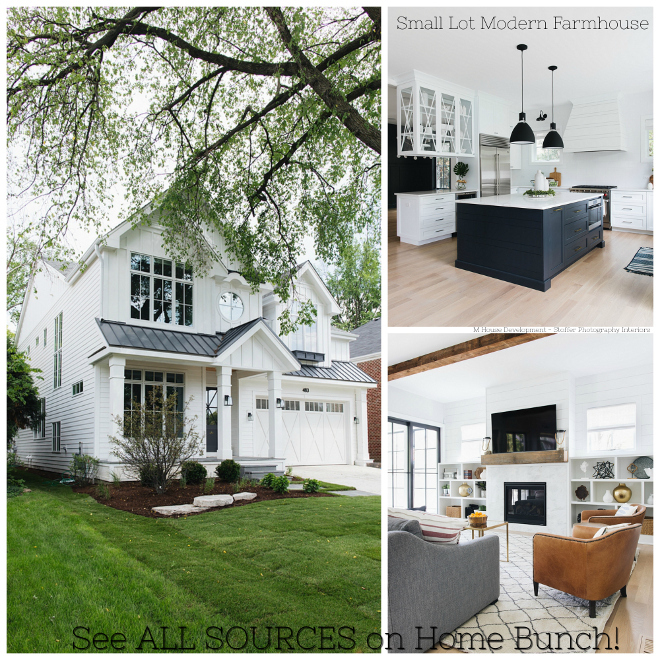 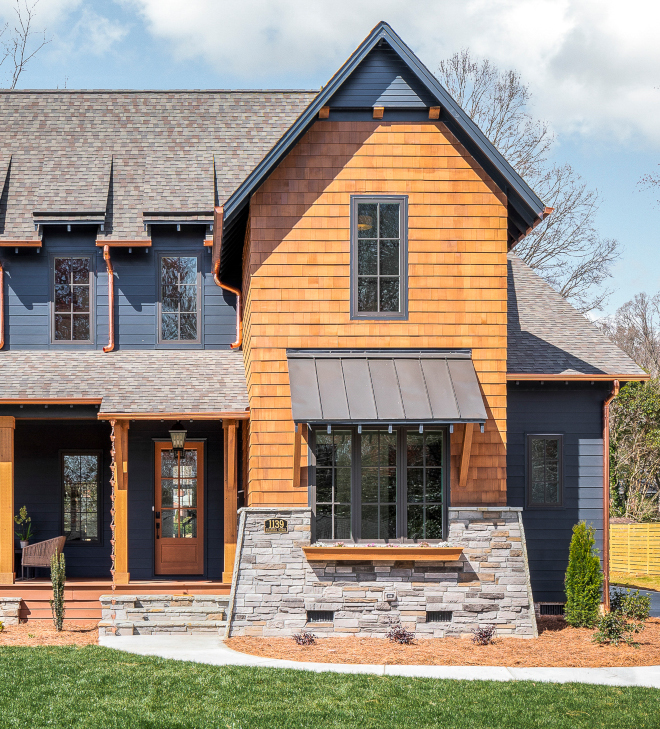 This rustic modern farmhouse was designed and built in 2017 by Rafterhouse. 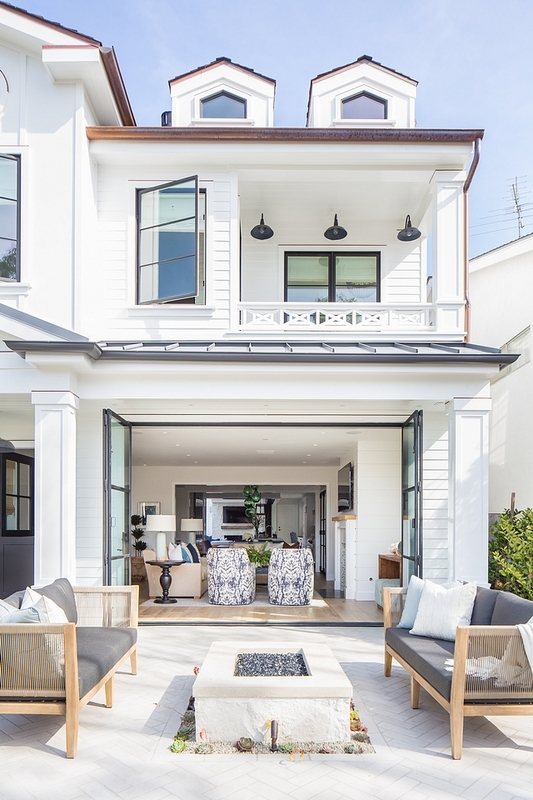 They collaborated with Integrated Design on the architectural inspiration and design of the home. 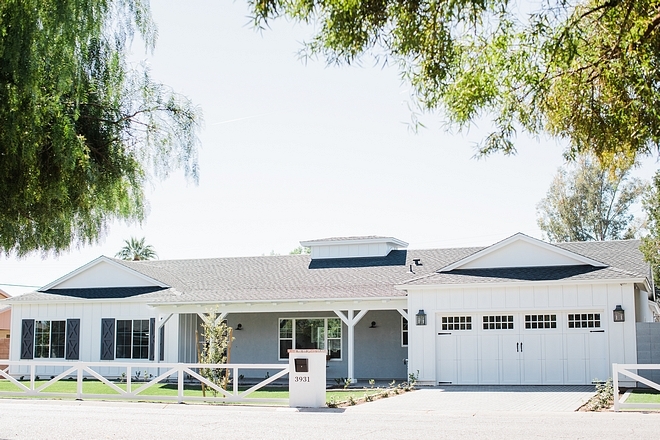 The neighborhood is comprised of modest 1950’s range homes so their concept centered on recreating a modern version of the post war ranch home. 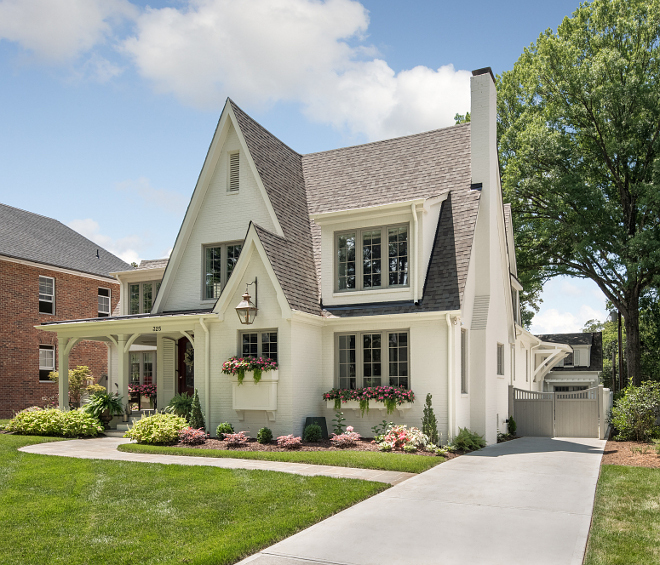 The home stayed modest in its proportions and relation to the neighboring homes, despite offering all the amenities of a present day home. 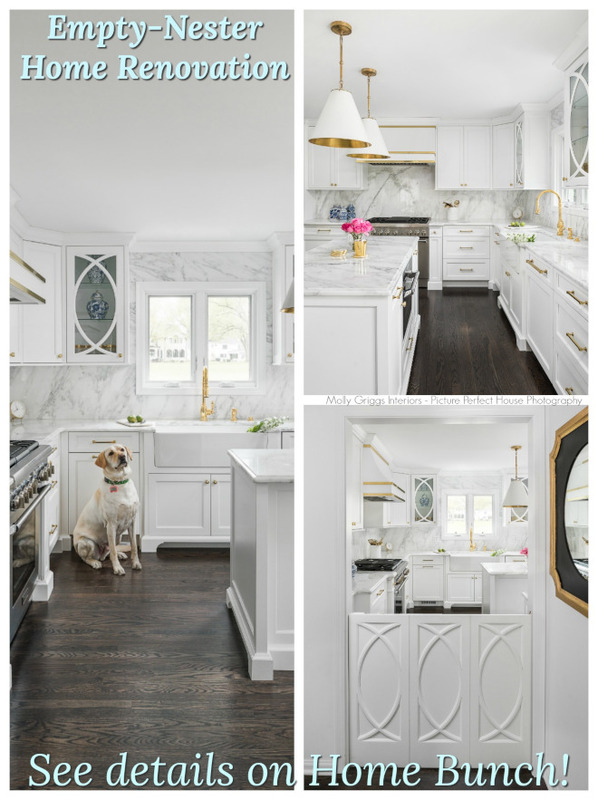 The interior was warmed up with the grey ash cabinetry and an extensive use of warm wood tones while being balanced by the elegance of the many marble surfaces. 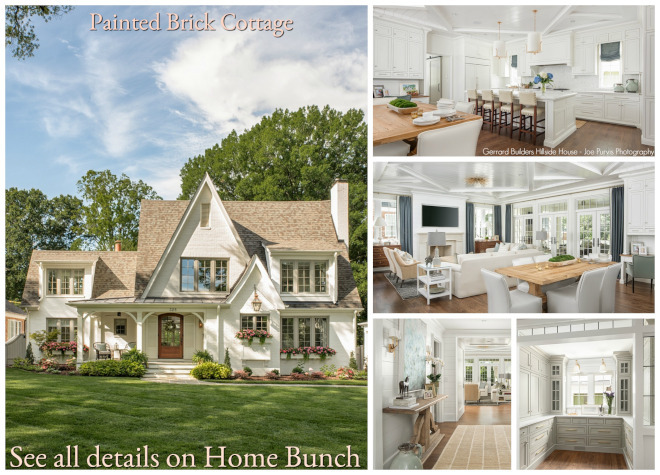 Take notes on all details shared by this talented builder. 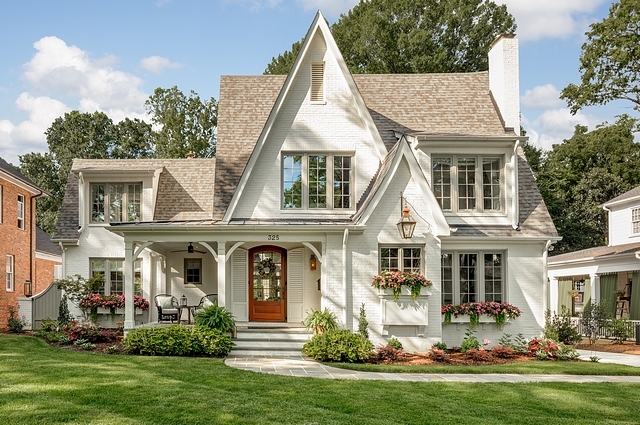 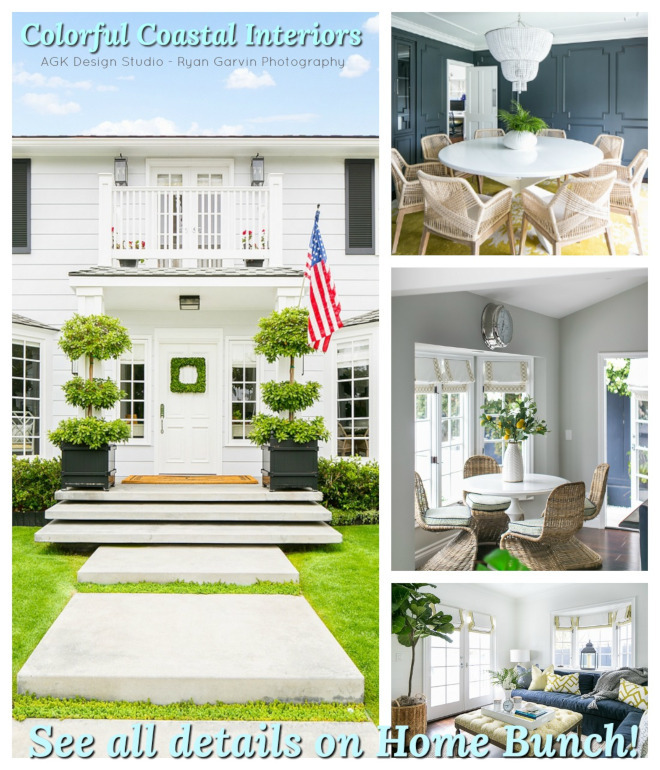 Although not pretentious, this home features an inspiring curb-appeal! 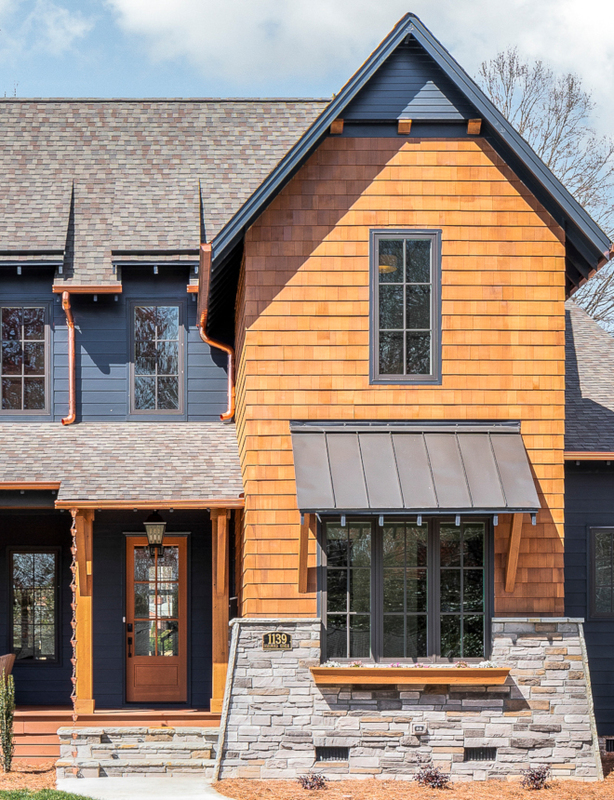 Roof is a standard black asphalt shingle. 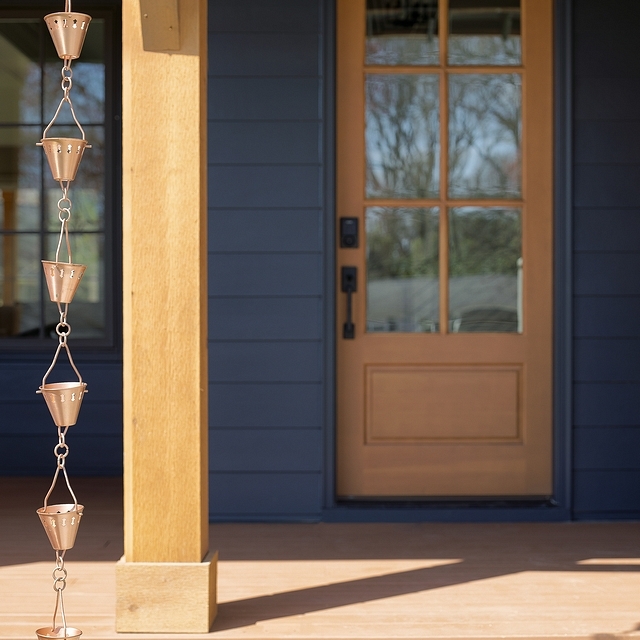 Similar Outdoor Lighting: here, here, here, here, here, here & here. 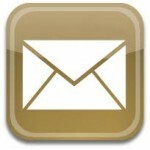 Similar Mailbox: here & here. 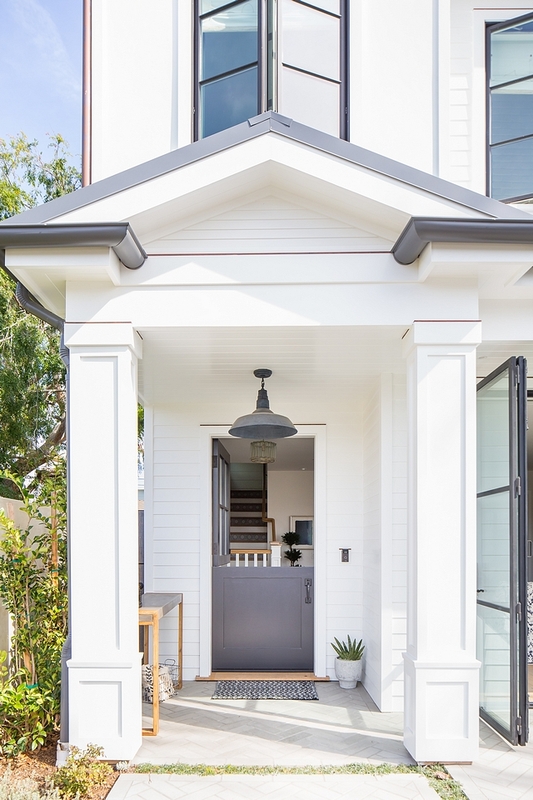 A front porch adds a welcoming feel to this home. 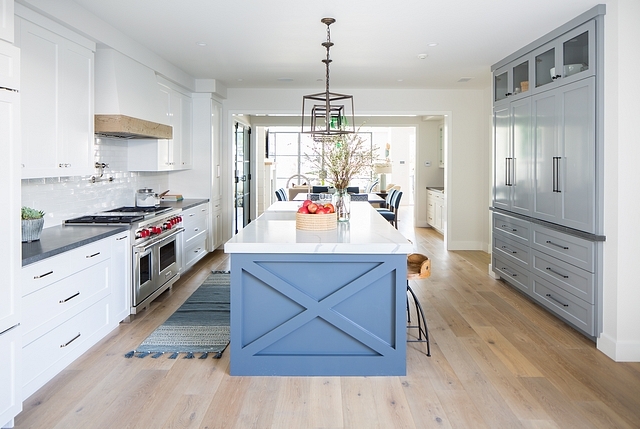 Farmhouse-Inspired Benches: here, here & here. 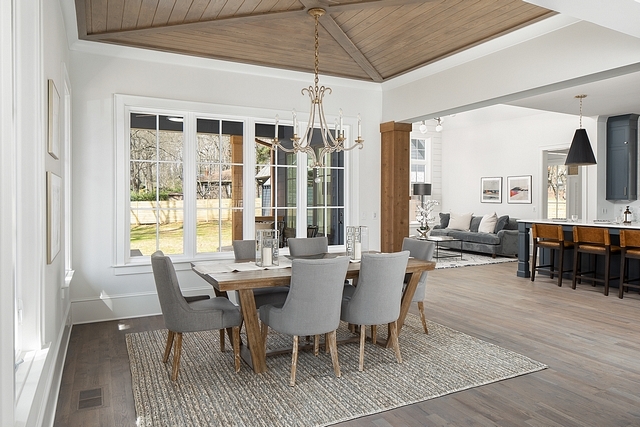 The front door opens to an open-concept kitchen and dining room. 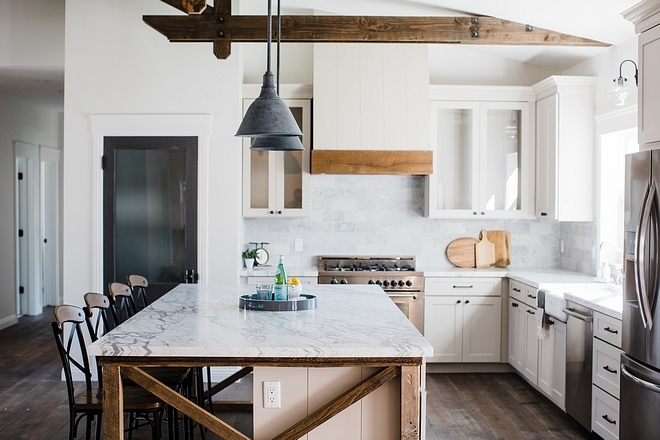 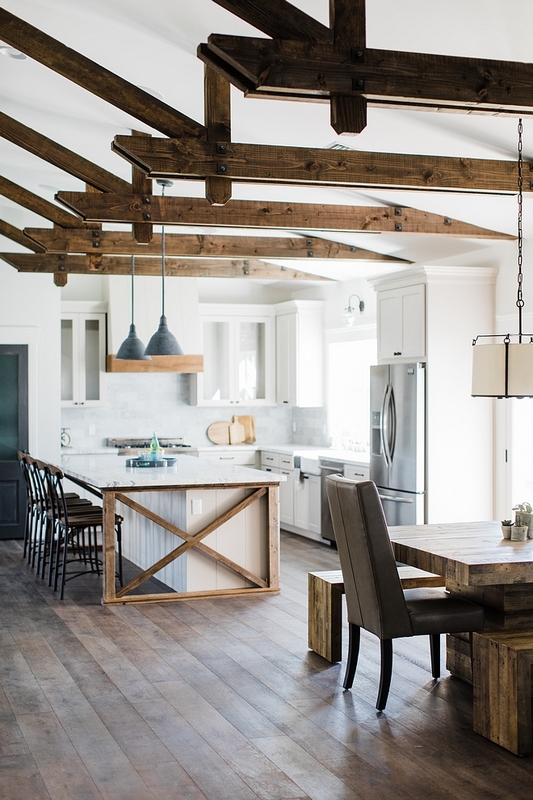 The kitchen has a very rustic farmhouse feel thanks to the ceiling beams and the barnwood island details. 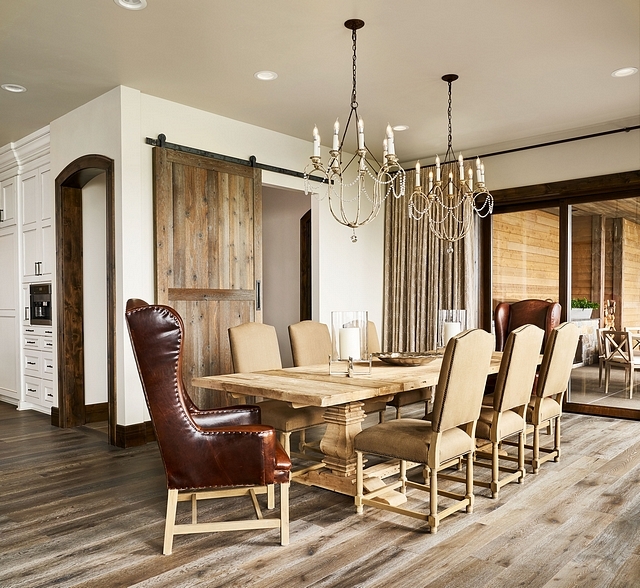 Hardwood is Oak and it was sourced in Scottsdale AZ – similar here, here, here & here. 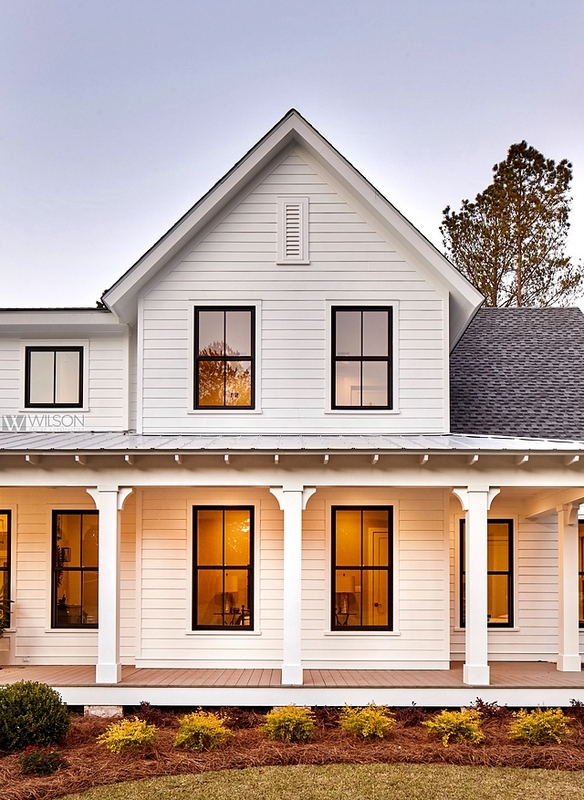 Building or renovating? 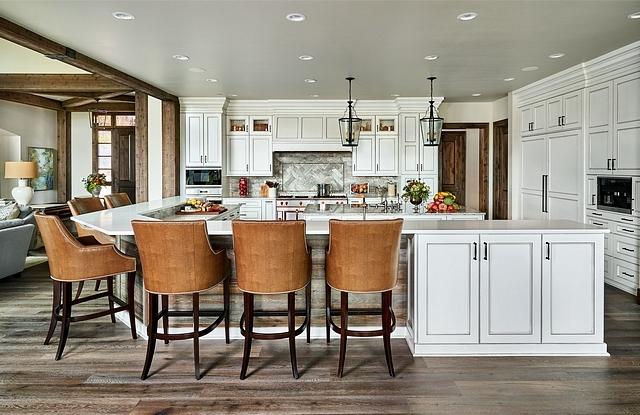 Keep this kitchen layout in mind. 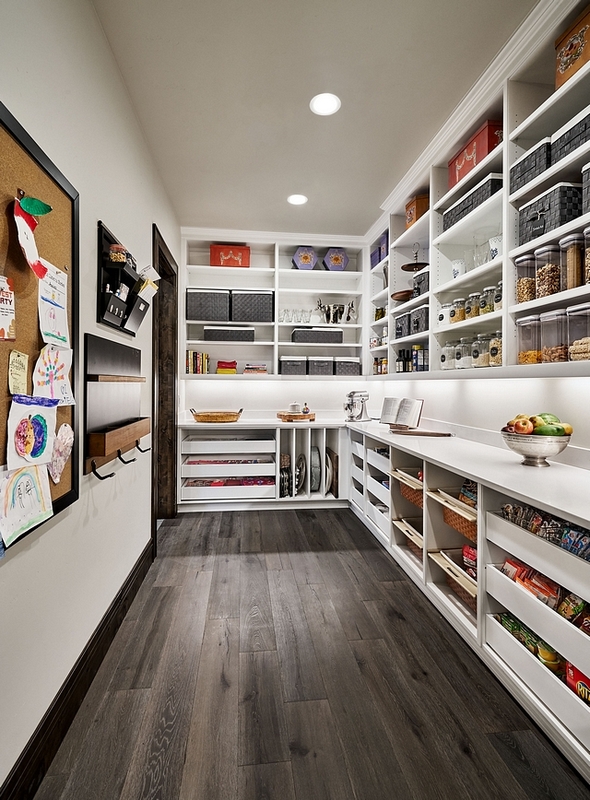 Everything in this space is within reach, including a large walk-in pantry! 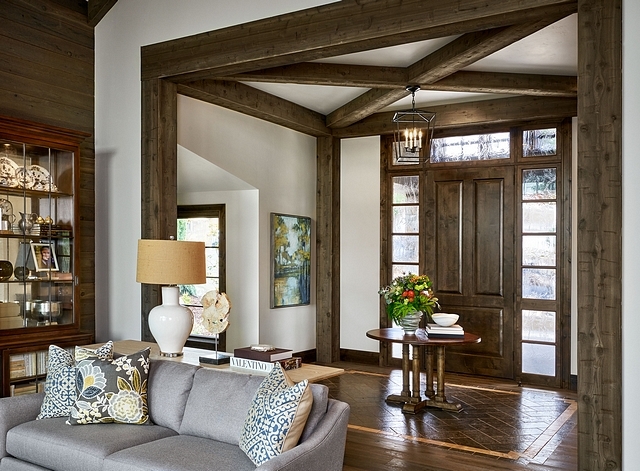 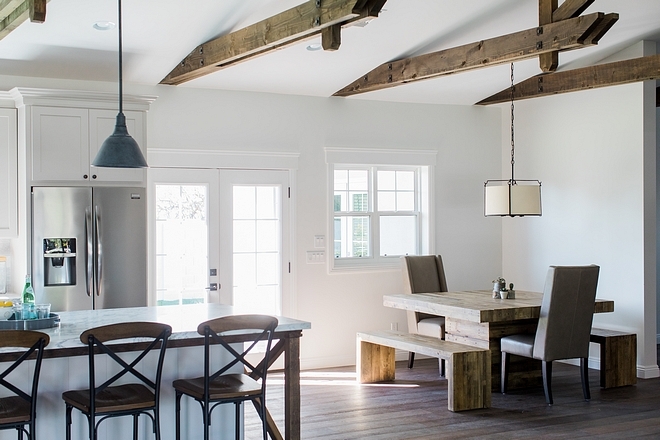 Ceiling Treatment: Exposed decorative beams. 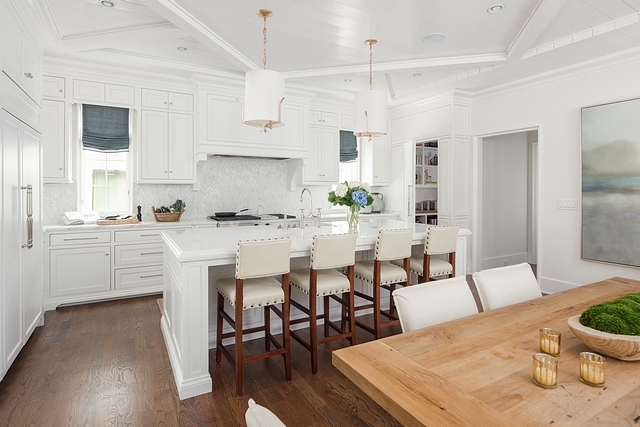 From the builder: One of the memorable details of this home is the custom island we designed and built. 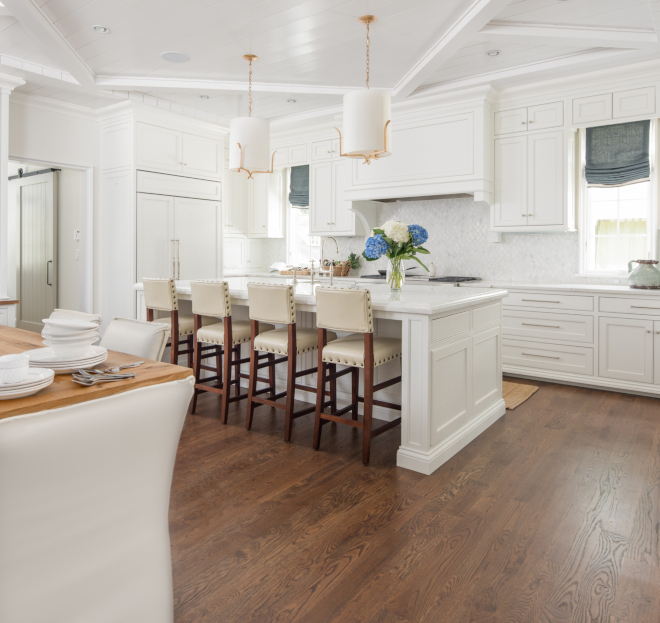 The concept involved taking a semi-custom cabinetry line and building a full custom island around it. 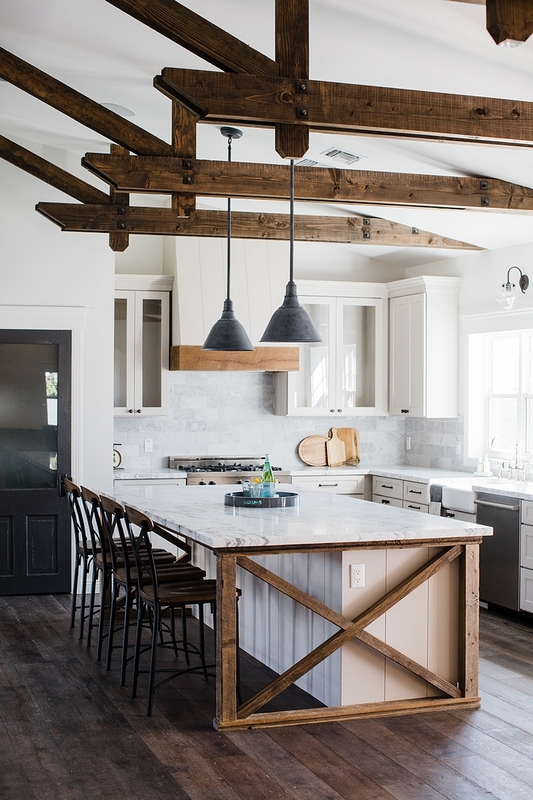 The island ends and underside of the island overhang were skinned in vertical shiplap. 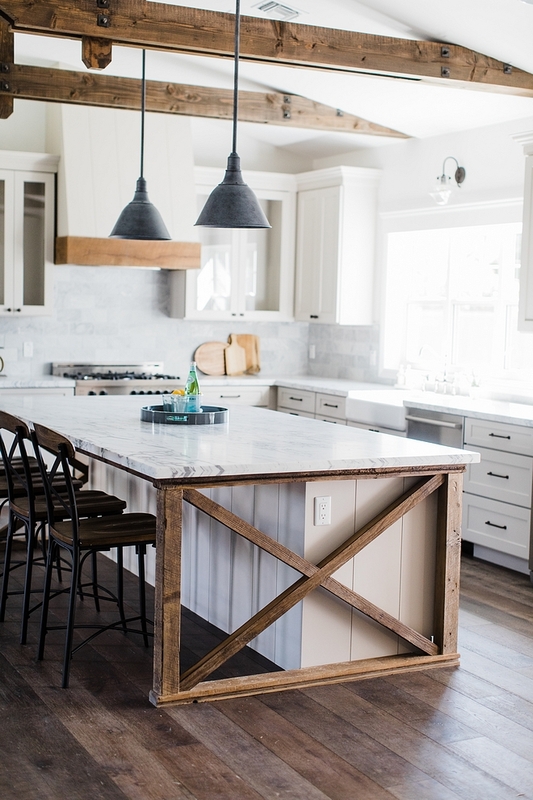 To bring in a contrasting material we added the custom barn wood ‘x’ detail to each end of the island. 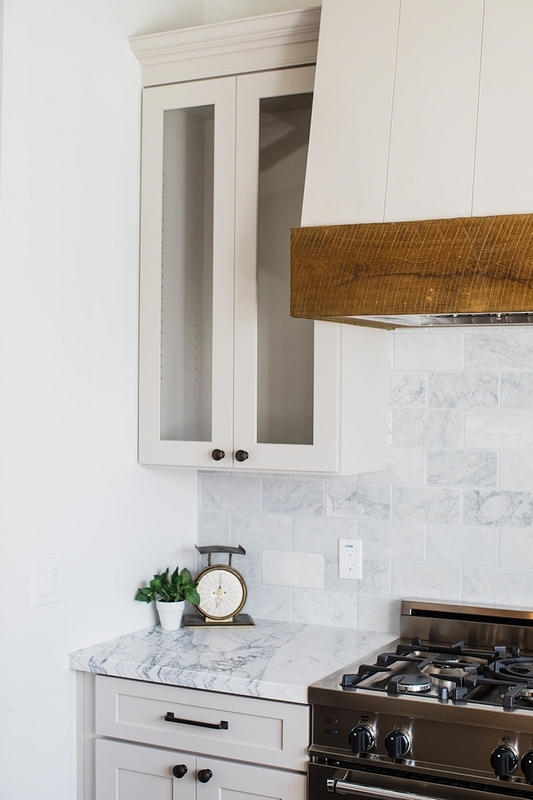 We then used a piece of scrap barn wood to add an apron detail across the front of the range hood to tie to the two kitchen features together. 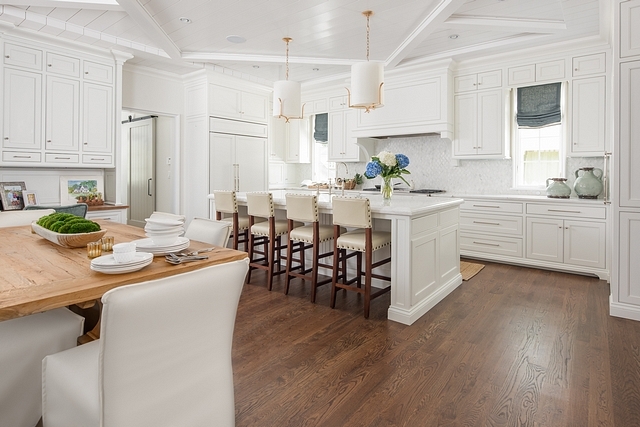 This island is 9’x4’ in size. 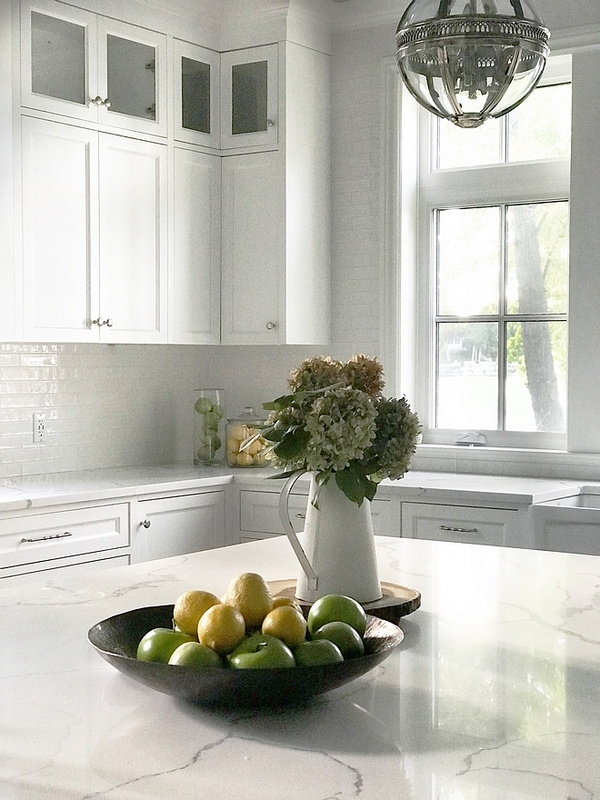 The kitchen countertop is Bianco Venatino Marble, in a honed finish. 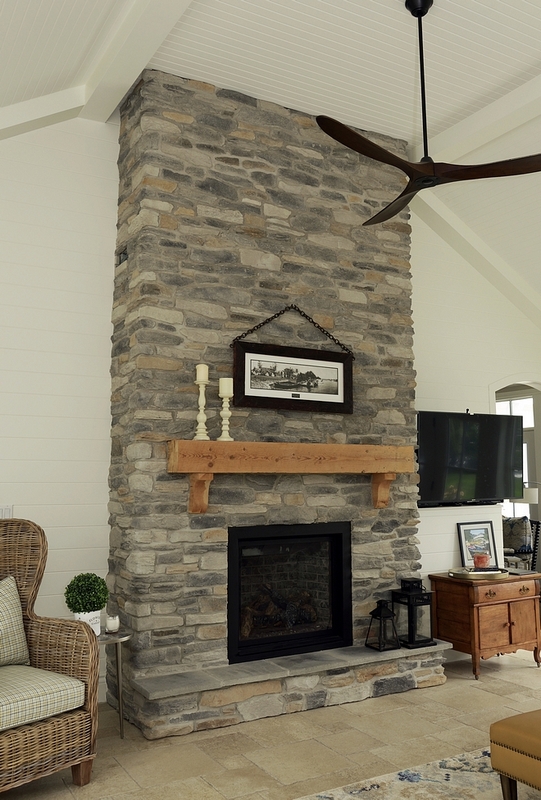 Interior Paint Color: Dunn Edwards Fossil DE6225. 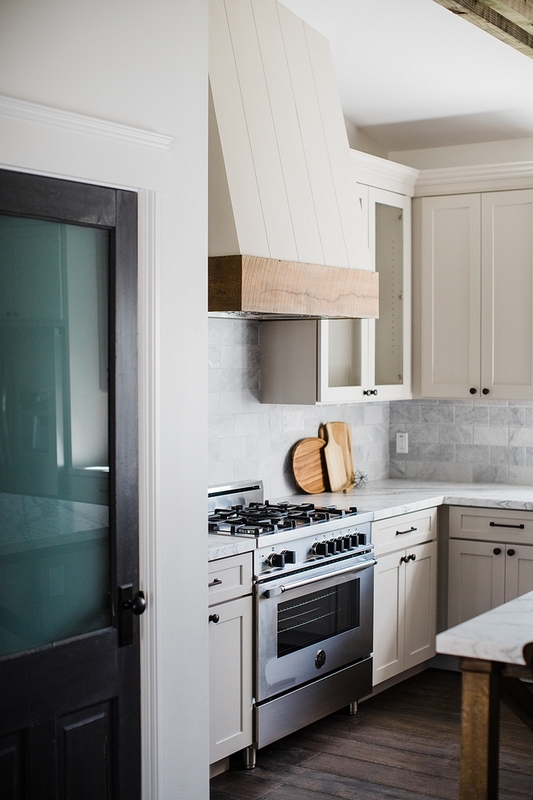 The kitchen hood was custom built by the builder’s on-staff carpenter. 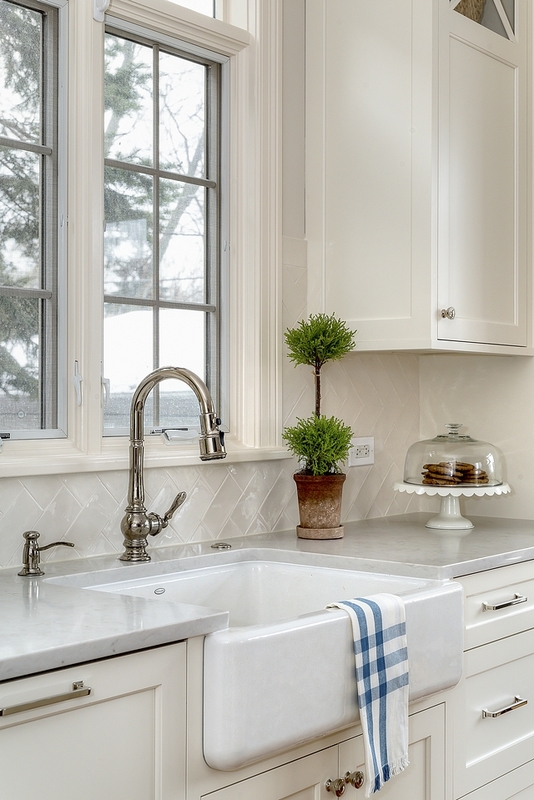 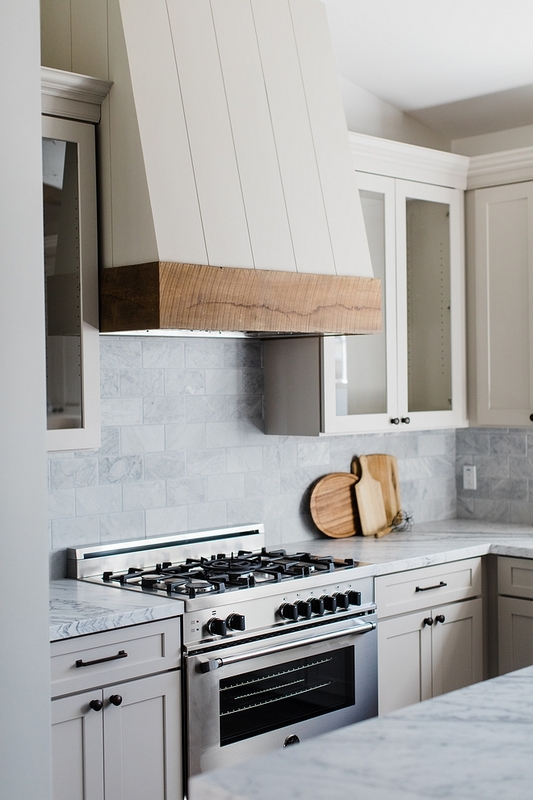 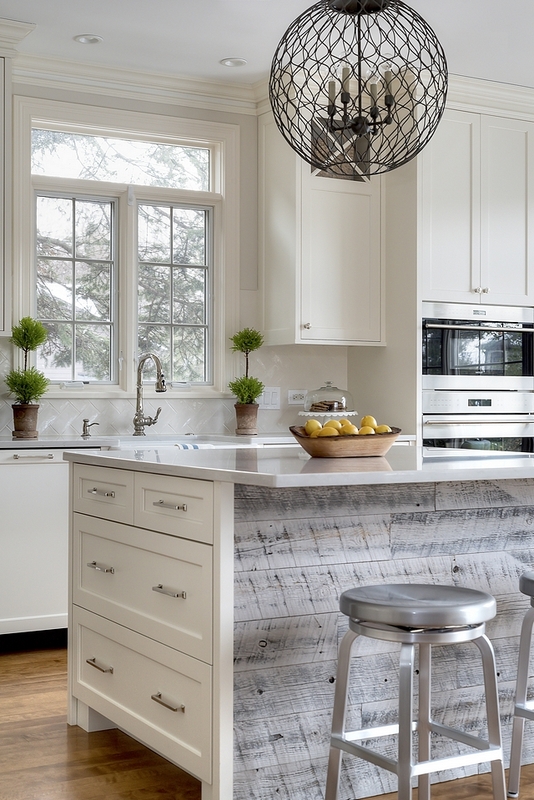 Kitchen backsplash is 4”x8” tumbled carrara marble – similar here, here & here (larger). 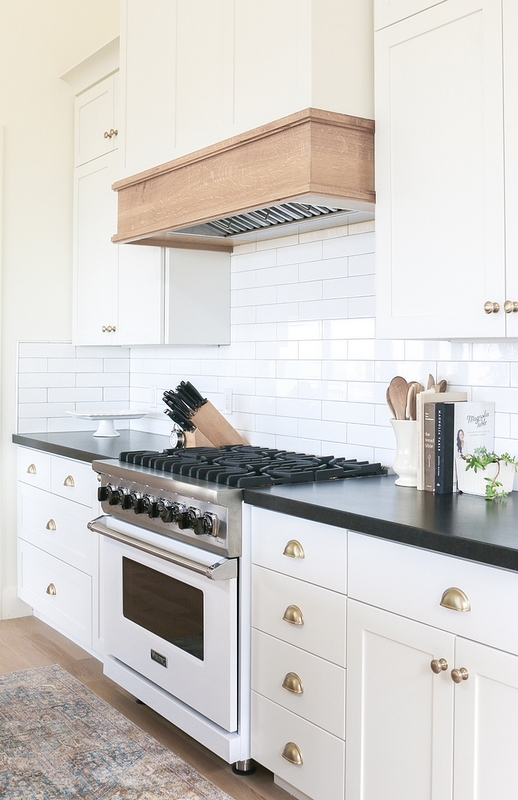 Range is a Bertazzoni (good price for a range). 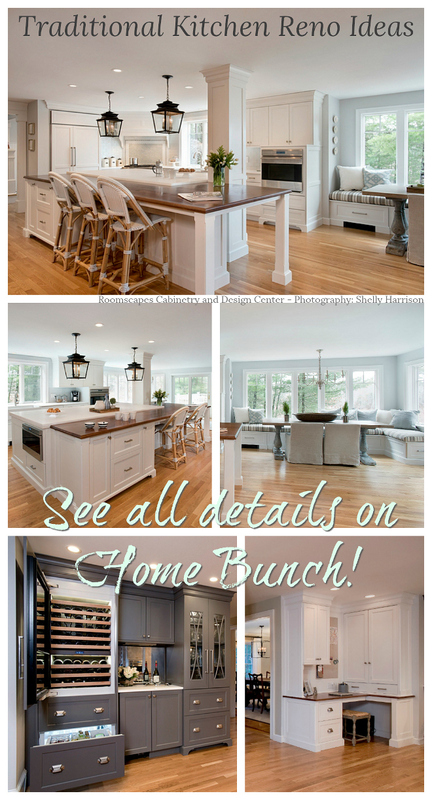 Cabinet Hardware: Top Knobs Pulls & Knobs. 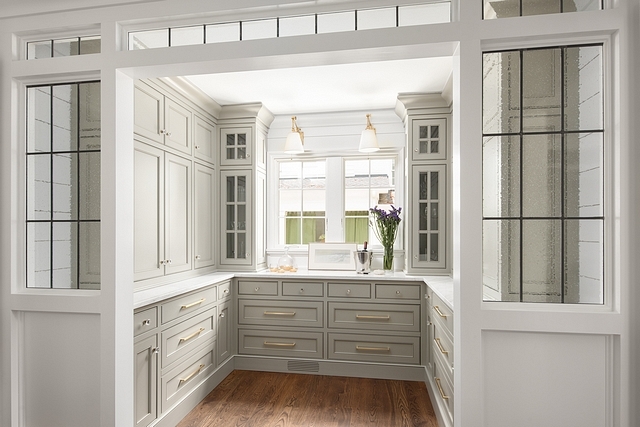 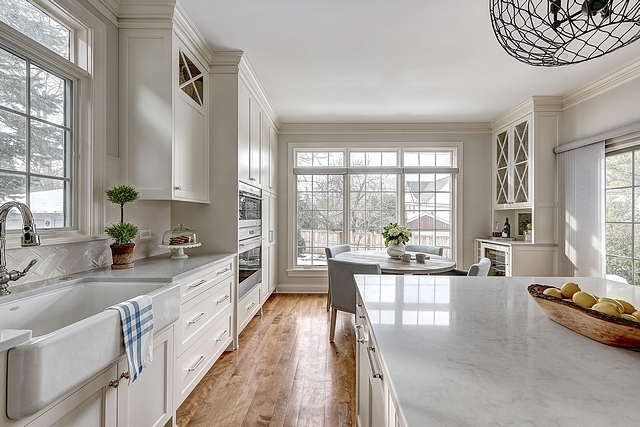 Kitchen Cabinetry: 6 Square Cabinetry, Shaker style door with Gray Ash finish. 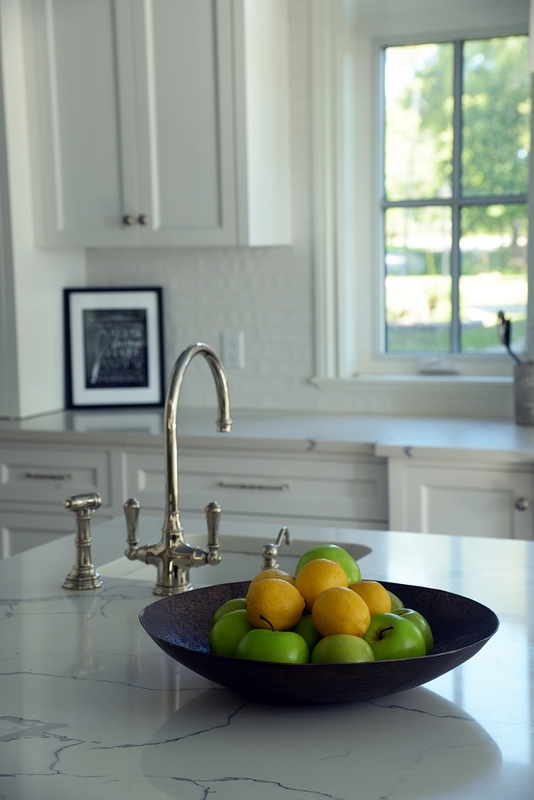 Kitchen faucet is Kingston Brass’ Heritage line (affordable!). 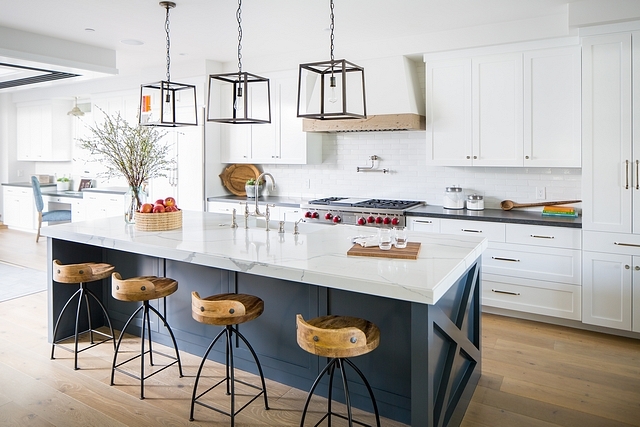 These stools can be found here – similar here, here & here. 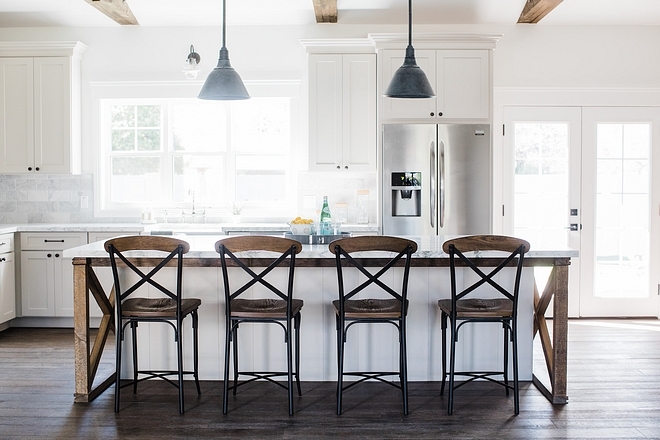 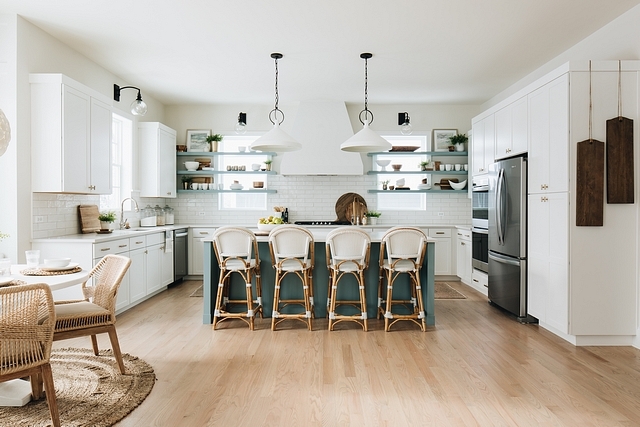 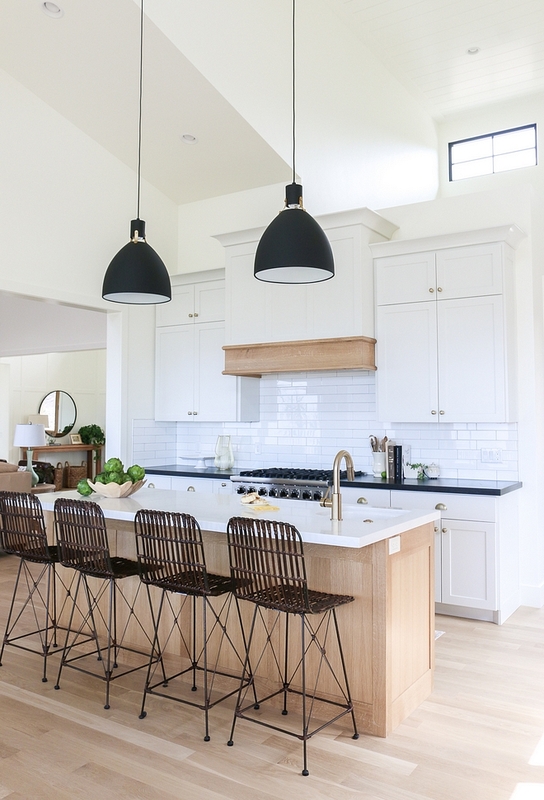 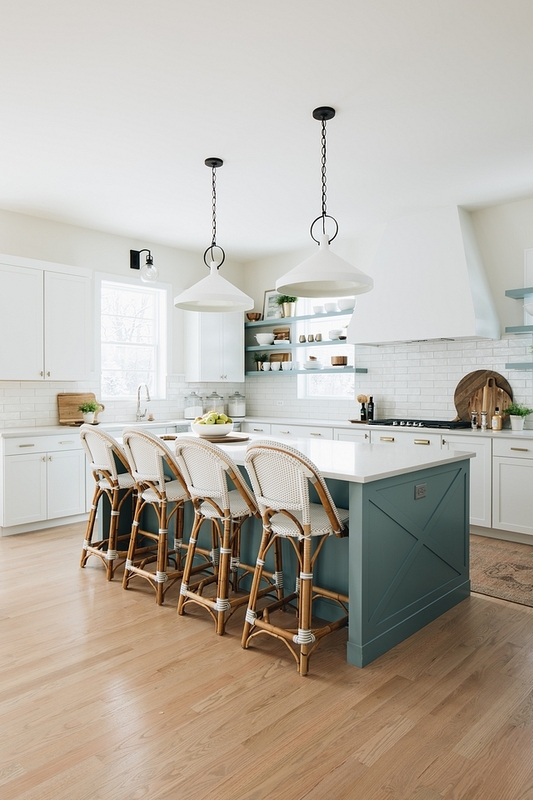 The pendants are from Restoration Hardware – Vintage French Farmhouse Pendant, and in the 10″ size. 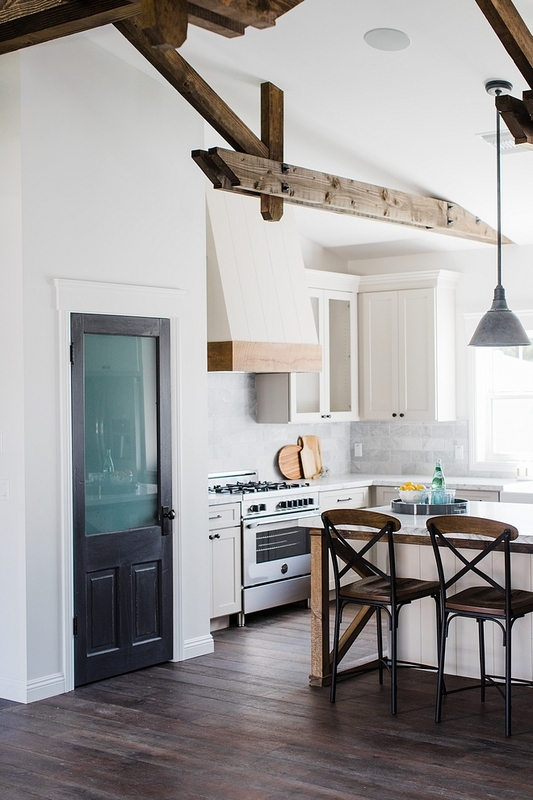 – similar here. 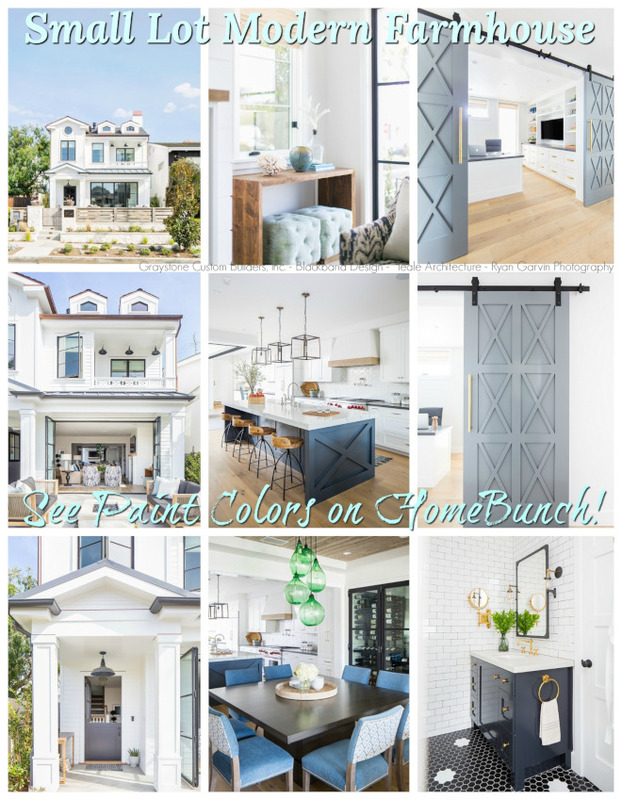 Easy, affordable and colorful! 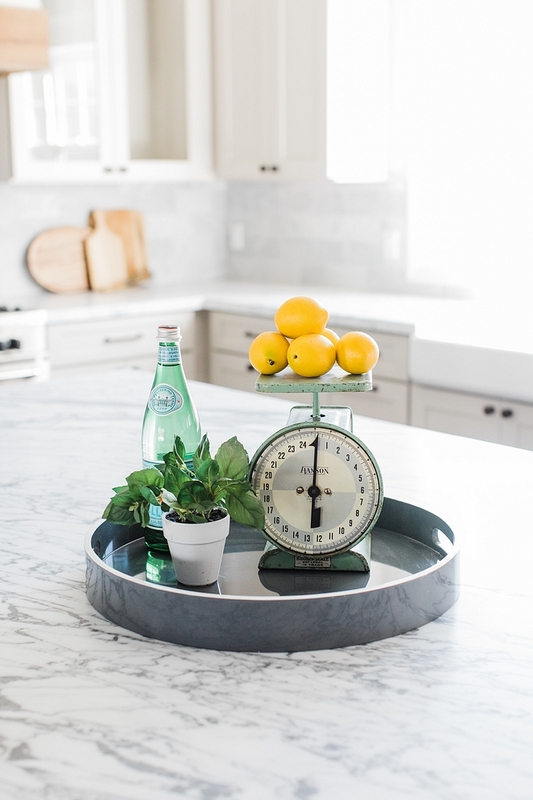 Just add a tray, a vintage-looking scale, small plants, lemons and you’re good to go! 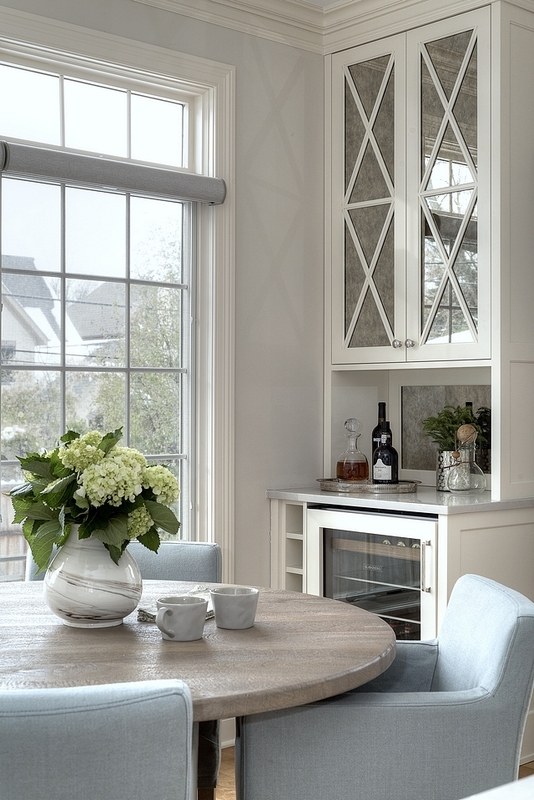 The breakfast nook was kept simple with a dining table and bench set, clean-lined dining chairs and a drum chandelier. 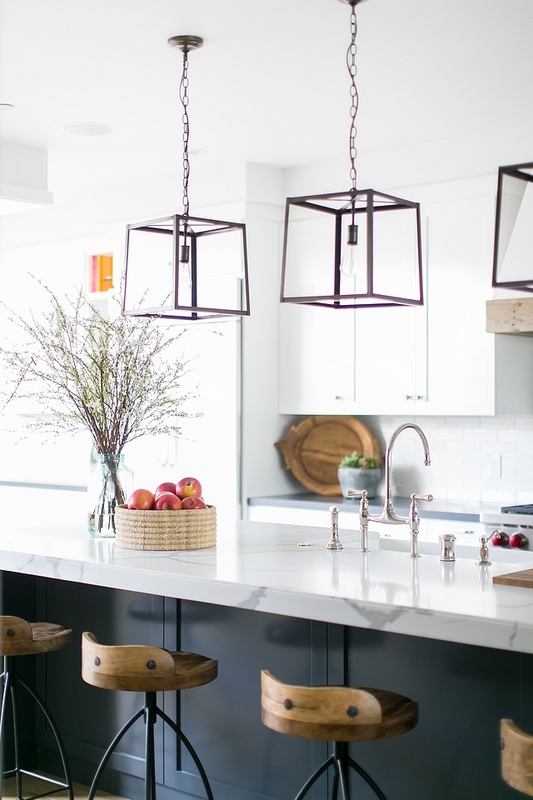 Lighting: Visual Comfort – Large. 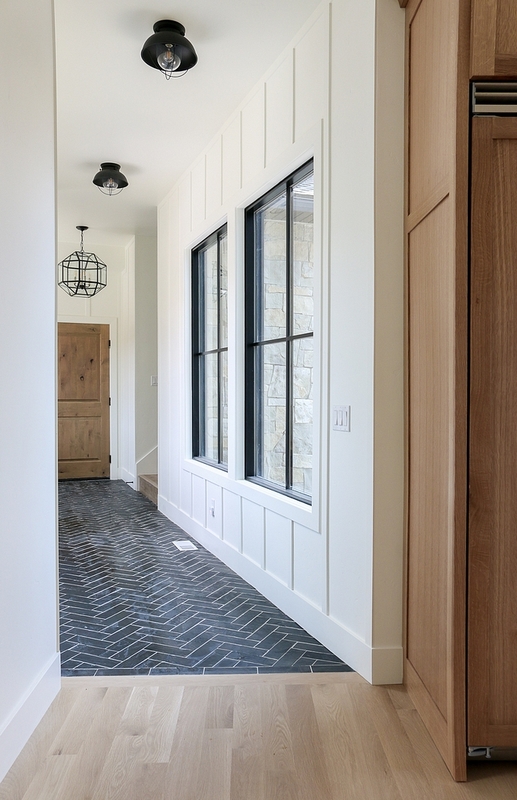 Located off the garage, this entry features a built-in bench with Walnut top and a custom Diamond-shaped wall paneling. 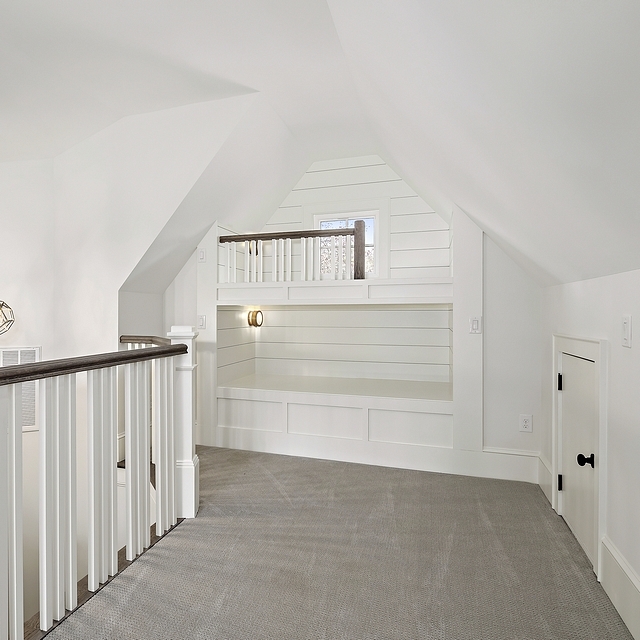 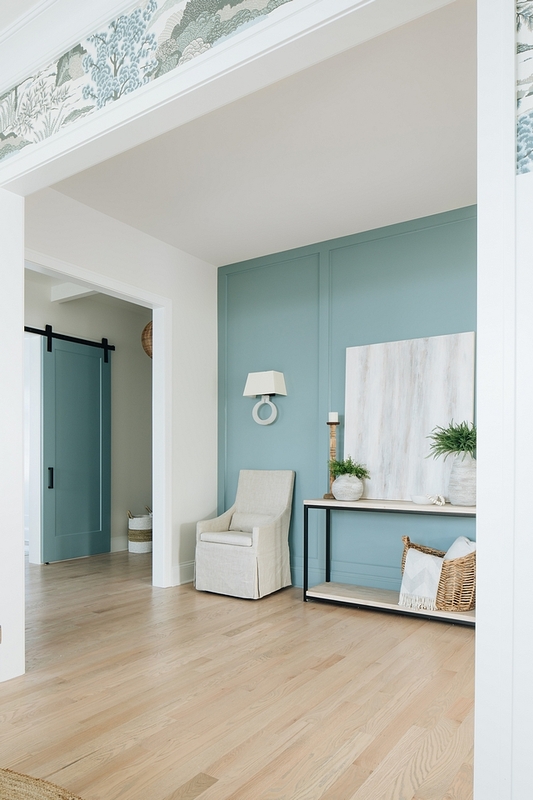 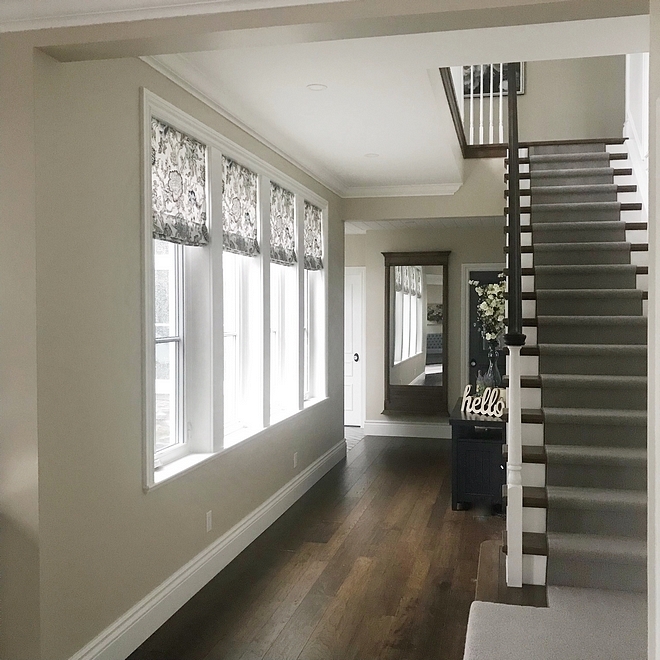 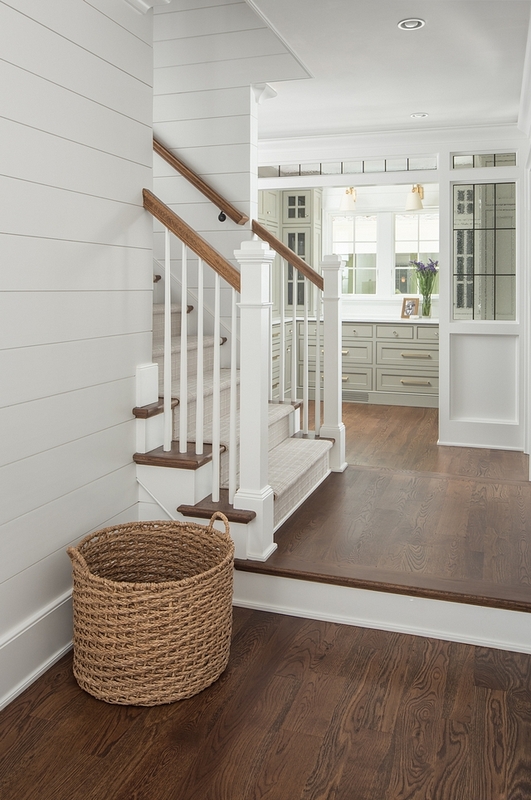 Trim and wainscoting paint color is Dunn Edwards White DEW380. 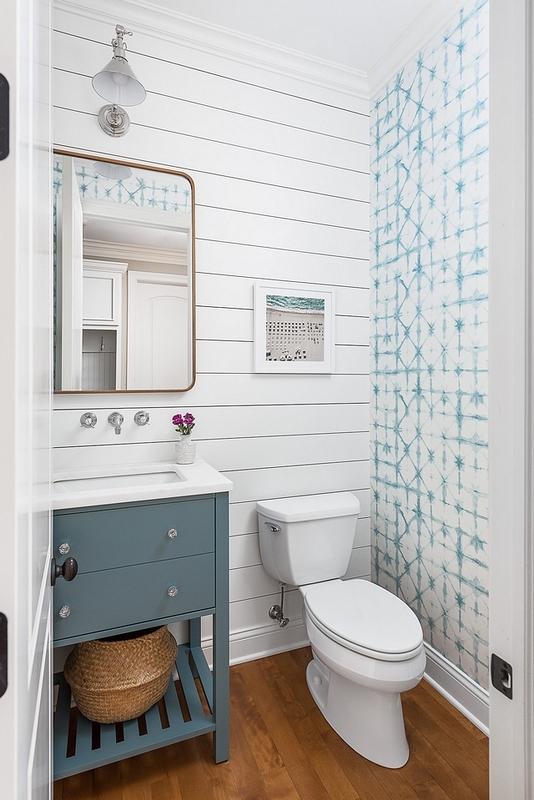 This “Diamond shiplap” wainscoting is so fun and very creative! 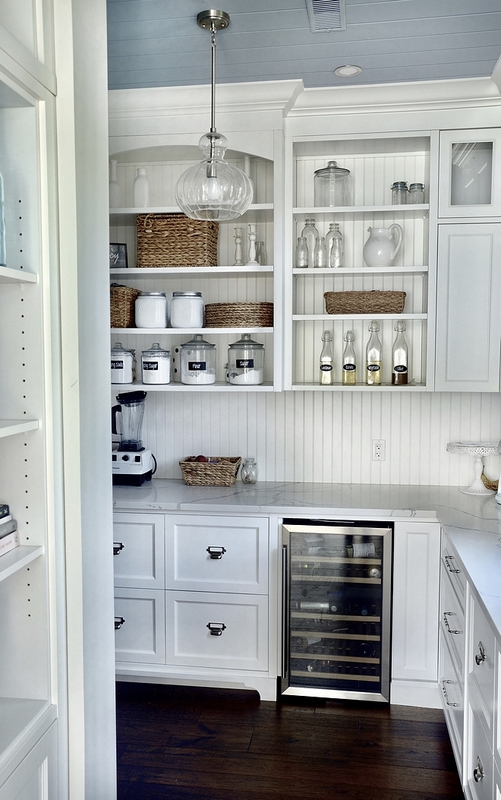 I’m loving this idea. 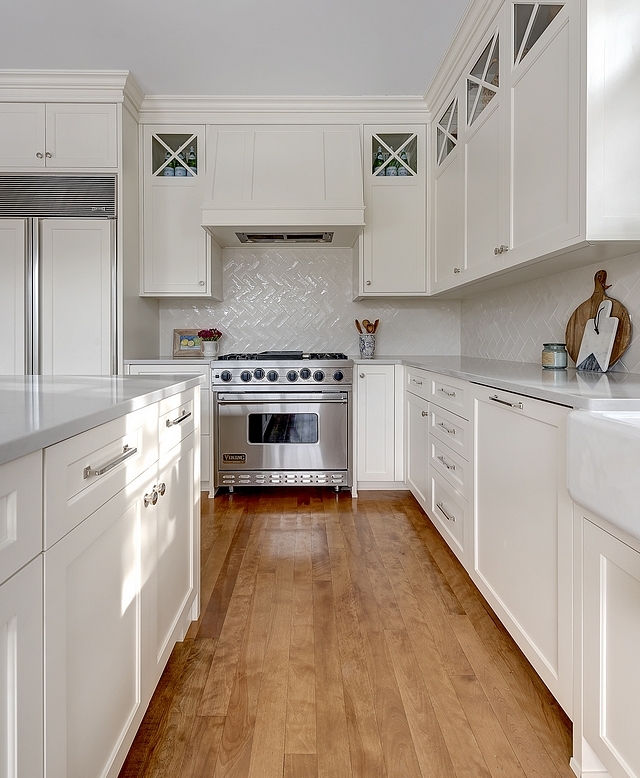 According to the builder, the diamond design is made is ¼” oak veneer. 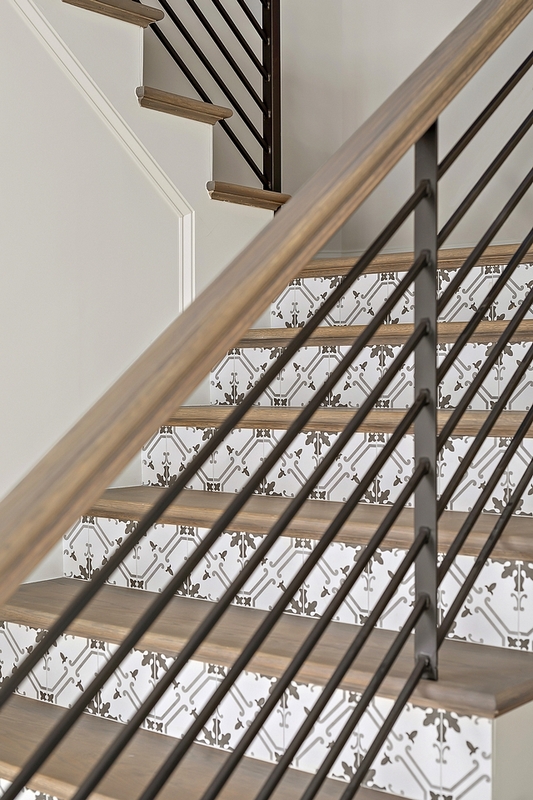 It was ripped down to thinner strips to use for the diamond design. 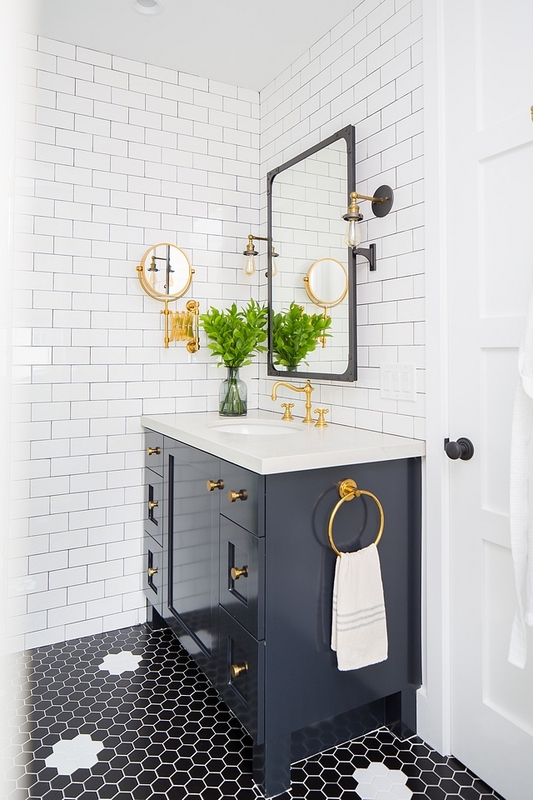 Similar hooks can be found here & here – Others: here. 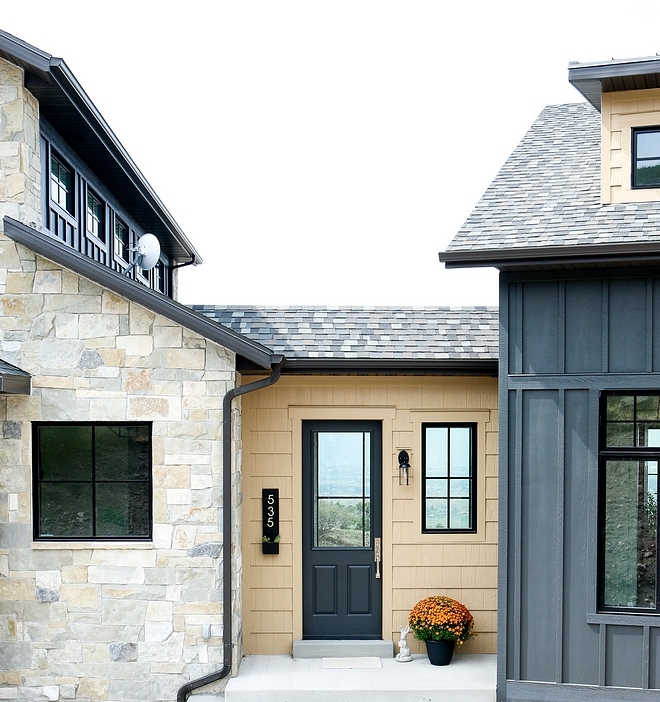 Paint color is Dunn Edwards Fossil. 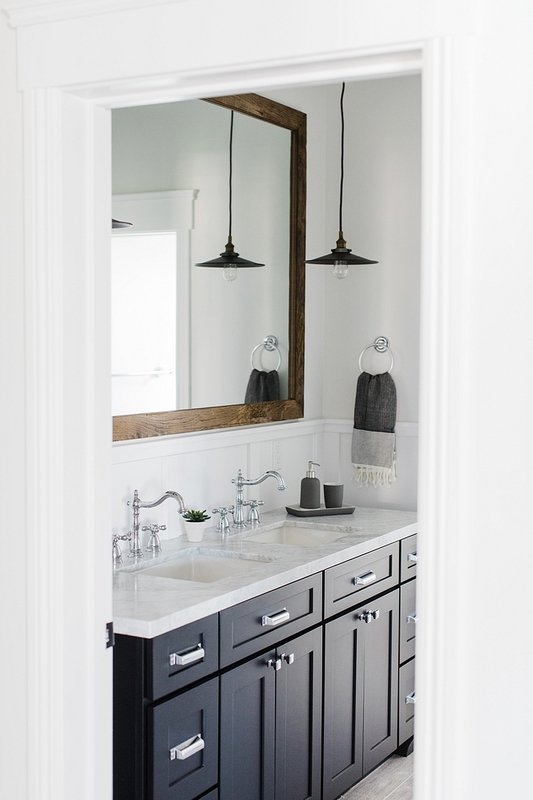 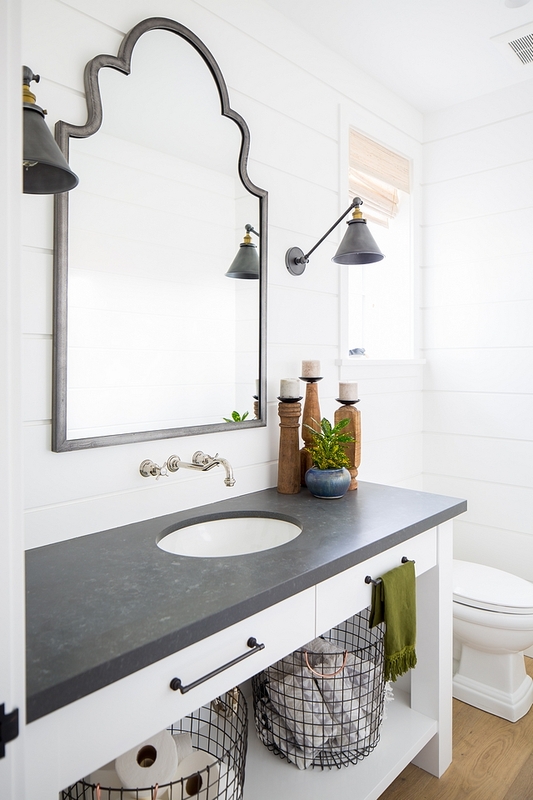 The kids’ bathroom features a dark charcoal cabinet with white marble top, double sinks and a large barnwood mirror. 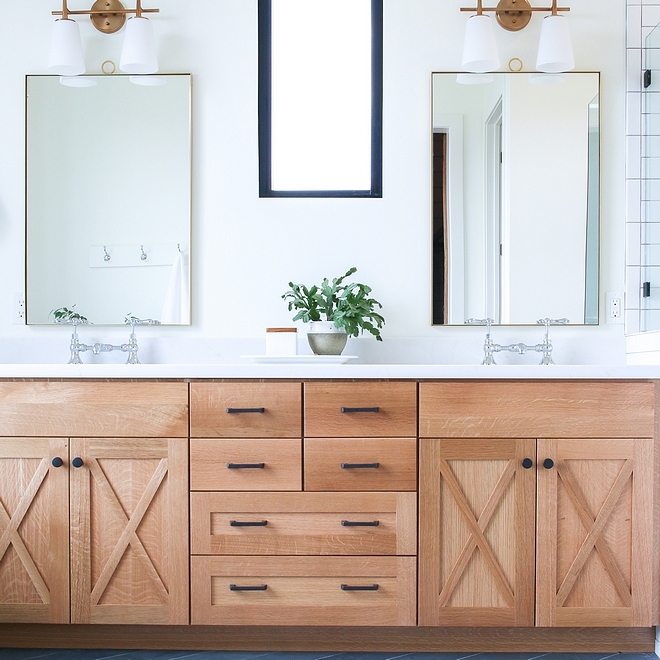 Similar Mirrors: here, here, here, here & here. 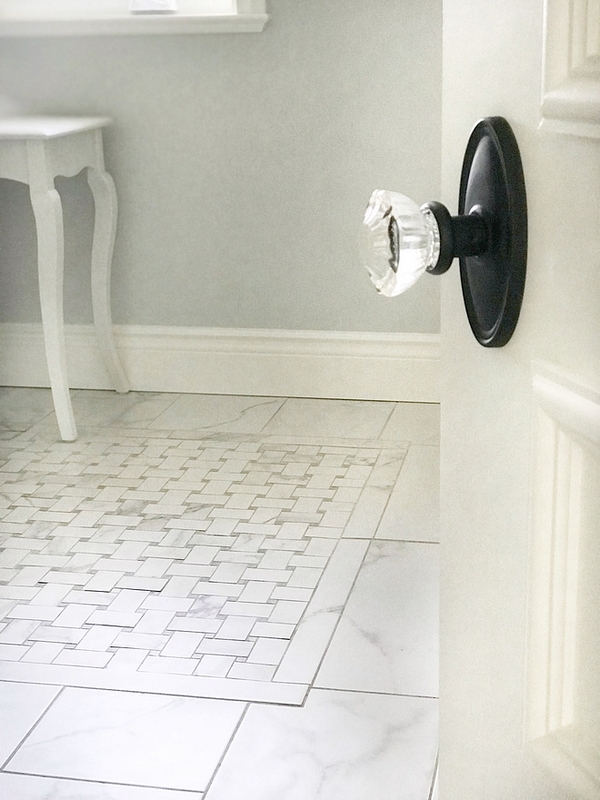 Hardware: Top Knobs Pulls & Knobs. 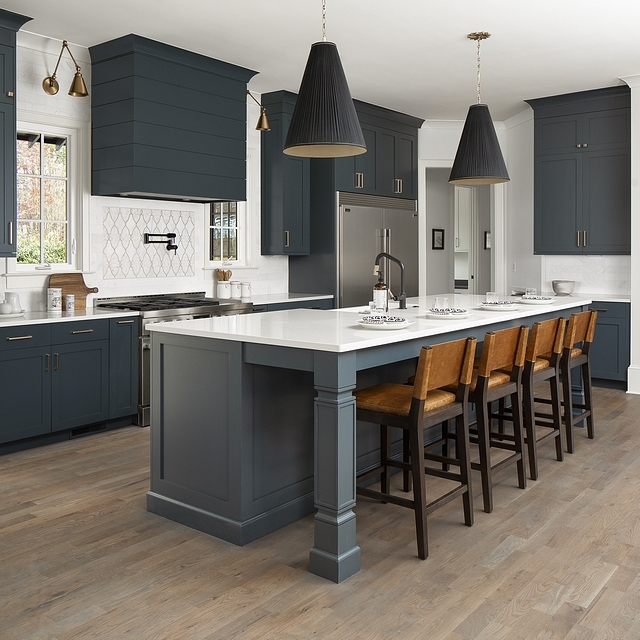 Cabinetry: 6 Square (a semi custom line), charcoal color – similar paint color: Cheating Heart by Benjamin Moore. 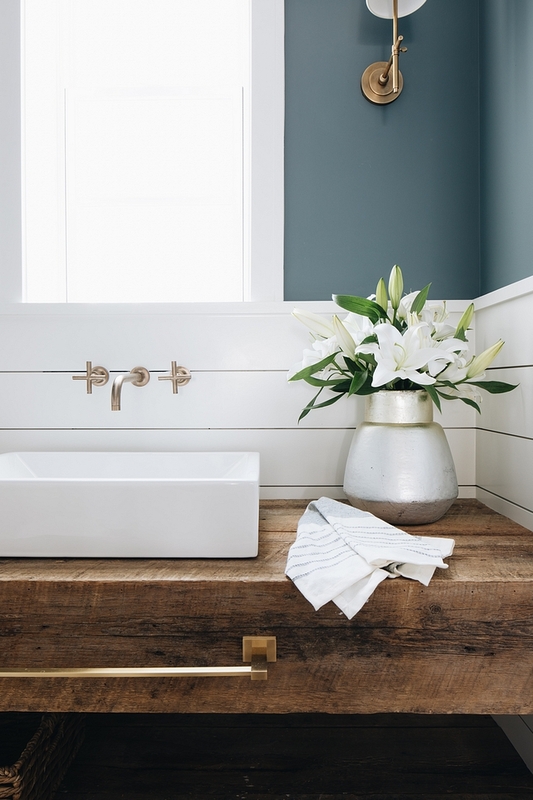 Faucets are by Kingston Brass (huge sale!). 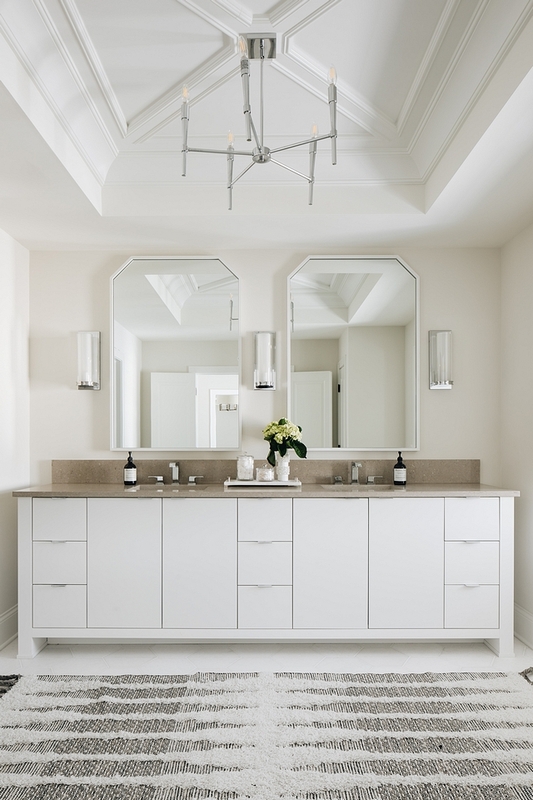 Bathroom Lighting: RH – similar here, here & here (in white). 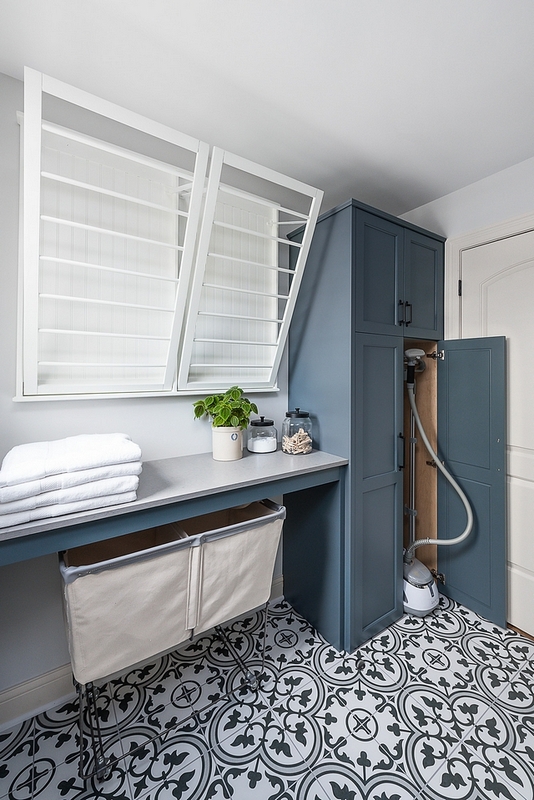 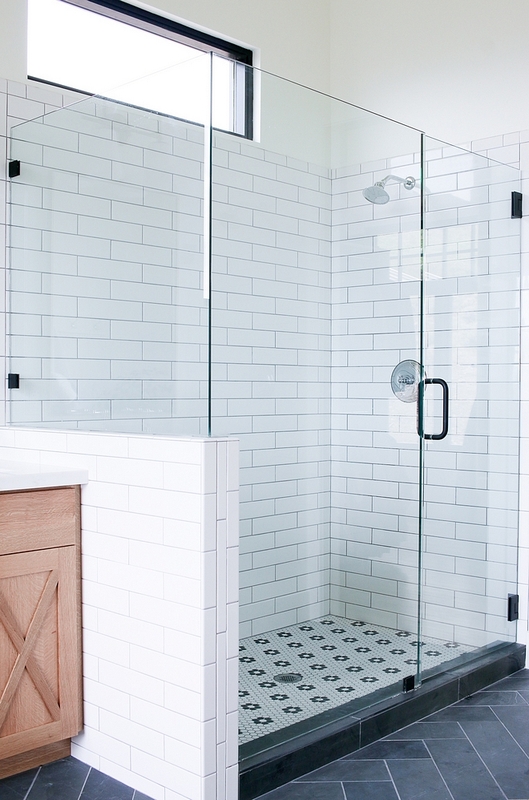 A door separating the shower/tub brings some privacy to this shareable Jack-and-Jill bathroom. 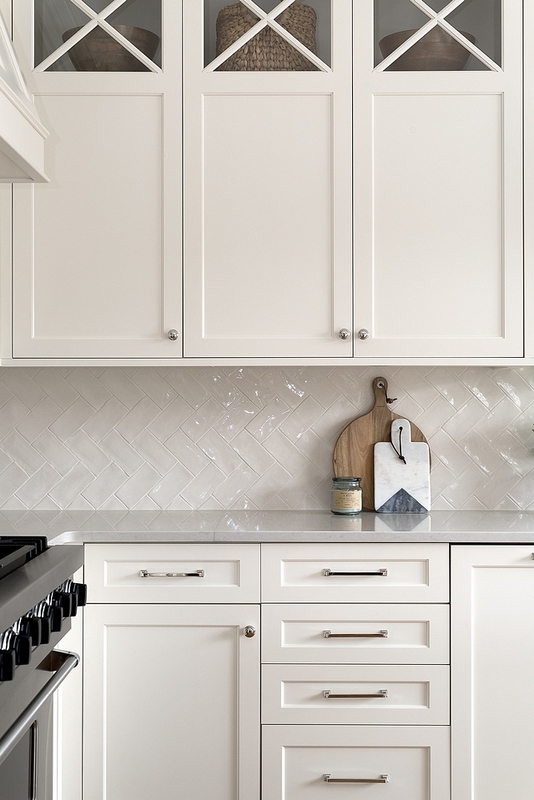 Similar grey subway tile can be found here (I absolutely love this tile – perfect for kitchen backsplash as well!) 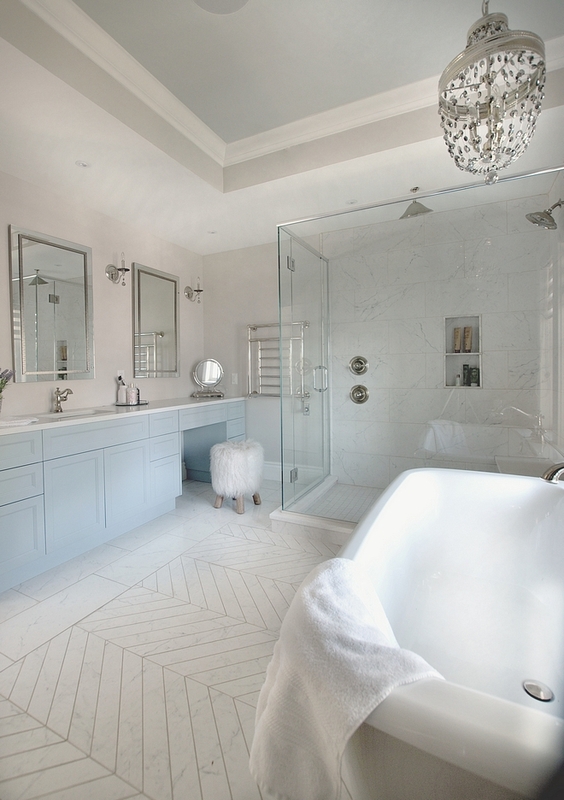 & here. 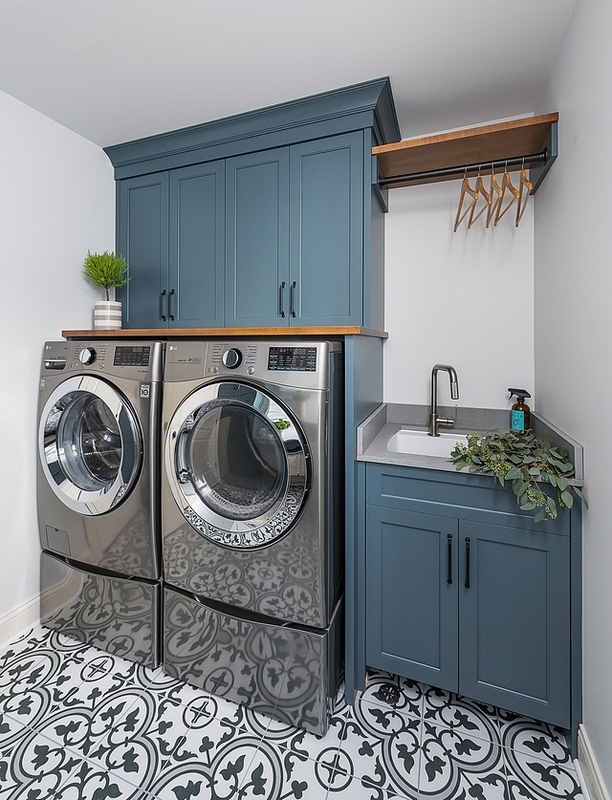 What a great farmhouse laundry room. 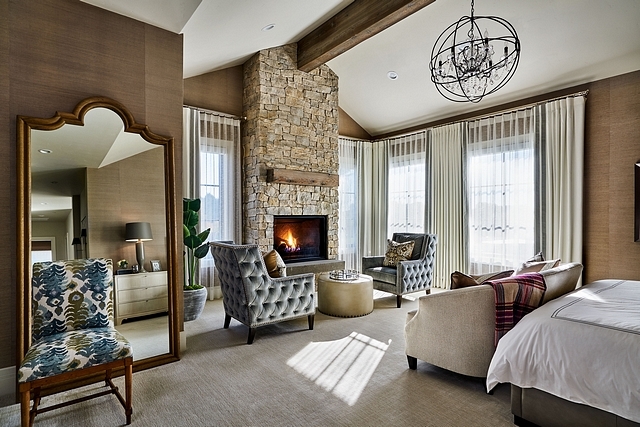 This room feels warm and very inviting… which is a plus, since chances are that you would spend a lot of time in here. 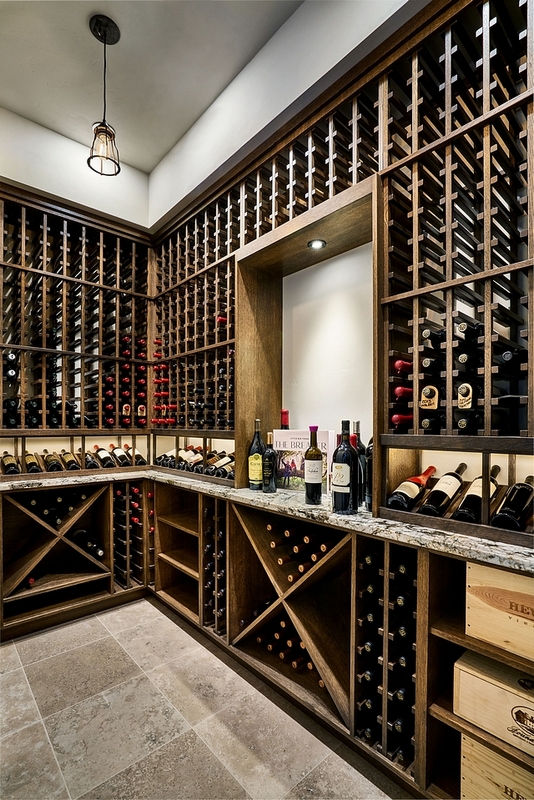 I sure spend many hours in mine! 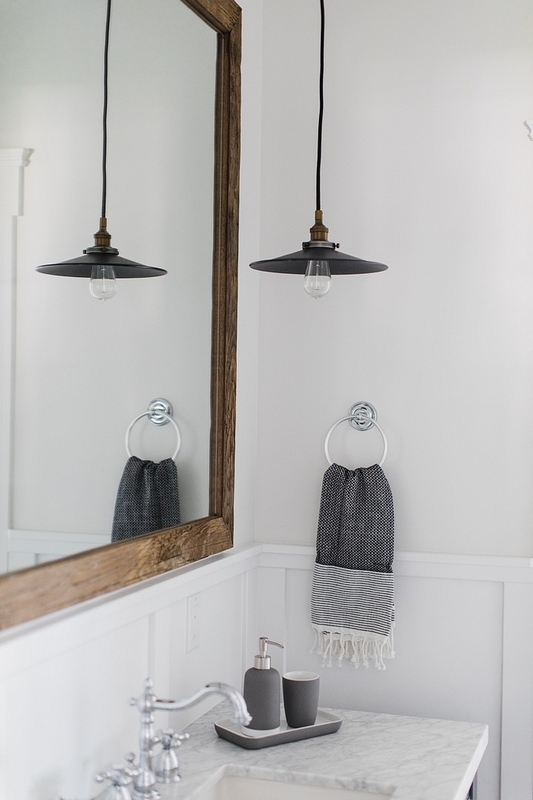 Laundry Sconce: Barn Light Electric – similar here. 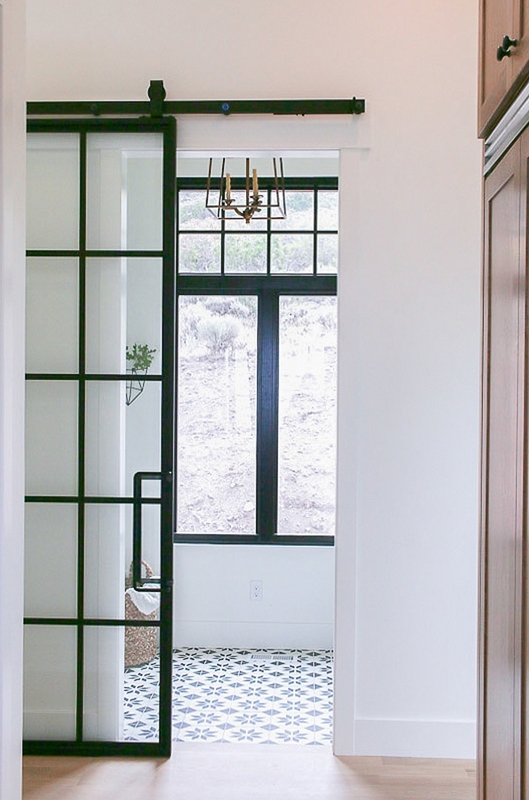 Similar Floor Tile: here, here & here. 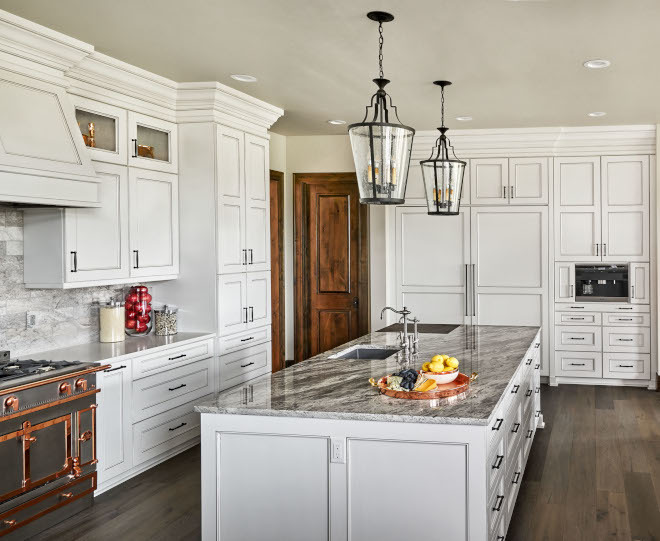 The countertops and shelves are made from American Walnut butcher-block and the builder added a matte finish cleat coat on top of them. 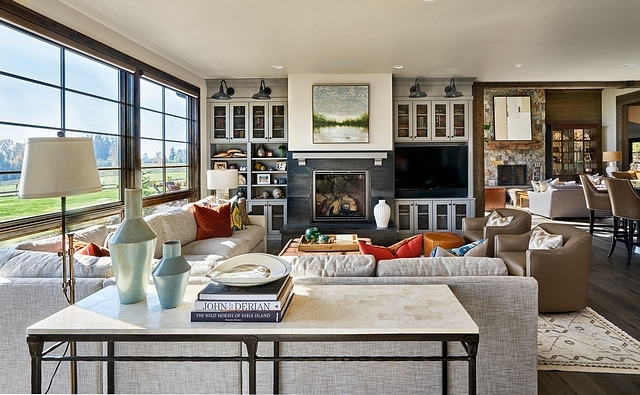 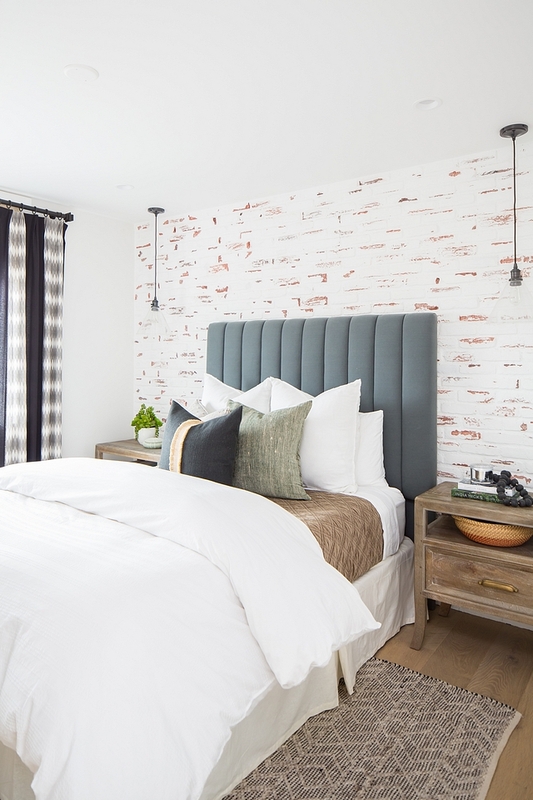 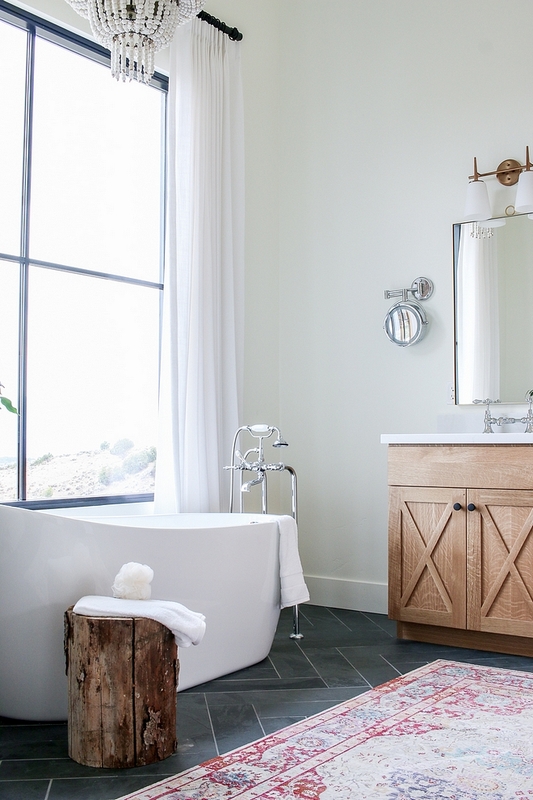 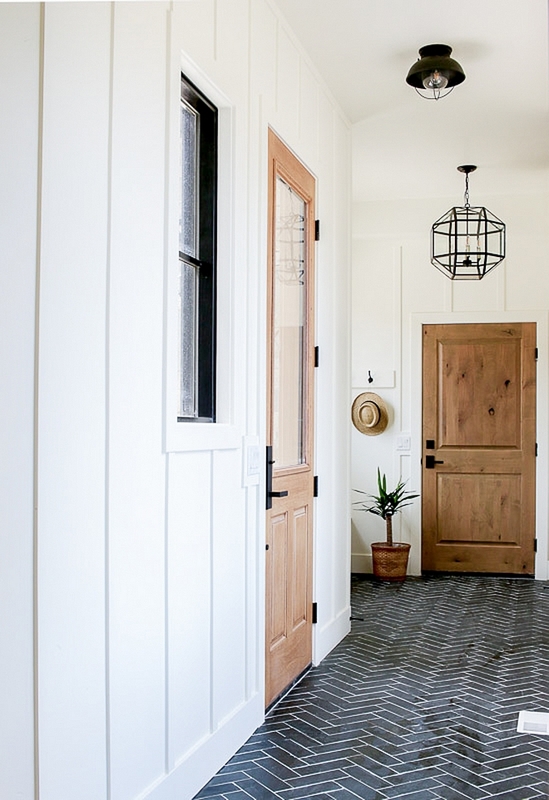 Interior Design Ideas: California Modern Farmhouse. 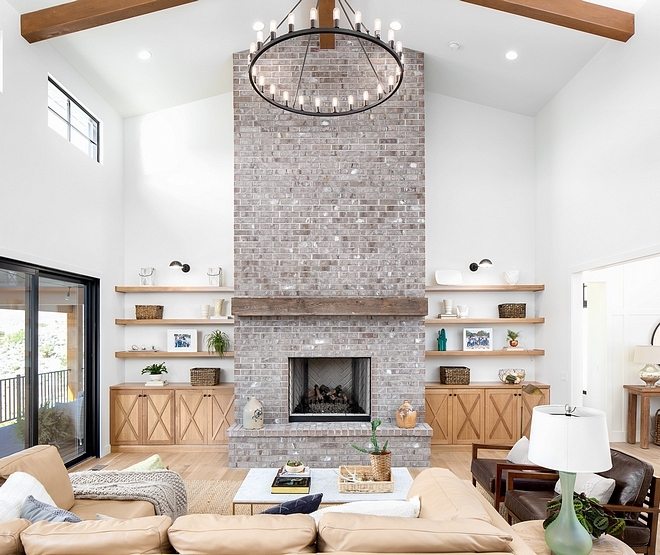 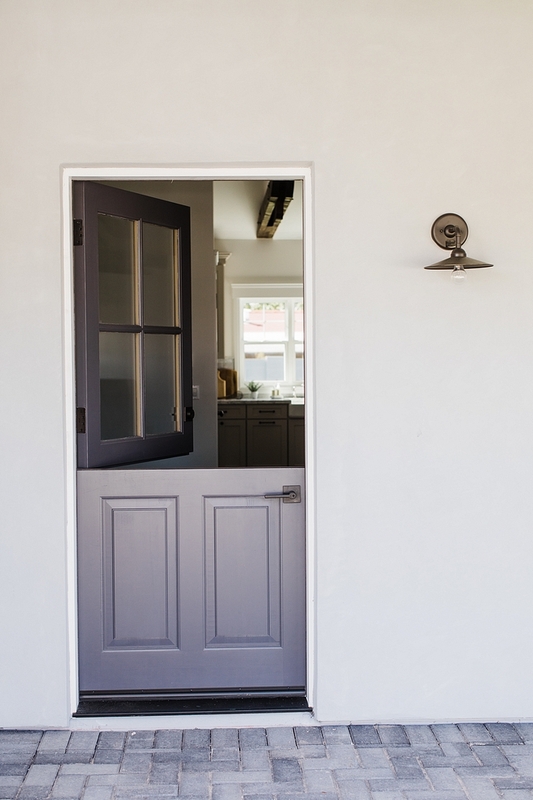 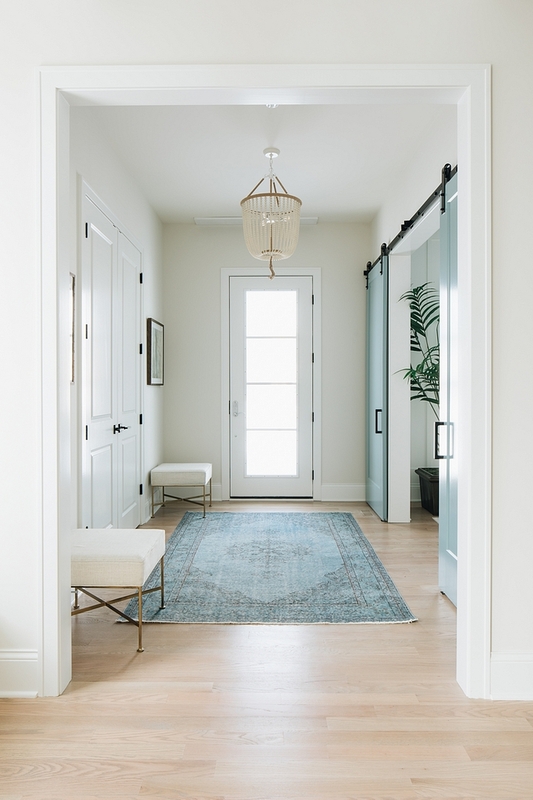 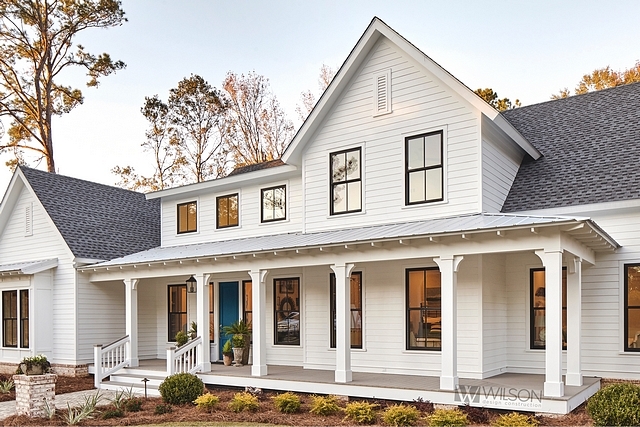 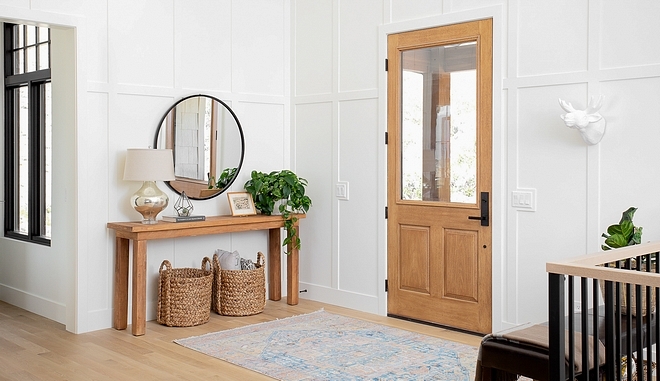 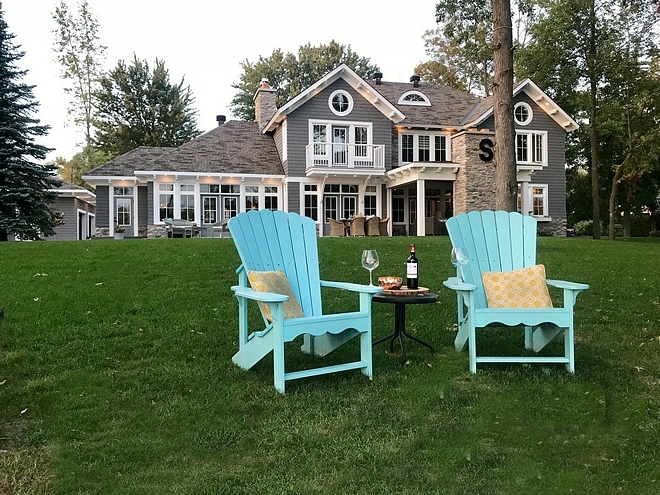 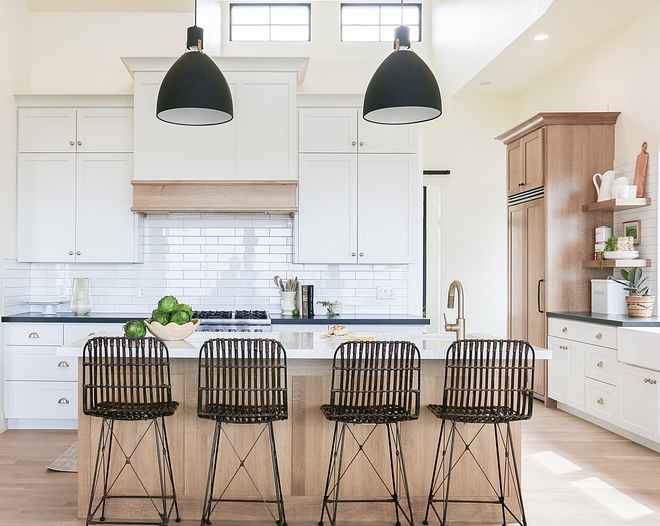 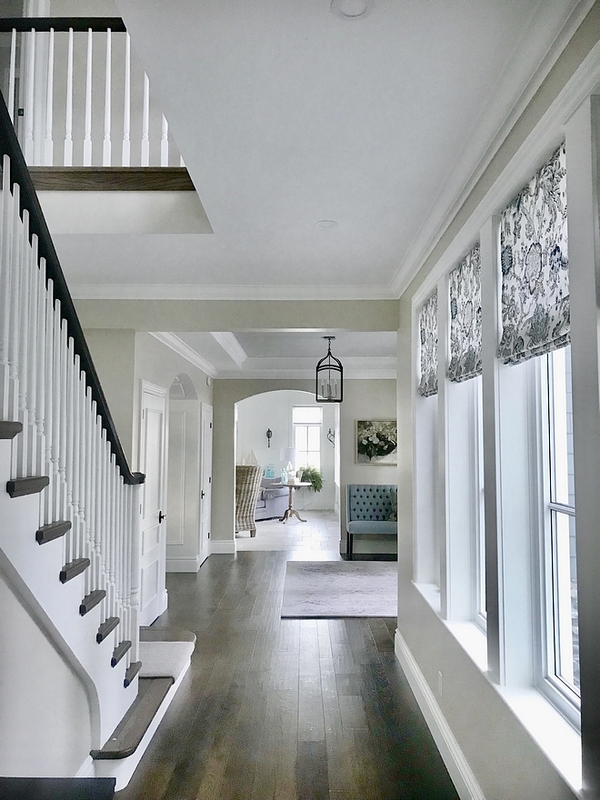 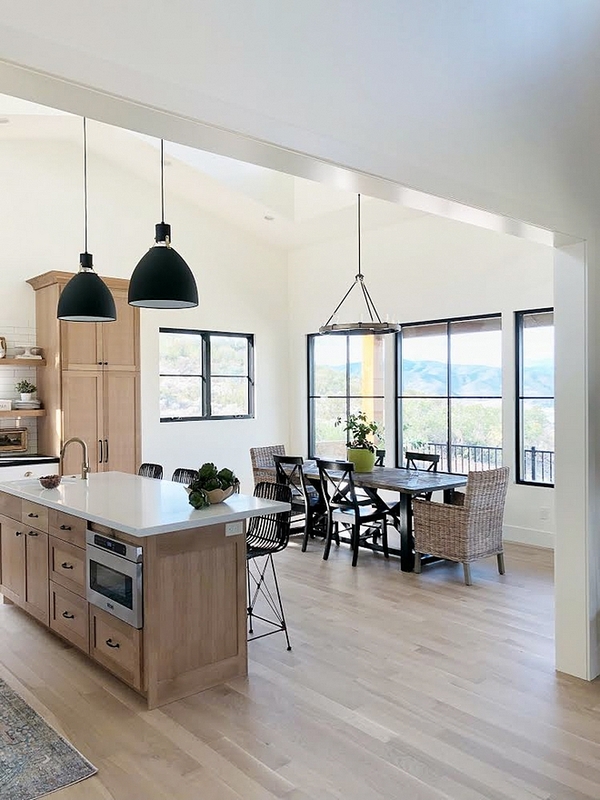 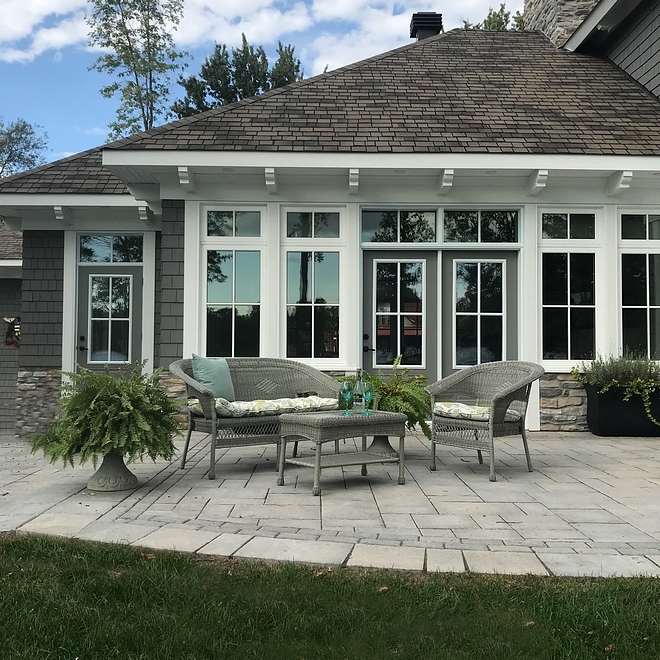 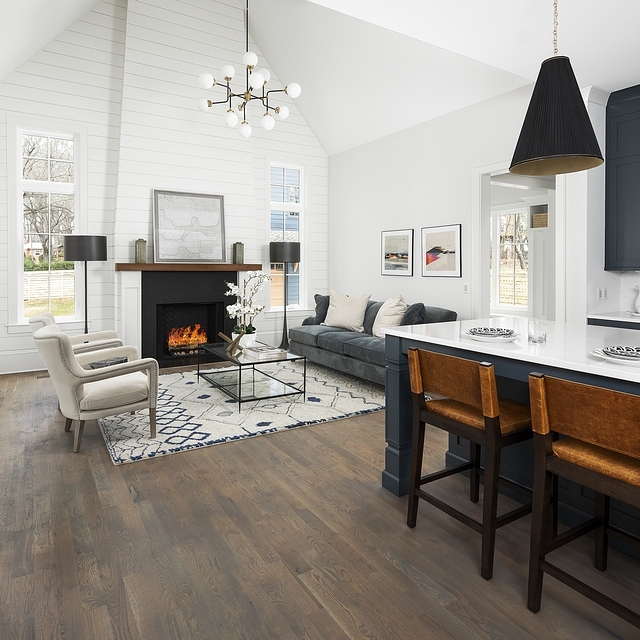 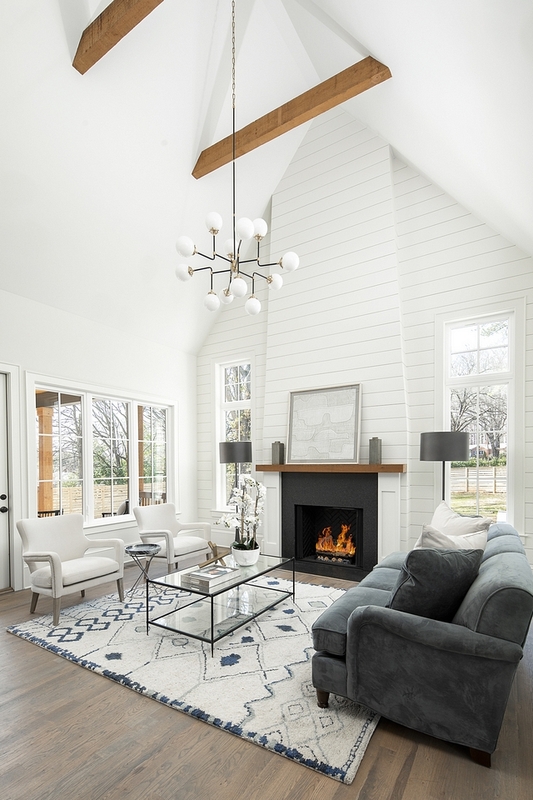 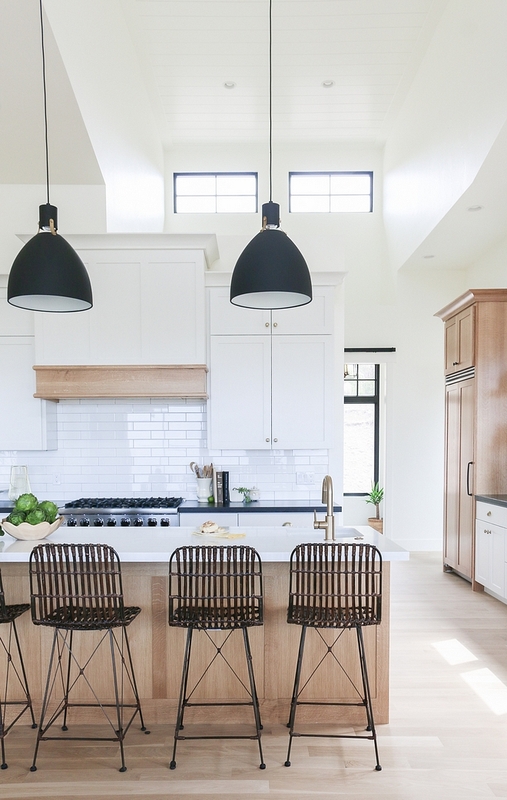 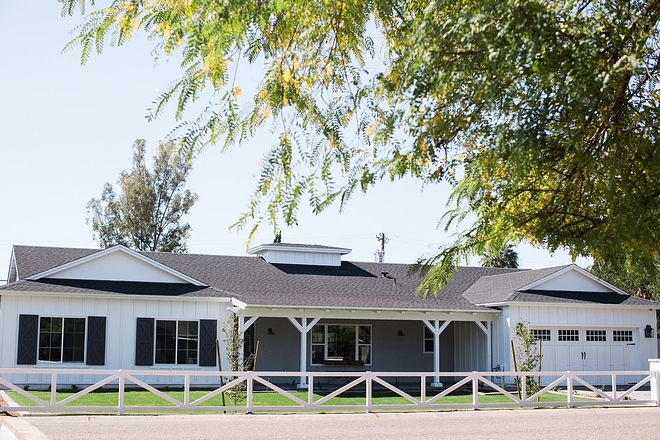 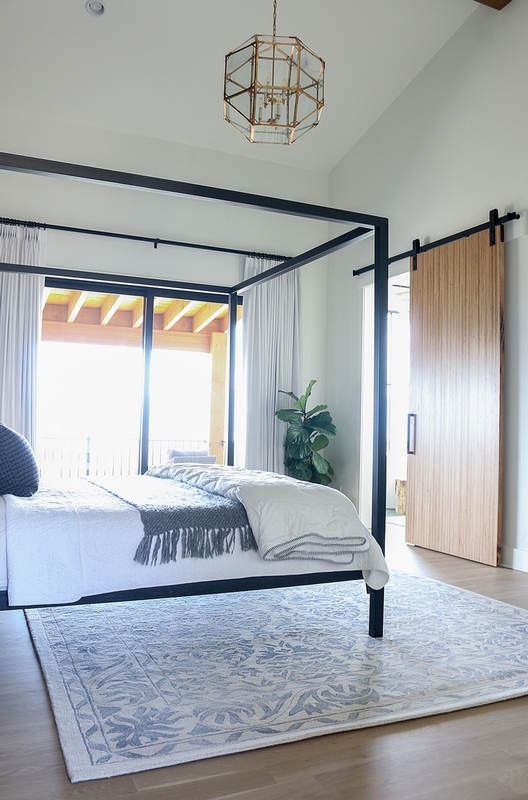 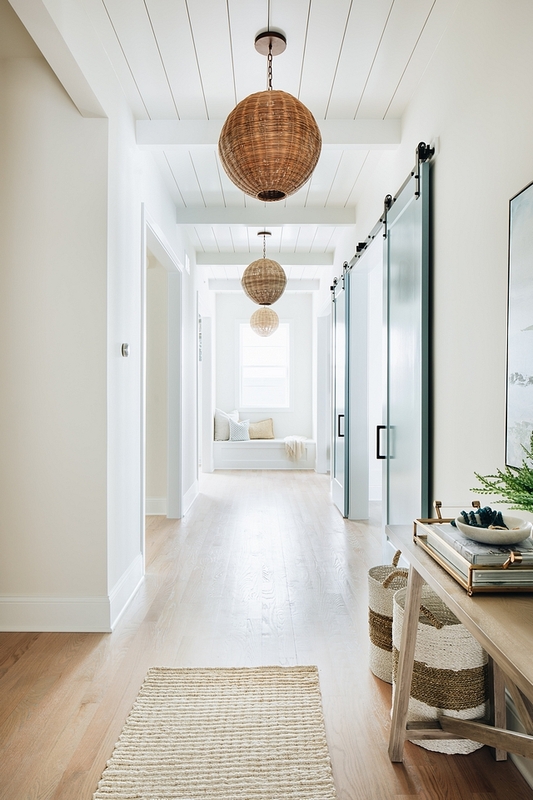 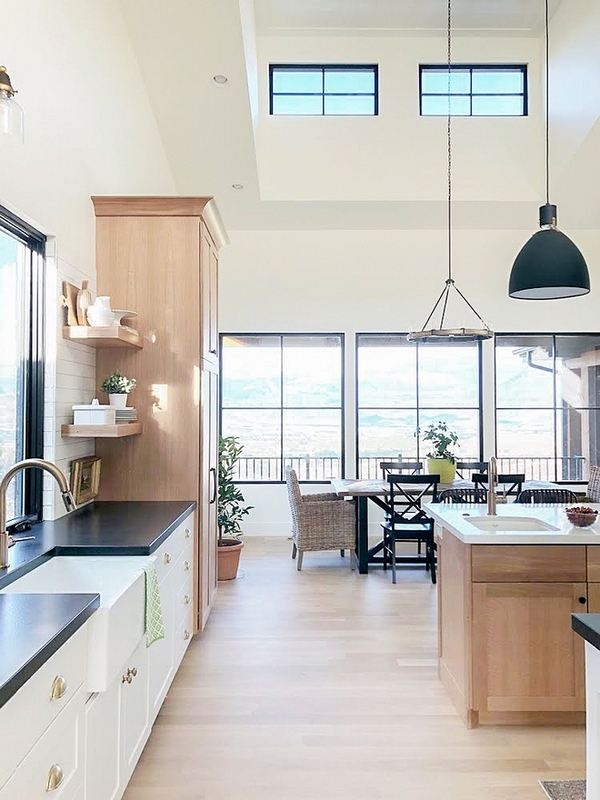 Designed and built by Todd Wilson of Wilson Design & Construction, Inc., this modern farmhouse with front porch brings beauty to our day and shows that modern farmhouses don’t need to feel cold, bare have all-white interiors. 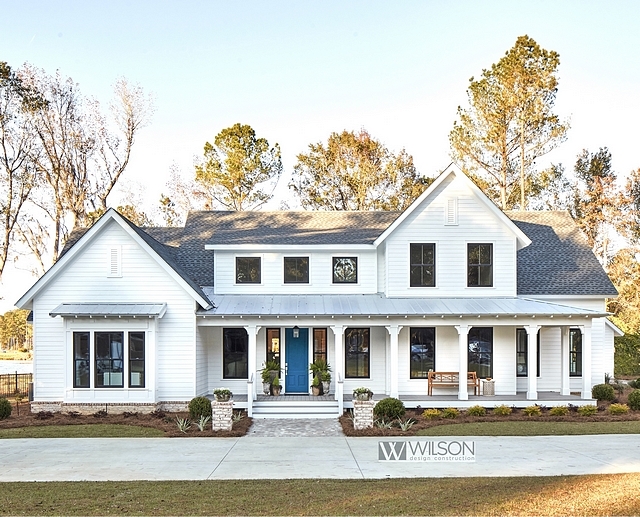 Being one of the most popular Southern Living Showcase Homes, this Valdosta, Georgia project began as a custom home and it’s actually part to Southern Living House Plans for resale (“Whiteside Farm” (SL-1979)), so if you’re dreaming of building a farmhouse, this home might be the inspiration you were waiting for. 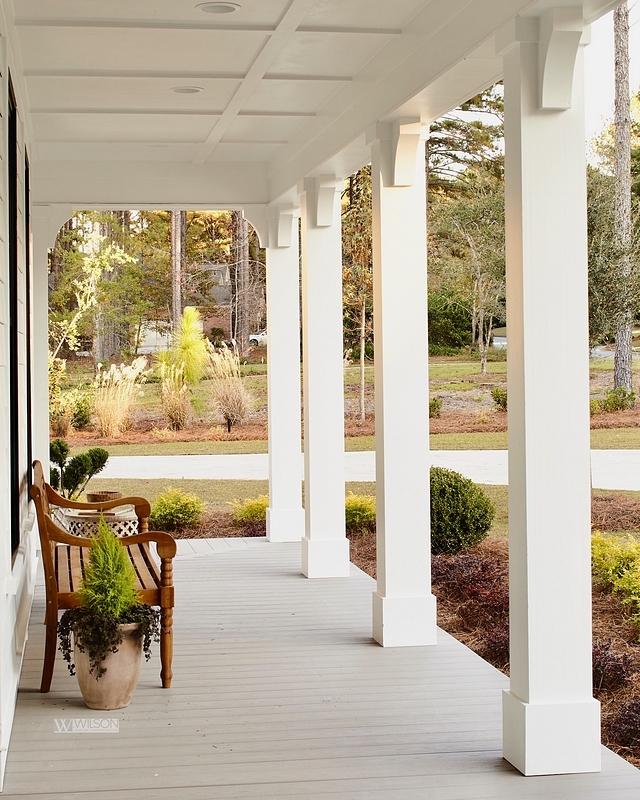 Just make sure to send me pictures or invite me over for a glass of a lemonade on that porch after your home is ready. 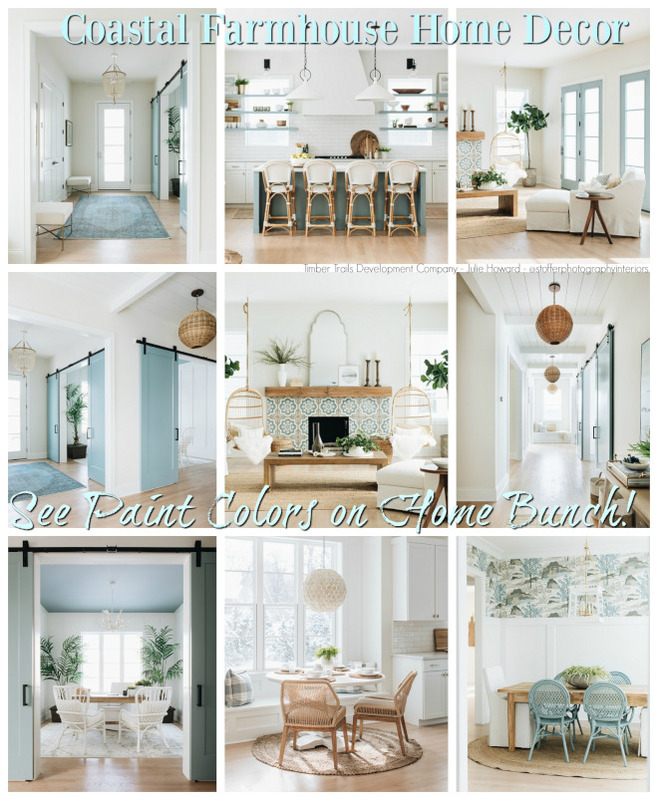 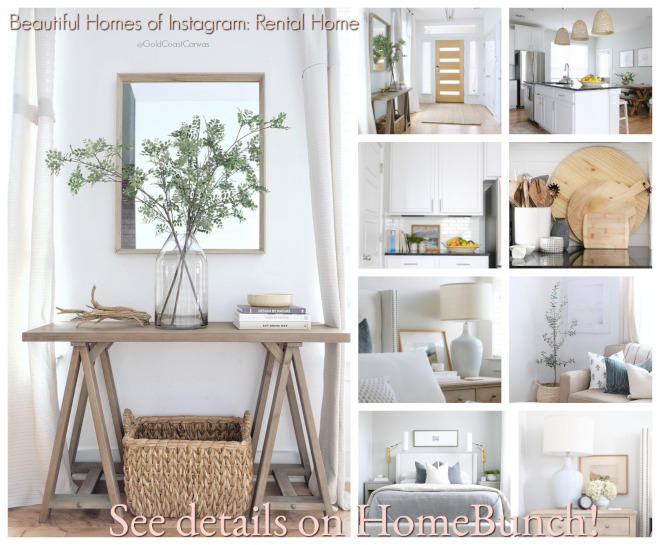 Pin your favorite interior design pictures, take notes on the sources such as paint colors, and I really hope you have a good time, my friends! 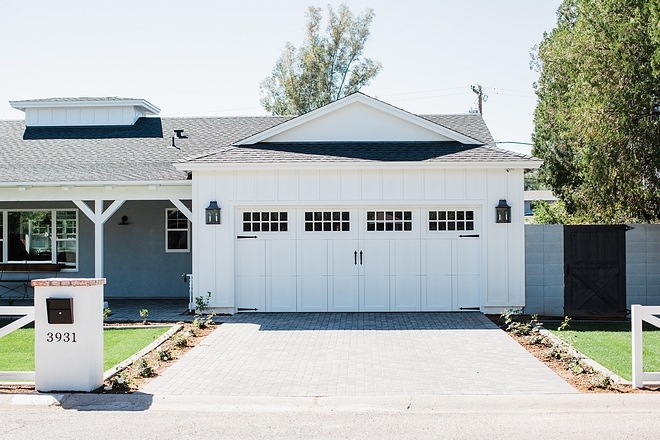 This home has plenty of curb-appeal without feeling pretentious. 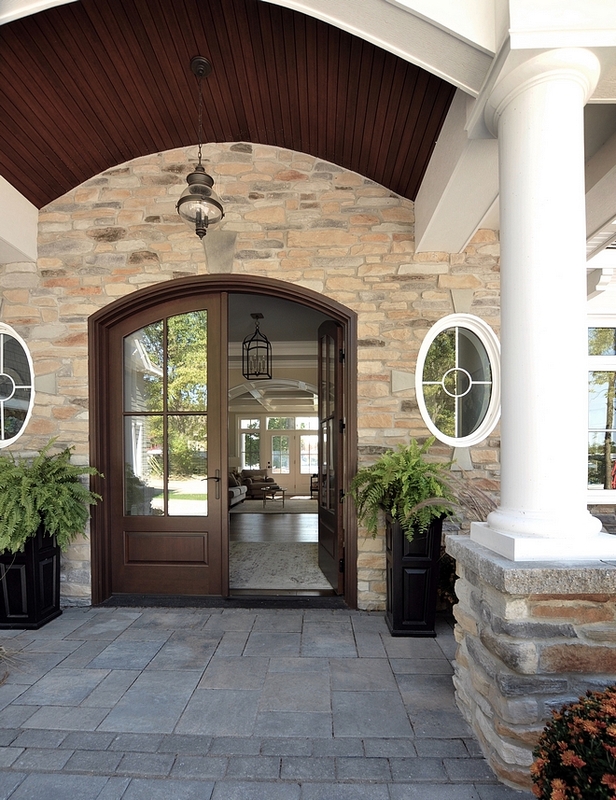 In fact, it feels very approachable and welcoming. 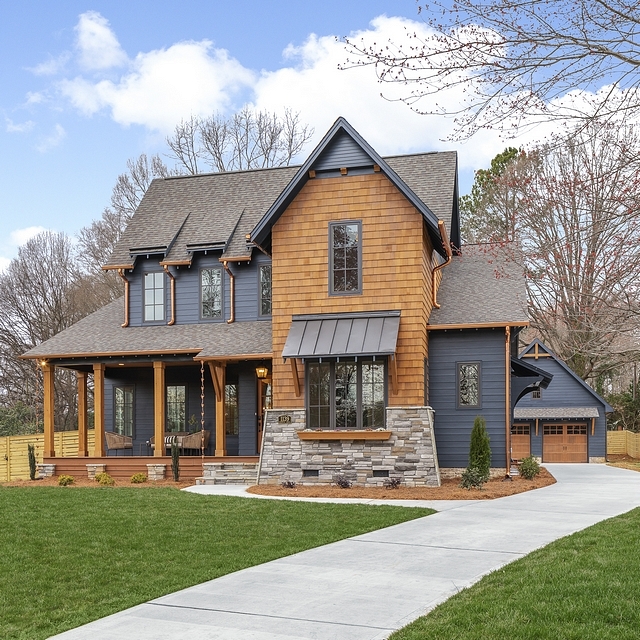 The roof is a combination of Gaf Elk Pewter Grey Blend roof shingles and metal roof. 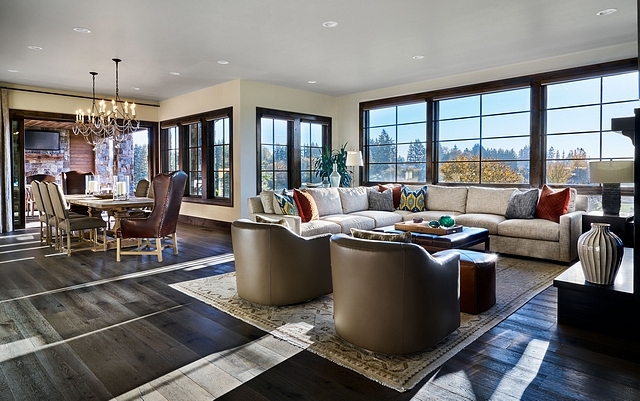 Windows are Integrity by Marvin, Ultrex, Black. 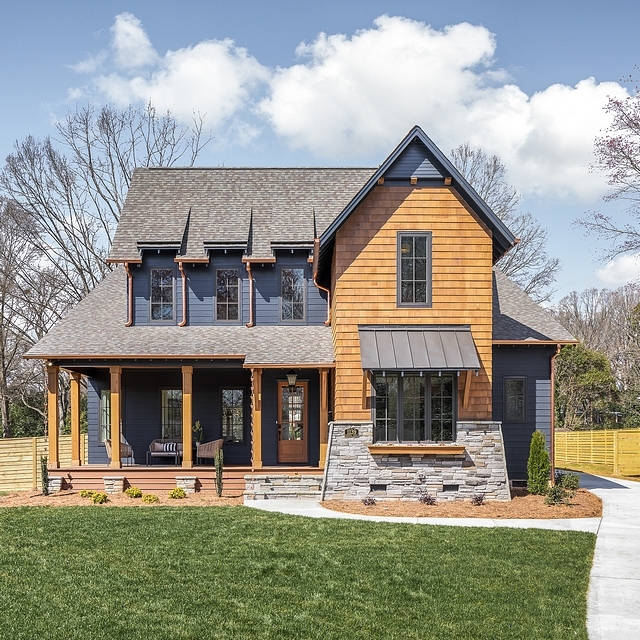 Siding is James Hardie, Plank & Trim, Smooth. 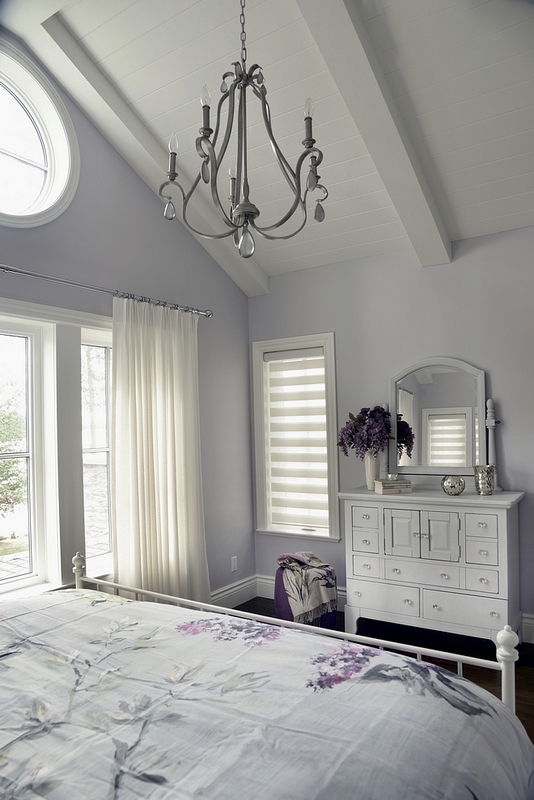 Paint color is Sherwin Williams SW 7004 Snowbound in satin. 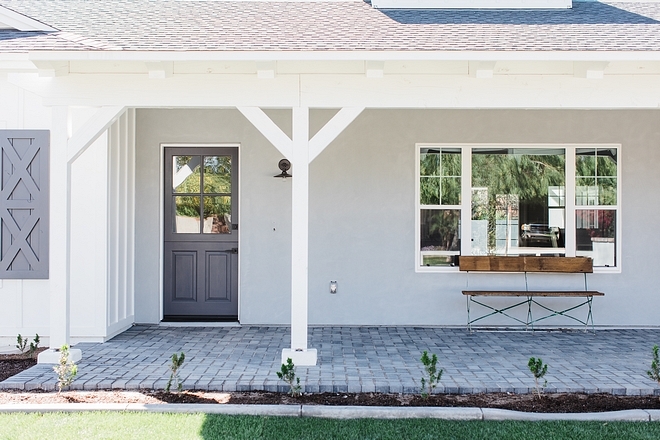 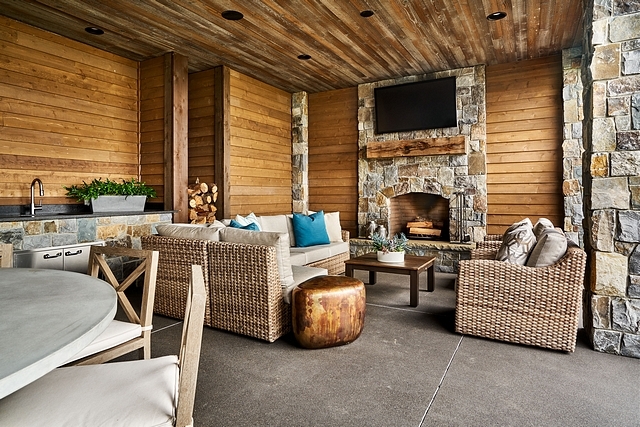 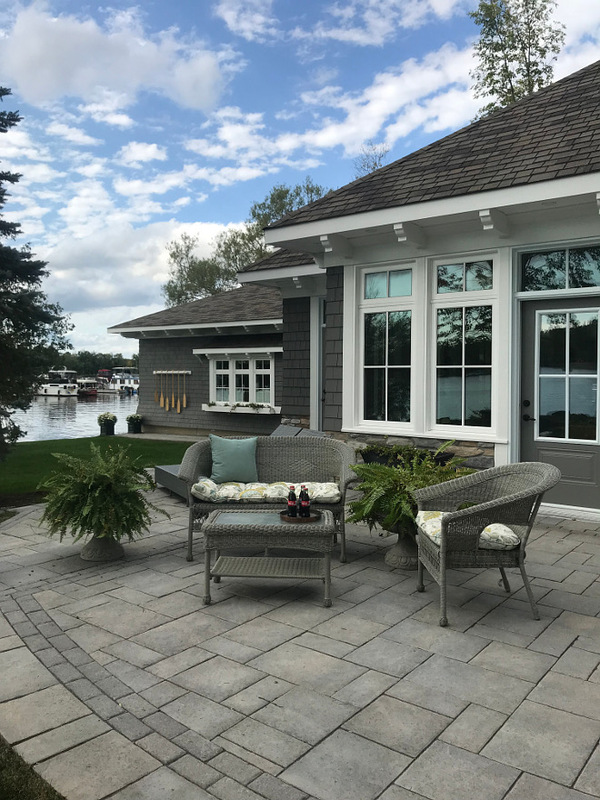 The porch flooring is AZEK, Harvest Collection in Slate Gray. 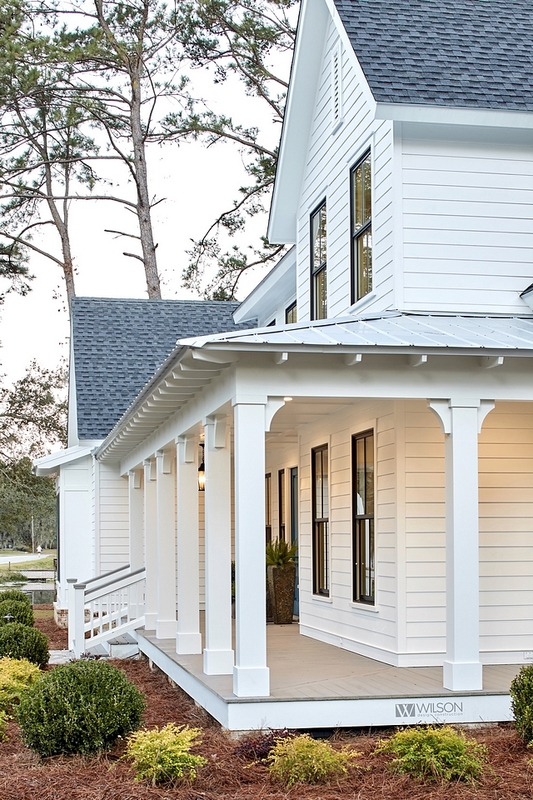 Notice the classic square porch columns and the coffered ceiling. 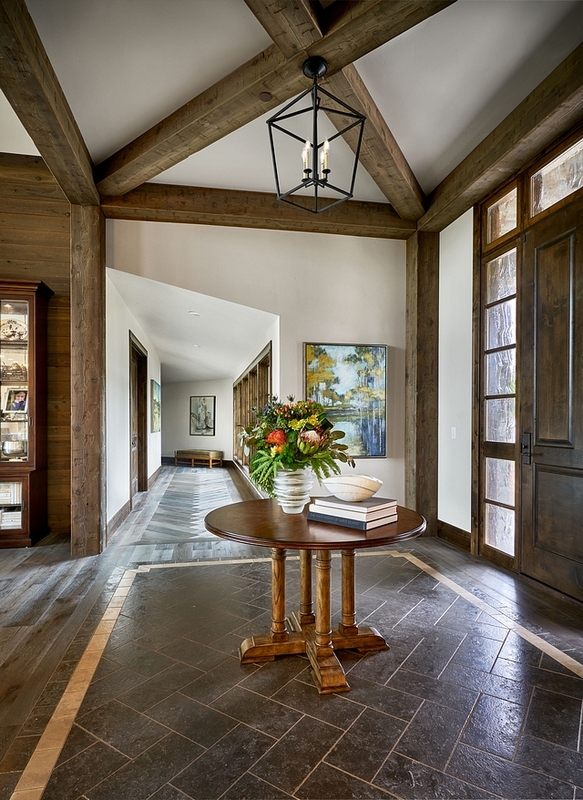 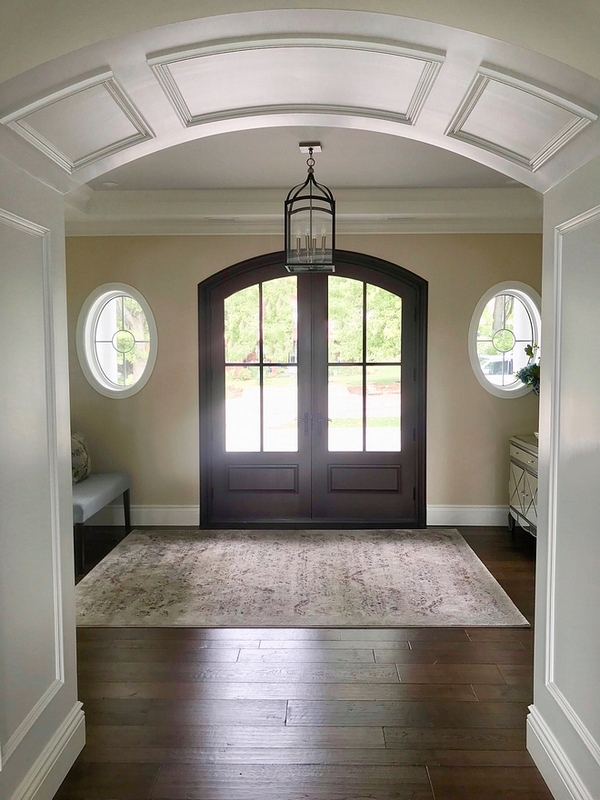 This is one beautiful and welcoming foyer. 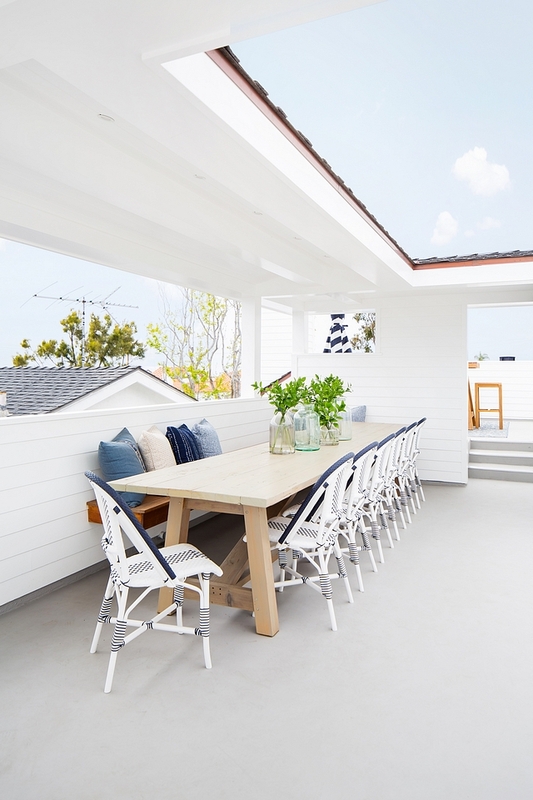 The board and batten paneling is painted in Sherwin Williams Extra White. 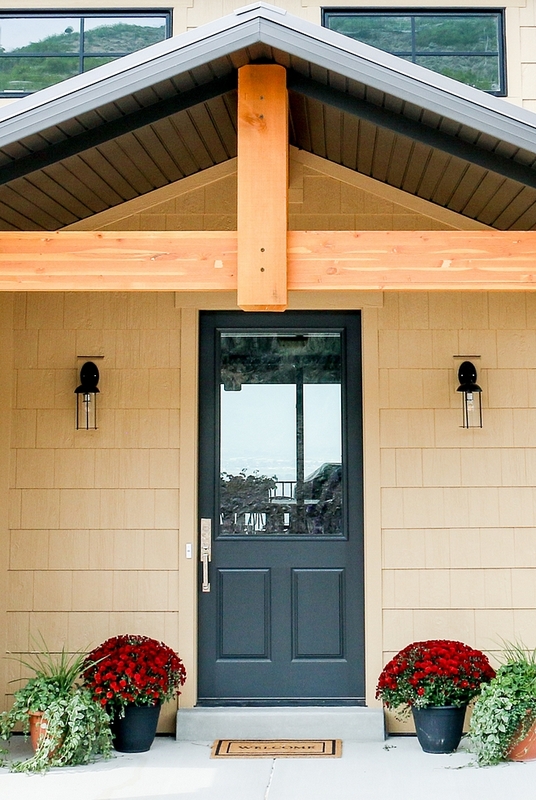 Similar Front Door Paint Color: Sherwin Williams SW 6230 Rainstorm. 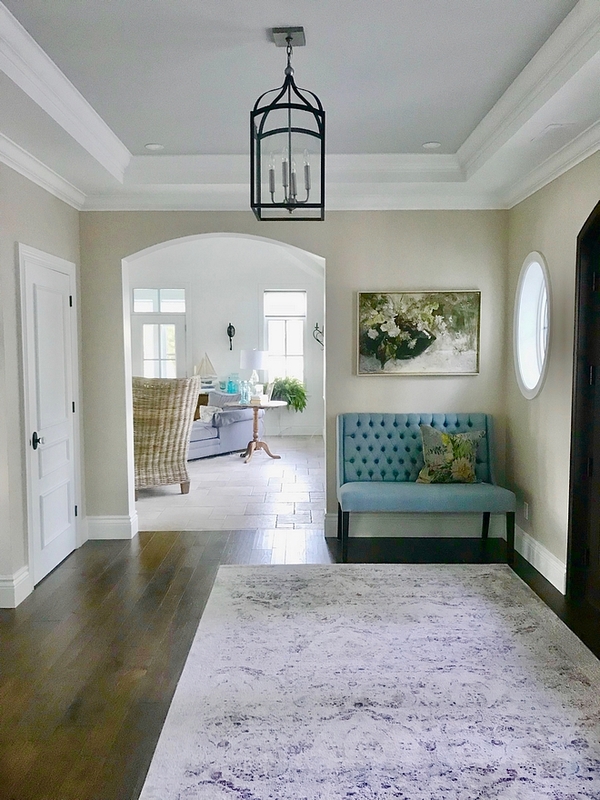 The furniture and decor items were selected by Marie Holland (Wilson Design & Construction) and Sally Pace (Turner’s Fine Furniture Valdosta). 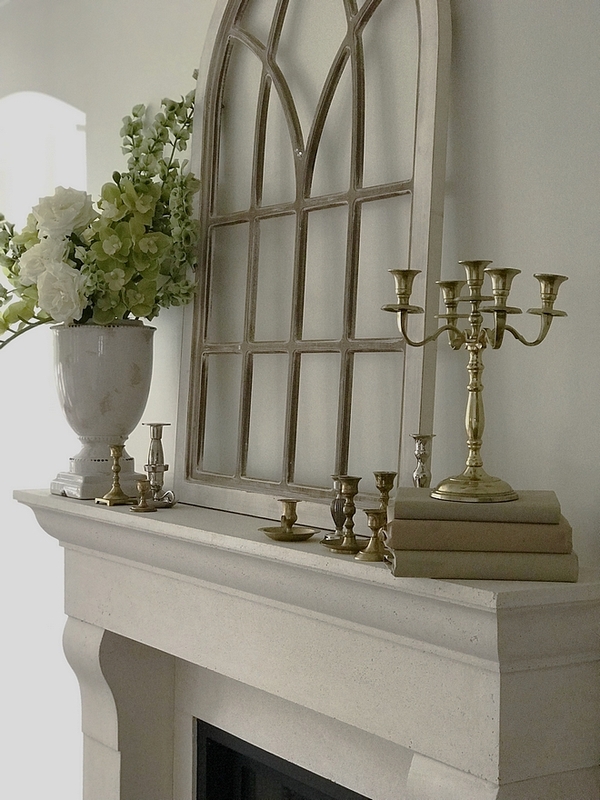 I’ll be giving some similar options because many of the pieces were custom or are discontinued. 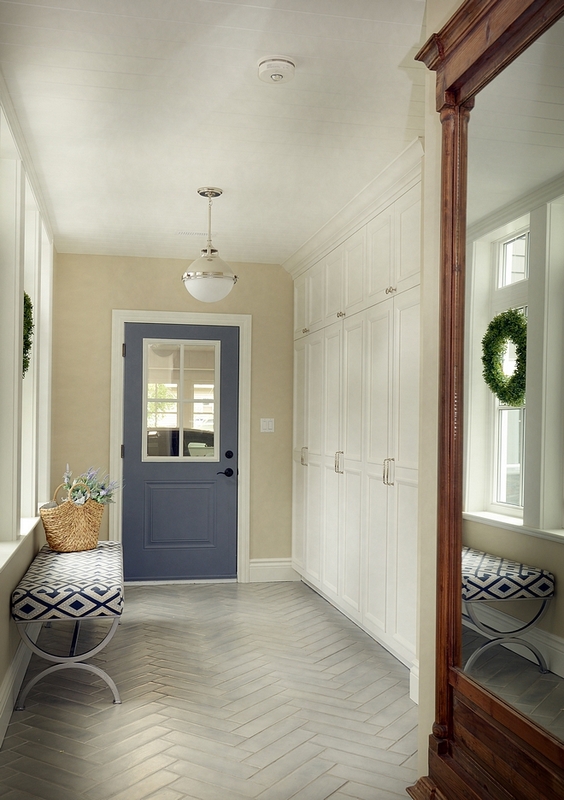 Beautiful Foyer Benches: here, here, here, here, here, here, here, here, here, here & here. 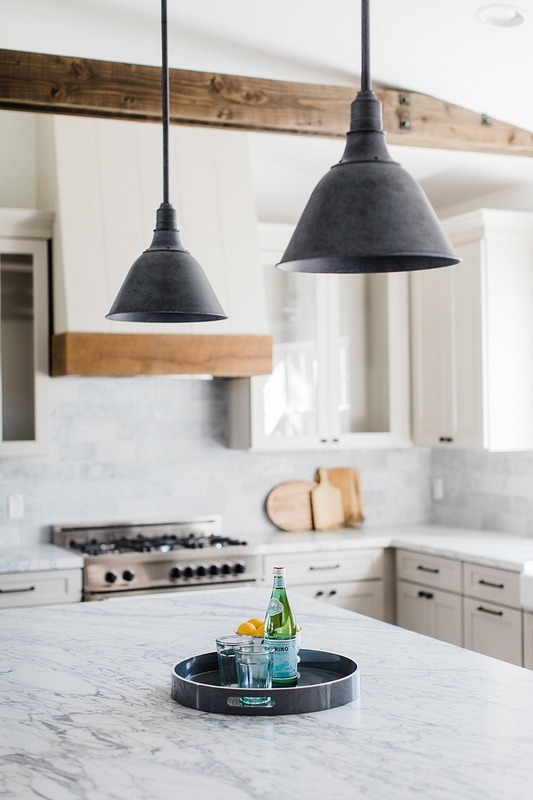 Lighting: Currey & Co. – similar here. 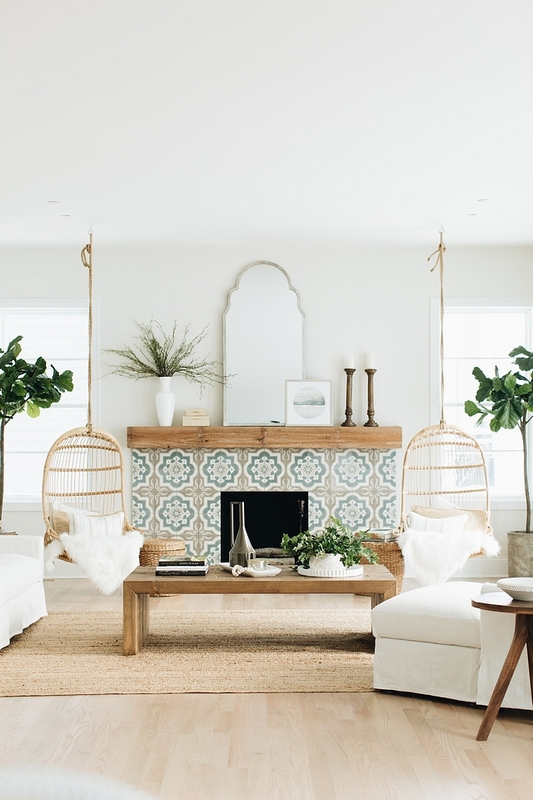 Faux Fiddle Leaf Tree: here. 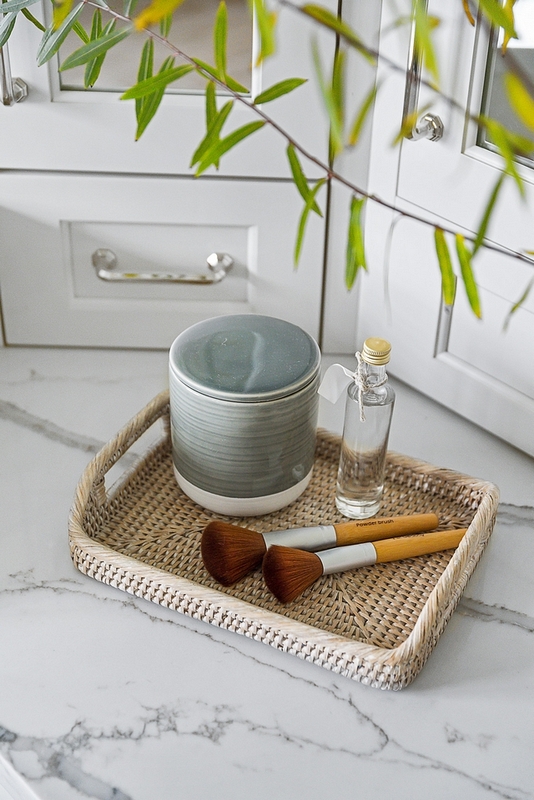 Copper Planter: Vintage – similar here. 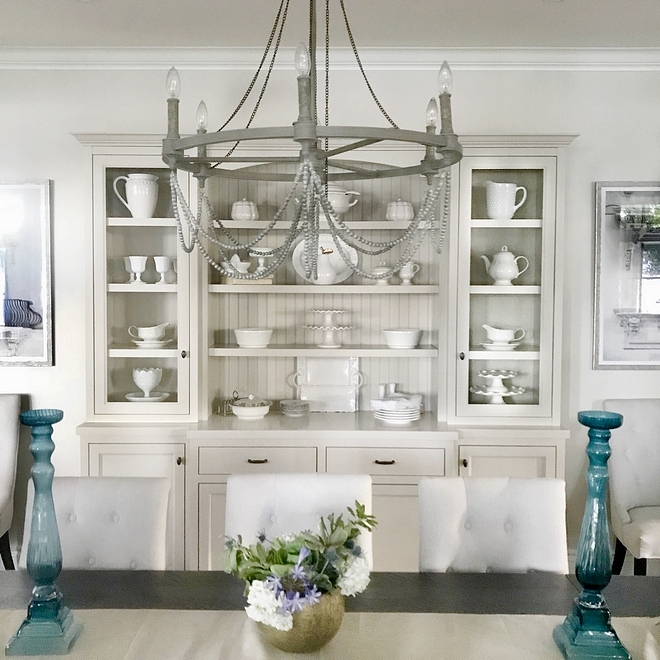 This gorgeous dining room features gray walls, painted in Sherwin Williams Silver Strand, wide plank hardwood floors and double chandeliers. 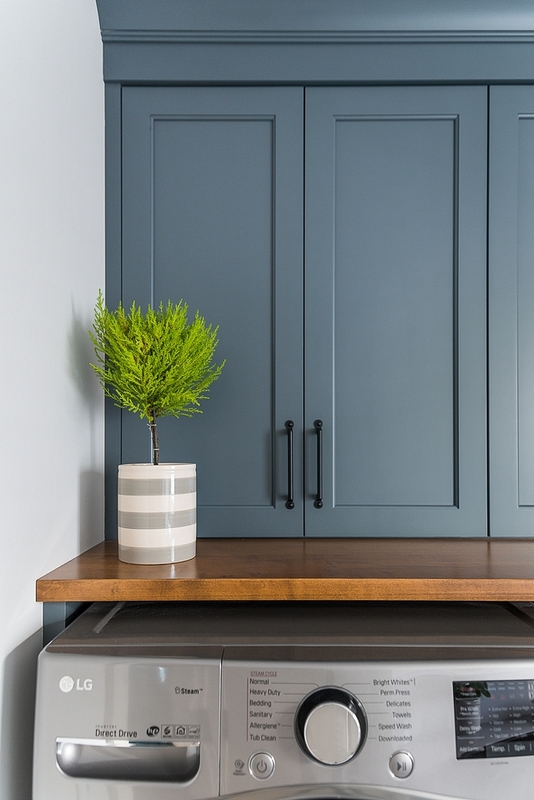 The custom hutch cabinet is painted in Sherwin Williams SW 7067 Cityscape. 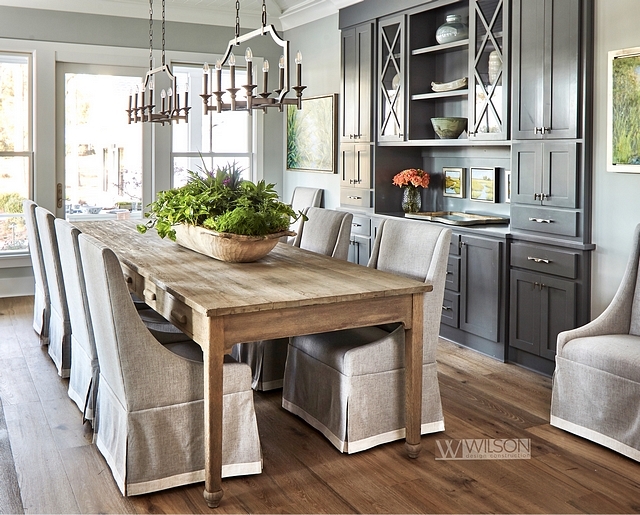 The dining table is an one-a-kind antique table salvage from a North Carolina textile mill. 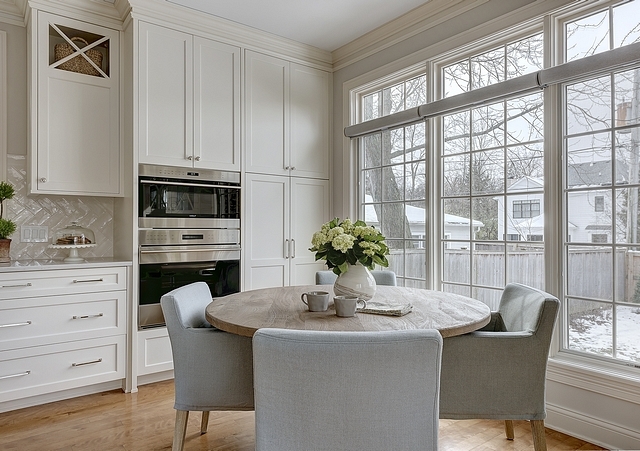 Other Dining Tables: here, here, here, here, here & here. 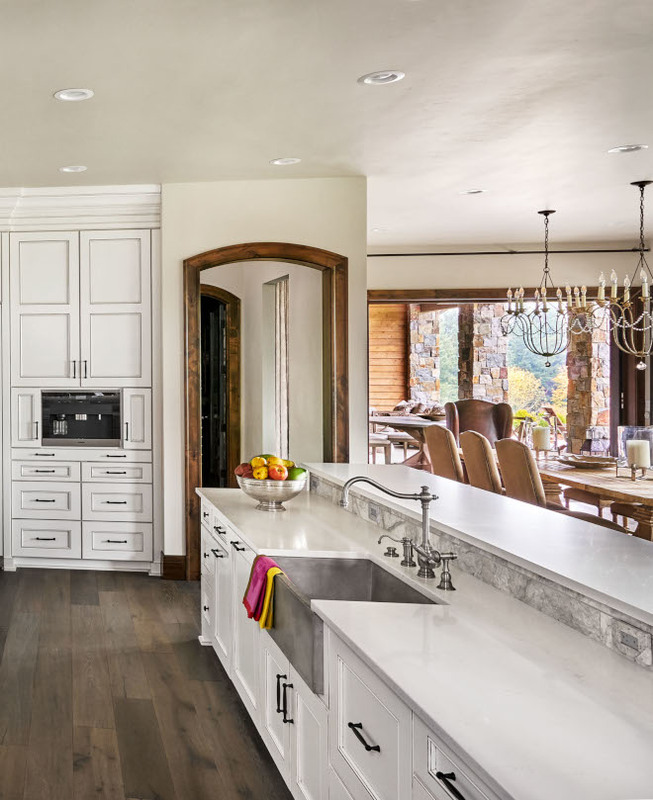 The kitchen features breathtaking cathedral ceilings and an inspiring layout. 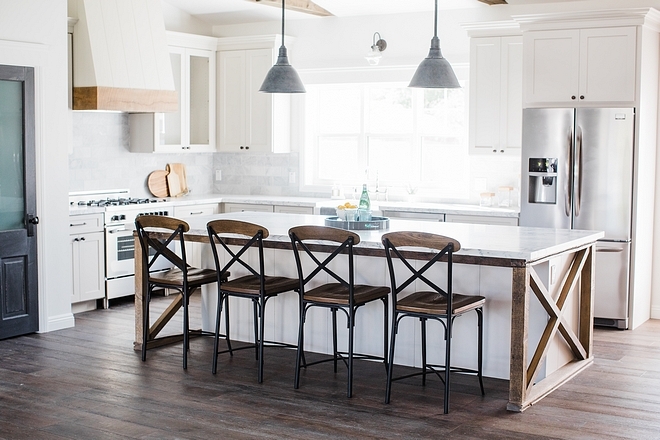 Island measures 8’2” x 4’ (cabinets) legs add another foot, making it 5’ total. 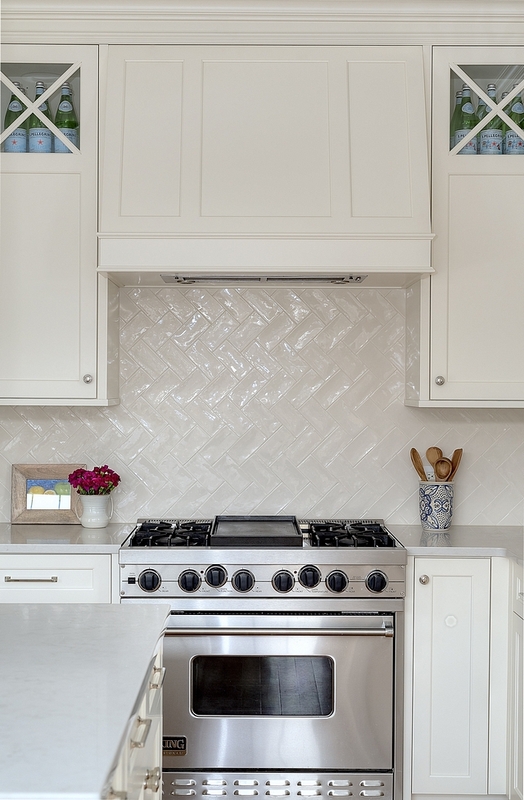 Backsplash: 3×12 Ash Blue Tile – Other Beautiful Tiles: here, here, here, here & here. 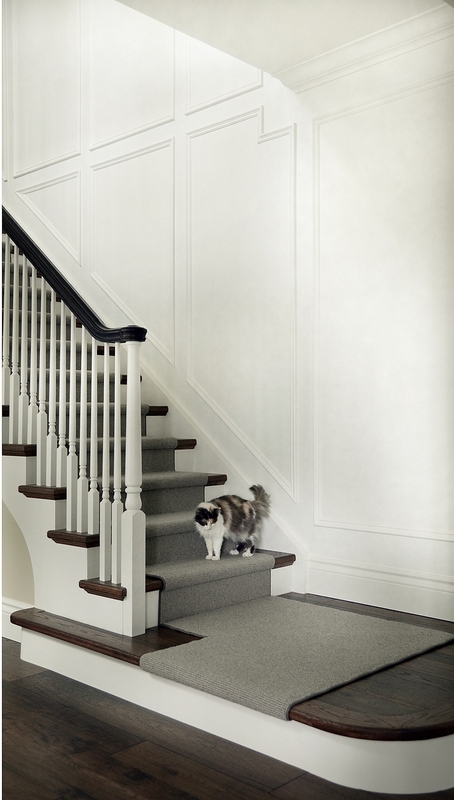 Flooring: Bella Cera Galgano 8″ European Oak Engineered Hardwood – similar here, here & here. 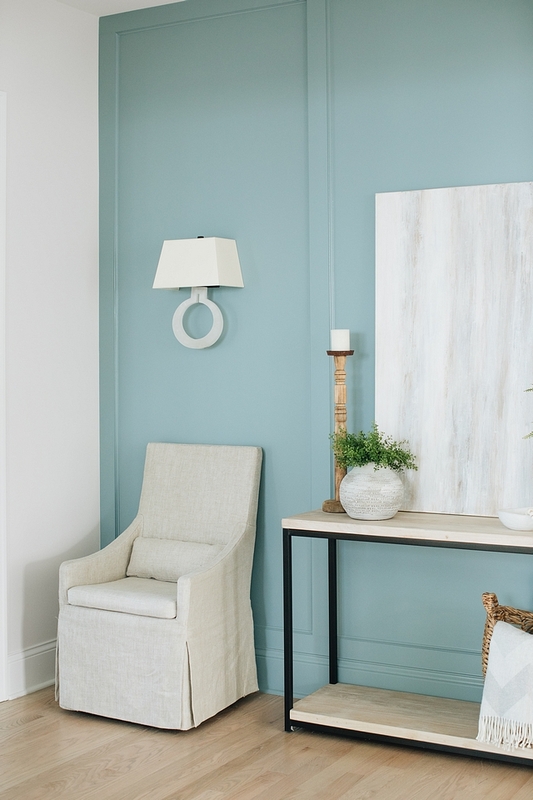 Wall paint color is Sherwin Williams SW7057 Silver Strand in Satin. 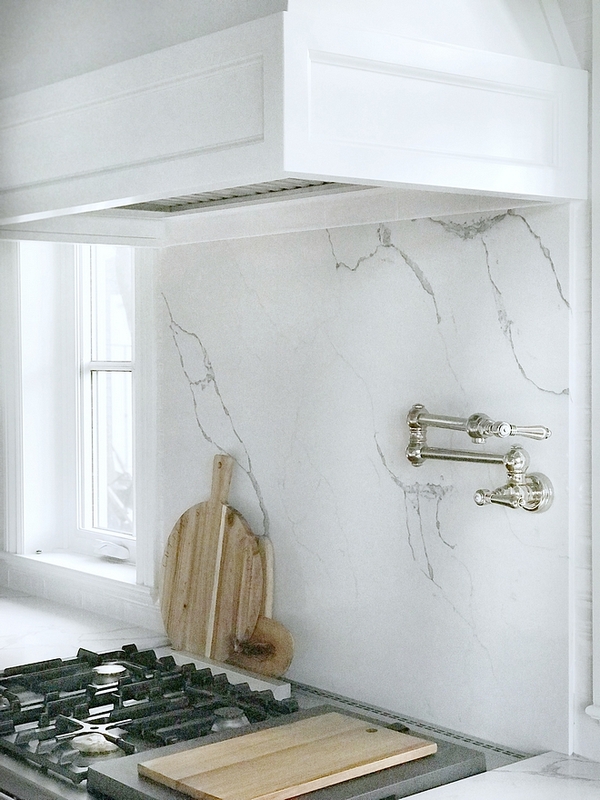 Countertop: Ocean Beige Marble, Leathered. 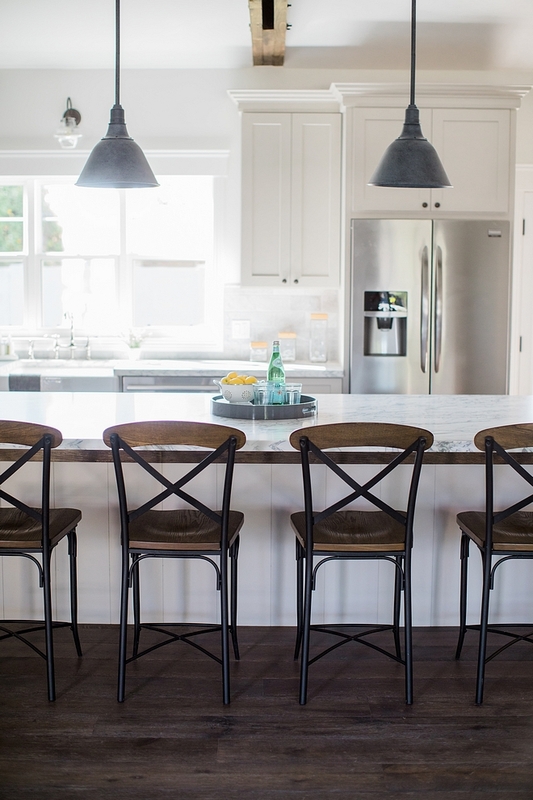 Counterstools: Paula Deen (Discontinued) – Others Similar: here, here & here. 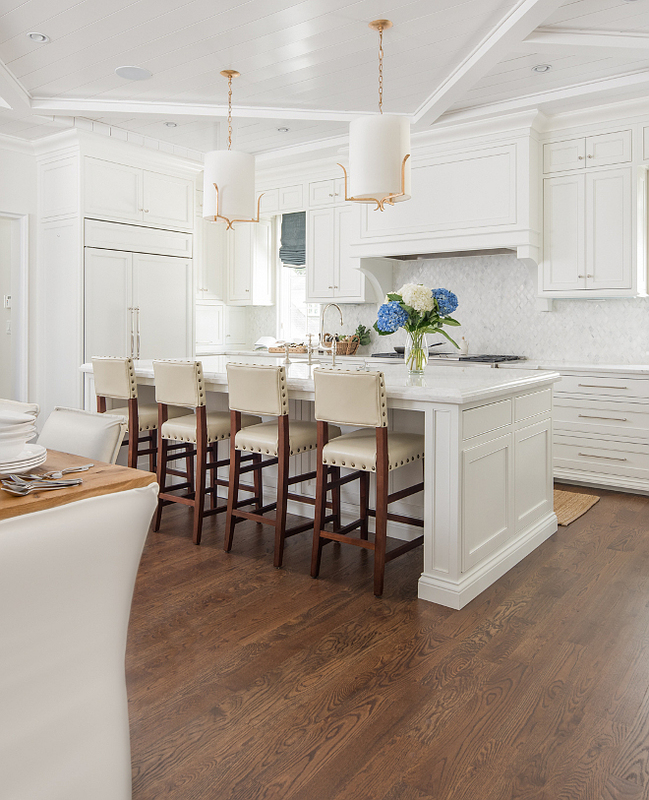 The kitchen cabinets are custom and the island features X detail on both ends. 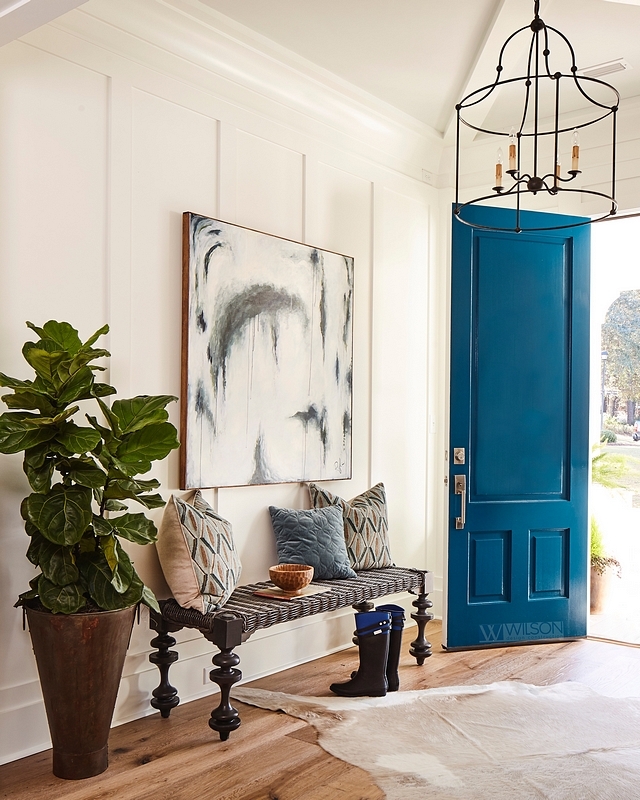 Paint color is Sherwin Williams SW 7067 Cityscape. 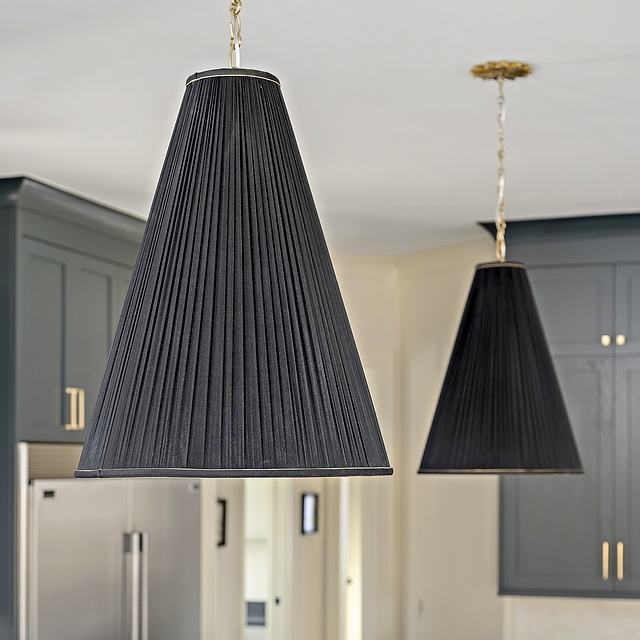 Lighting: Capital Lighting – Other Affordable Pendants: here, here, here, here, here & here. 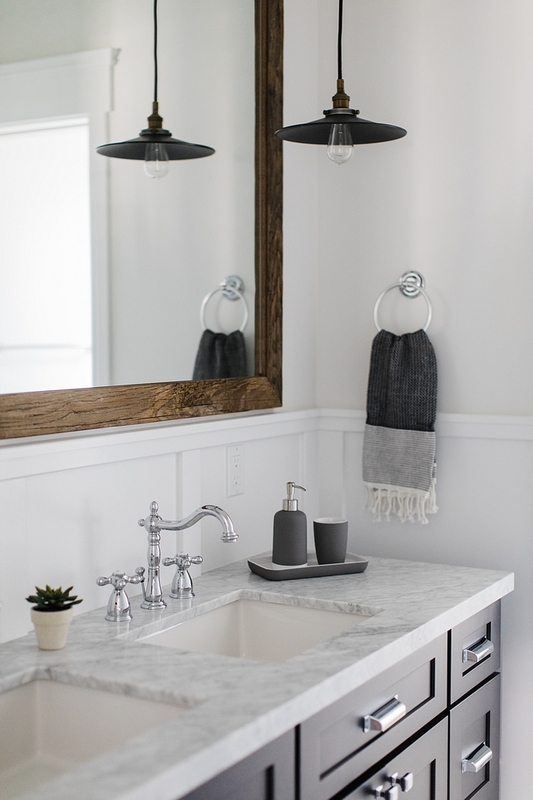 Faucet: DXV – similar here & here. 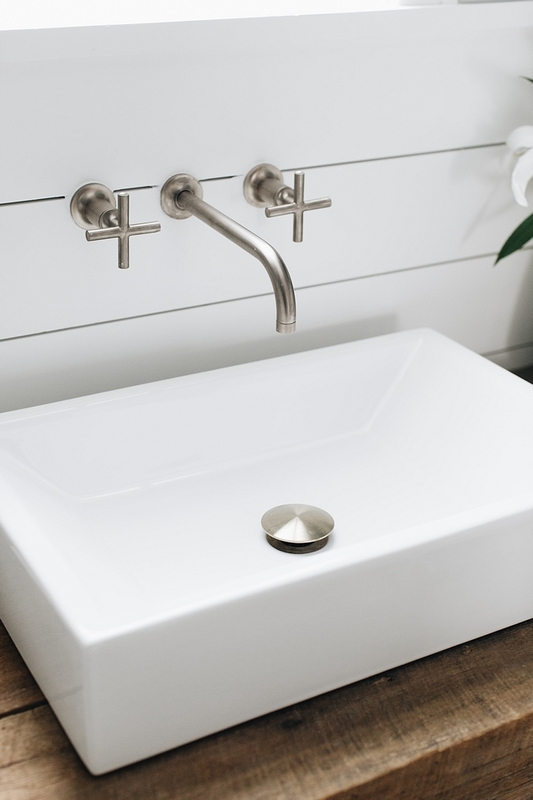 Sink: DXV – similar here & here. 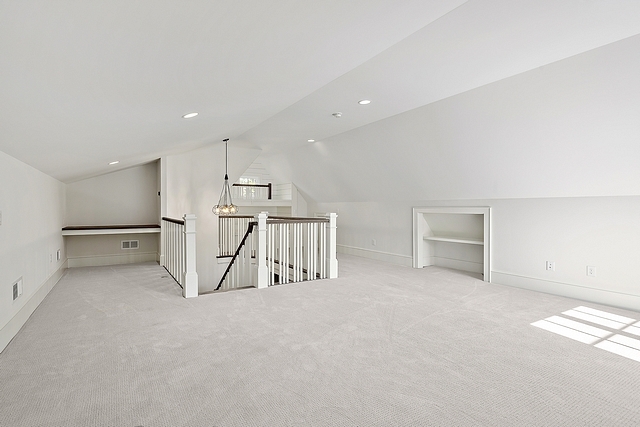 This room is truly impressive. 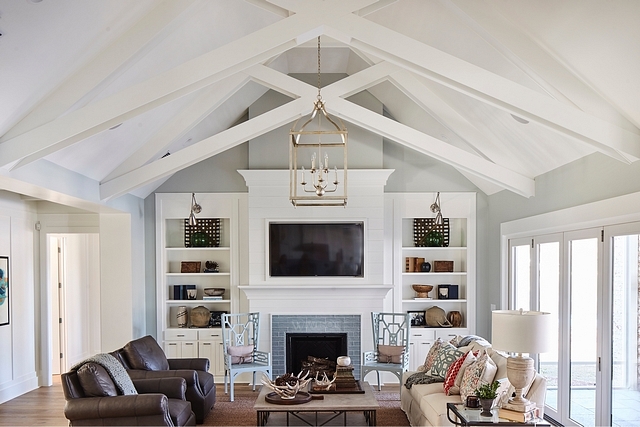 The custom-designed crossed trusses gives continuity to the “X” theme found in many spaces of this home, including cabinetry and furniture. 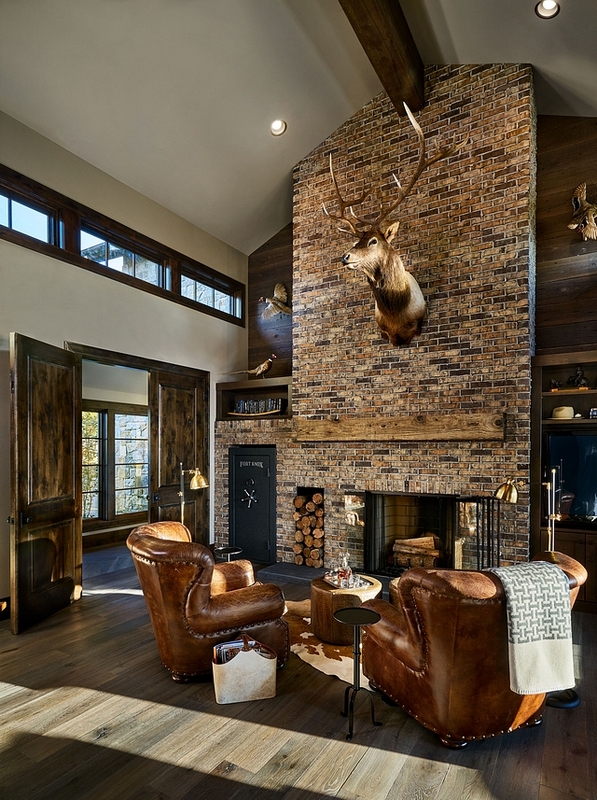 Leather Chairs: here – Others: here, here & here. 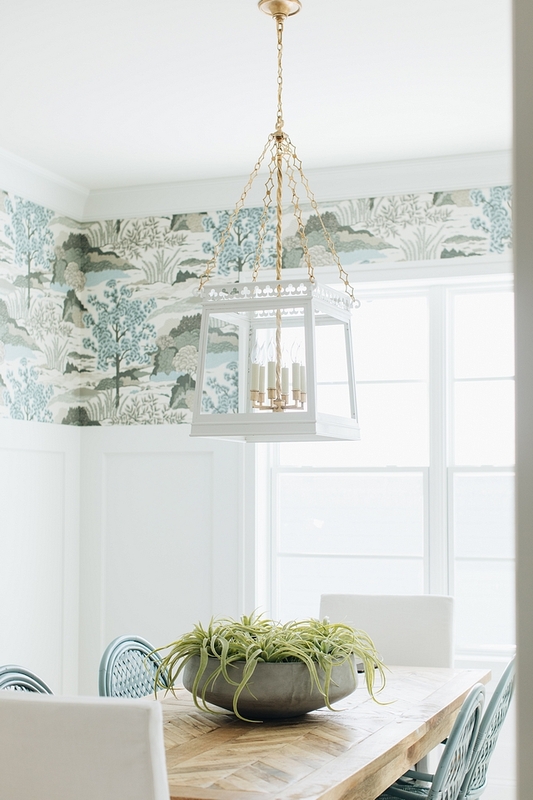 Similar Table Lamp: here, here, here & here. 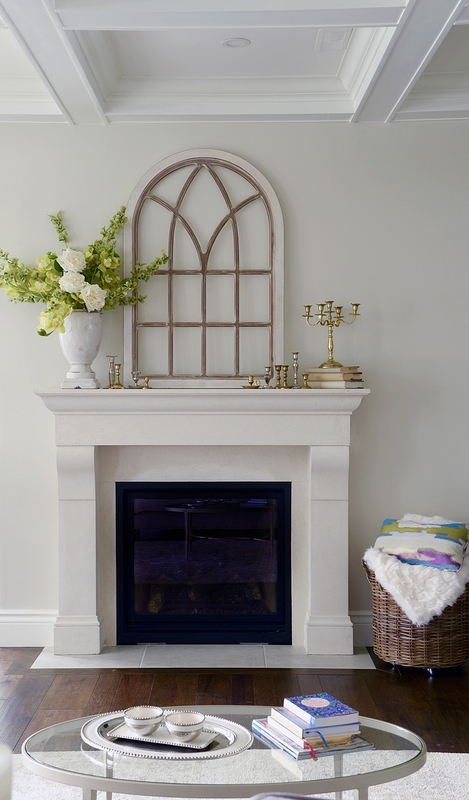 The fireplace is flanked by custom cabinets painted in Sherwin Williams SW 7006 Extra White. 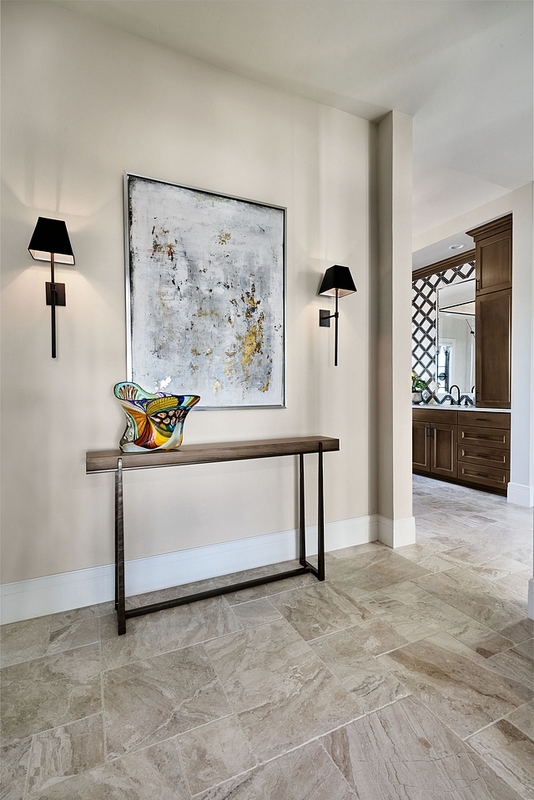 Built-in Lighting: Trent Austin Dazzle Swing Arm in Satin Nickel. 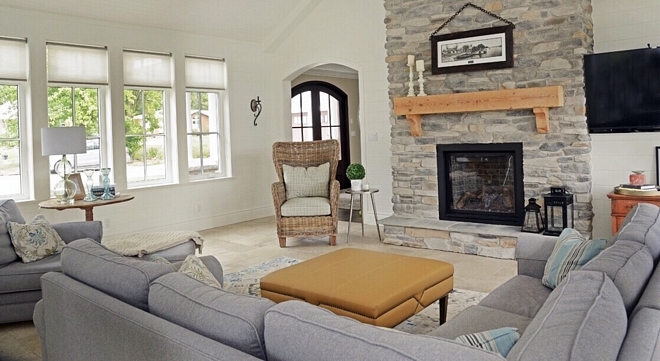 Chairs by Fireplace: Guild Master Manor Wing Chair (discontinued)- Similar: here, here & here. 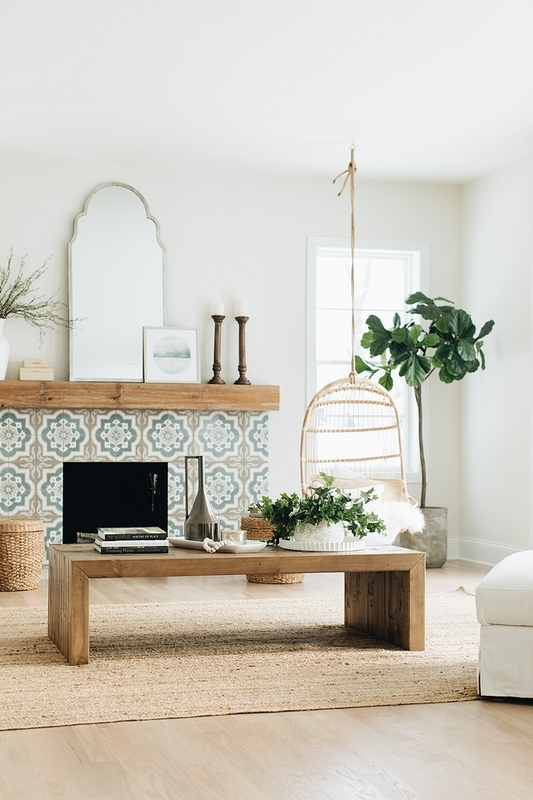 Coffee Table: Discontinued – Others: here, here, here, here, here, here, here, here & here. 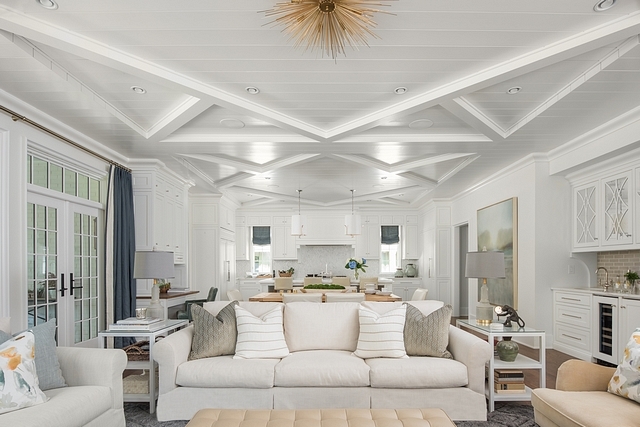 Sofas: Paula Deen – Others: here, here, here & here – similar. 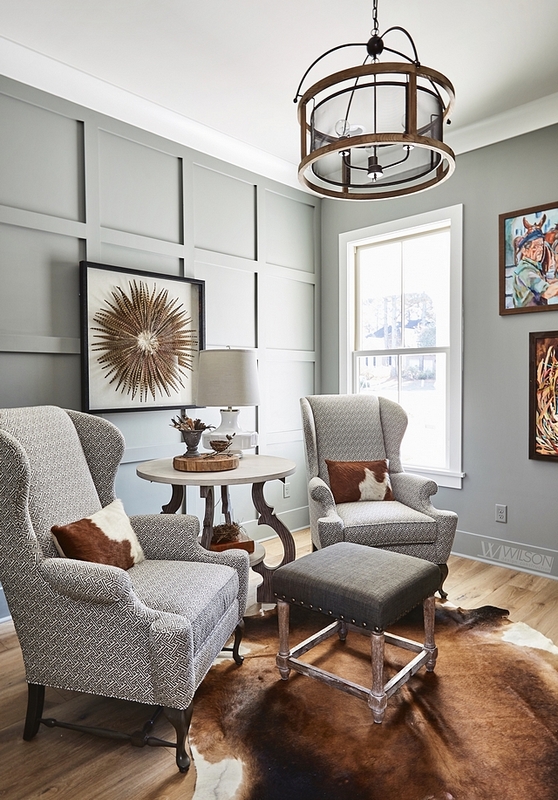 Painted in Sherwin Williams SW 9164 Illusive Green, the grey grid board-and-batten paneling adds drama and character to this den. 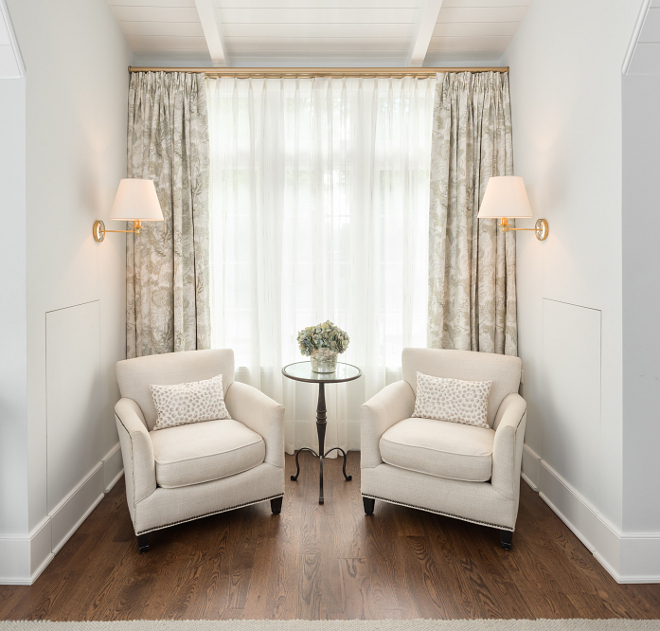 Beautiful Wingback Chairs: here, here & here. 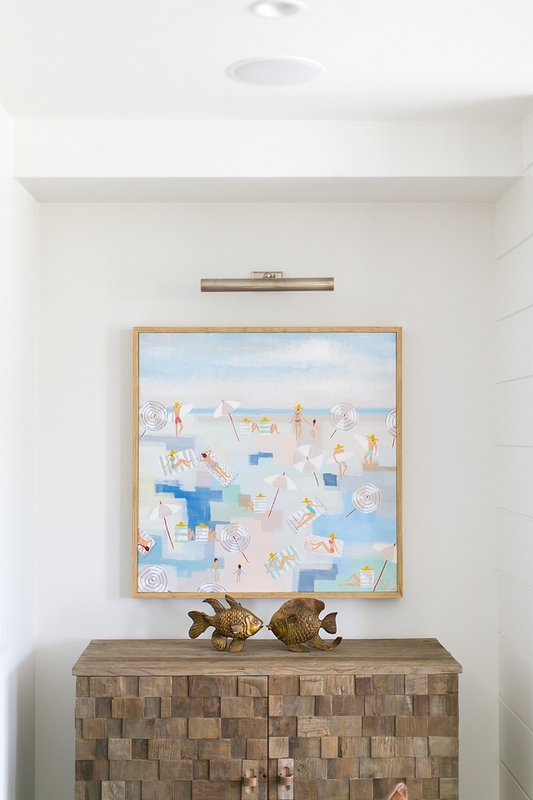 Accent Table: here, here & here & here. 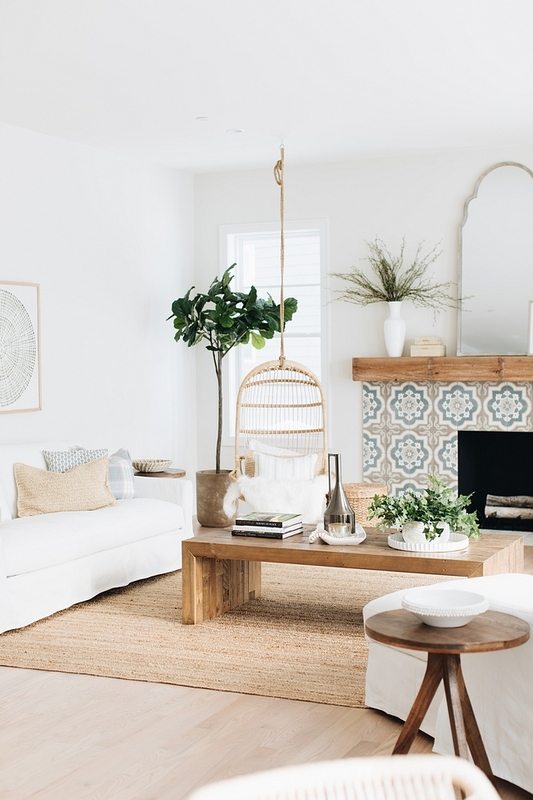 Cowhide Rug: here – similar. 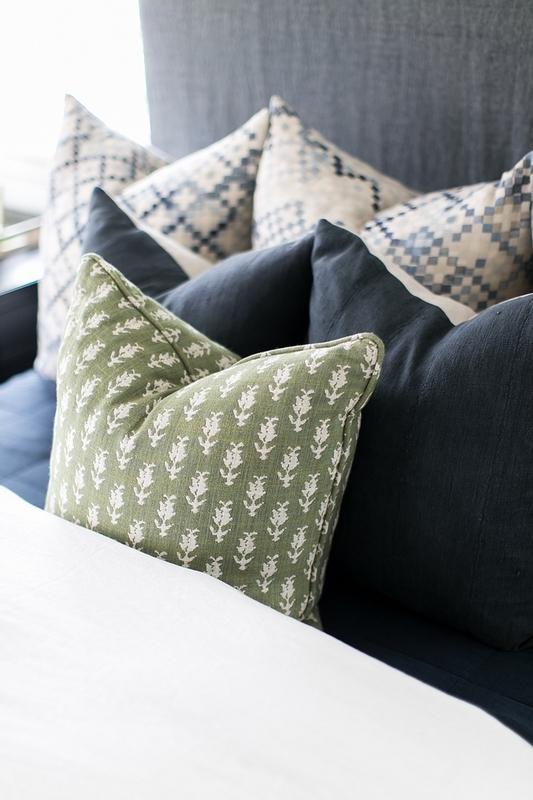 Cowhide Lumbar Pillows: here – similar. 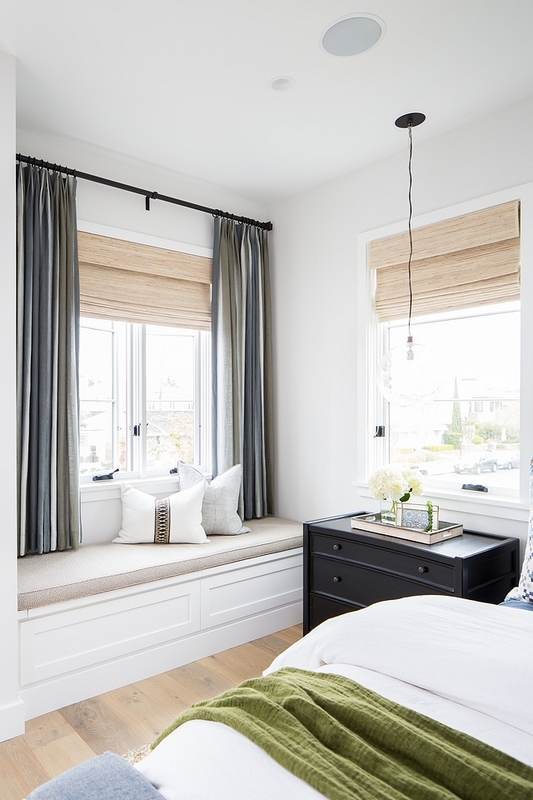 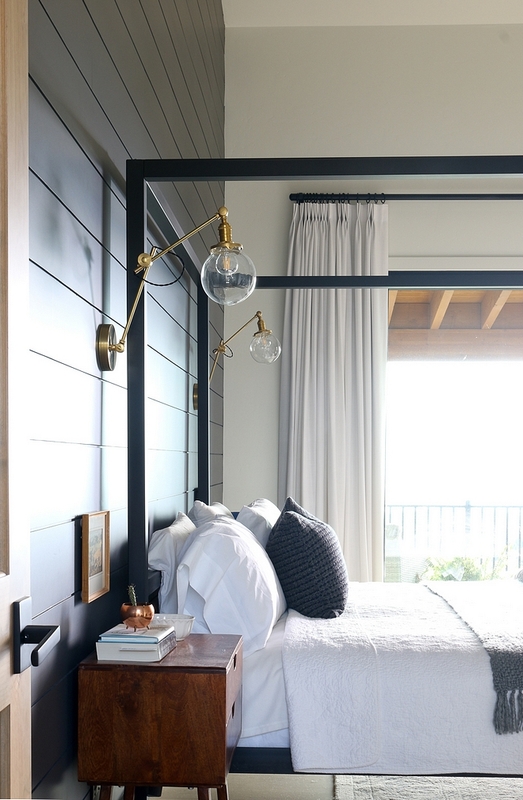 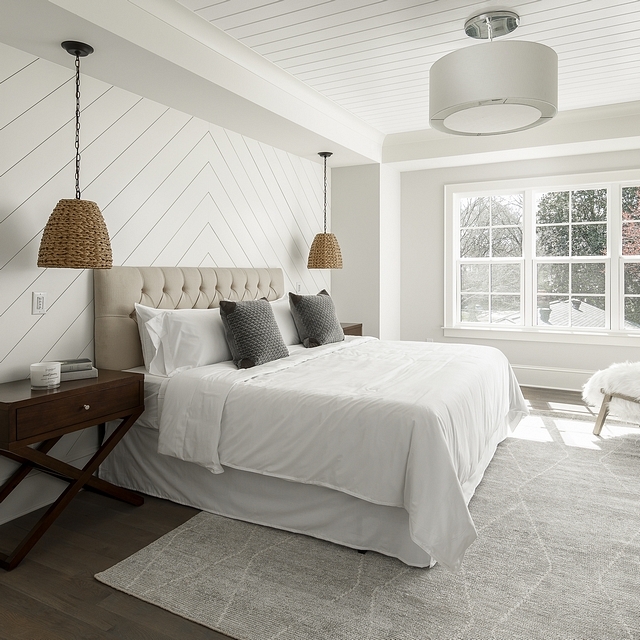 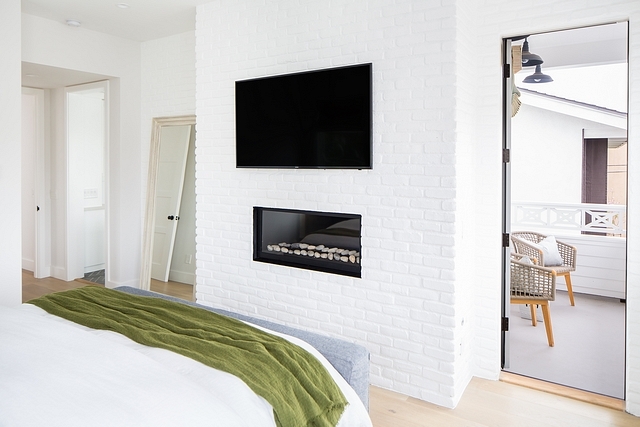 The master bedroom has a traditional and warm vibe. 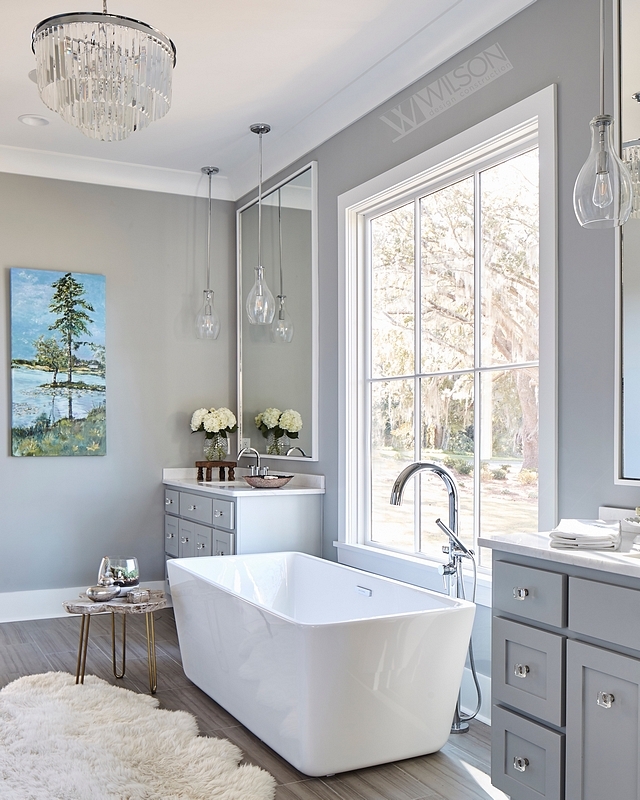 Paint color is Sherwin Williams SW 7658 Gray Clouds in Satin. 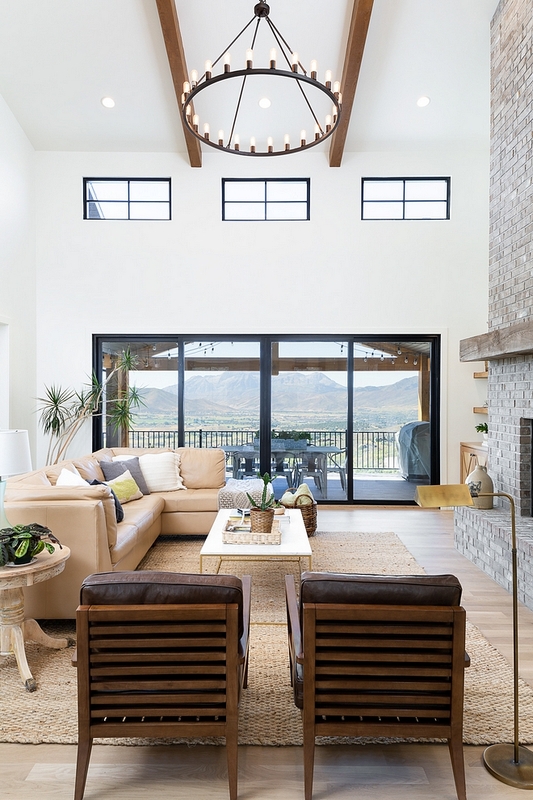 Ceiling Fan: Minka Aire in Oil Bronze. 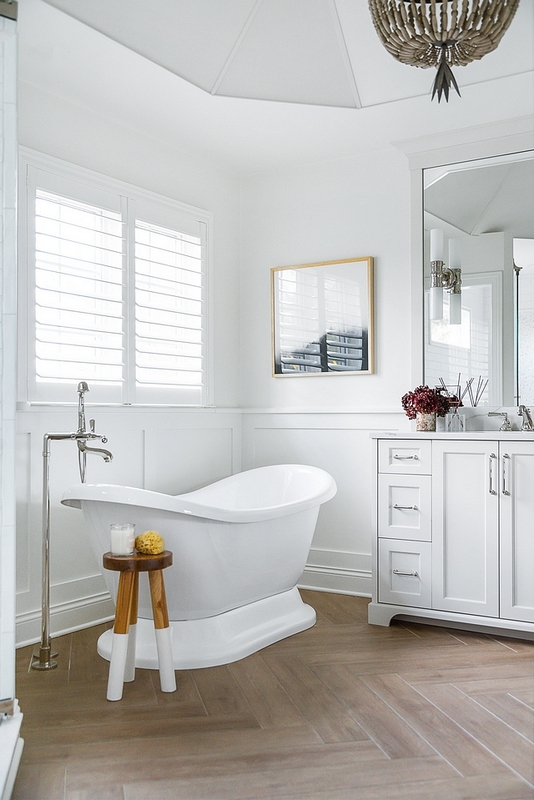 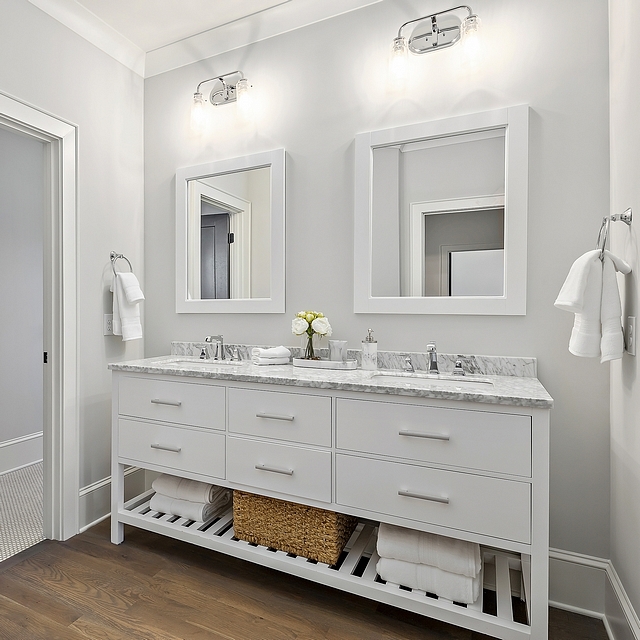 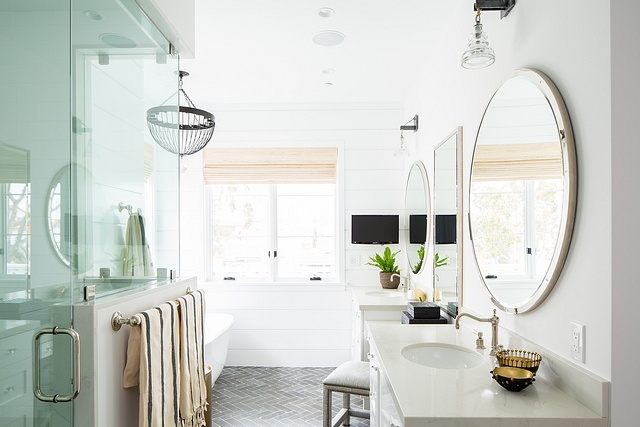 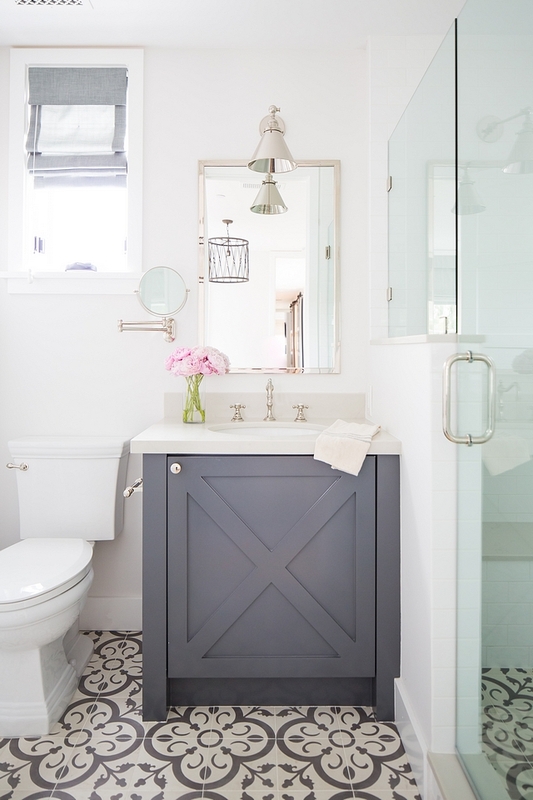 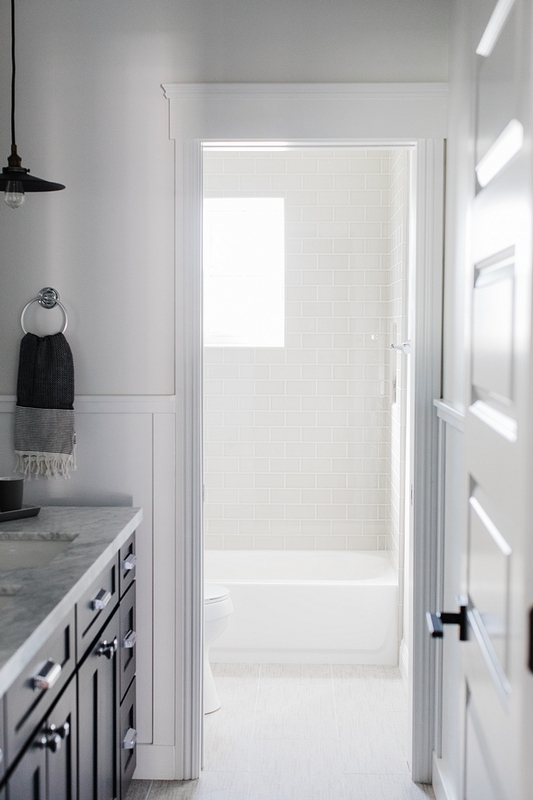 The master bathroom features an elegant grey and white color scheme. 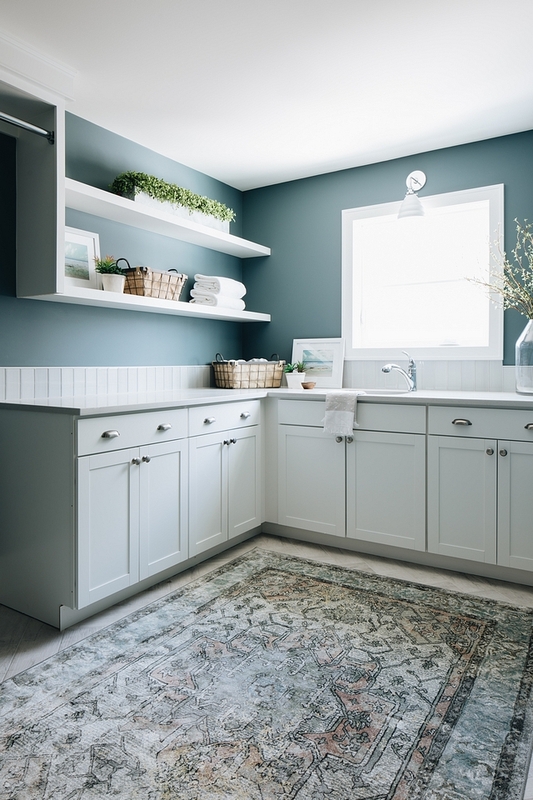 Wall and cabinet paint color is Gray Clouds by Sherwin Williams. 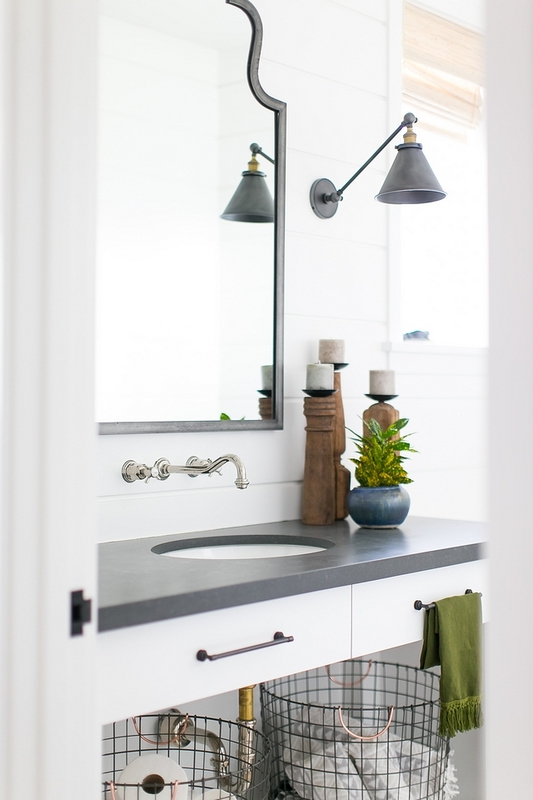 Faucet: American Standard Berwick in Chrome. 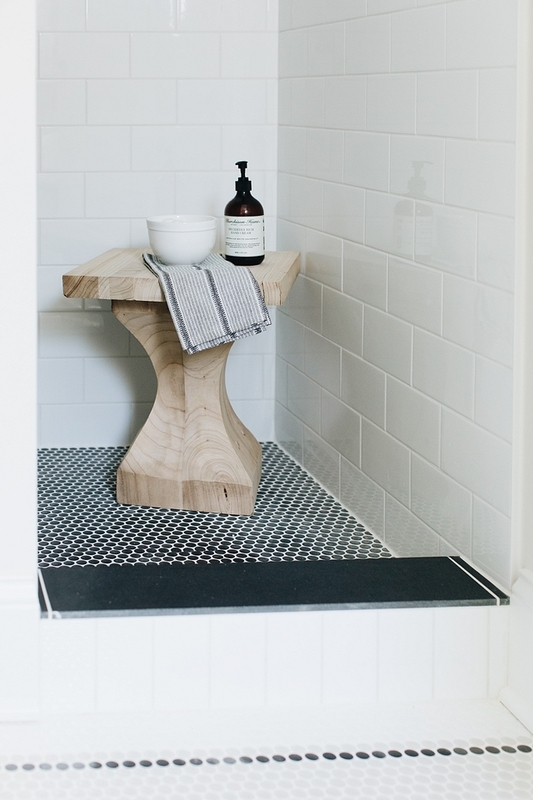 Sink: American Standart Estate 18×12. 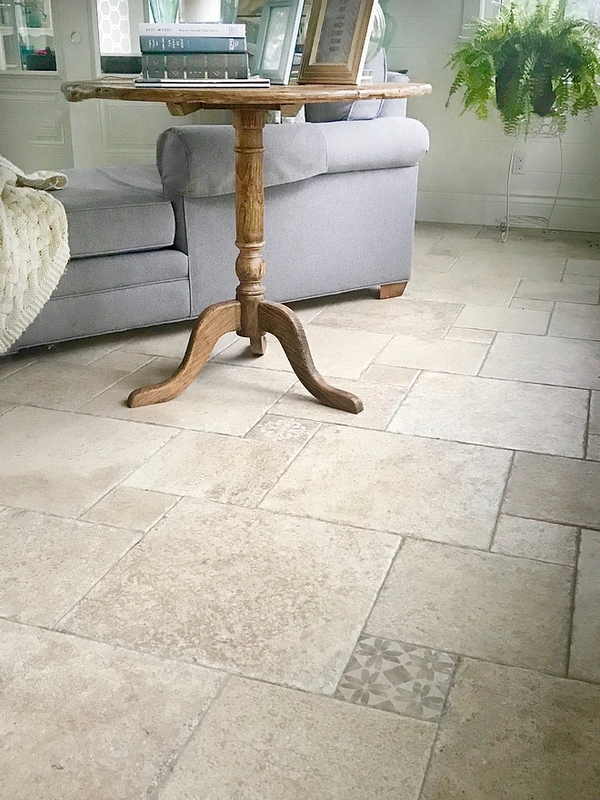 Floor Tile: MSI Porcelain Sophie Maron. 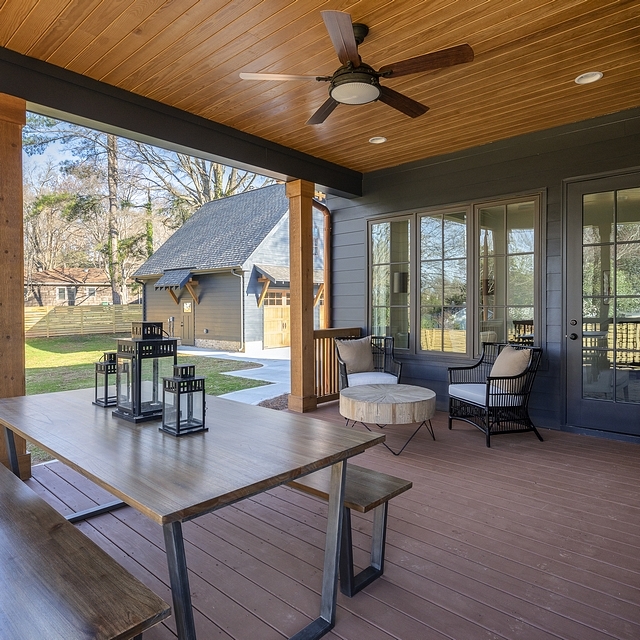 Bi-fold patio doors open to a beautiful screened porch with brick fireplace and coffered ceiling. 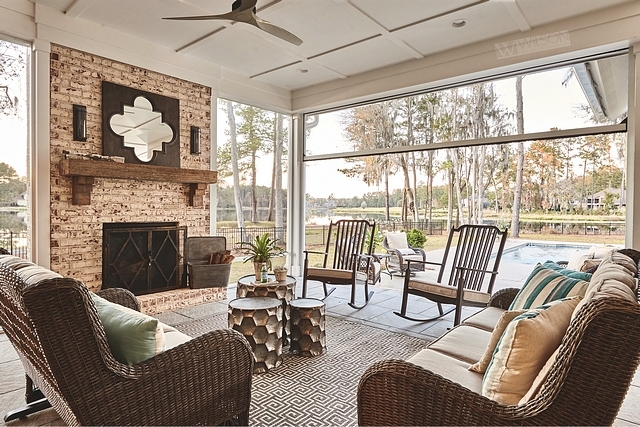 Also notice the stunning waterview and the pool. 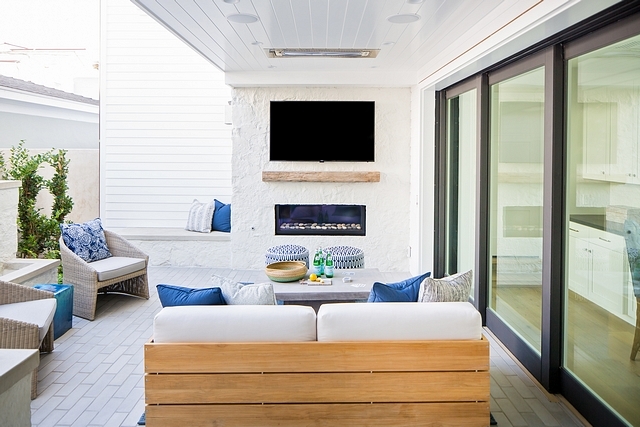 Outdoor Sofa: Paula Deen – Similar: Sofa & Loveseat. 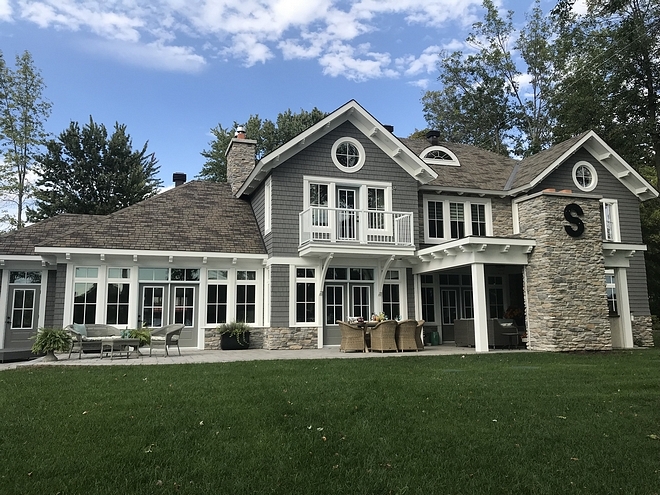 Other: here. 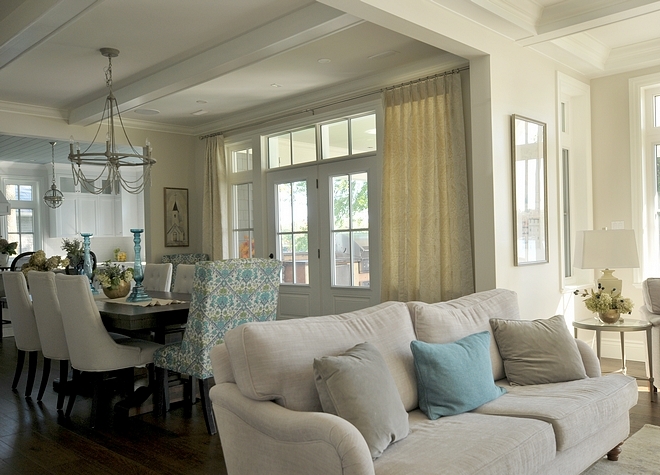 Interiors by Marie Holland (Wilson Design & Construction) and Sally Pace (Turner’s Fine Furniture Valdosta).